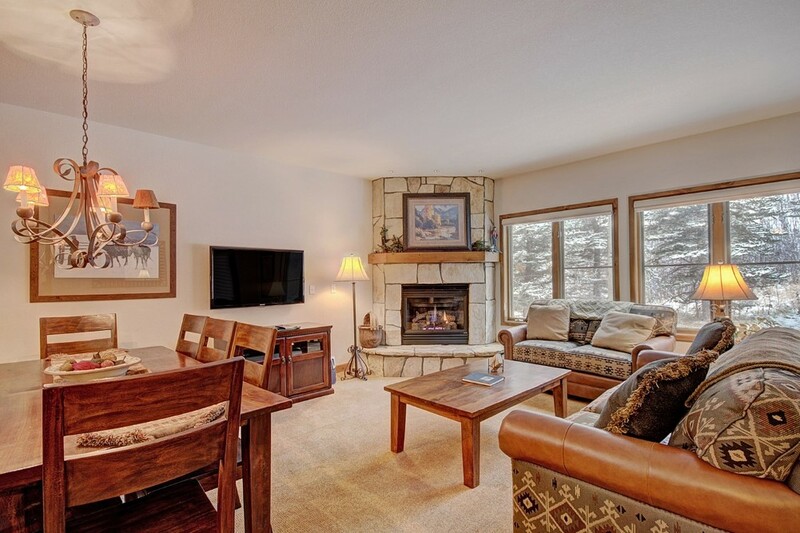 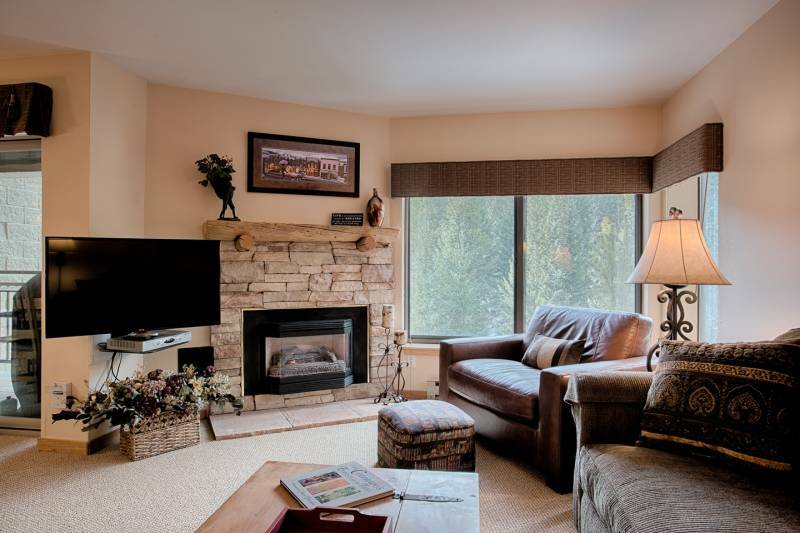 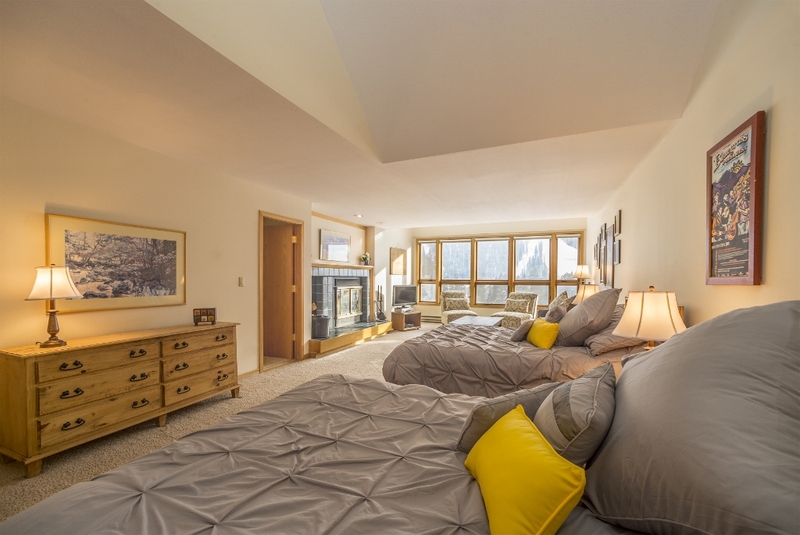 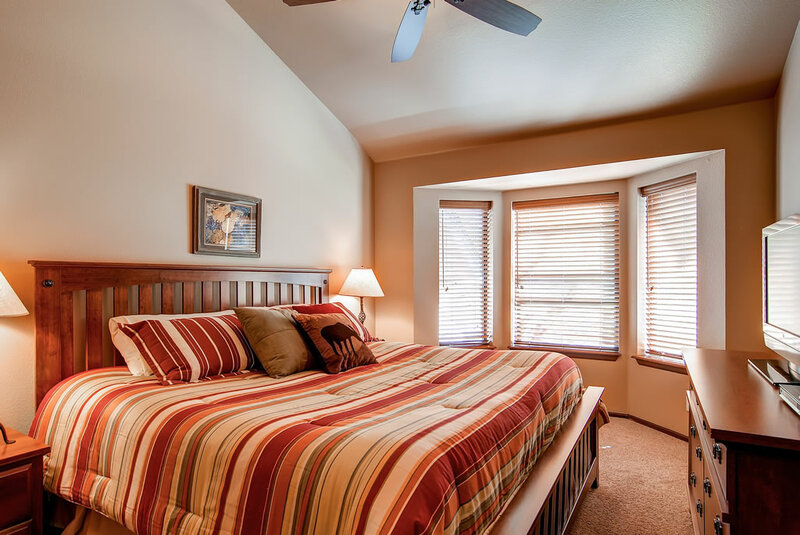 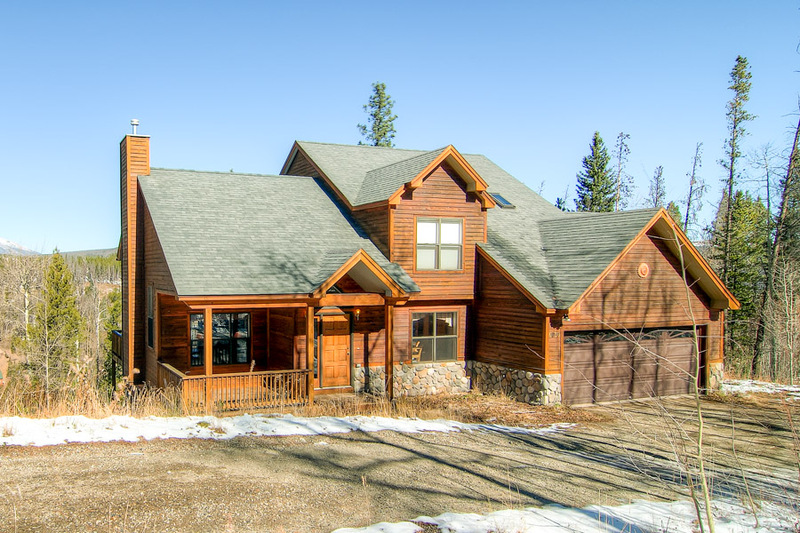 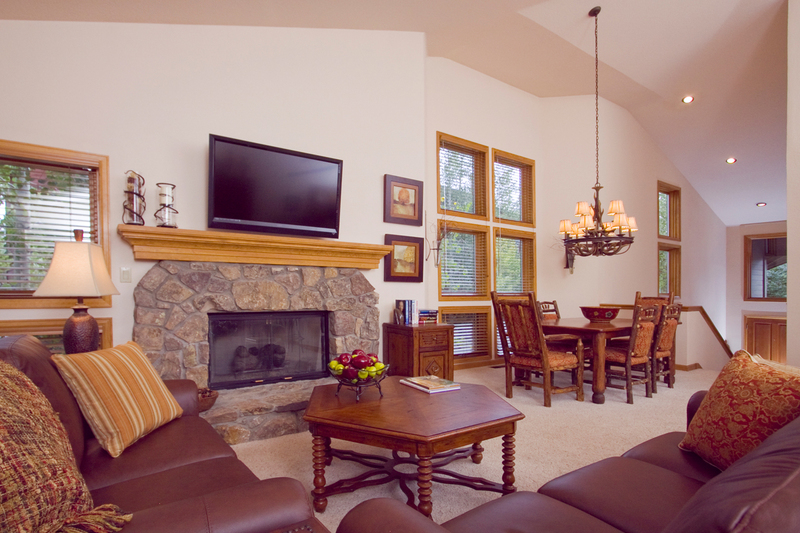 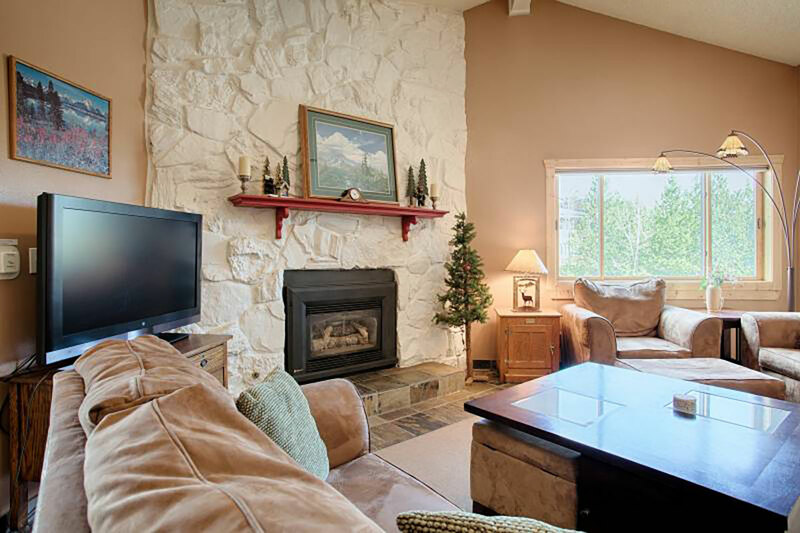 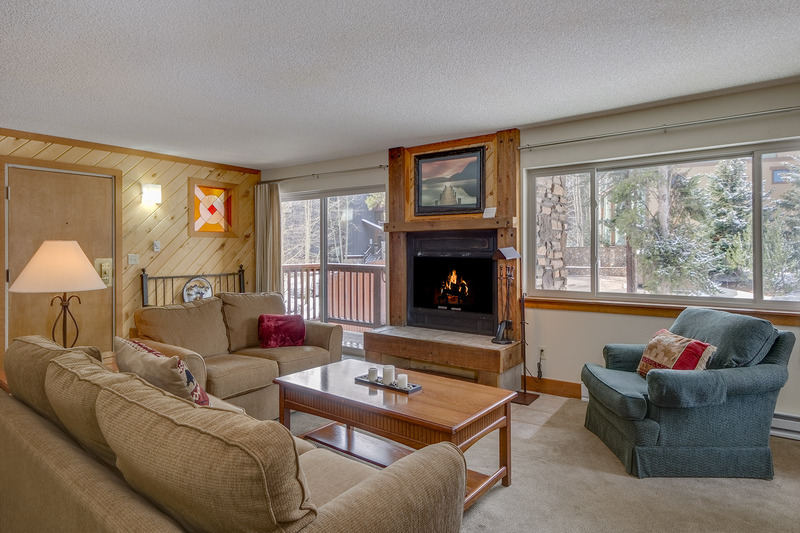 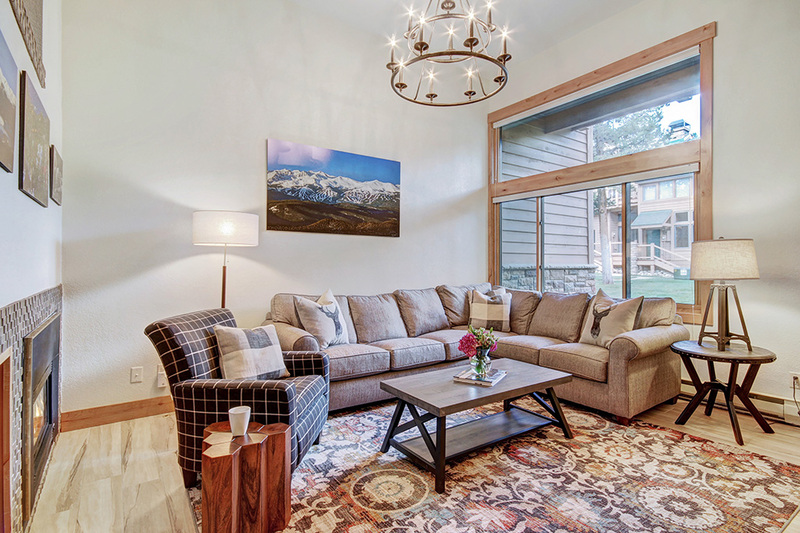 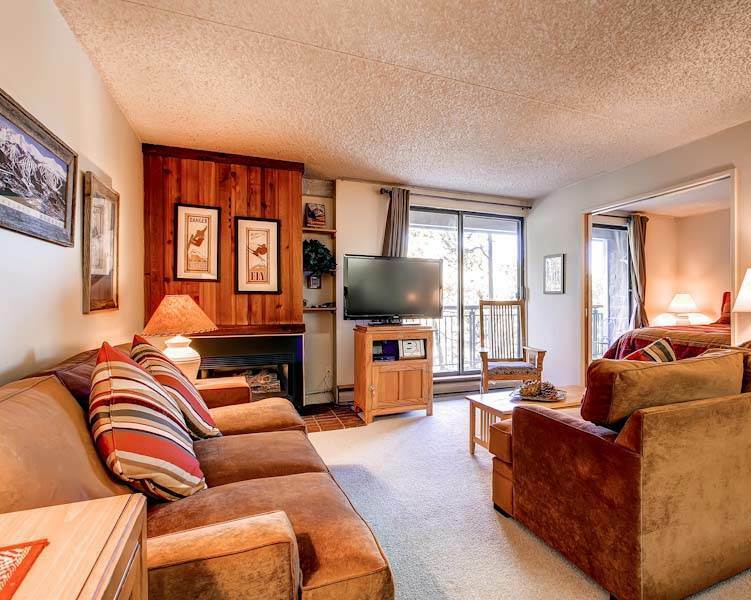 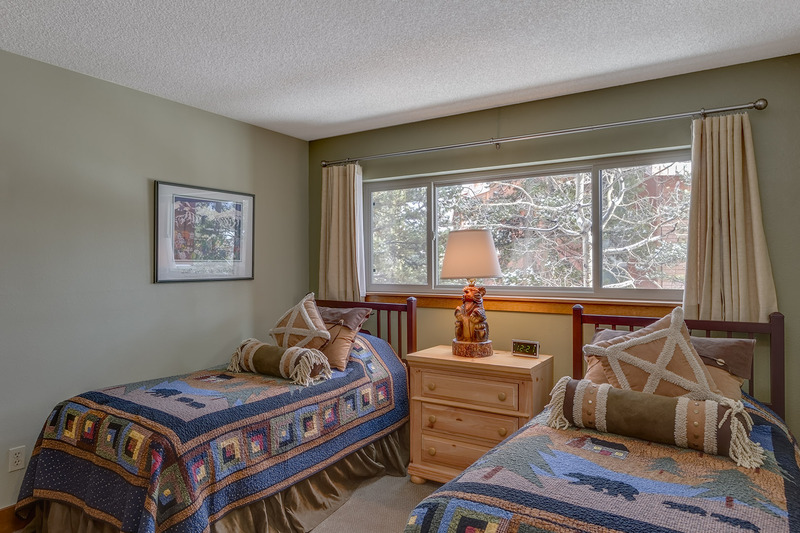 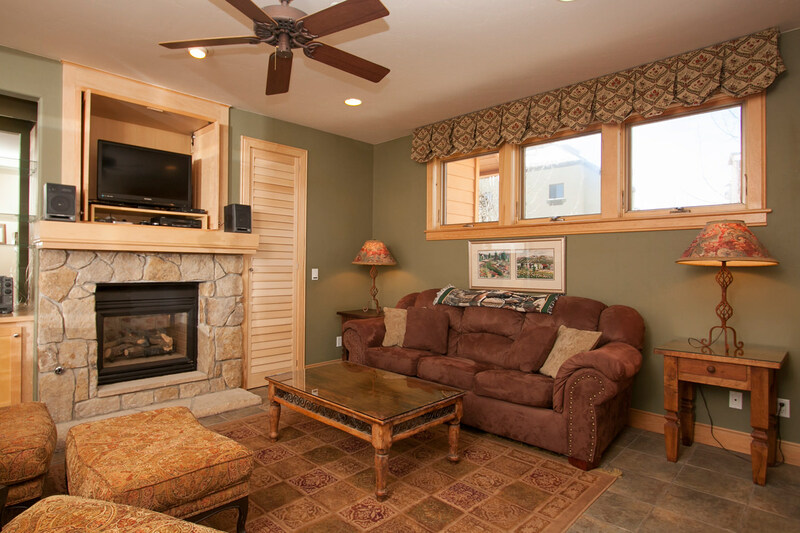 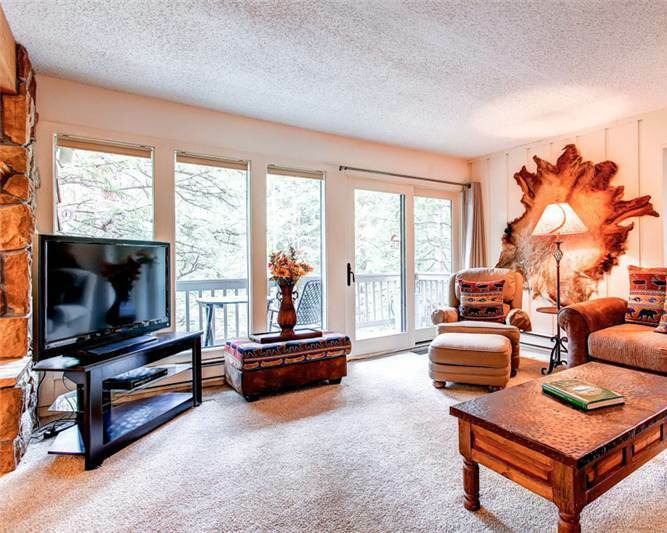 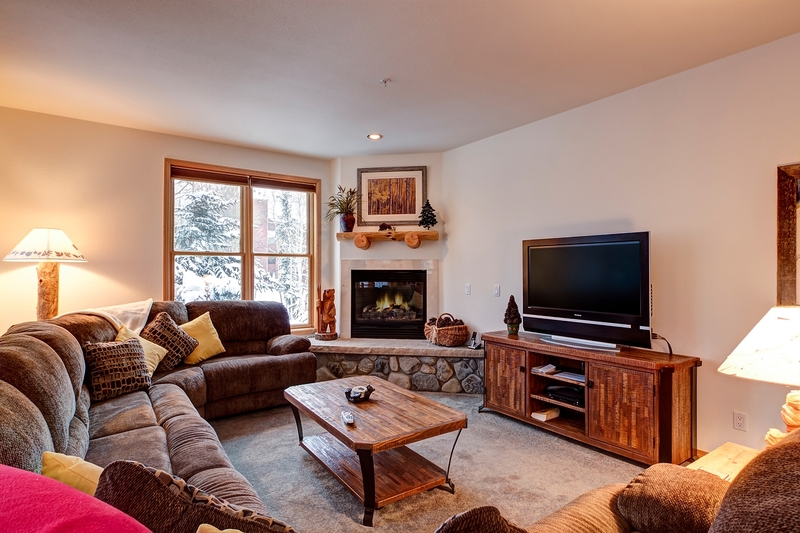 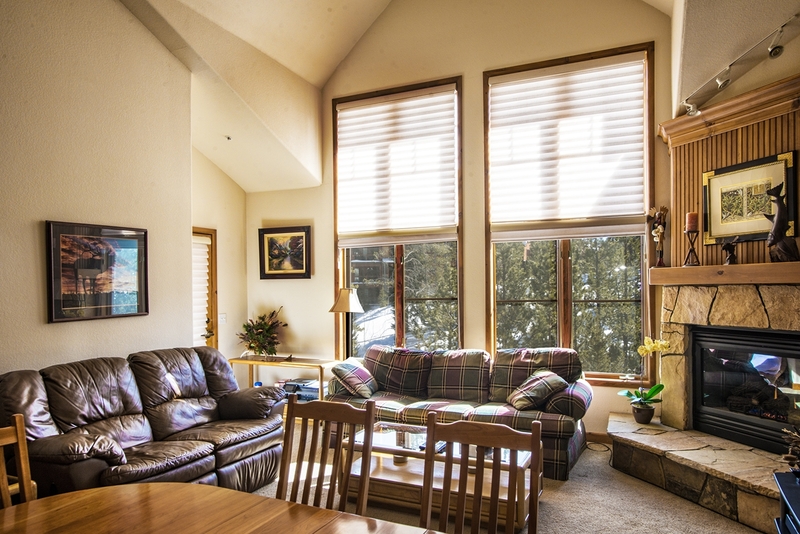 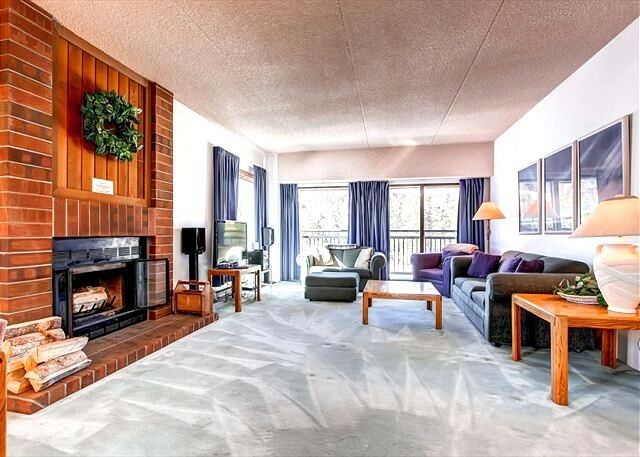 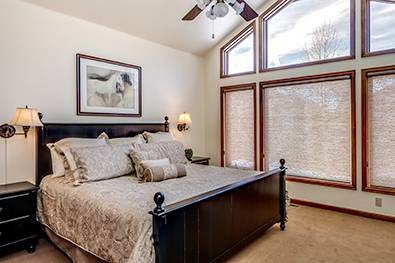 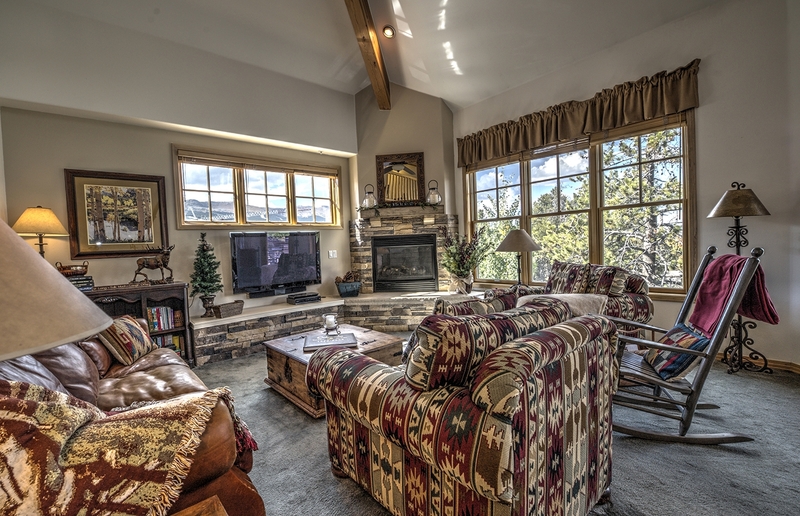 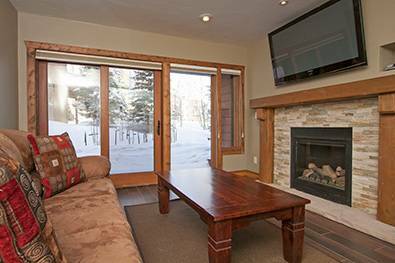 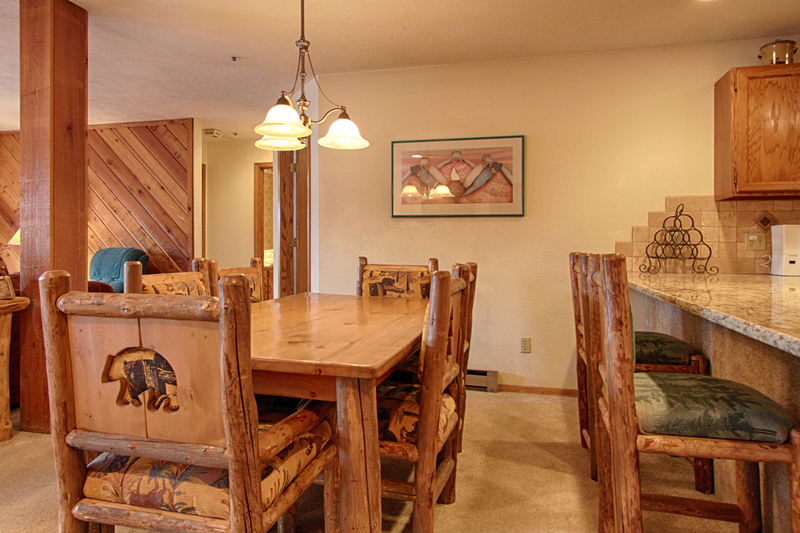 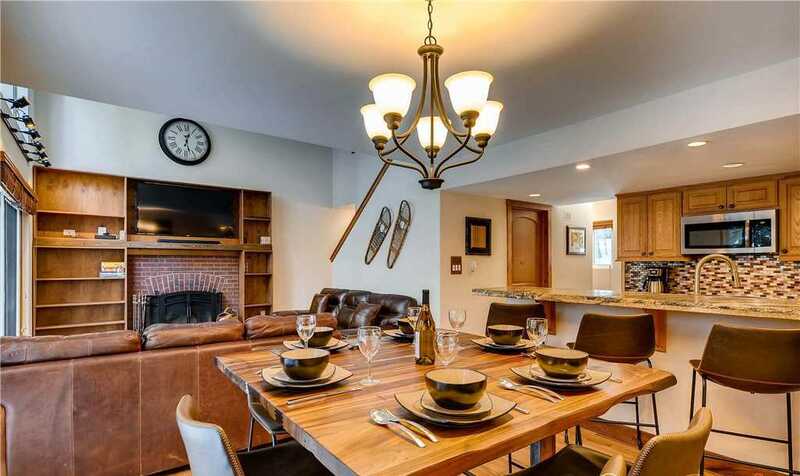 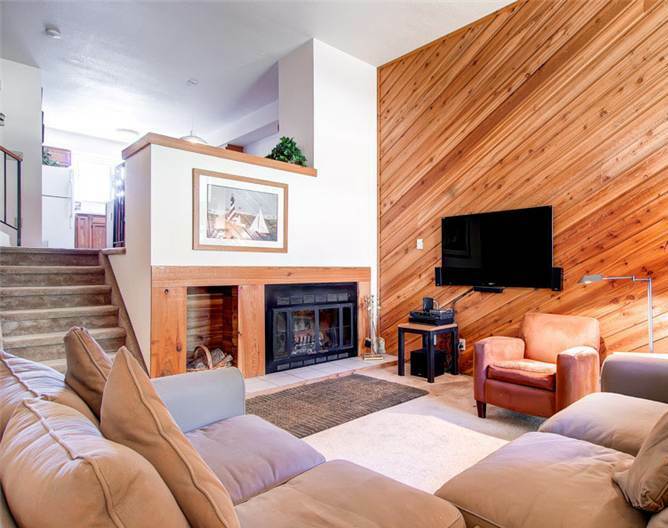 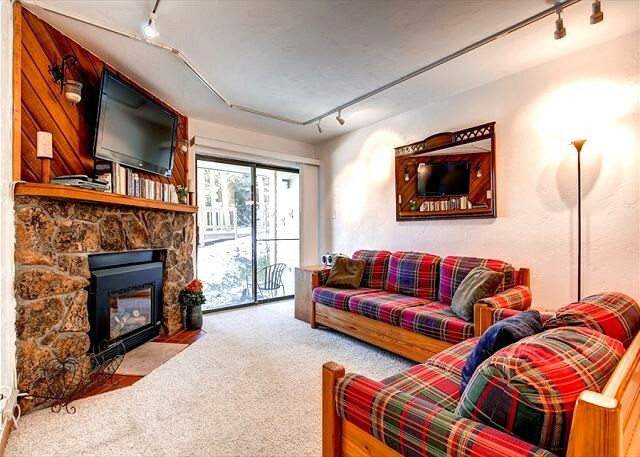 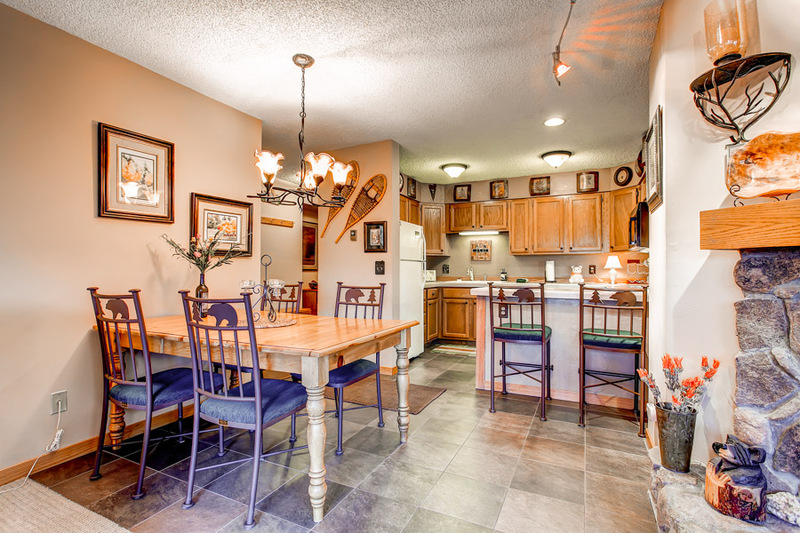 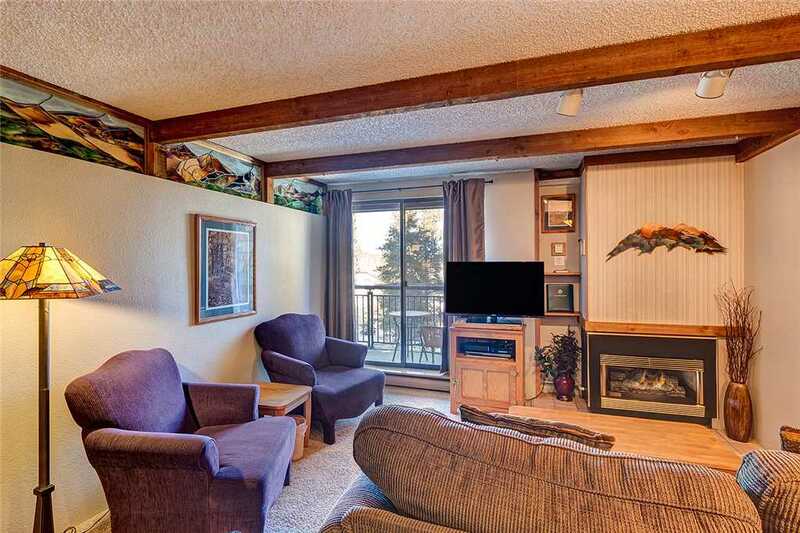 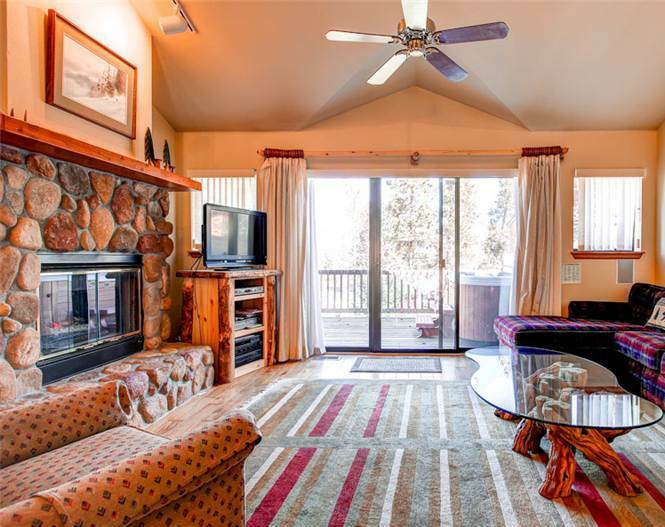 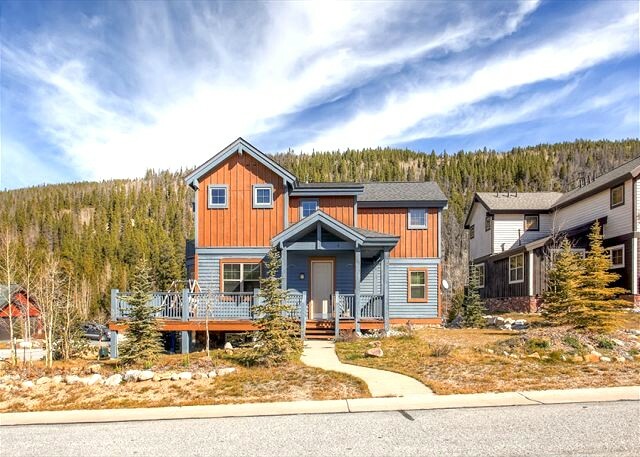 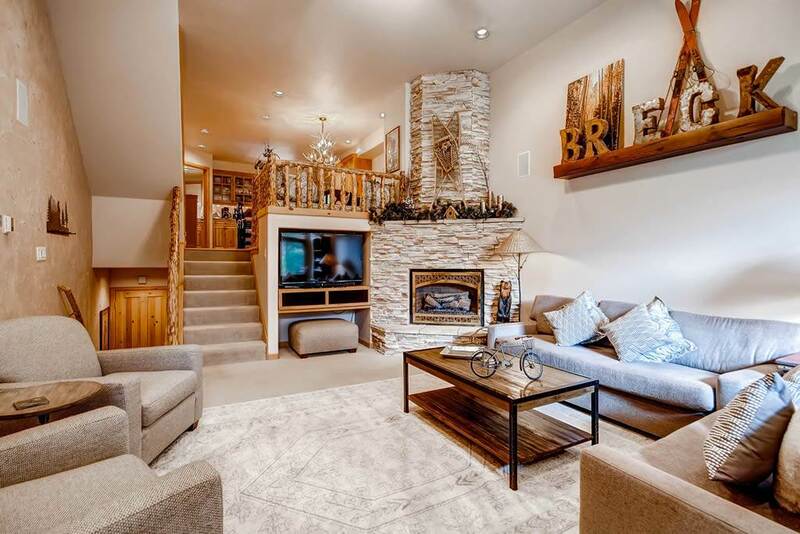 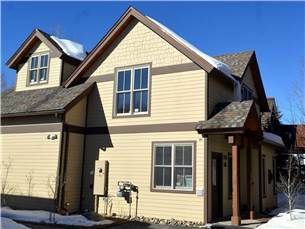 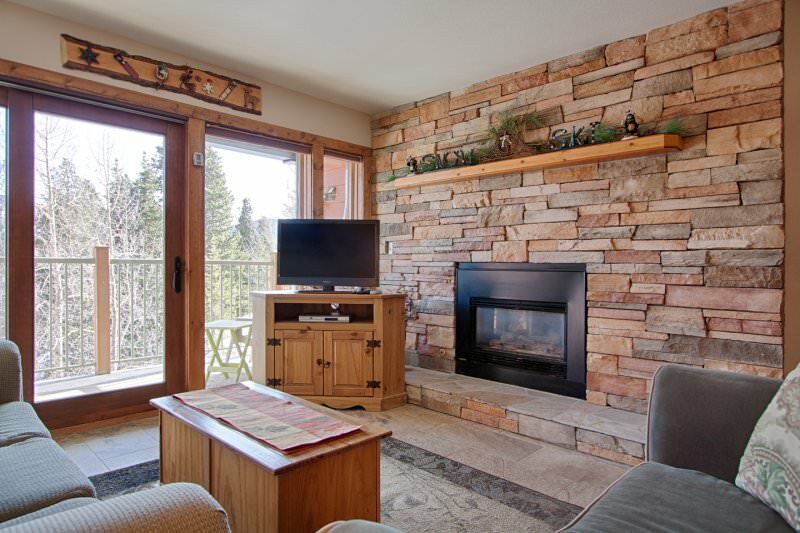 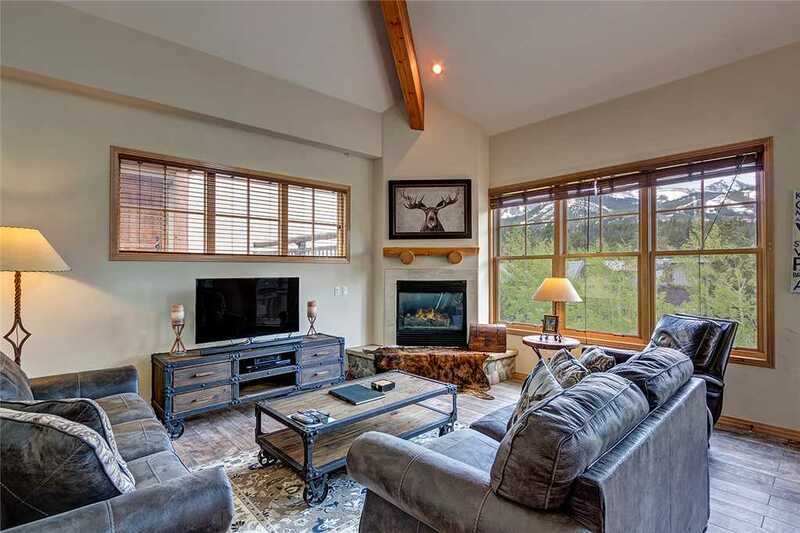 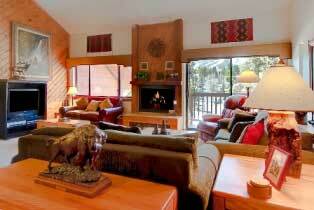 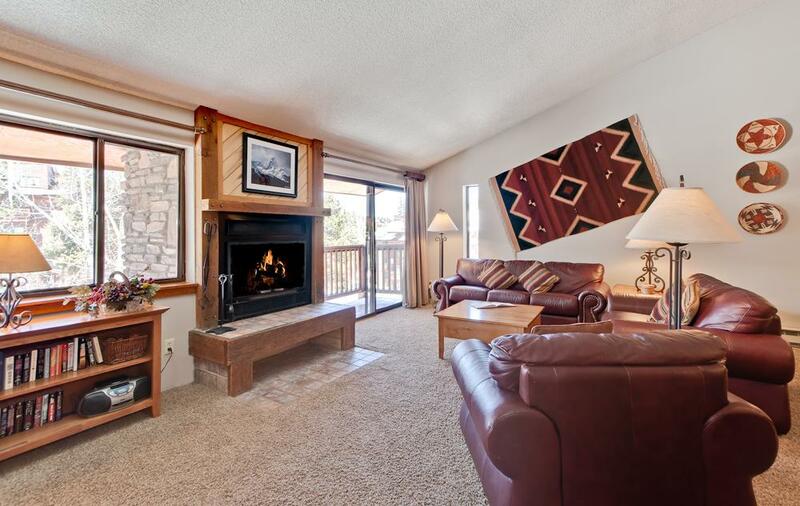 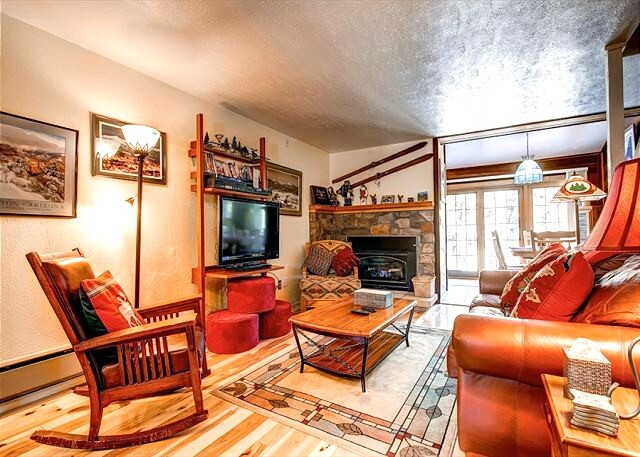 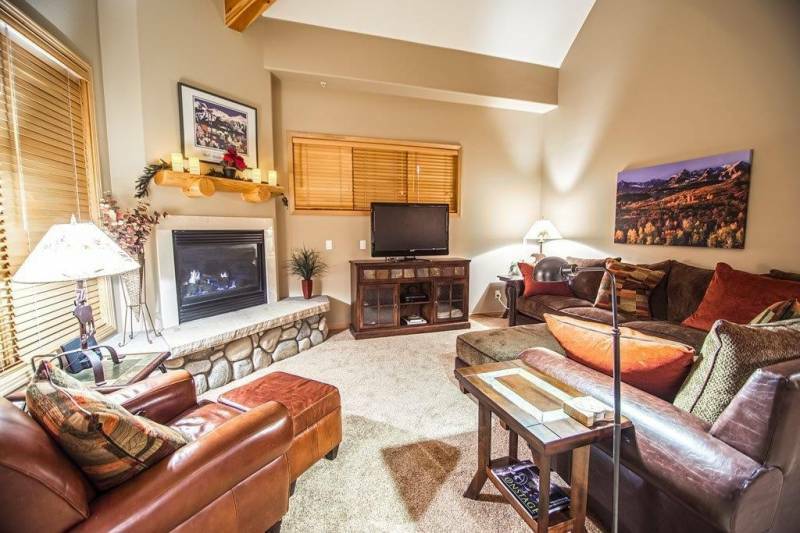 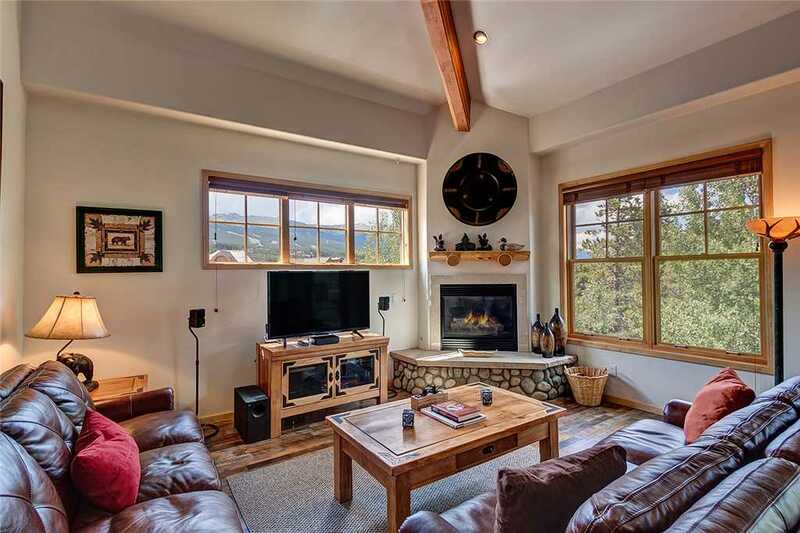 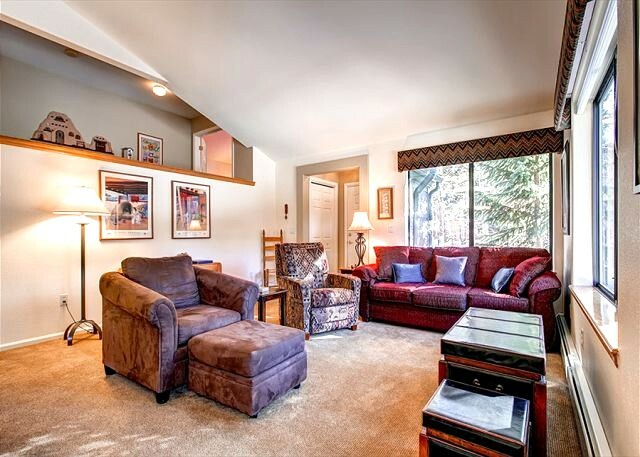 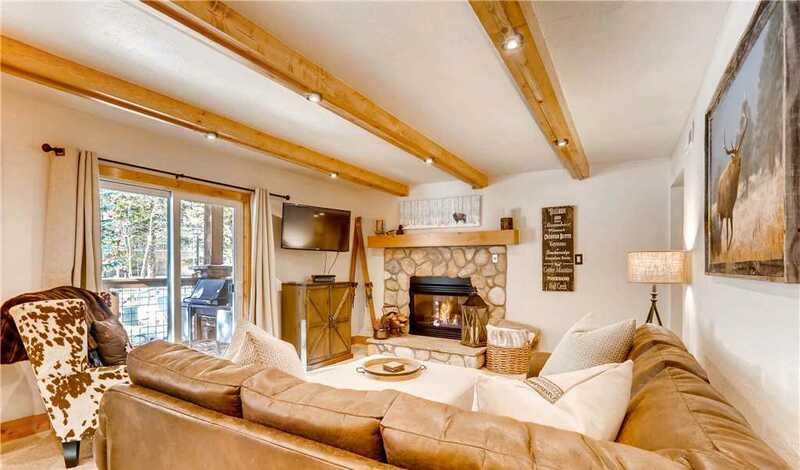 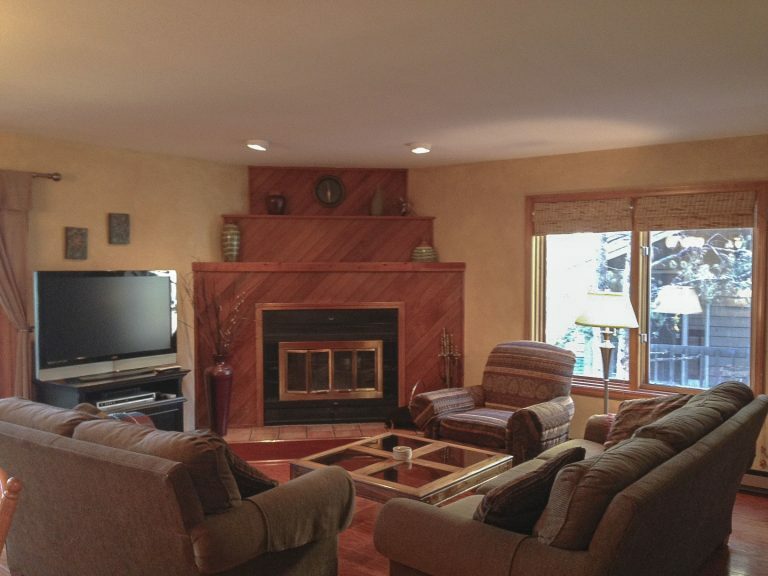 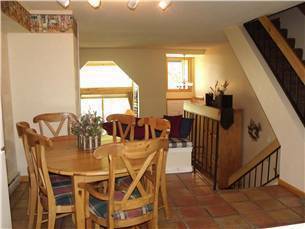 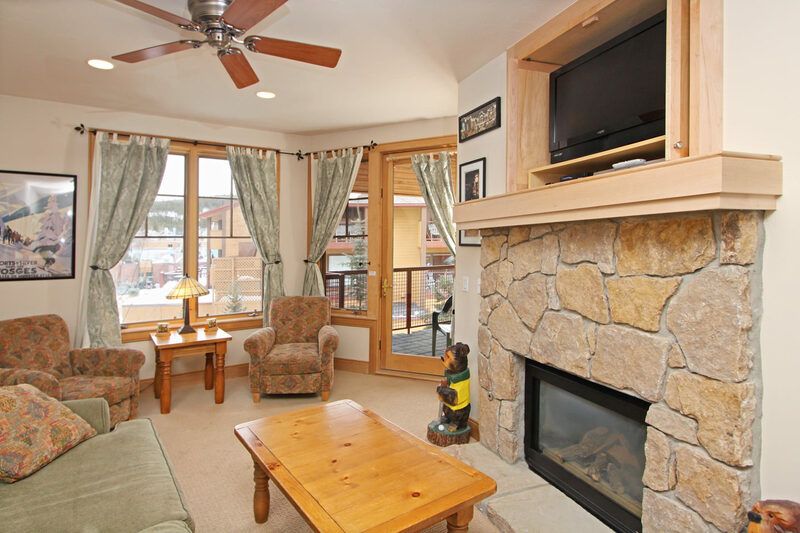 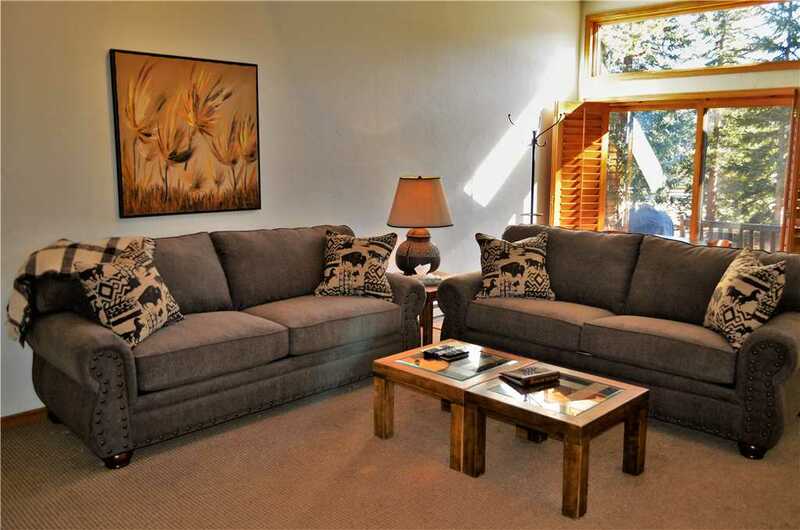 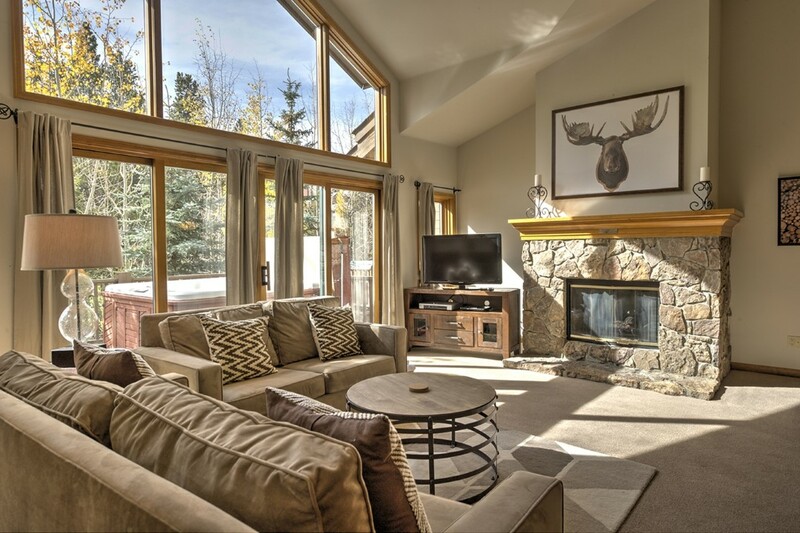 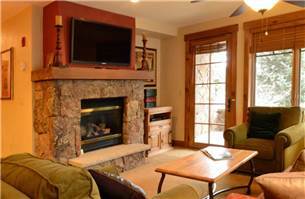 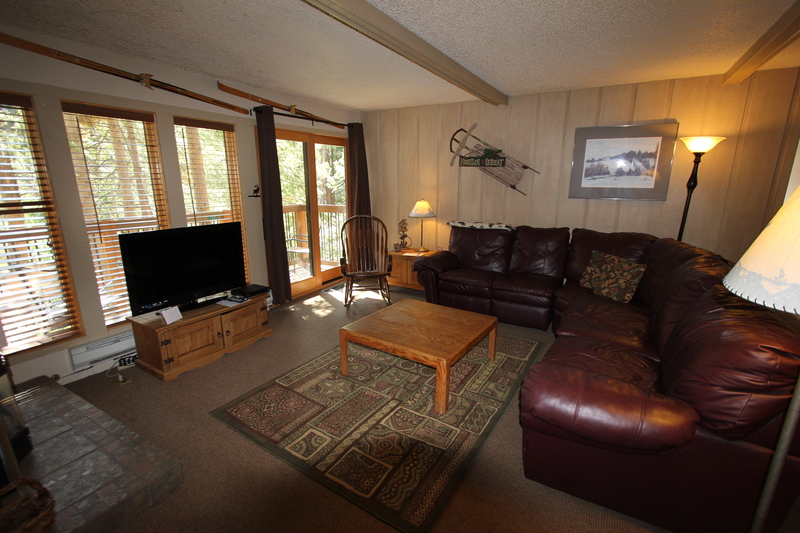 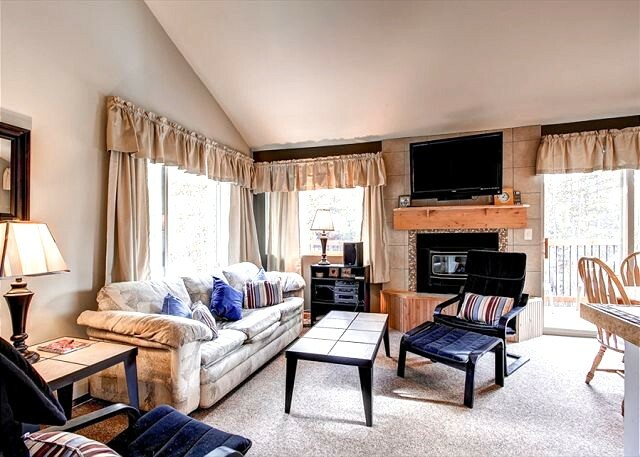 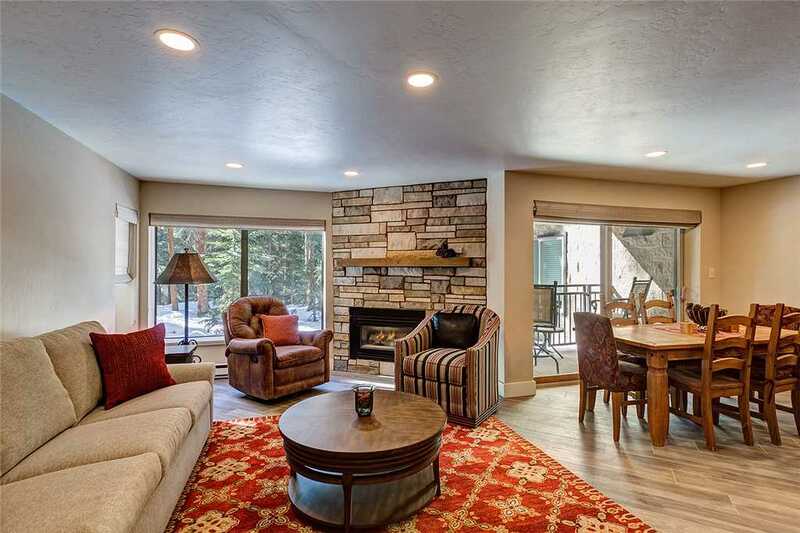 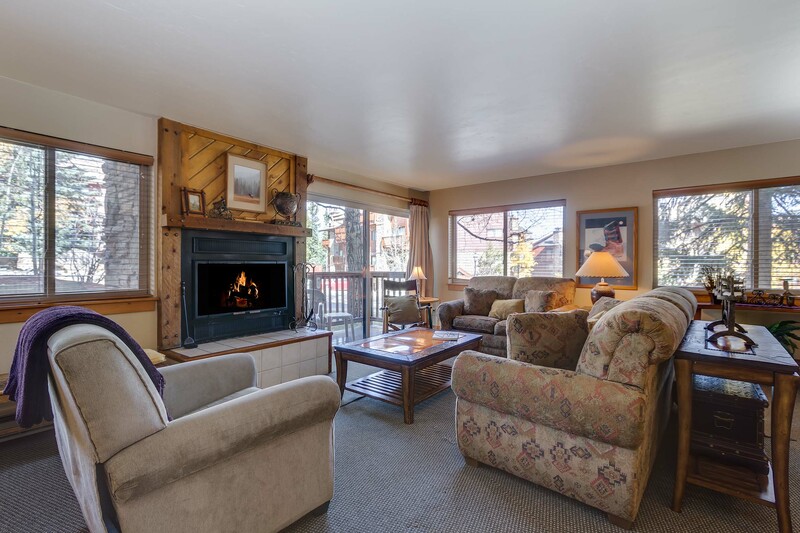 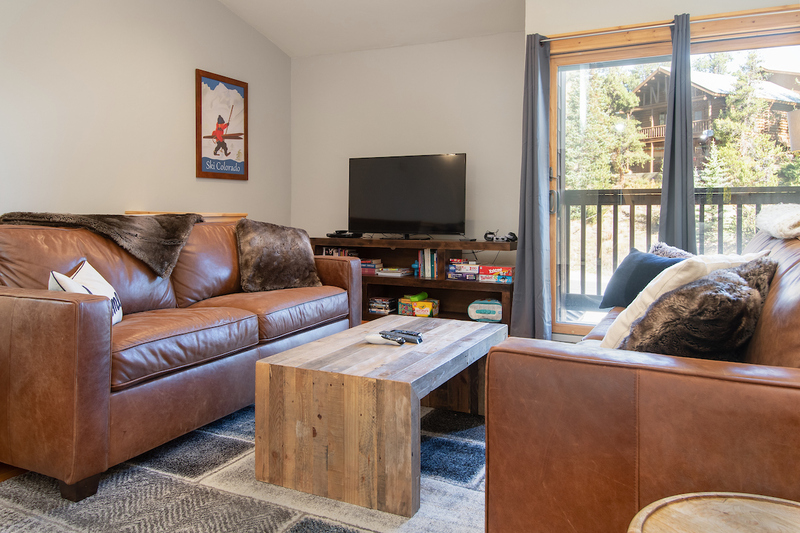 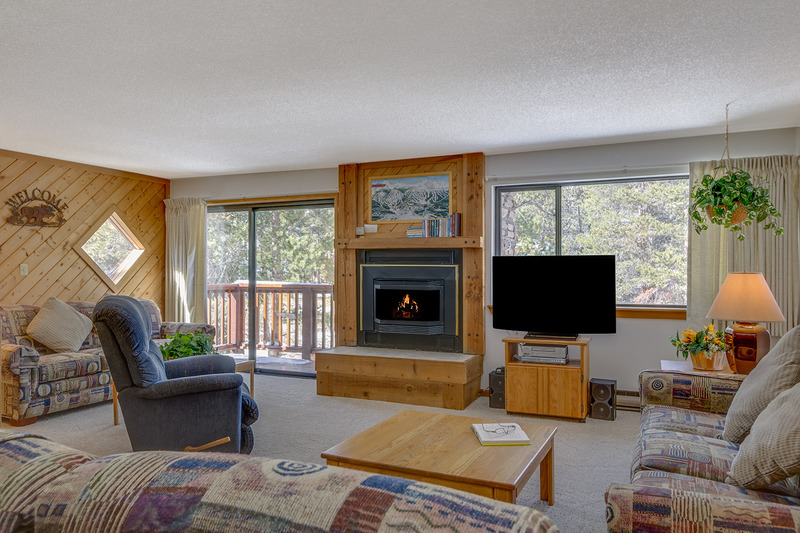 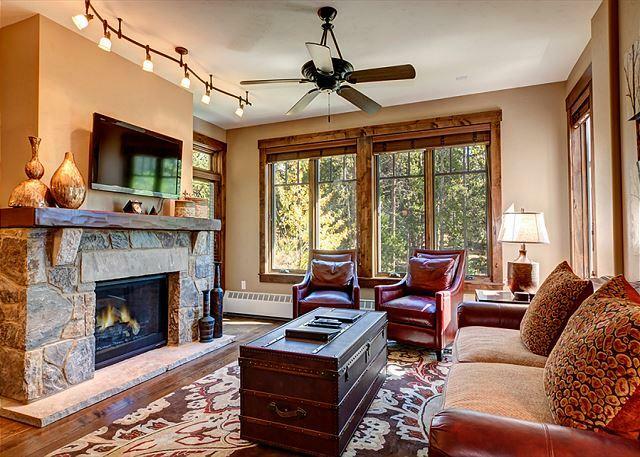 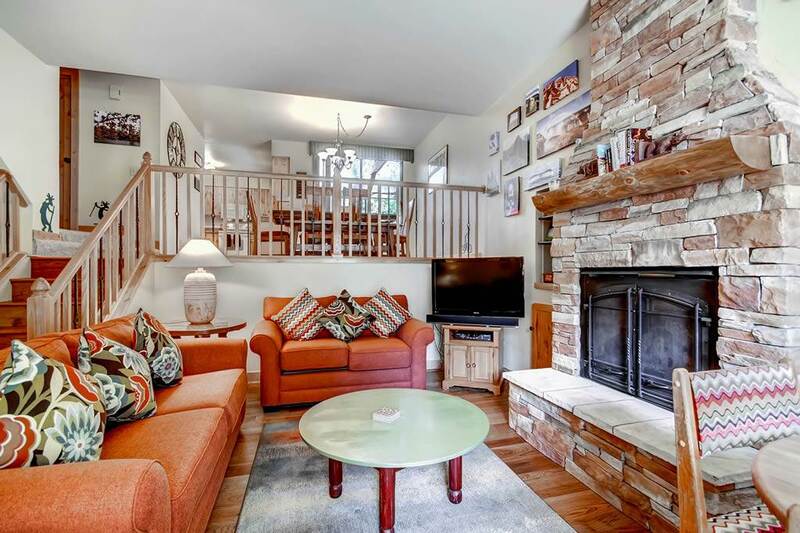 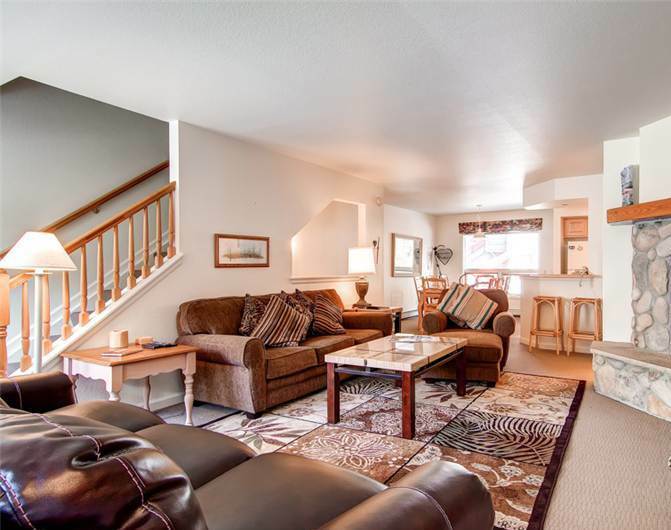 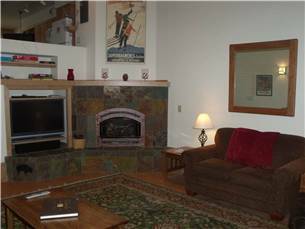 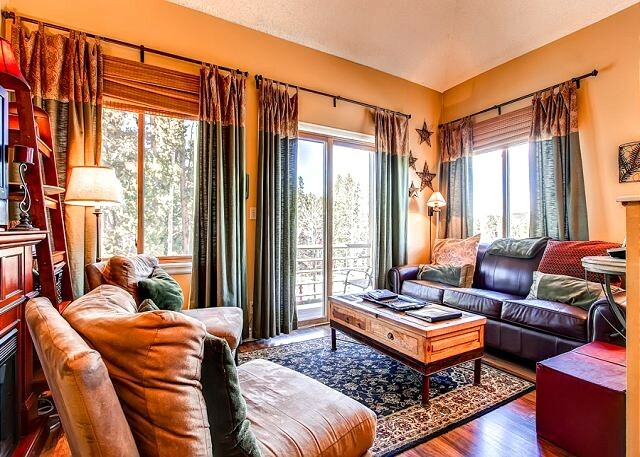 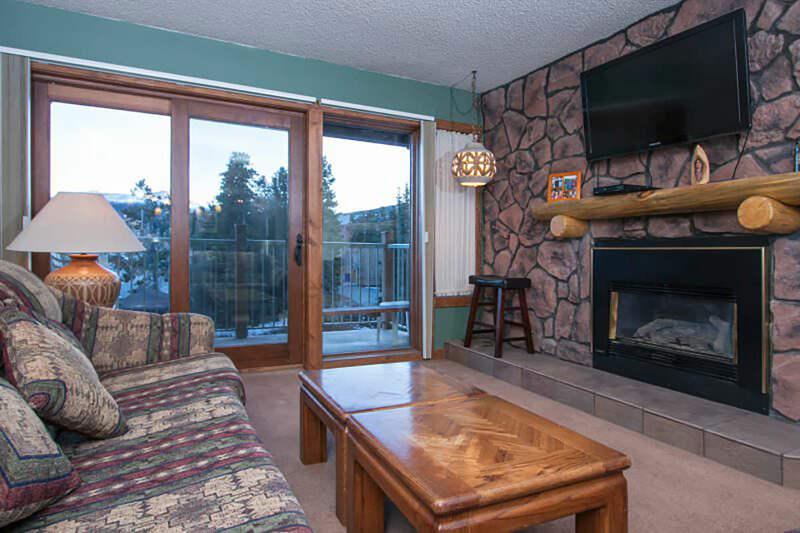 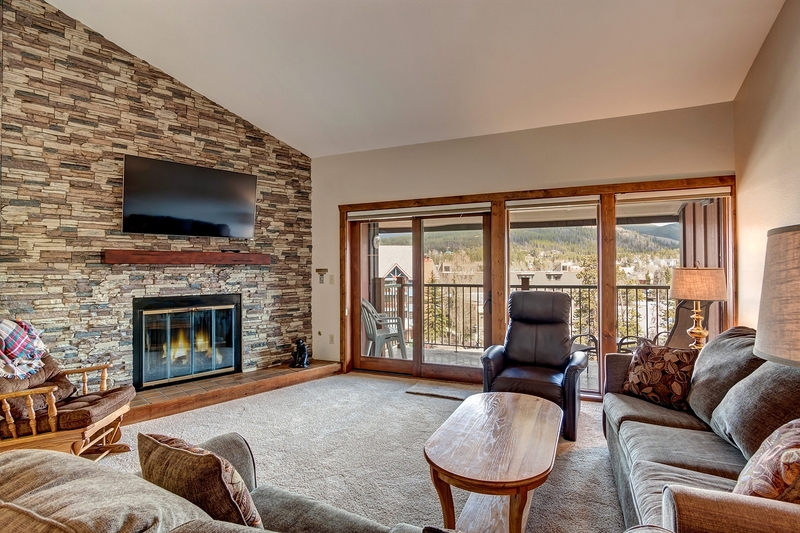 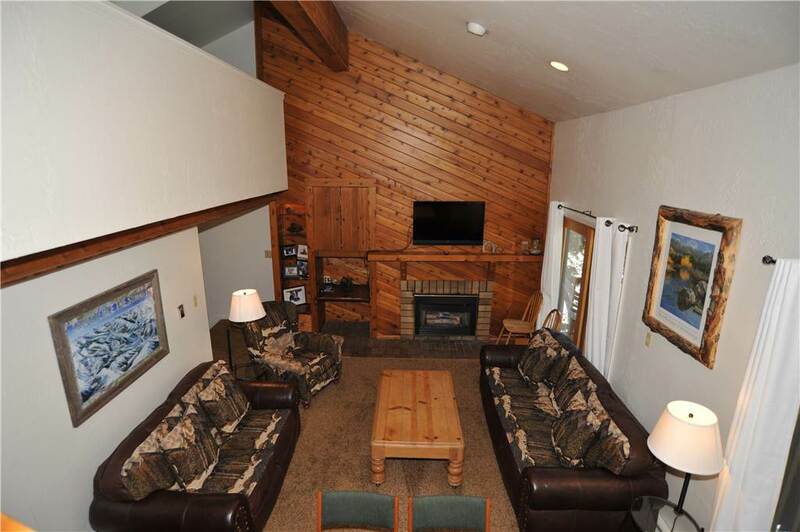 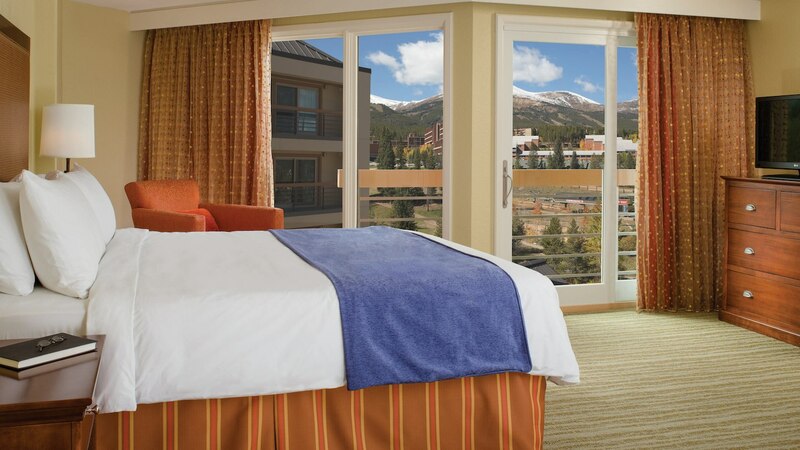 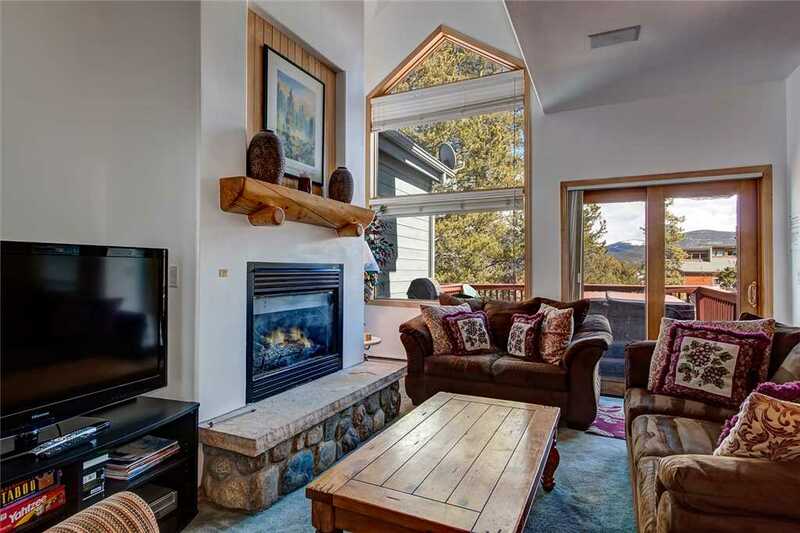 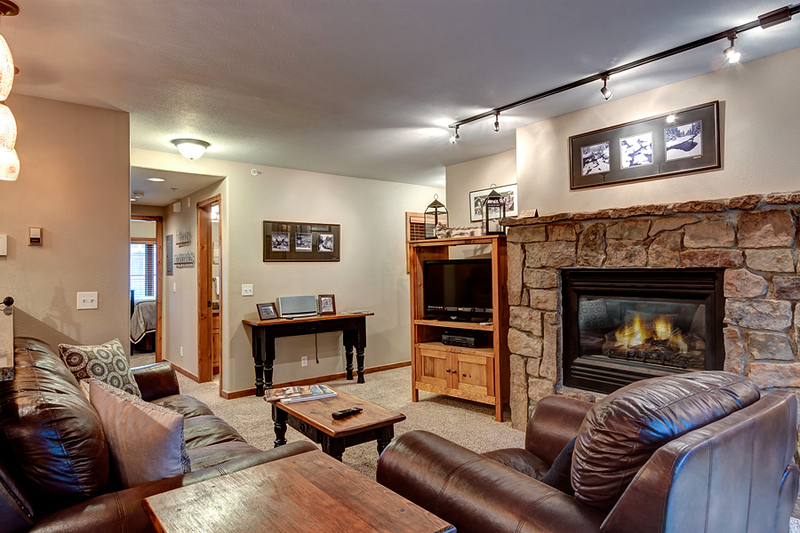 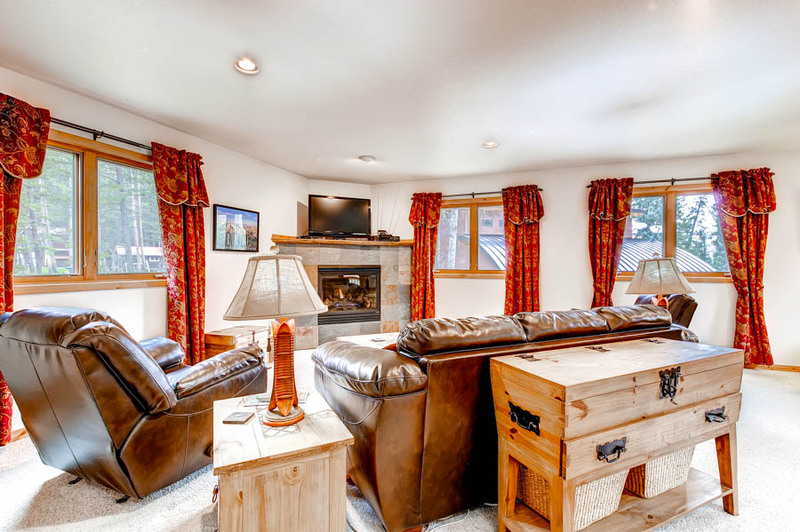 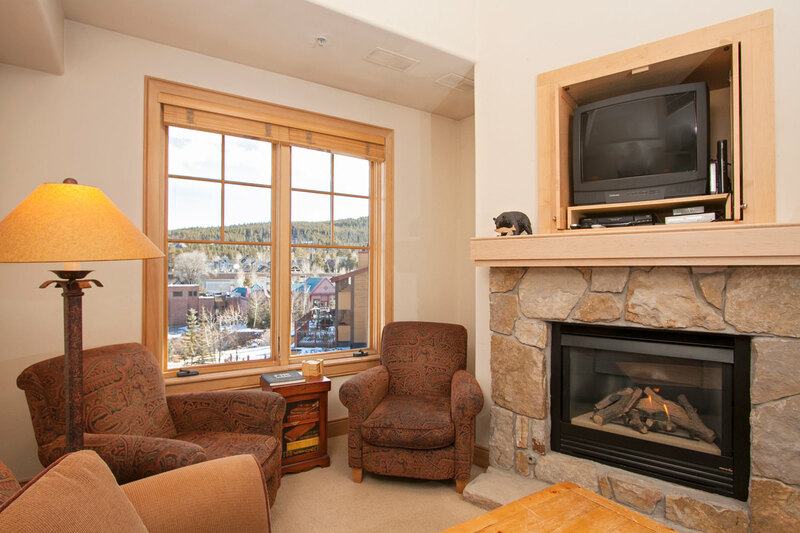 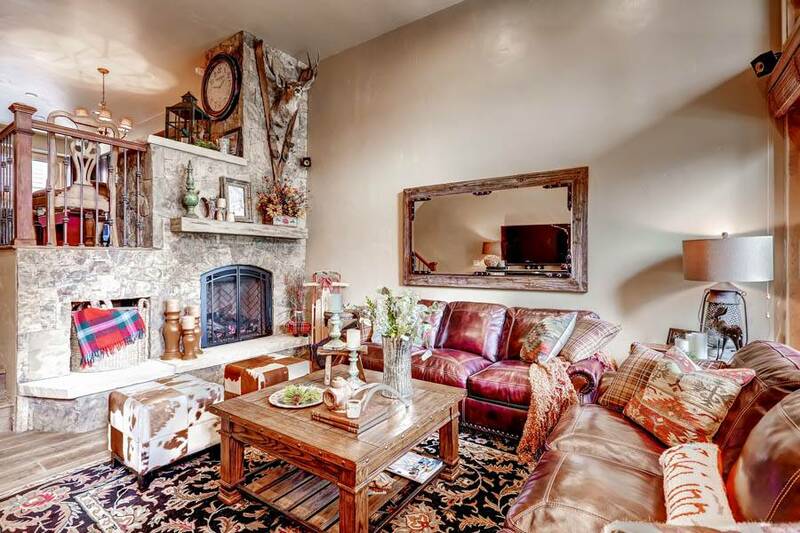 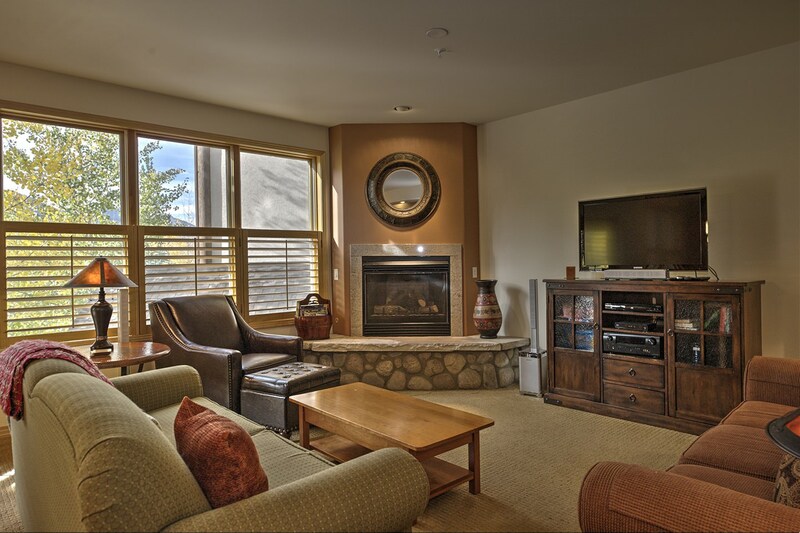 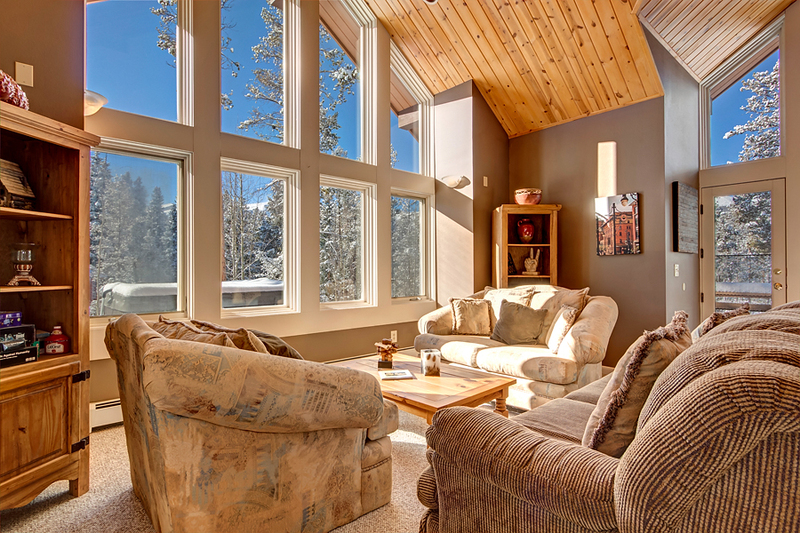 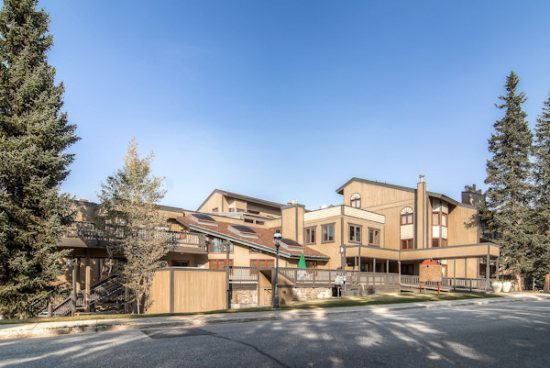 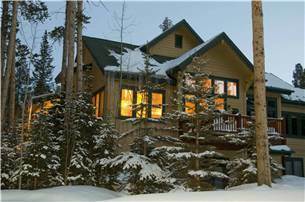 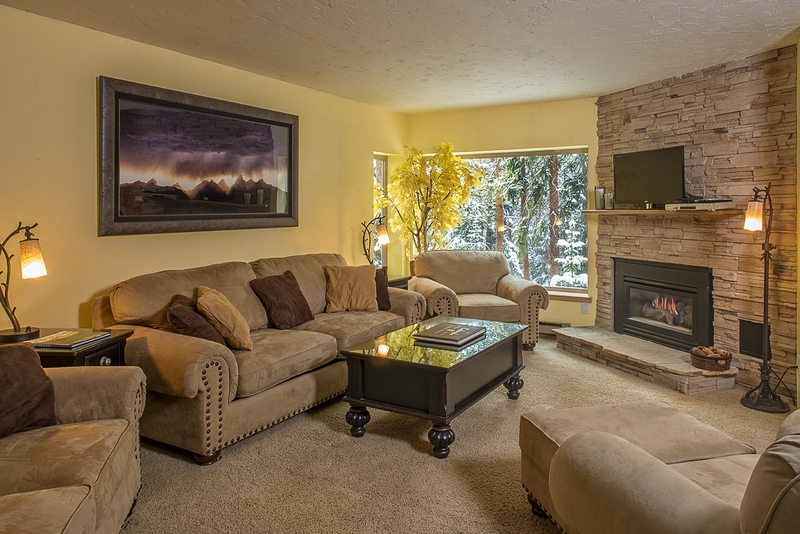 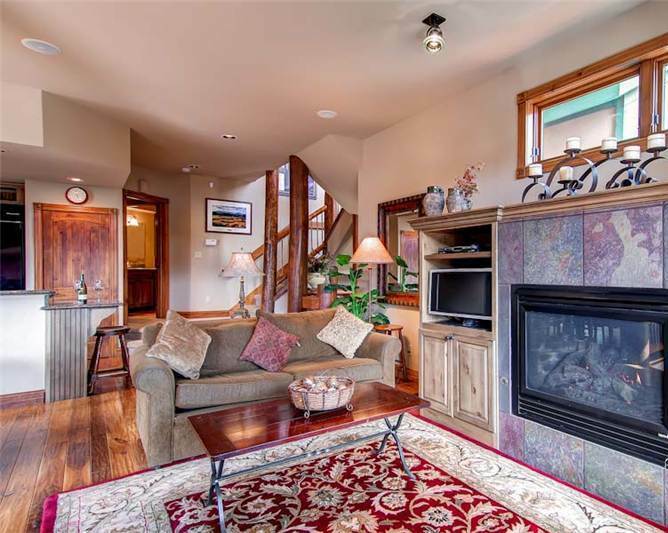 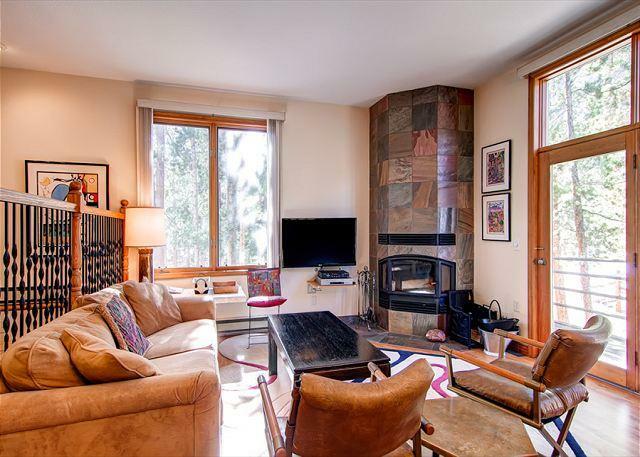 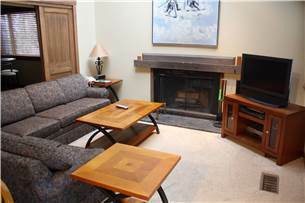 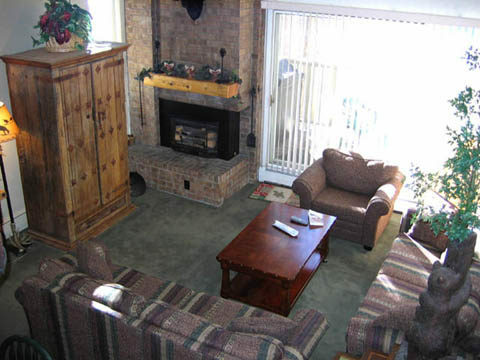 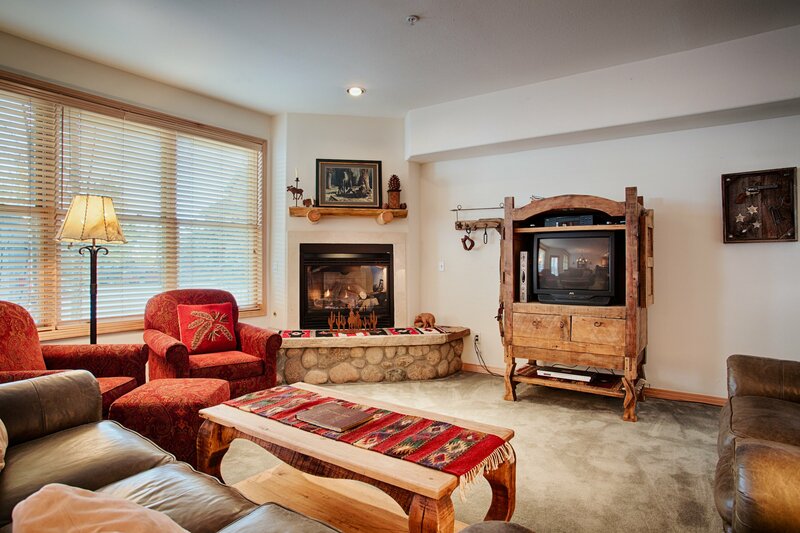 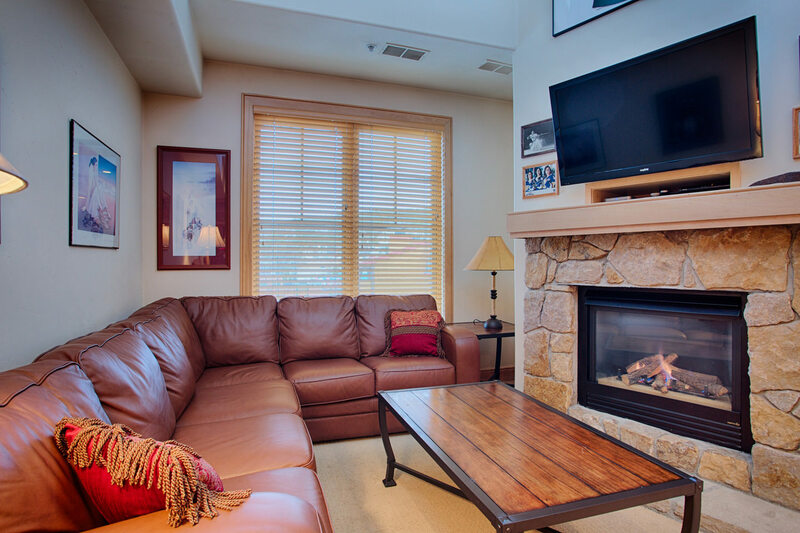 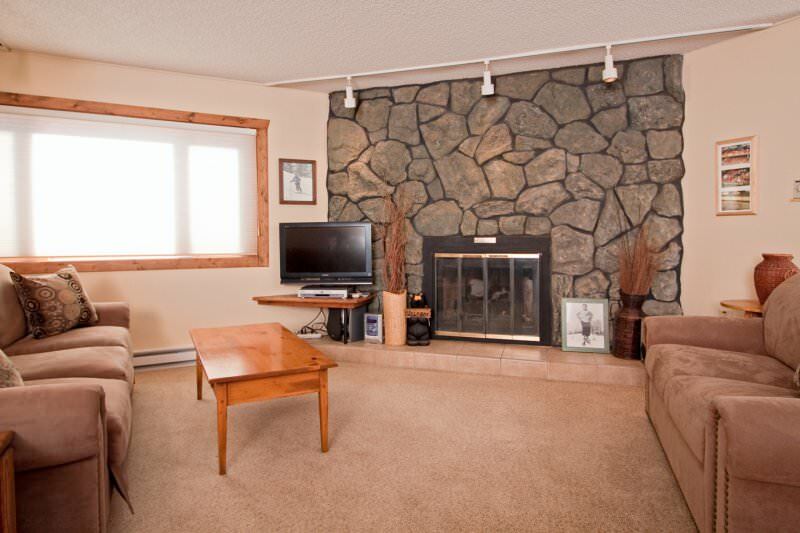 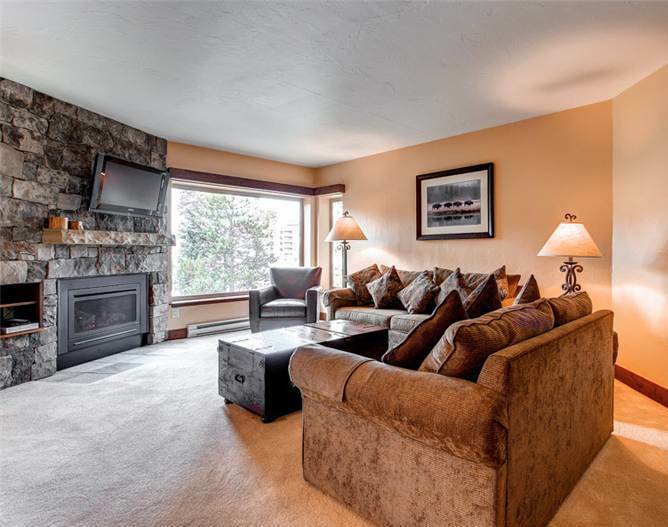 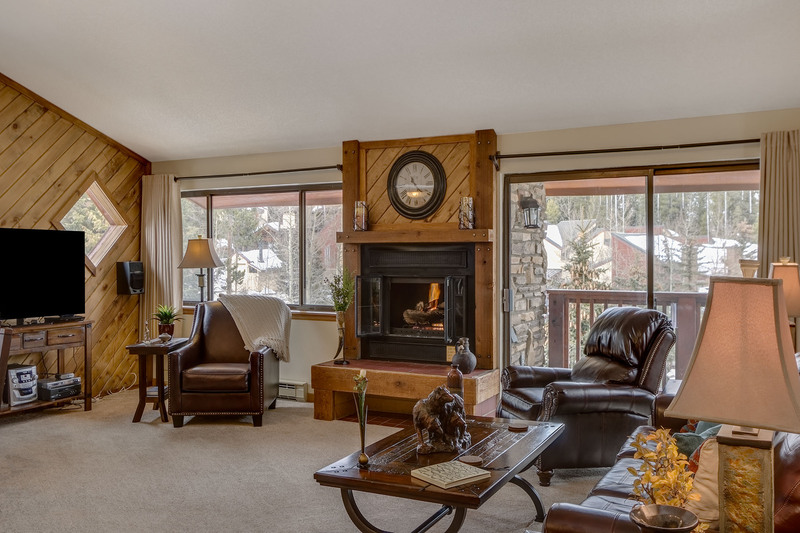 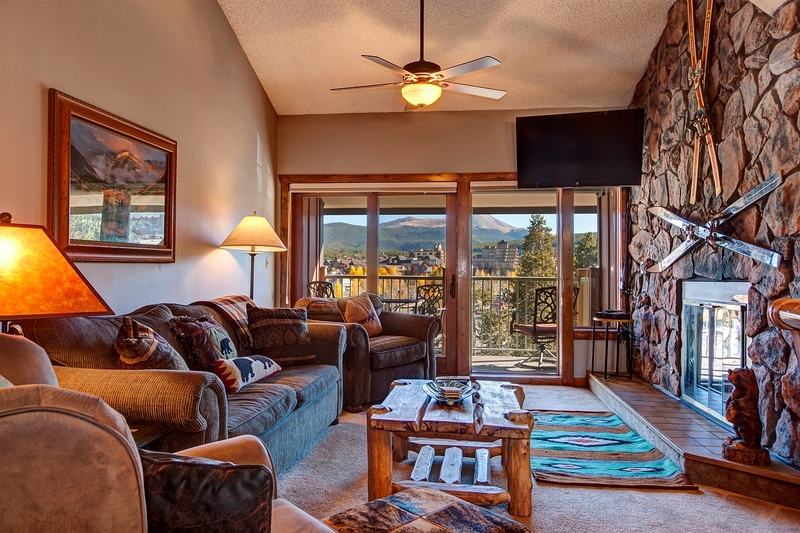 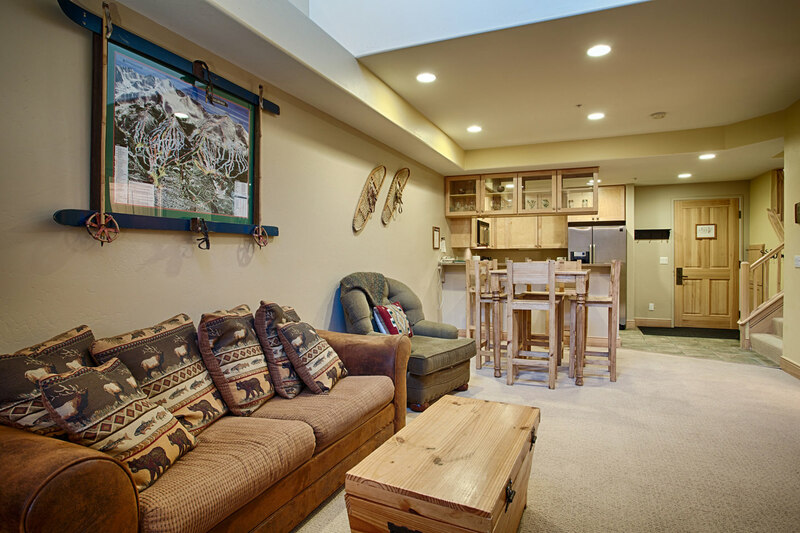 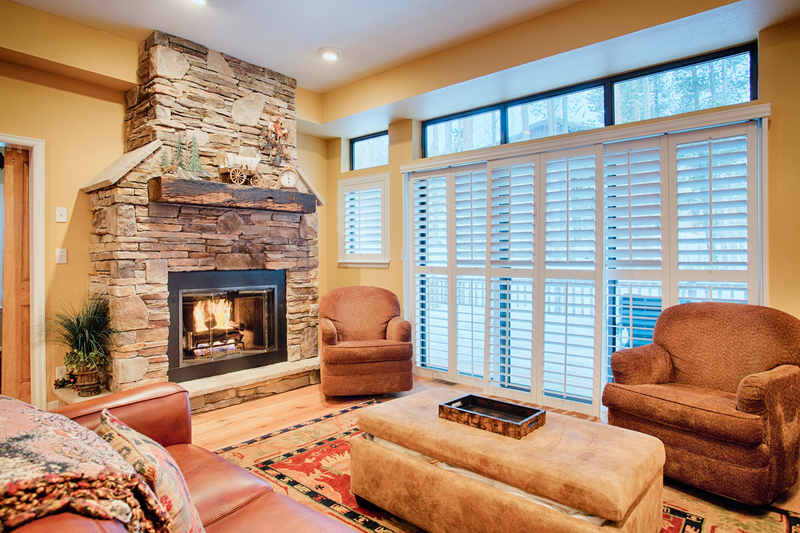 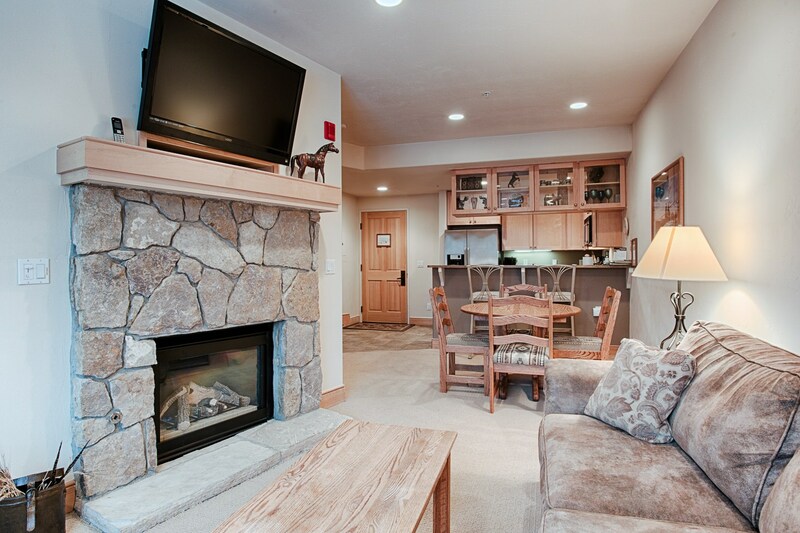 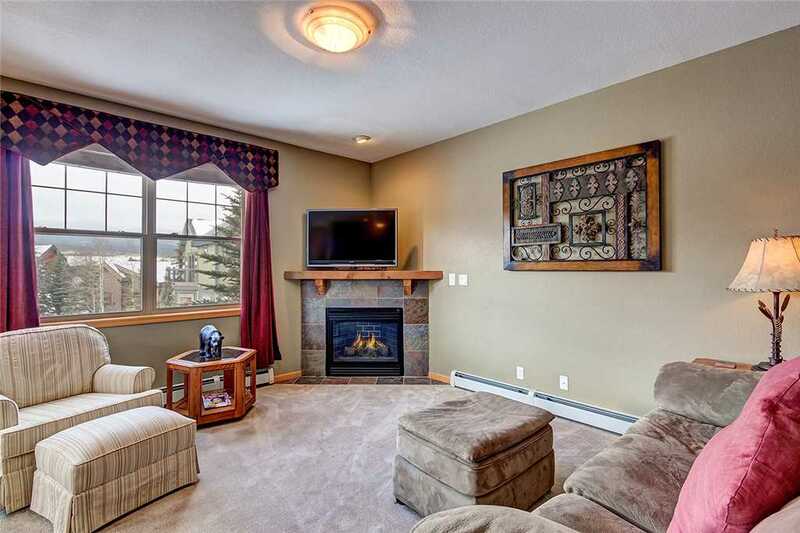 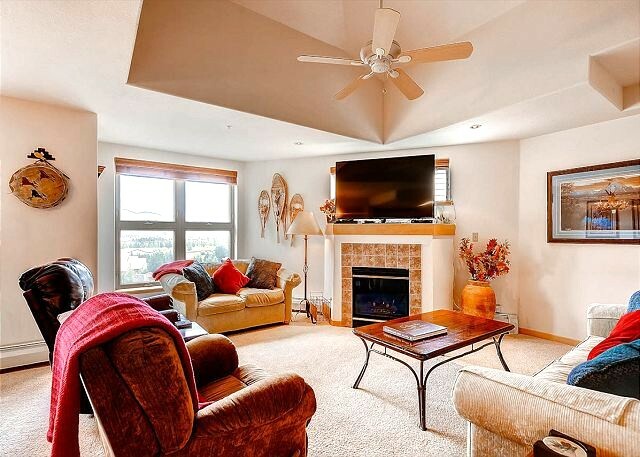 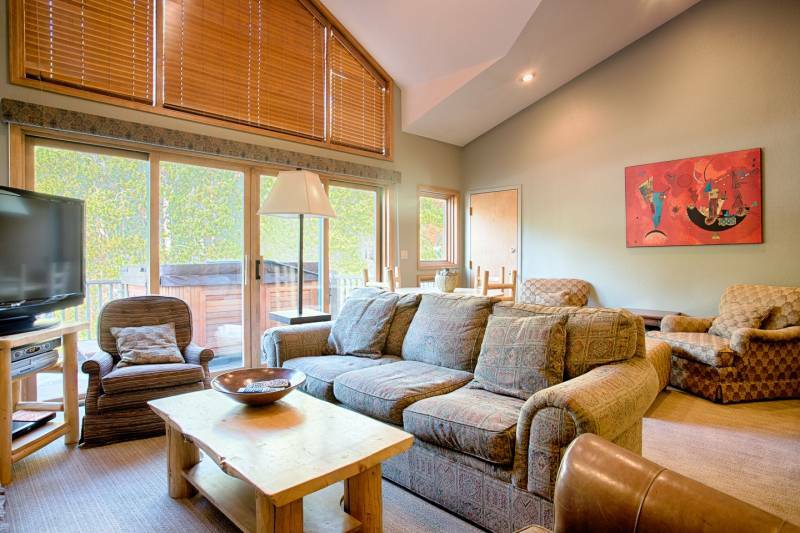 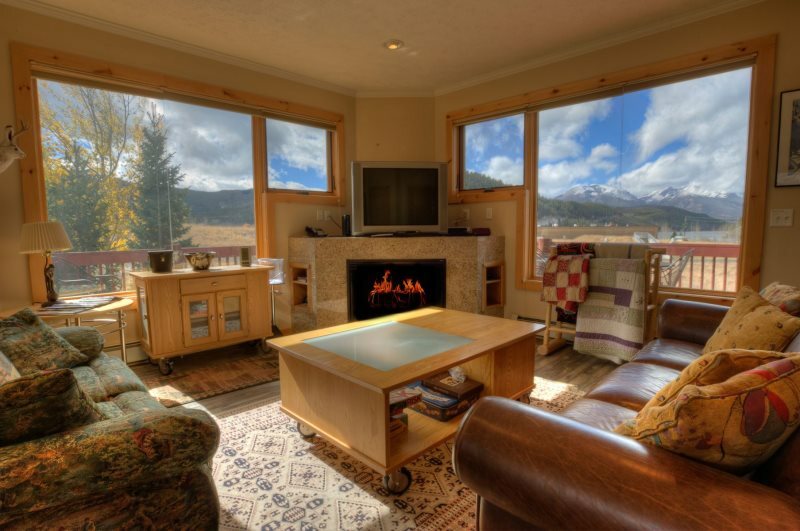 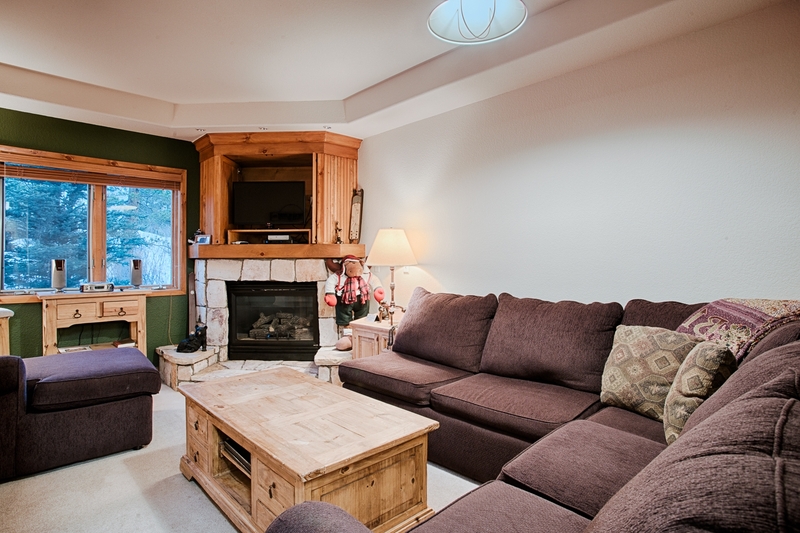 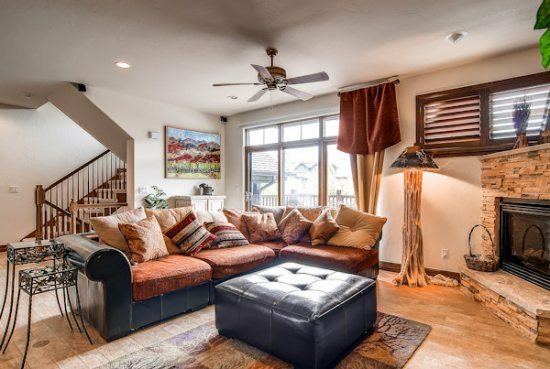 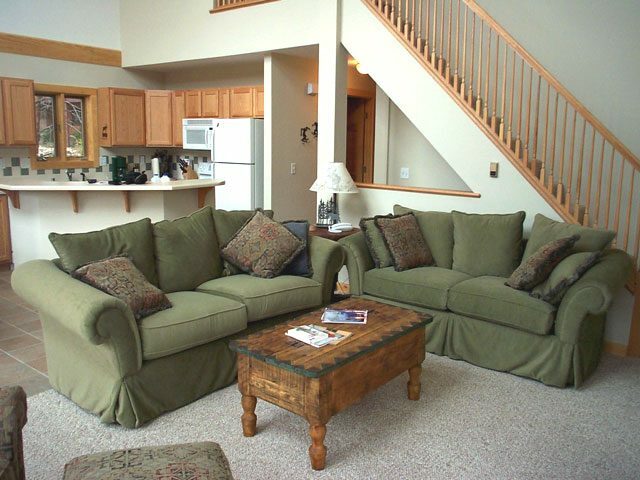 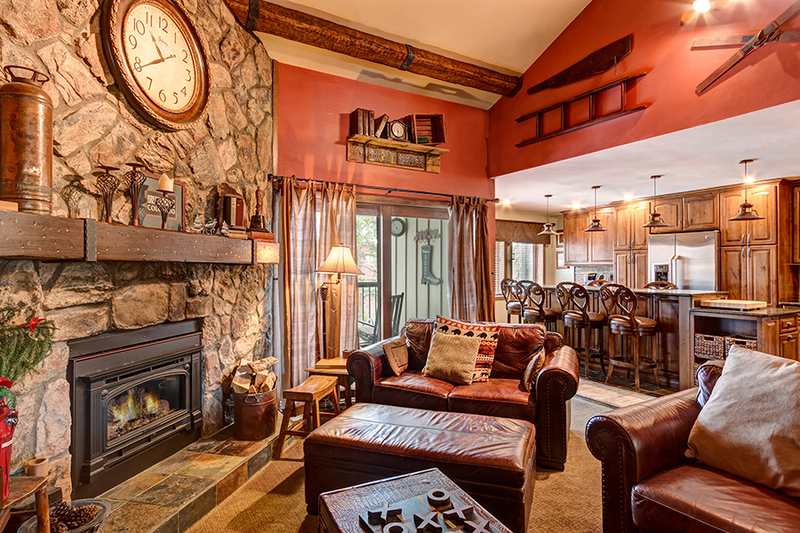 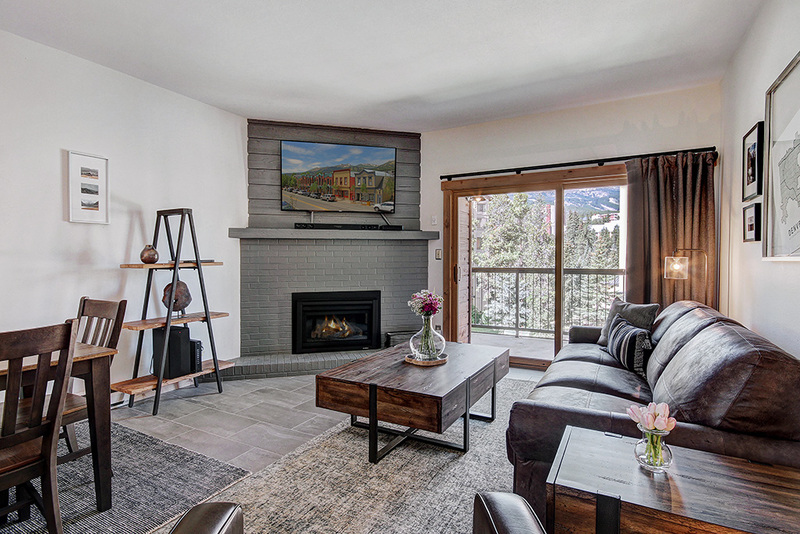 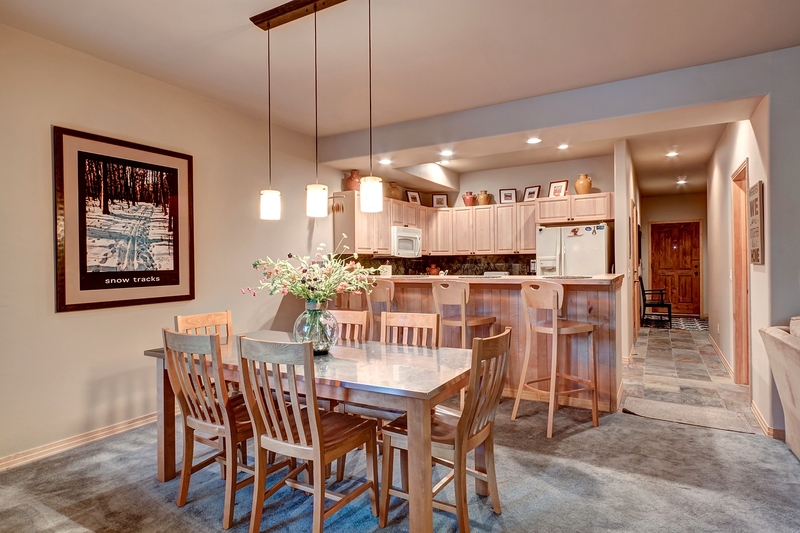 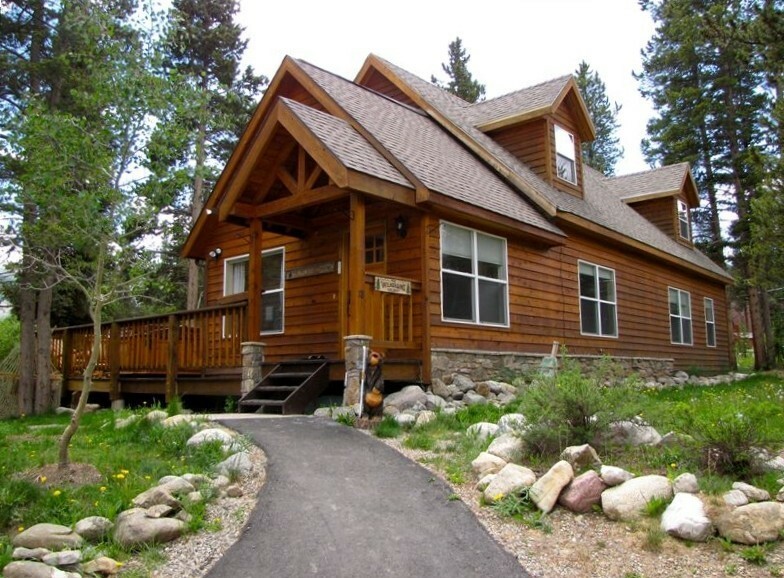 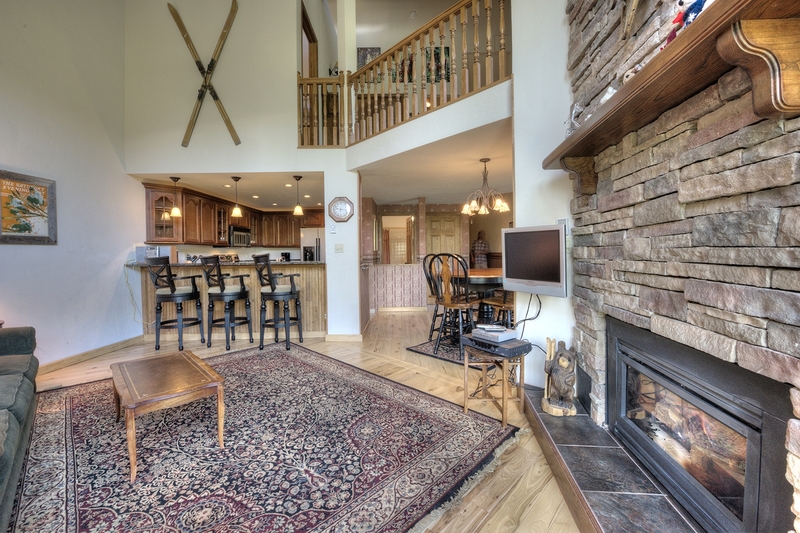 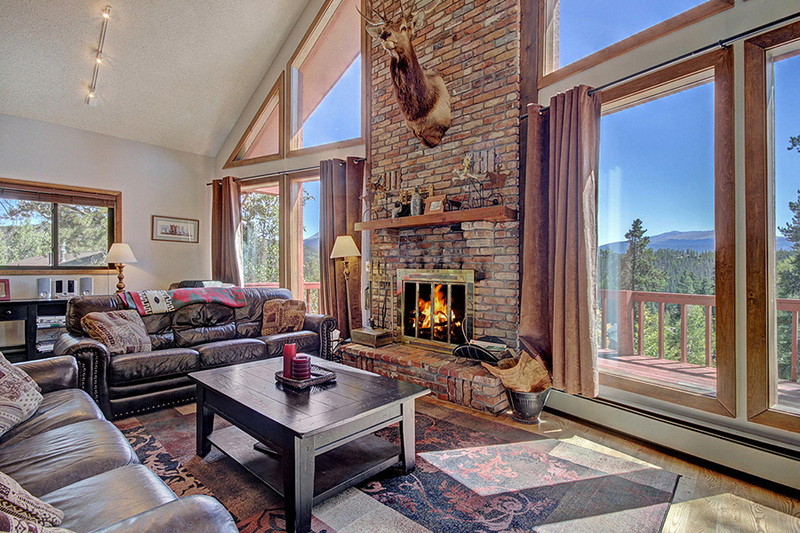 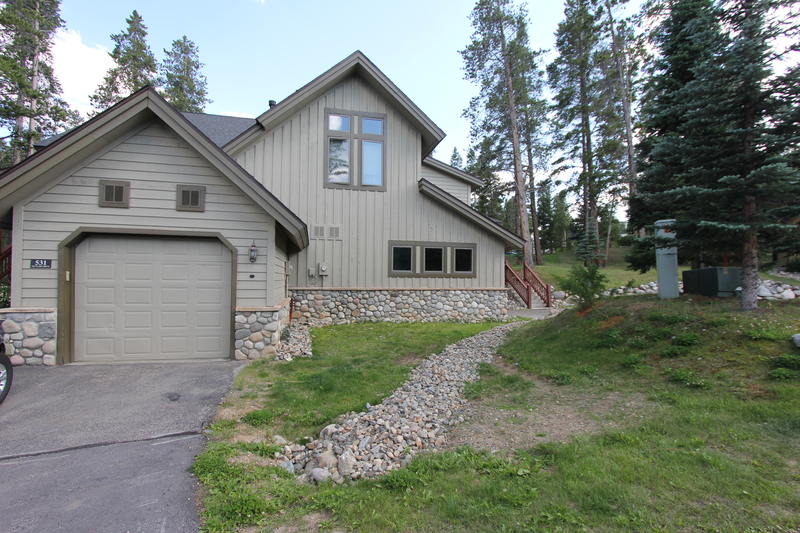 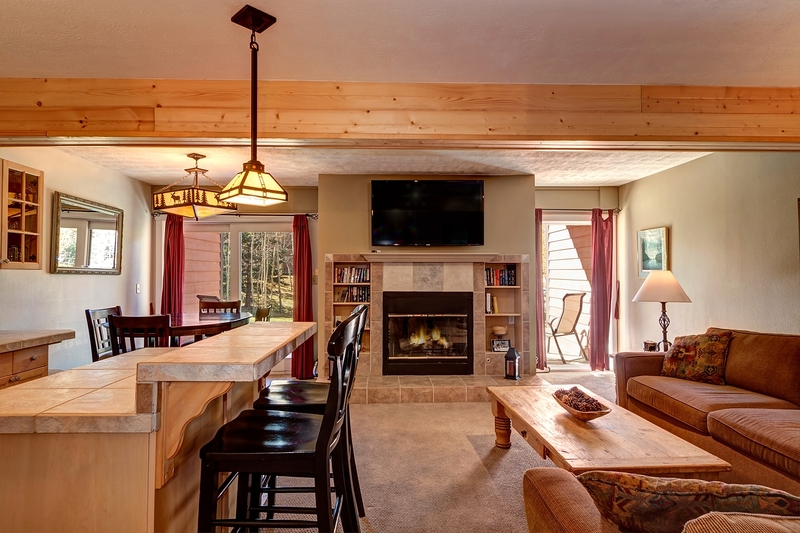 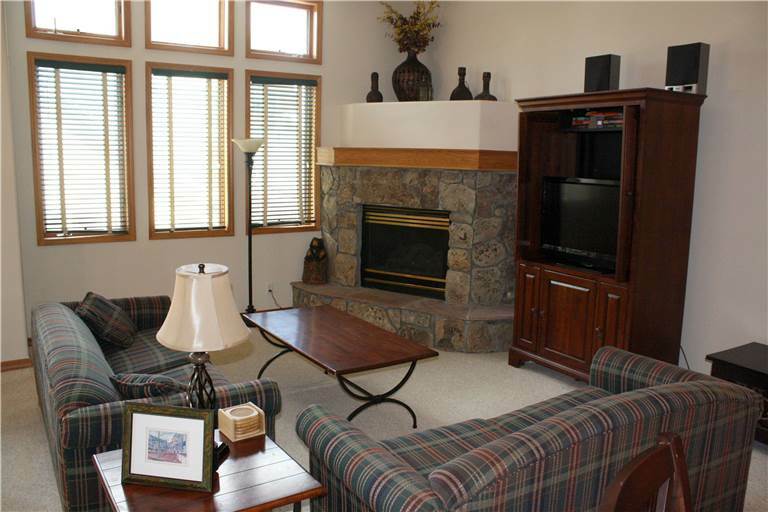 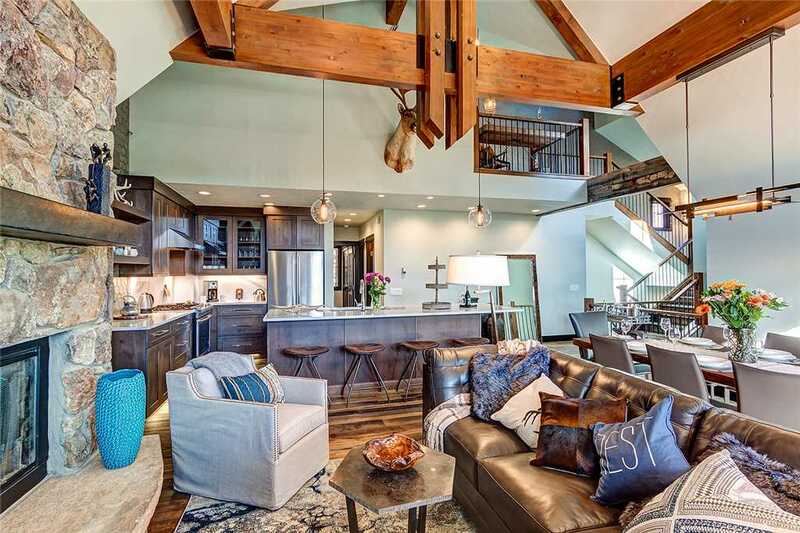 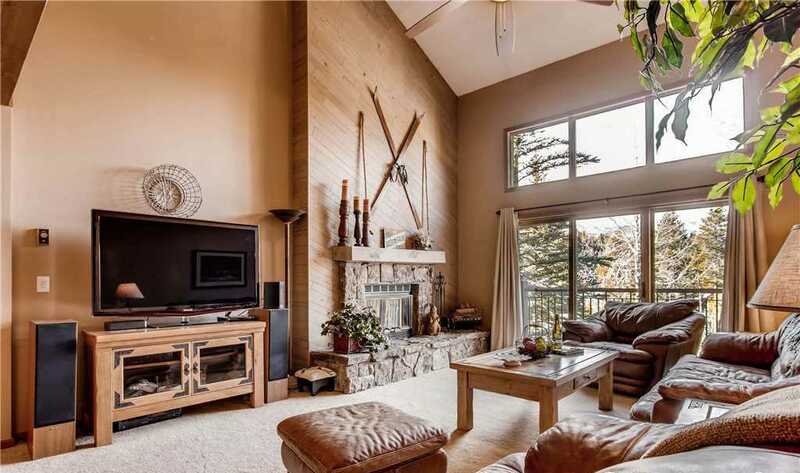 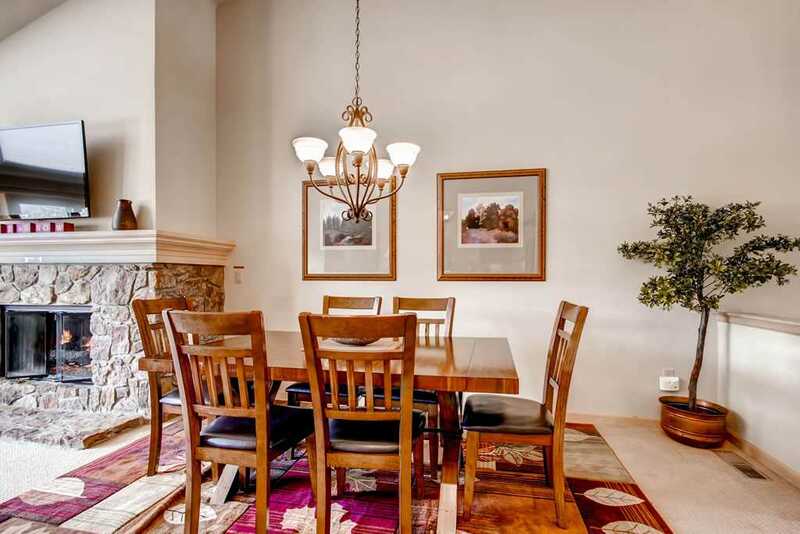 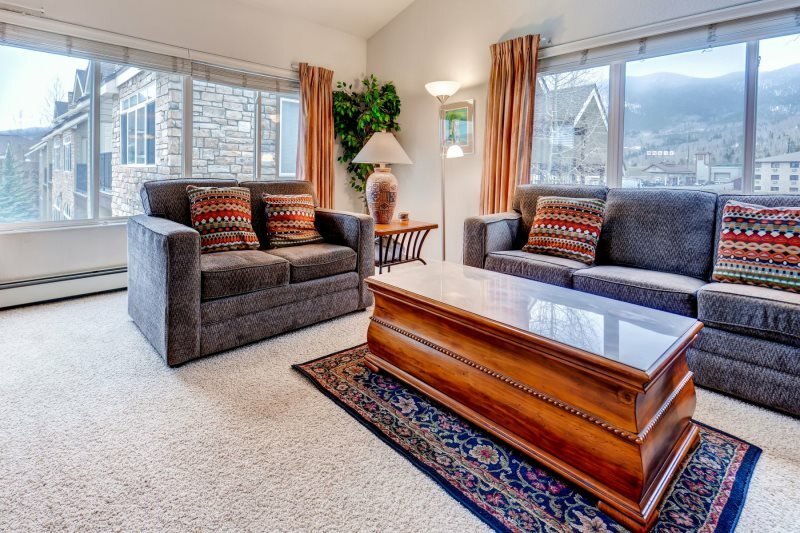 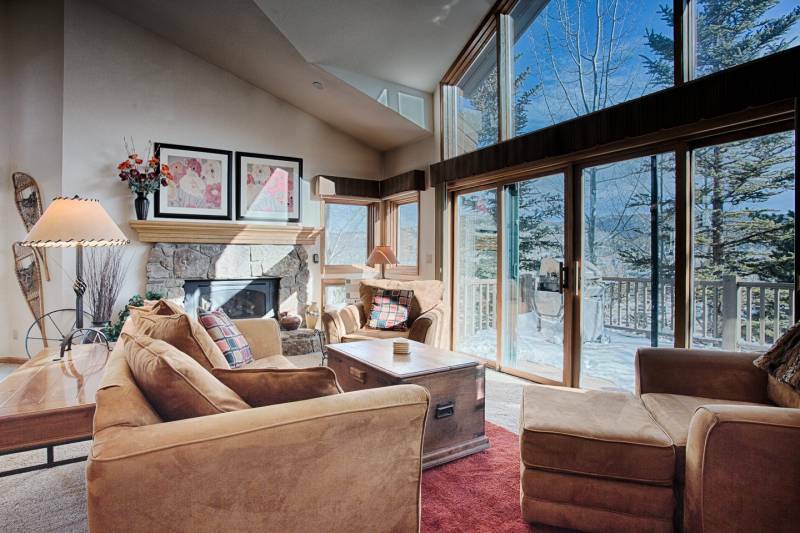 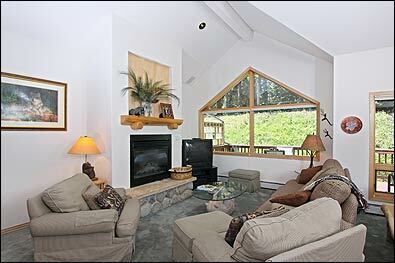 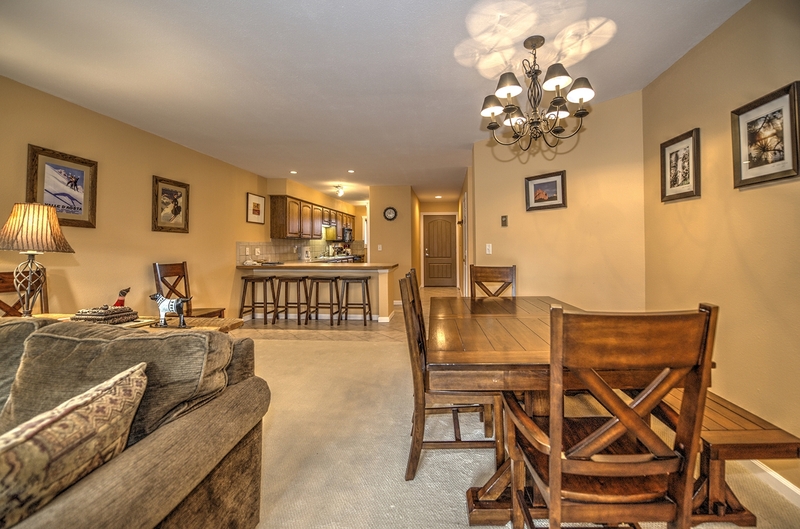 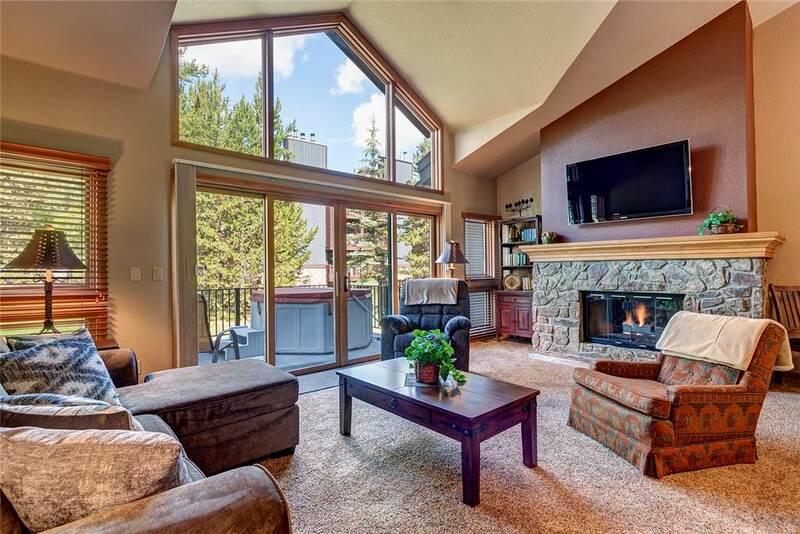 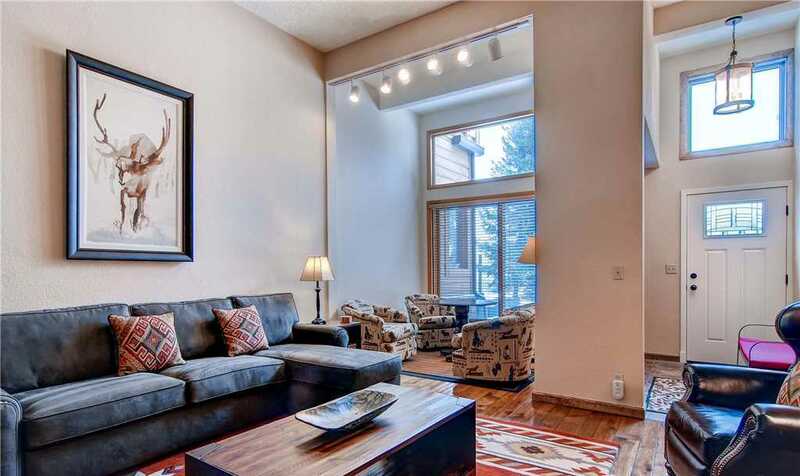 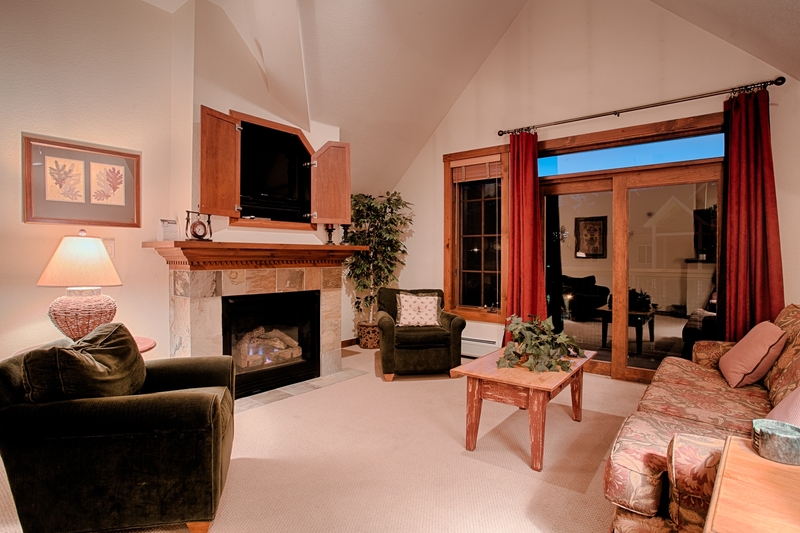 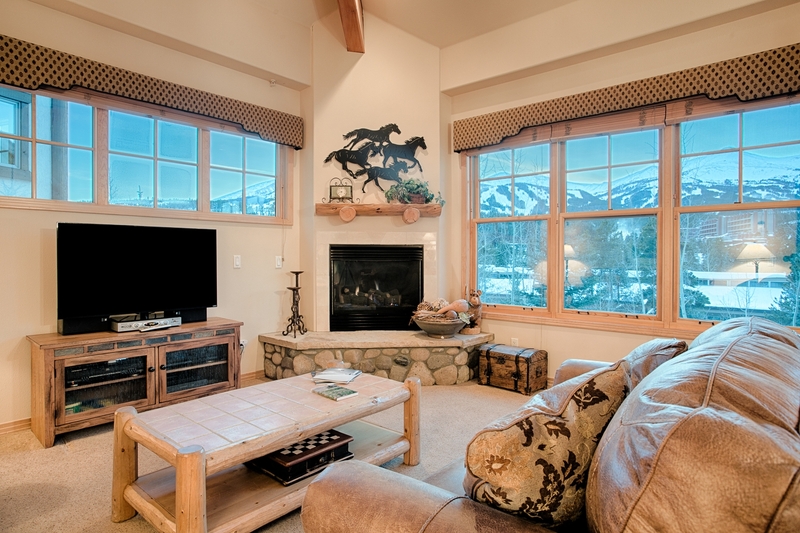 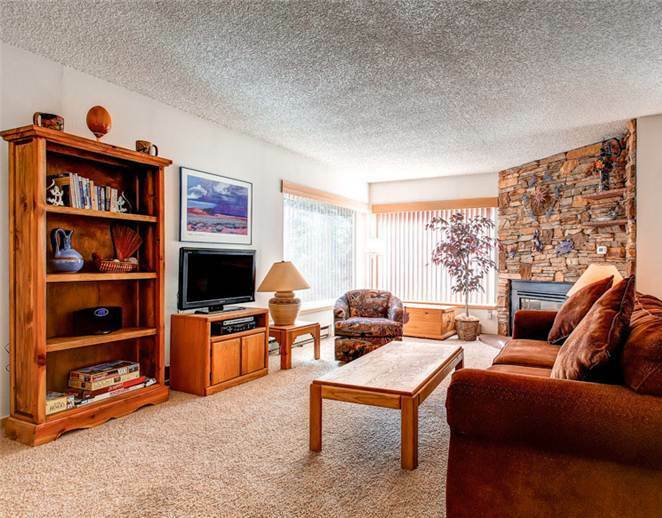 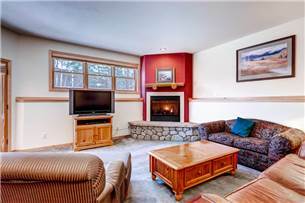 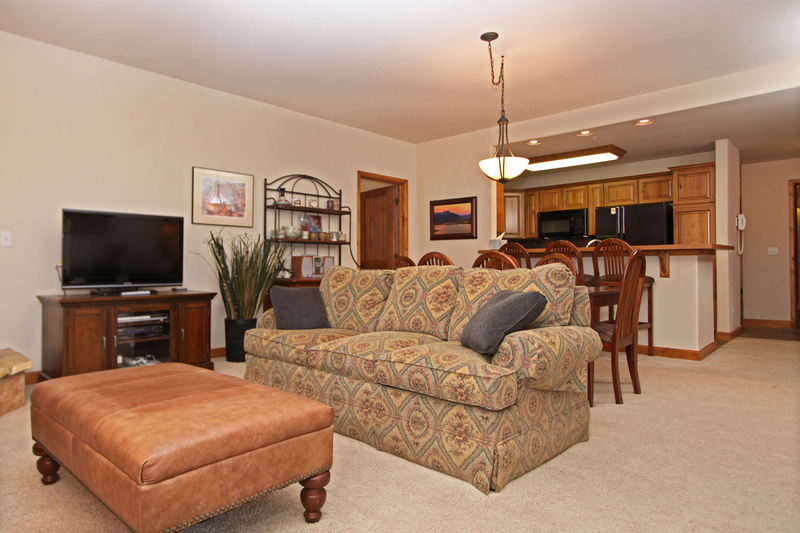 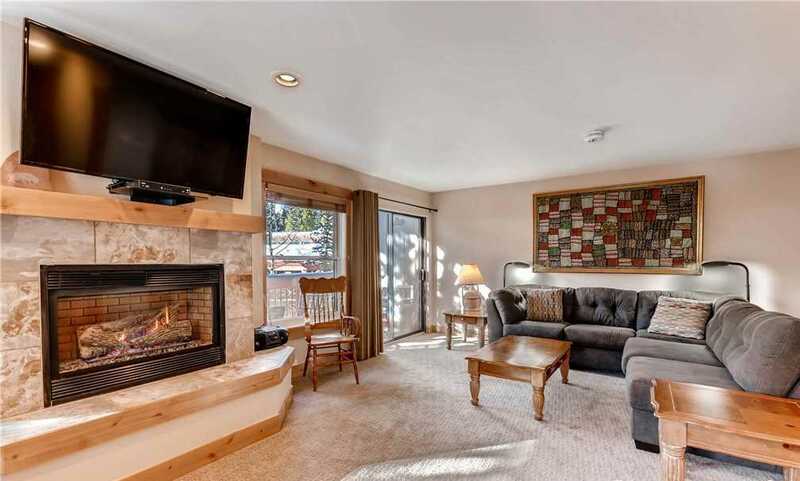 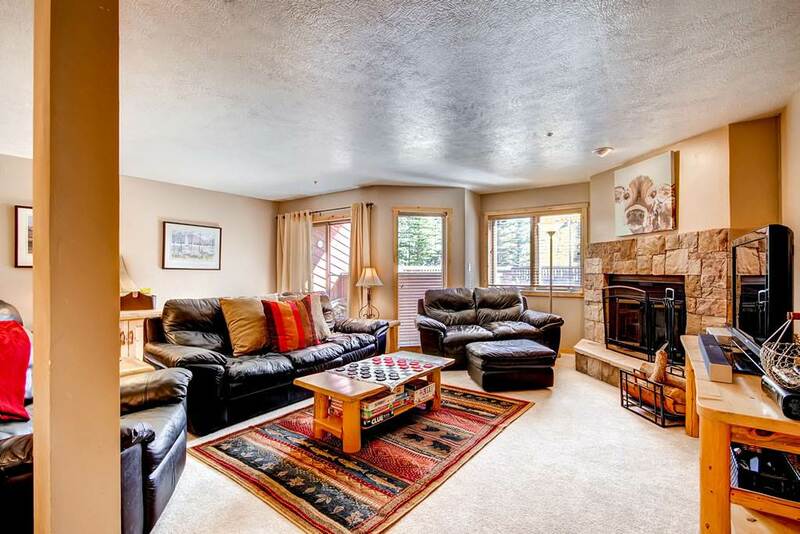 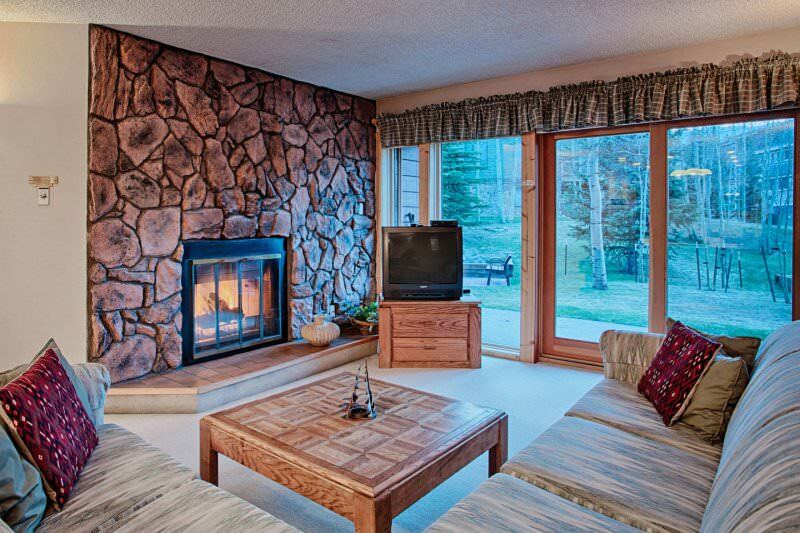 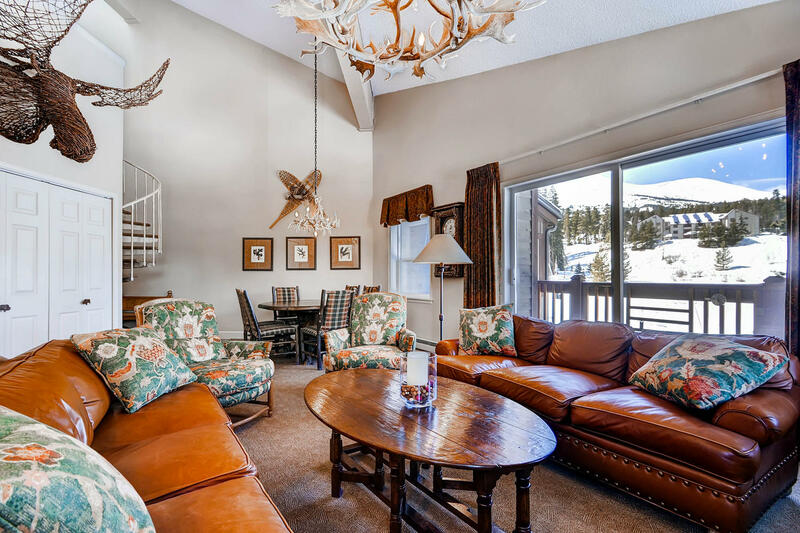 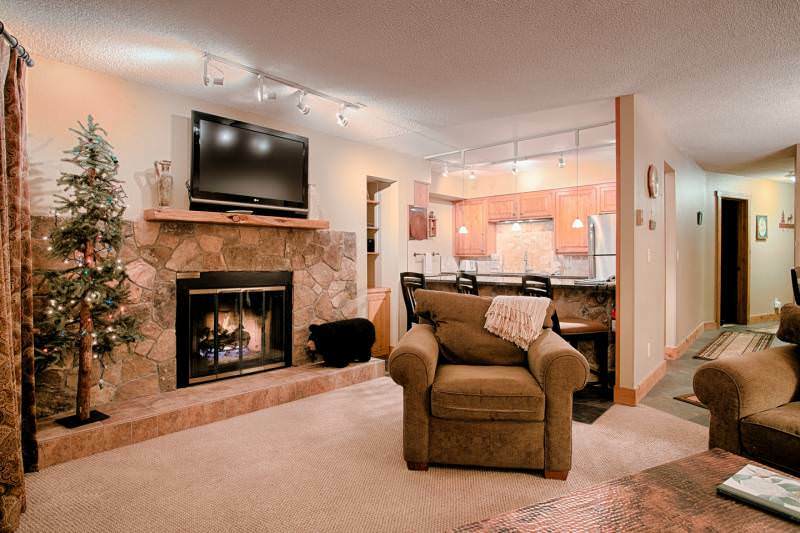 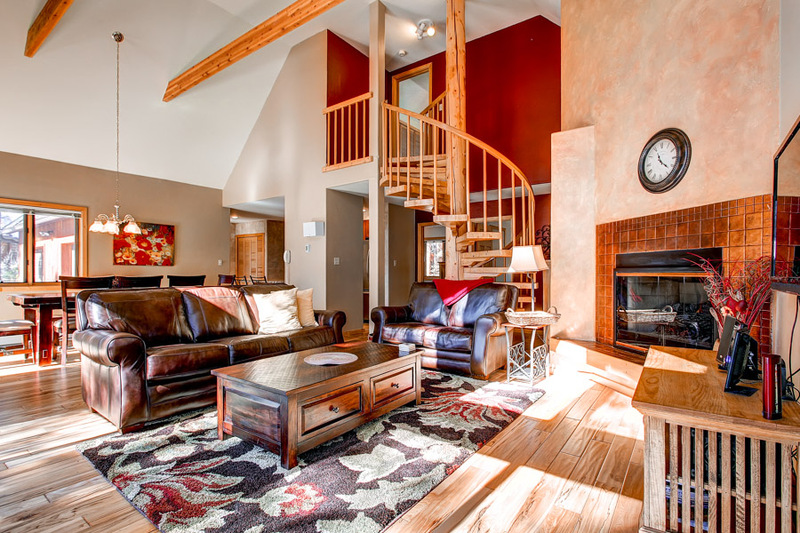 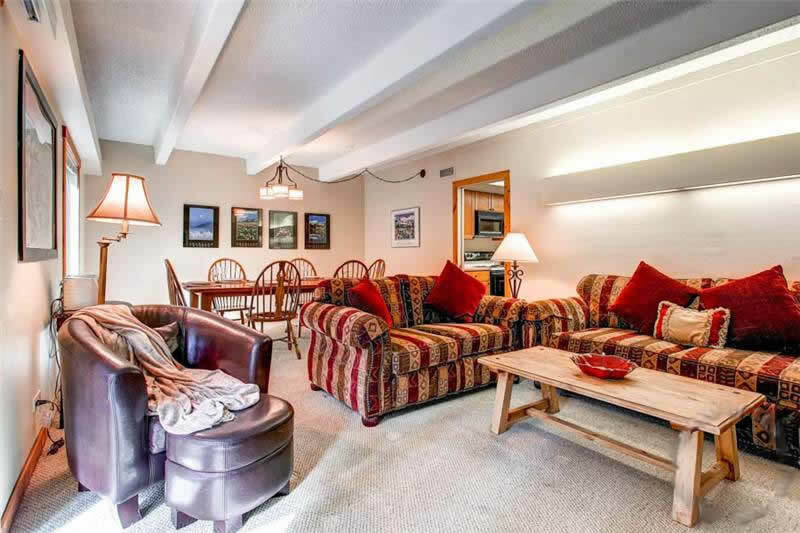 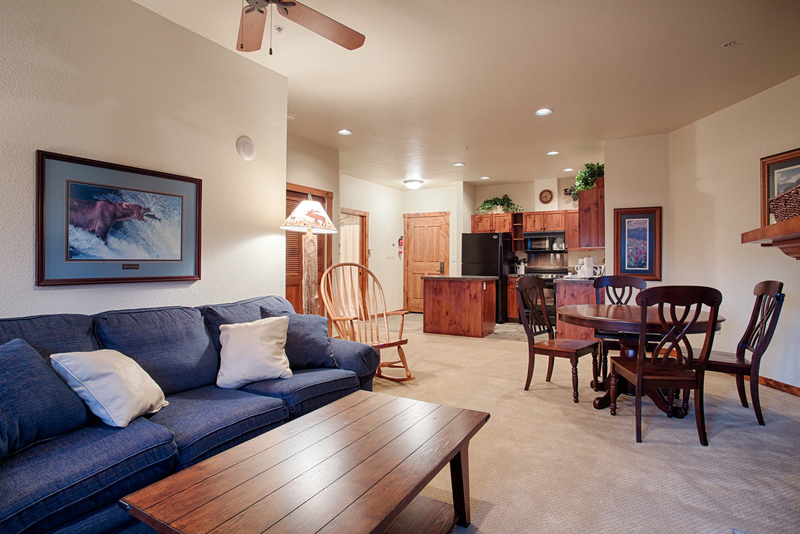 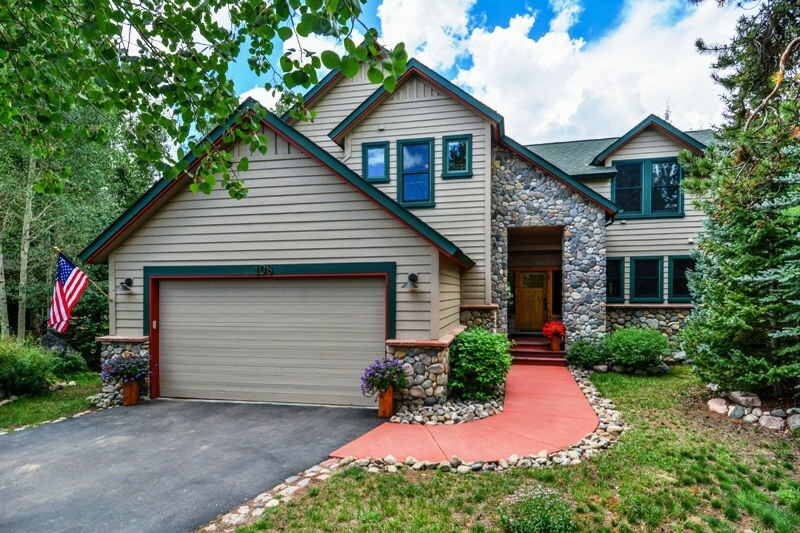 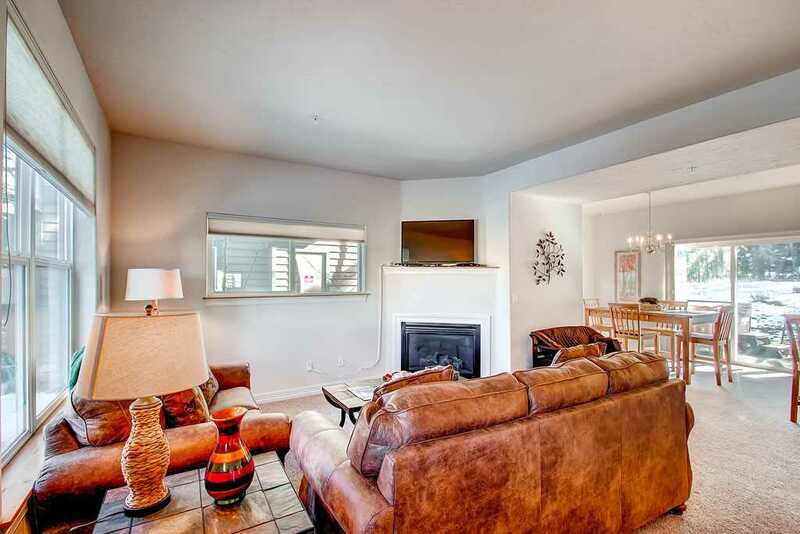 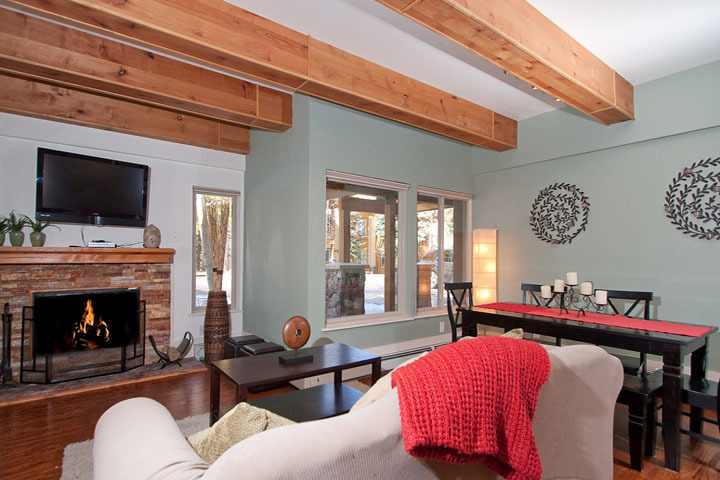 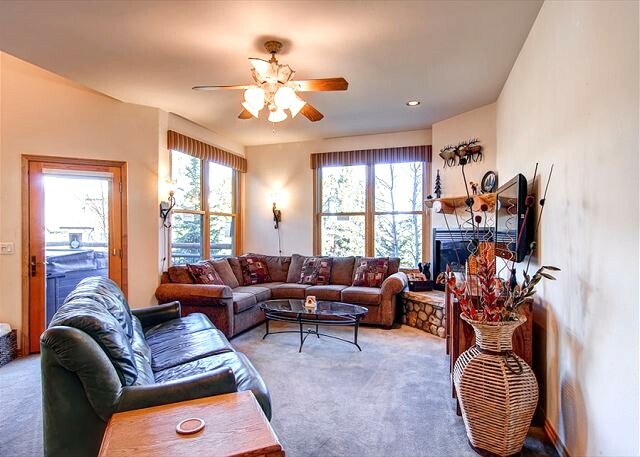 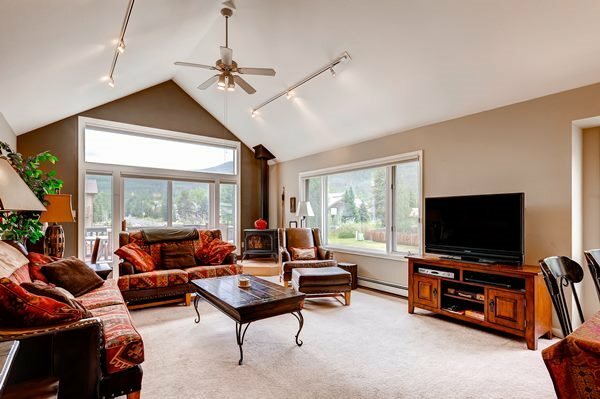 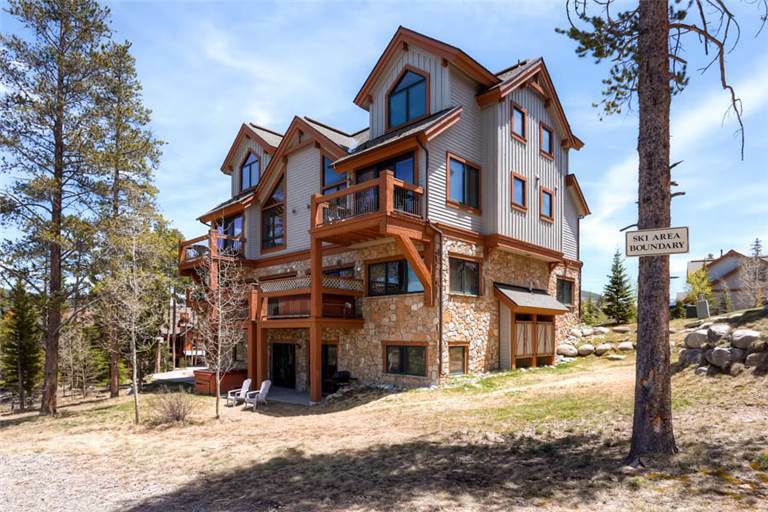 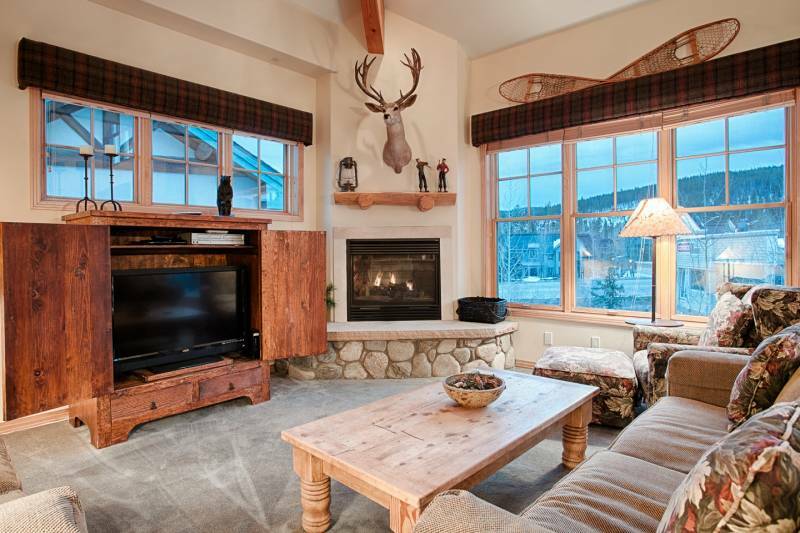 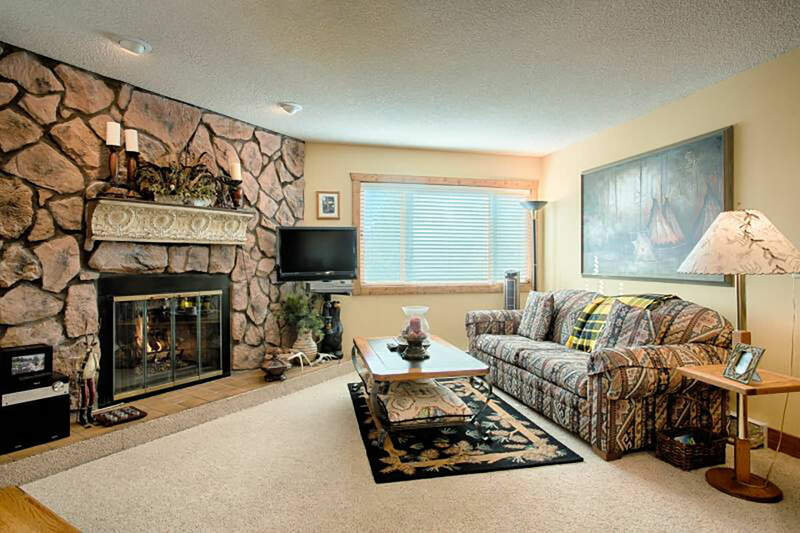 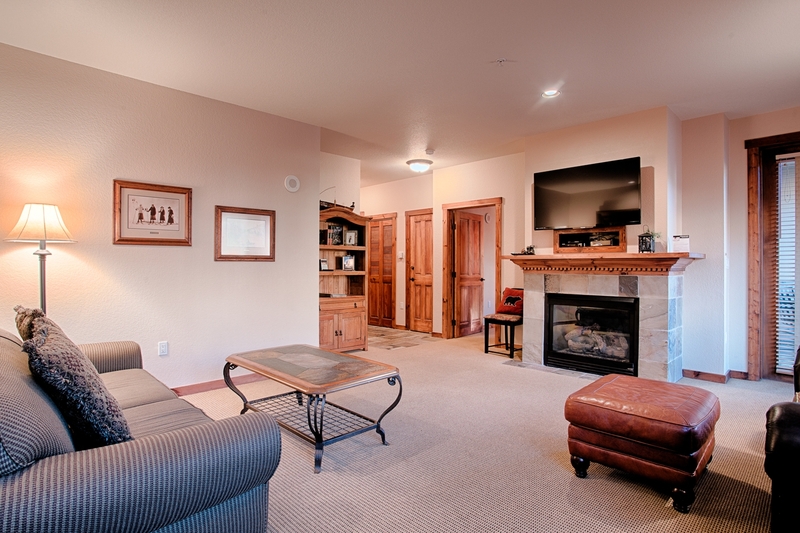 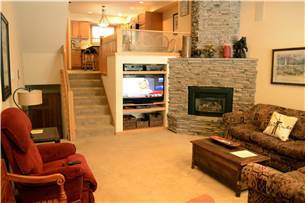 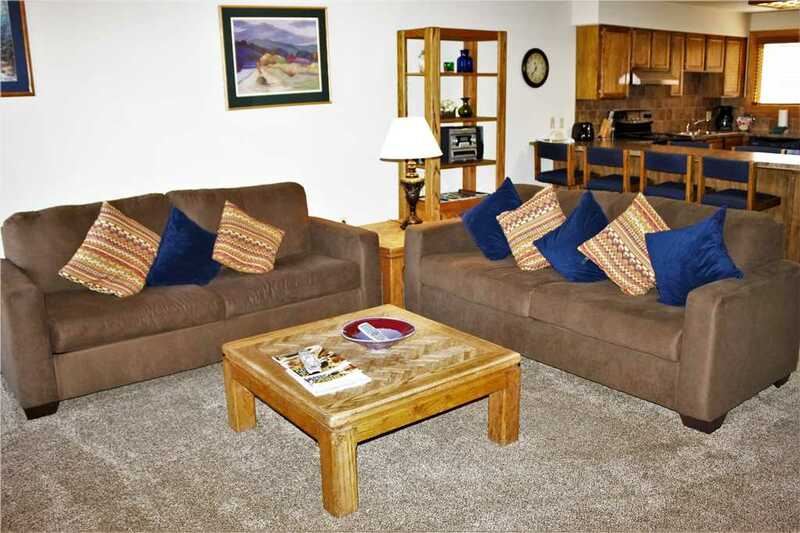 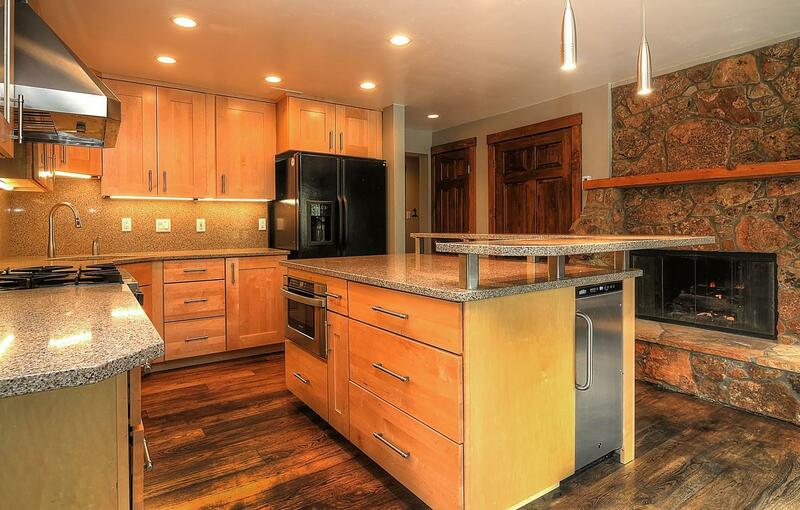 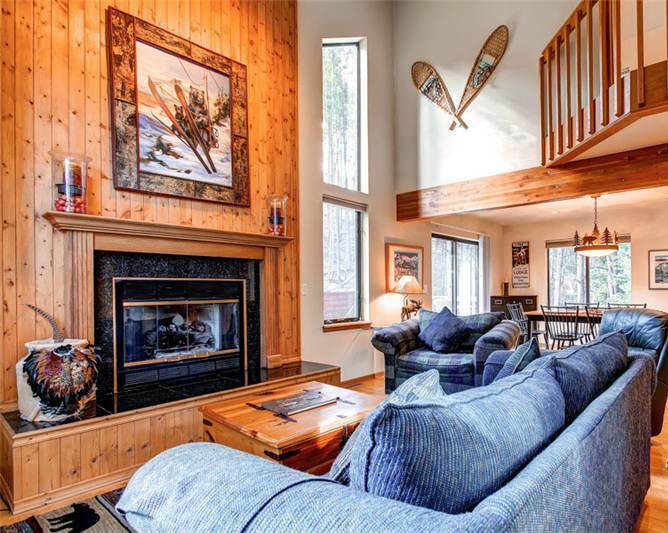 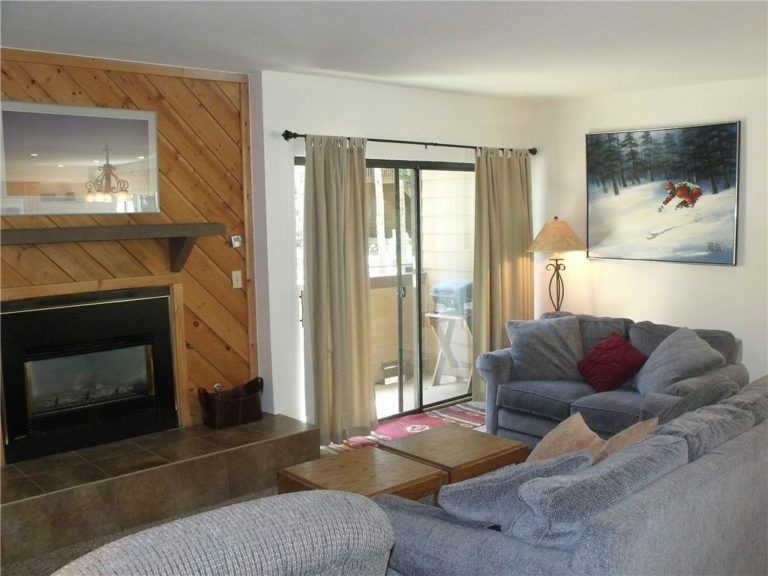 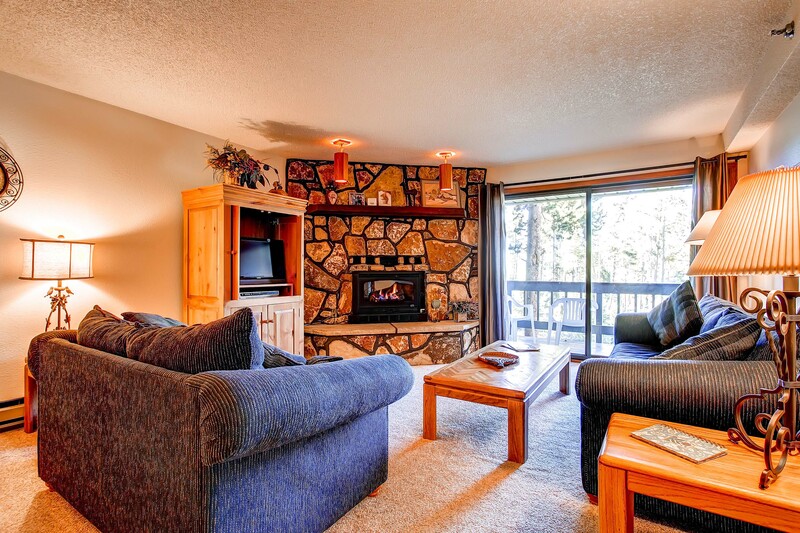 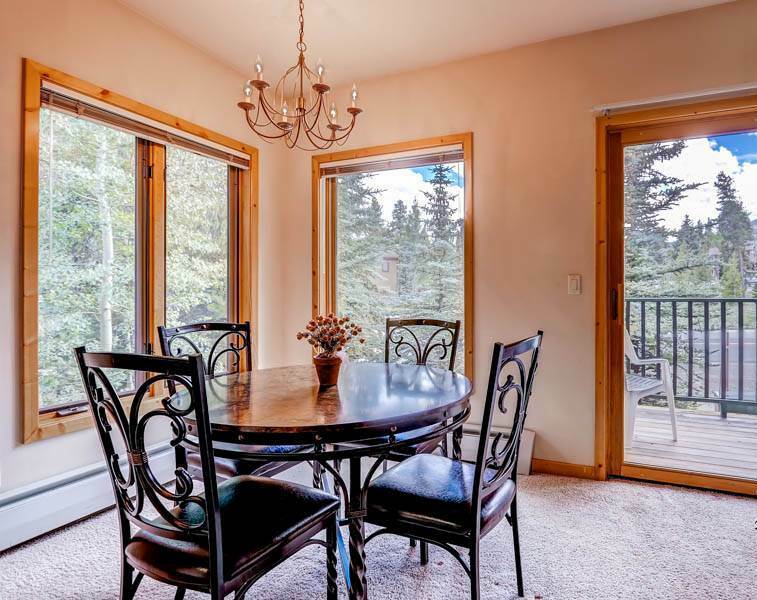 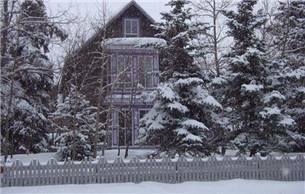 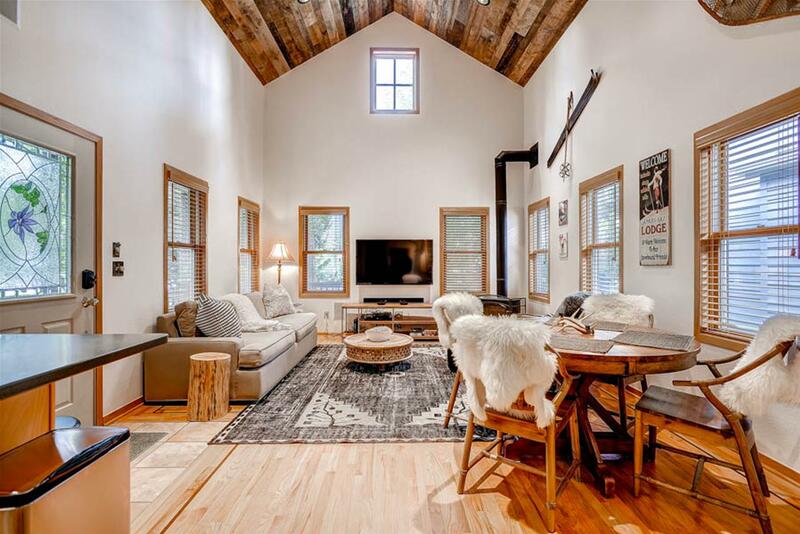 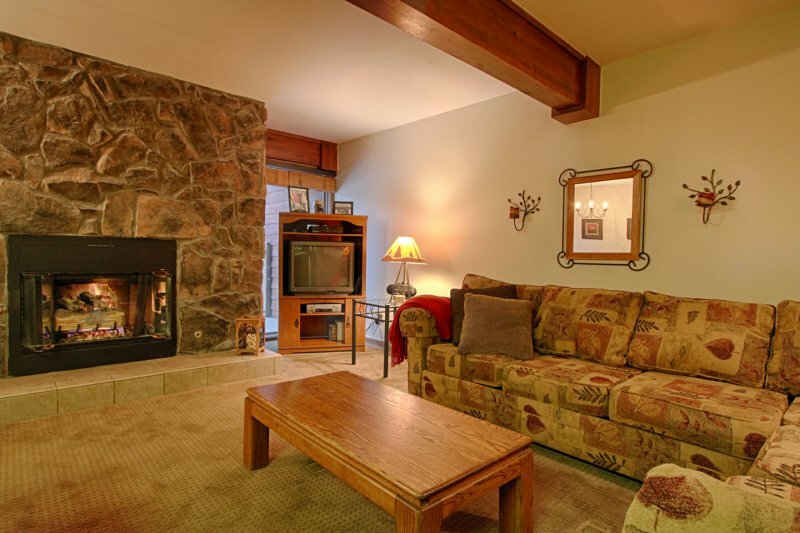 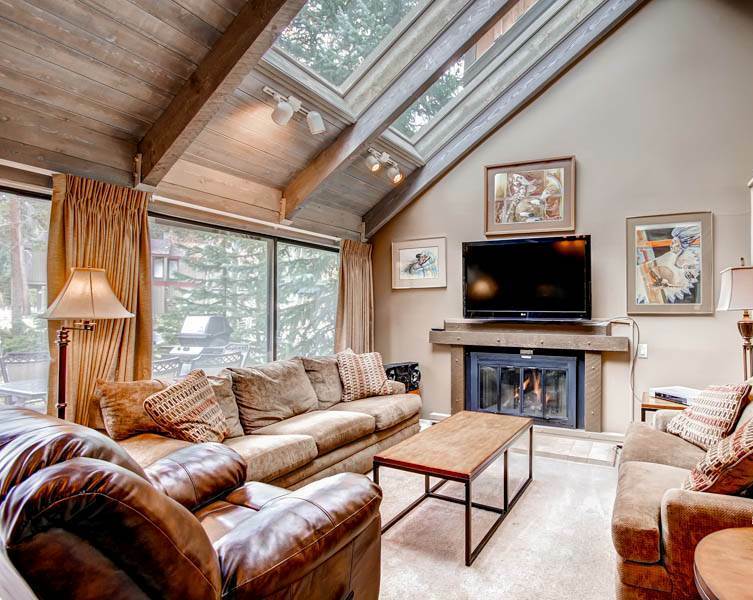 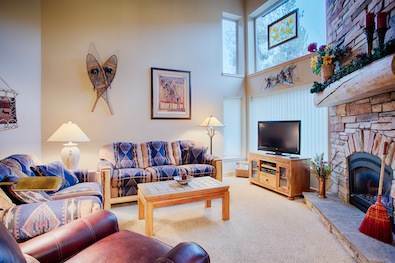 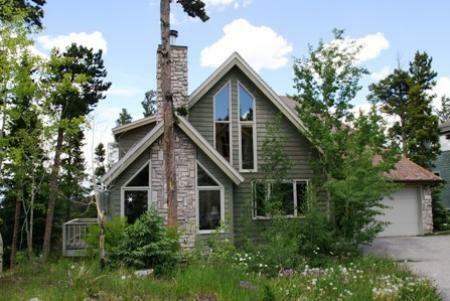 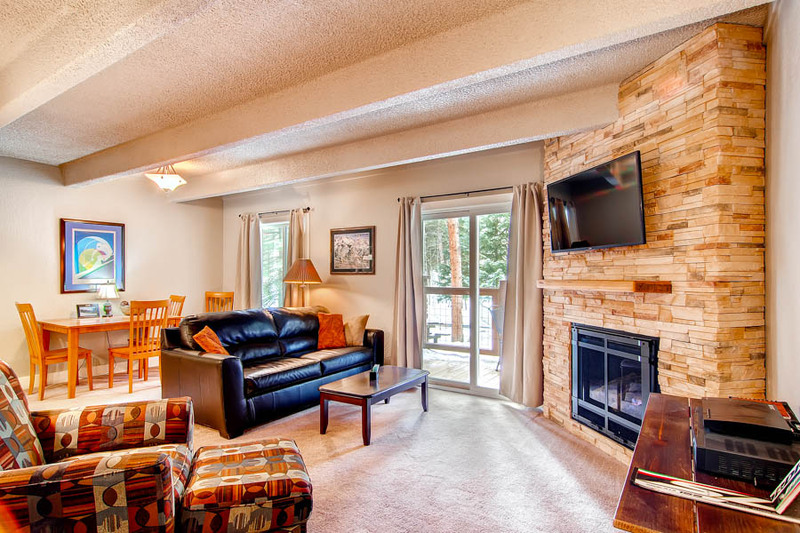 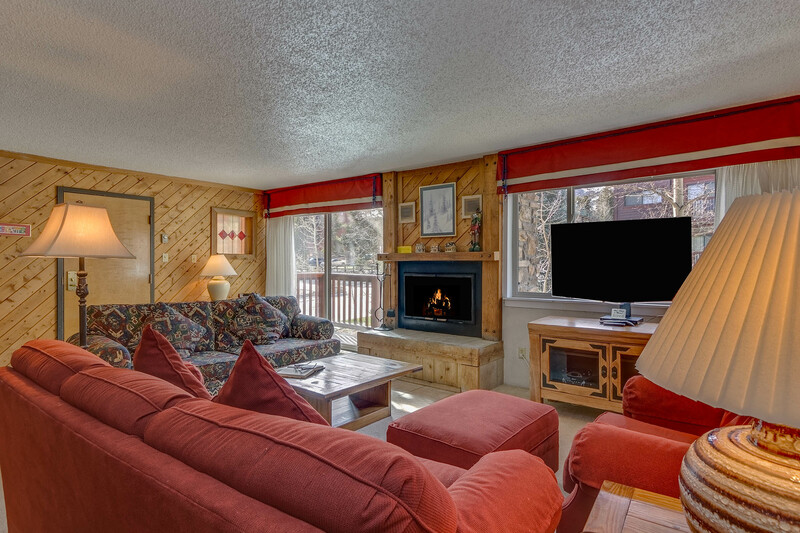 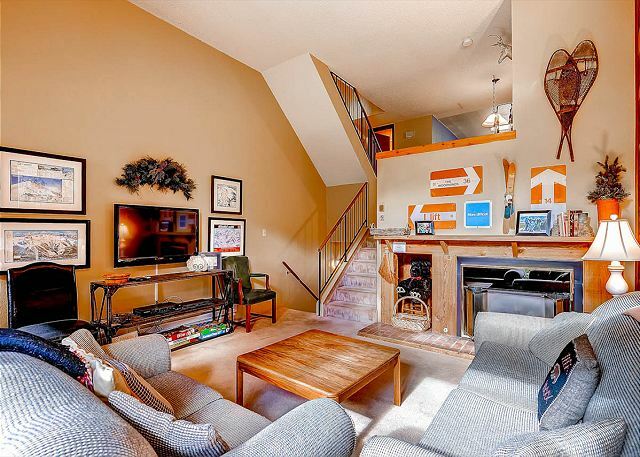 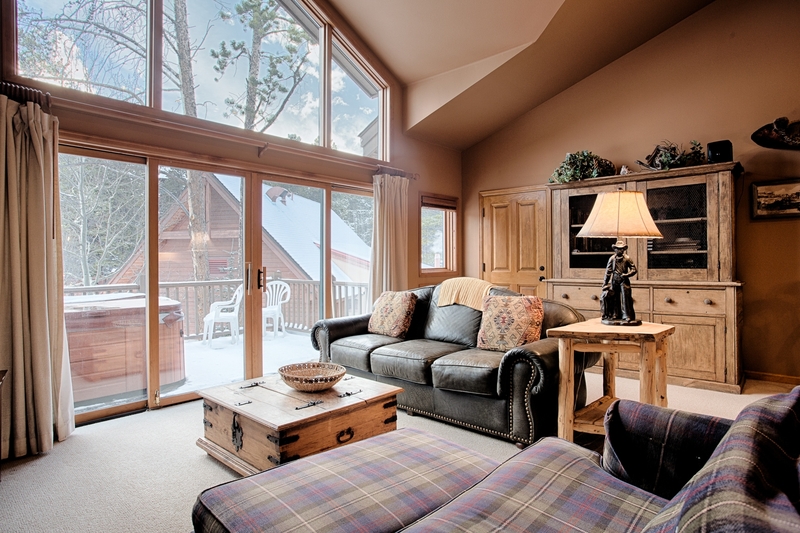 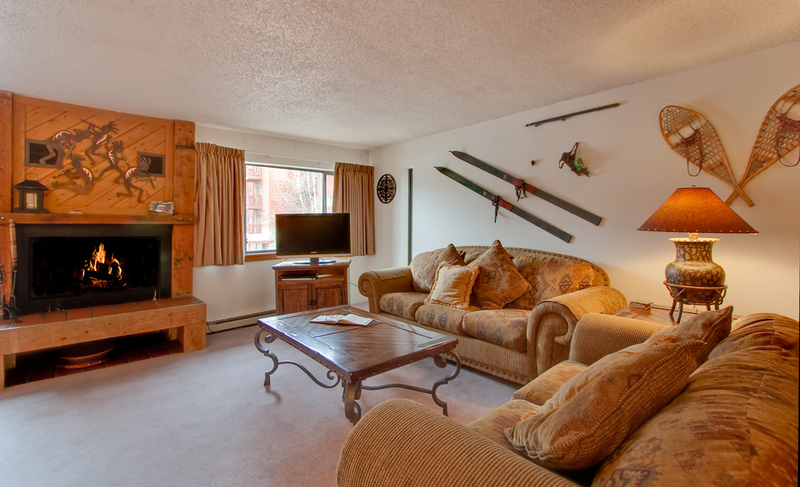 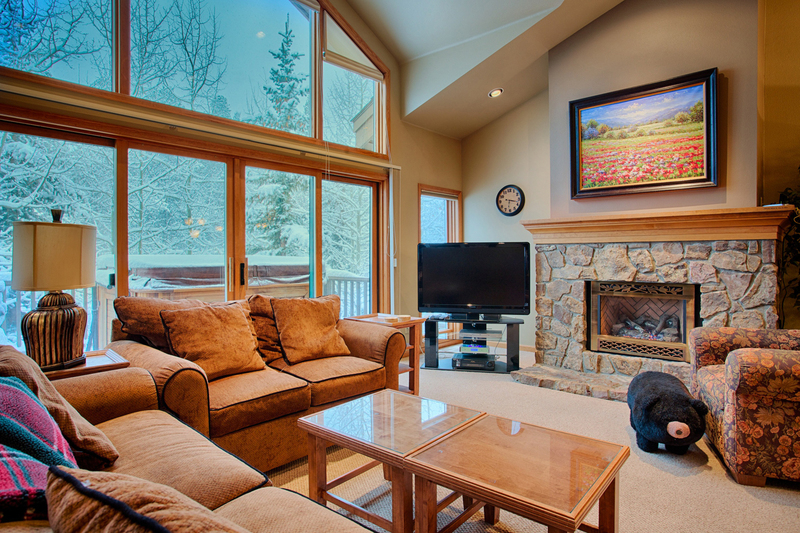 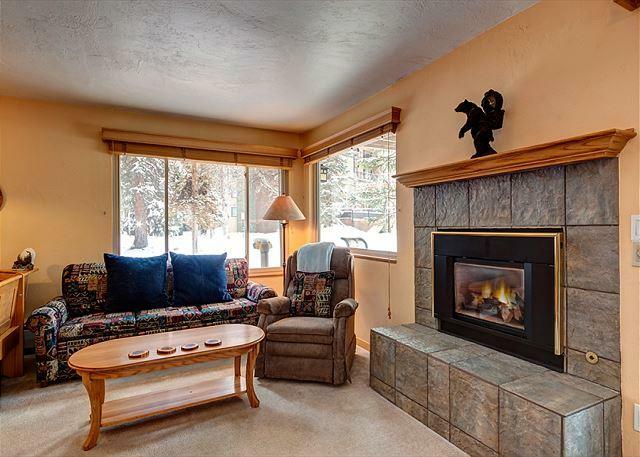 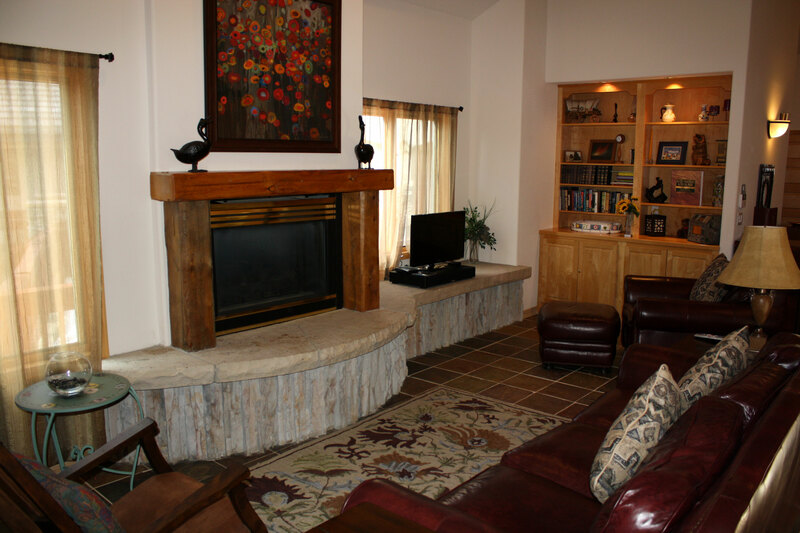 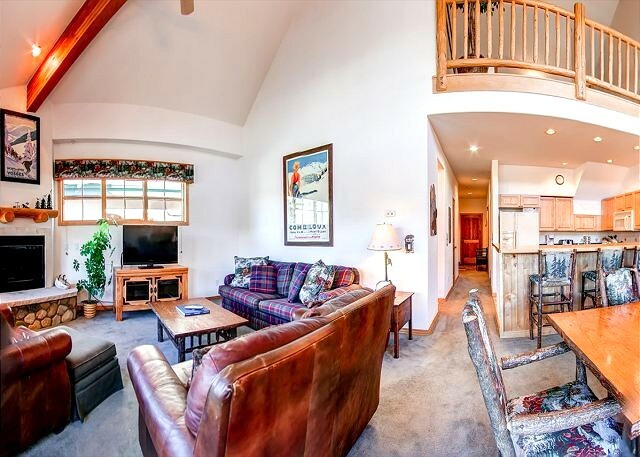 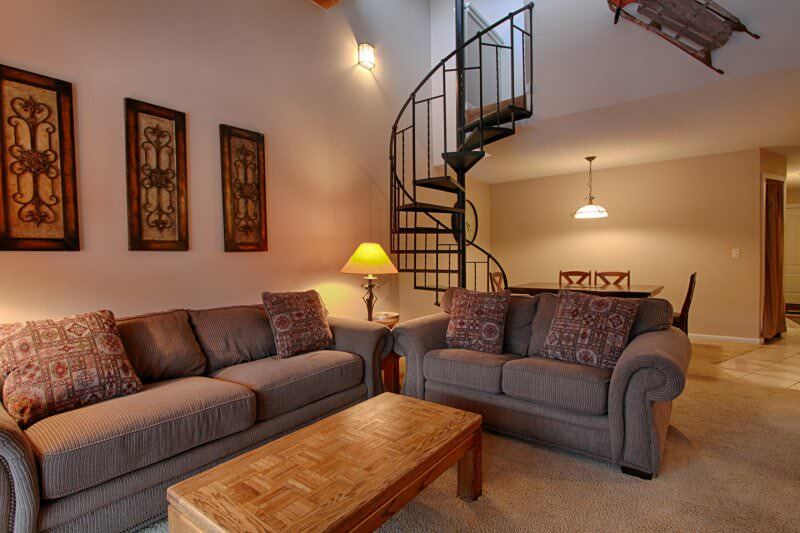 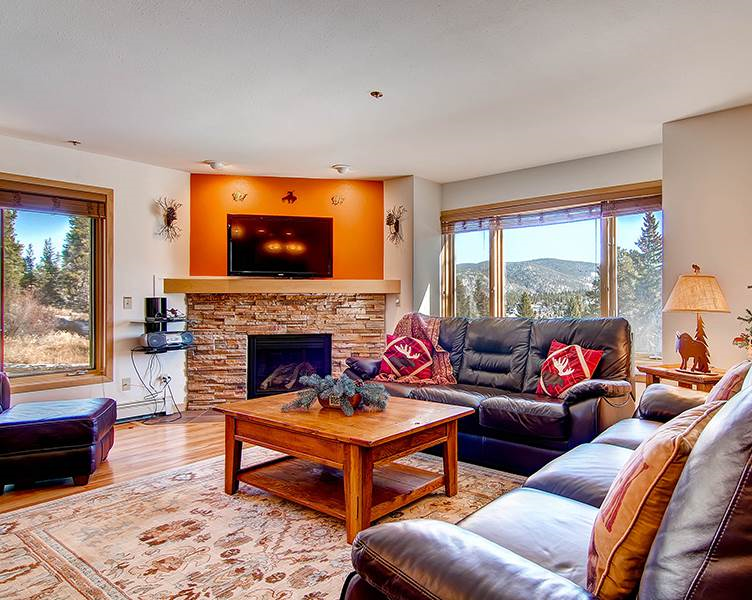 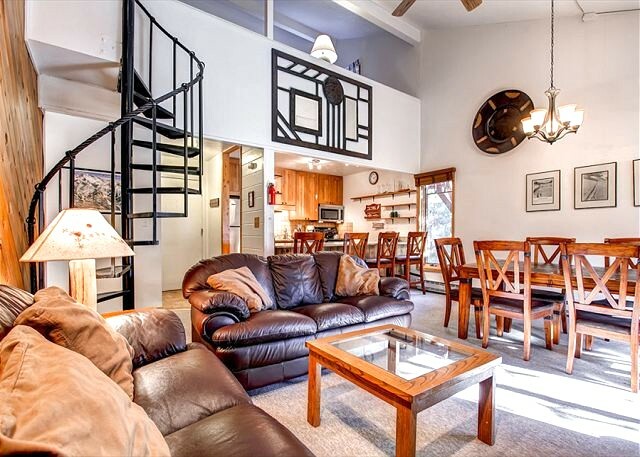 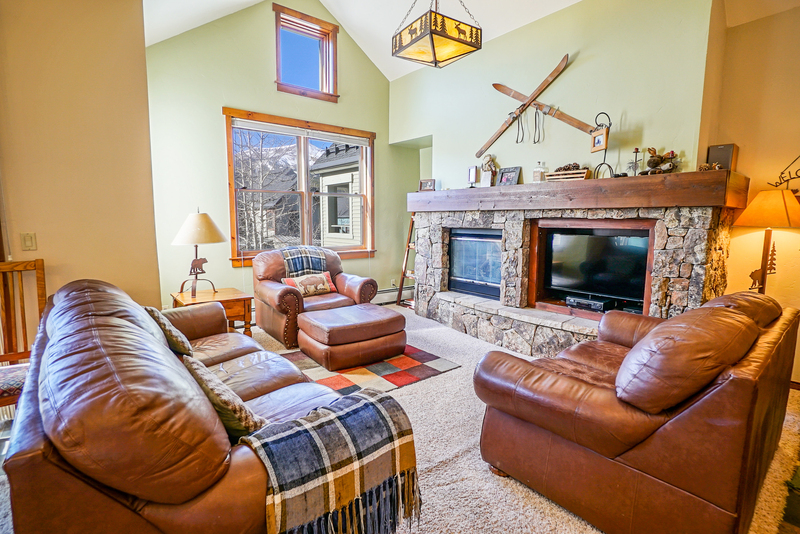 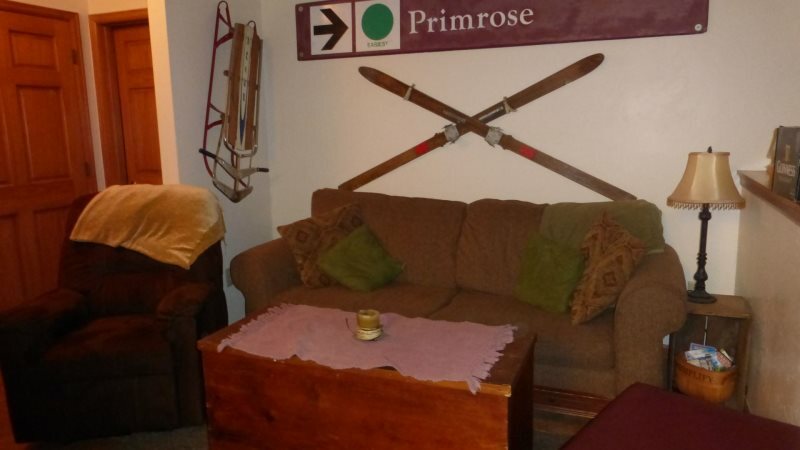 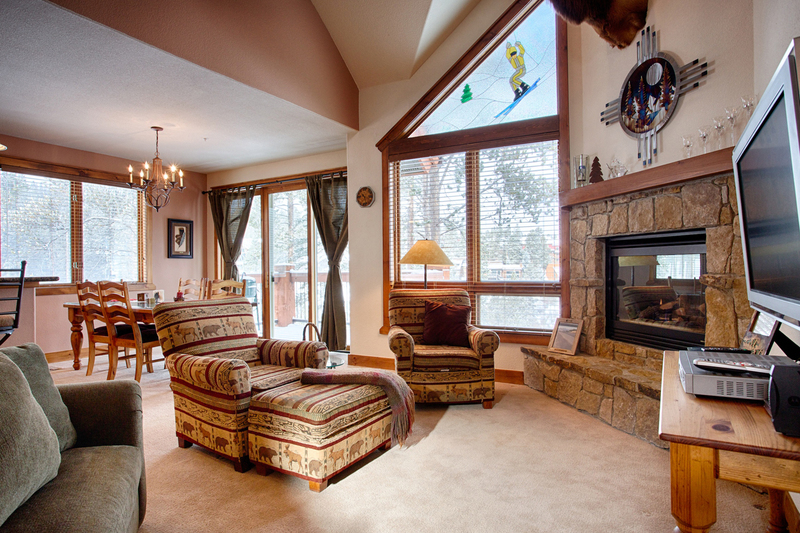 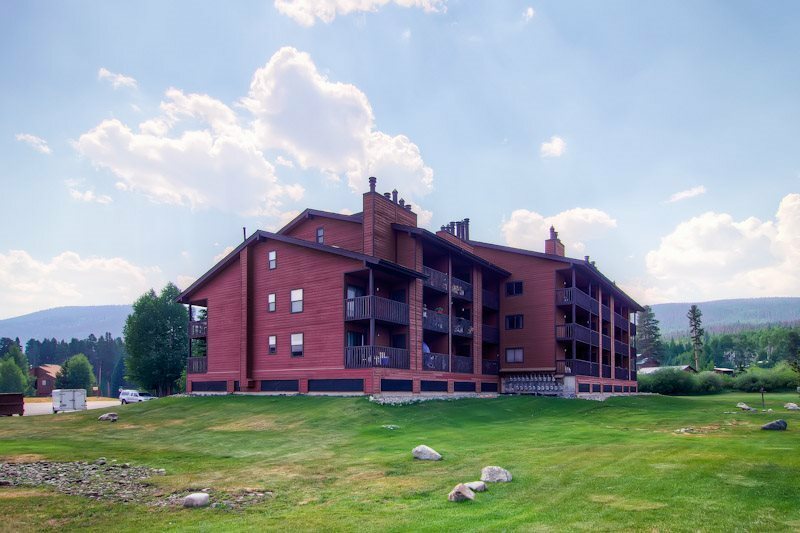 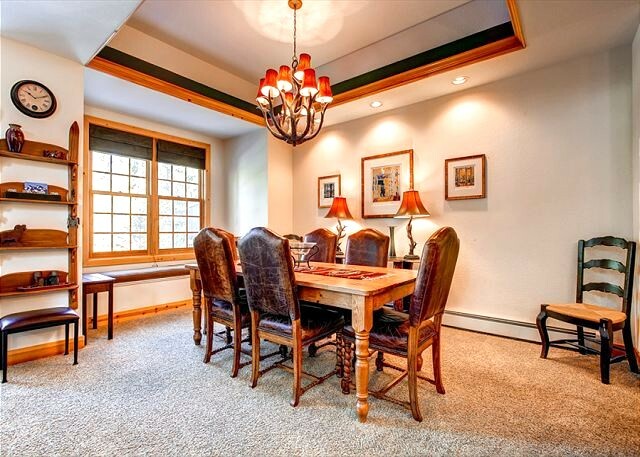 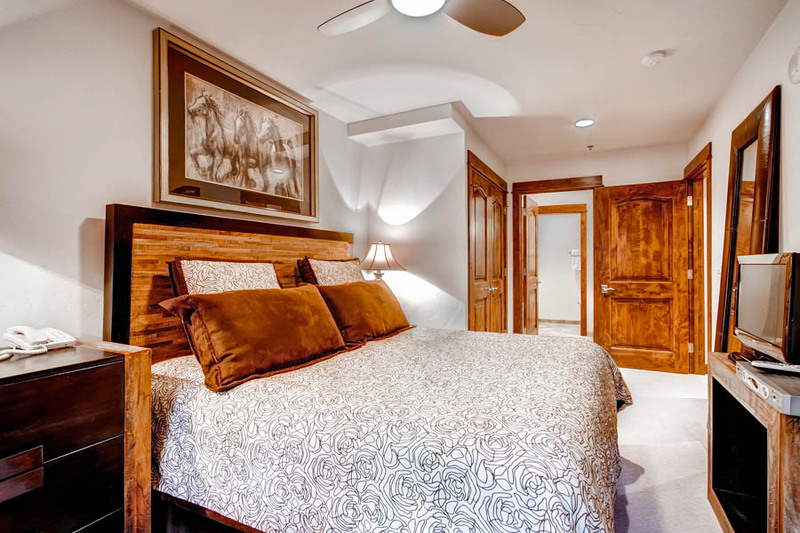 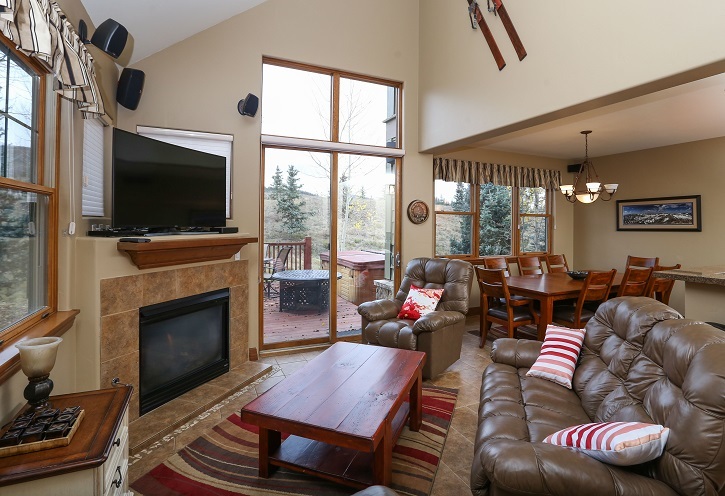 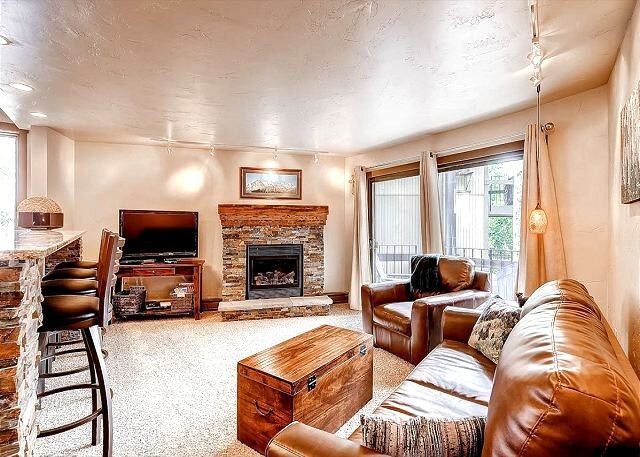 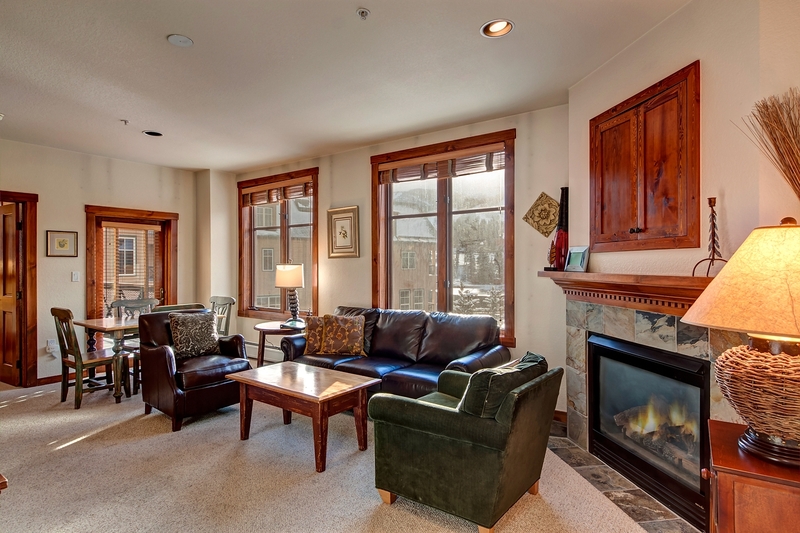 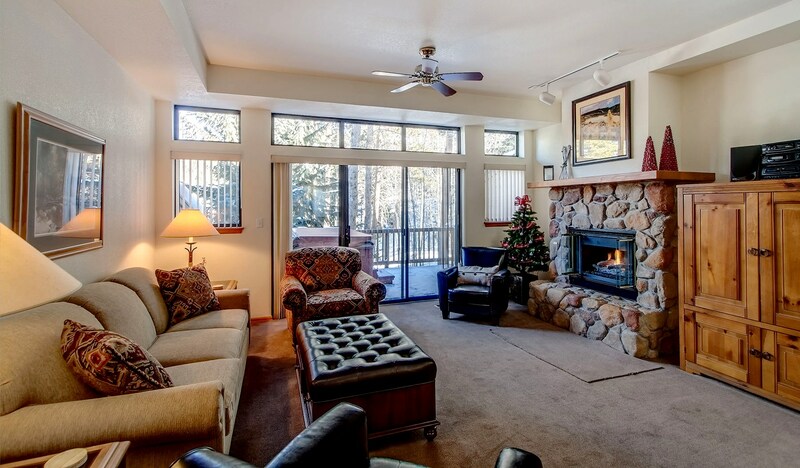 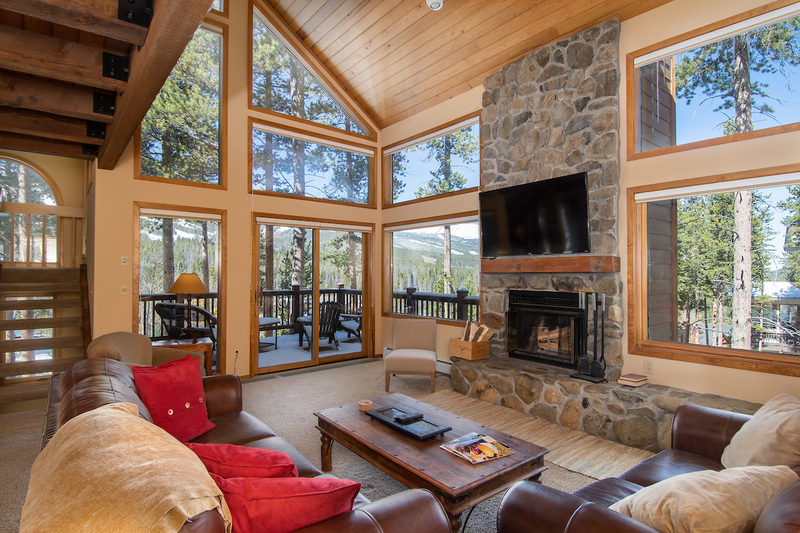 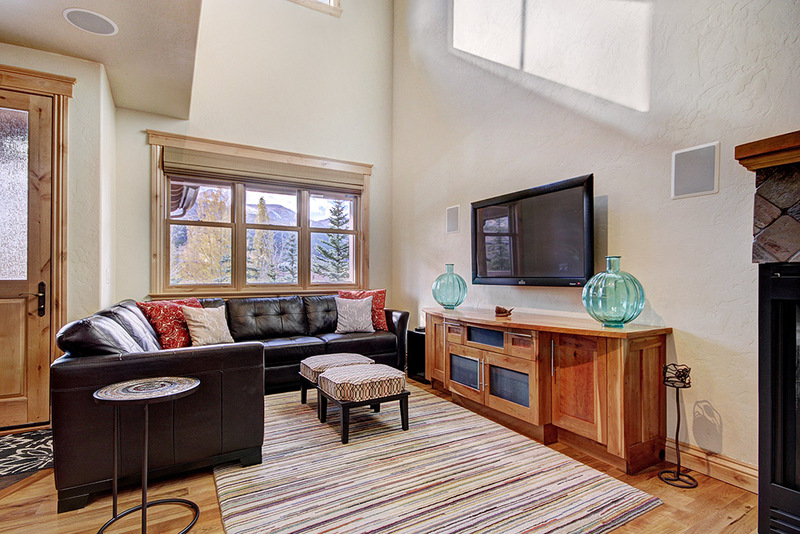 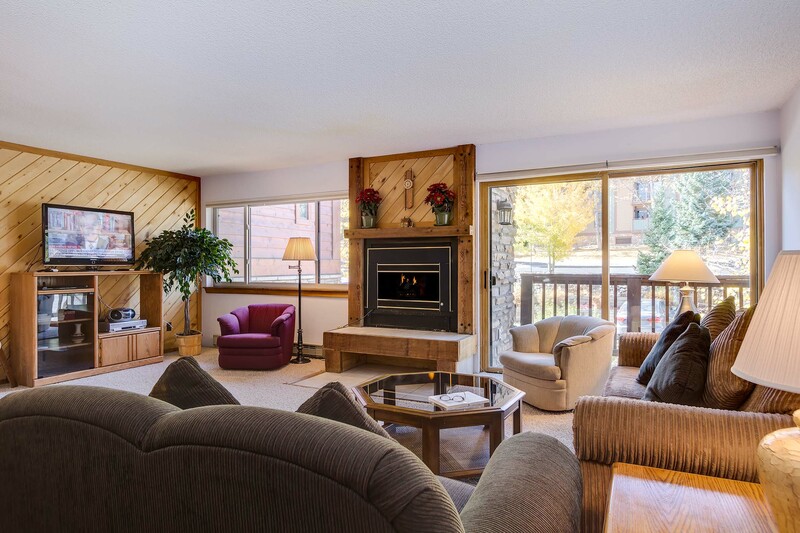 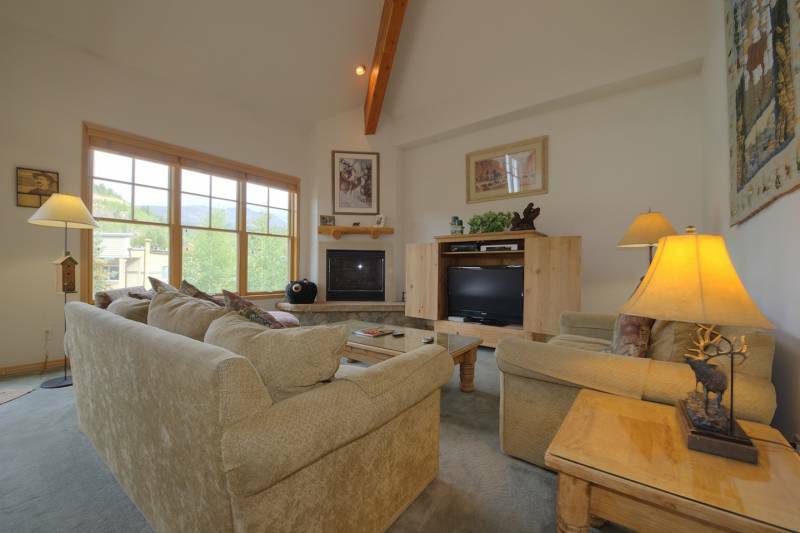 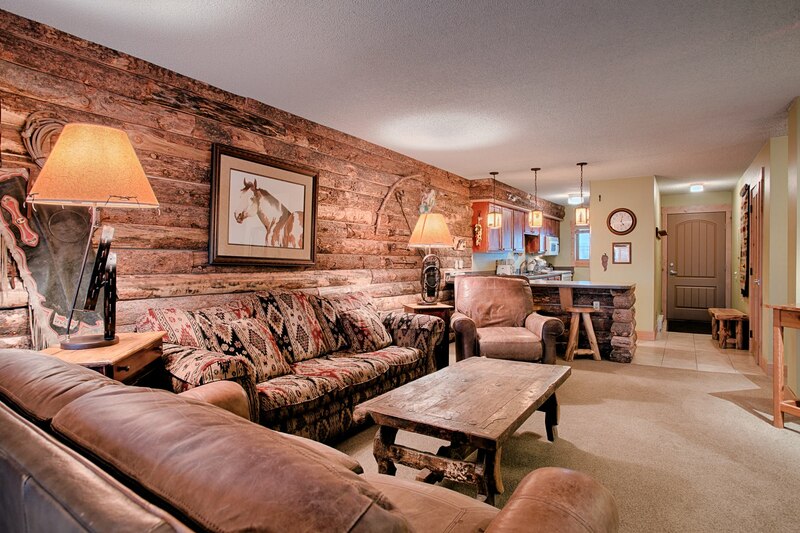 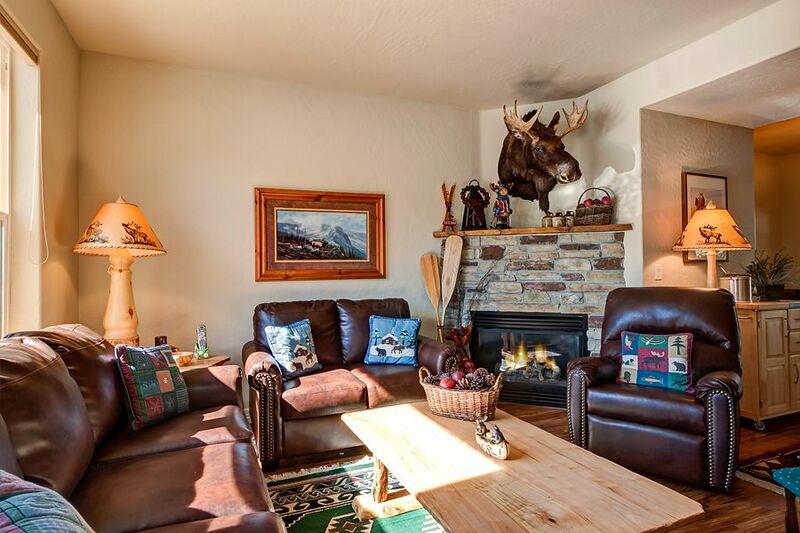 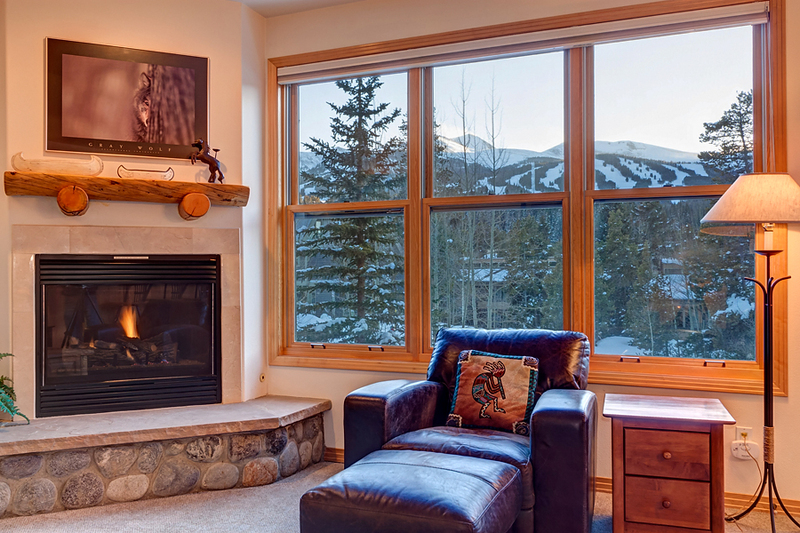 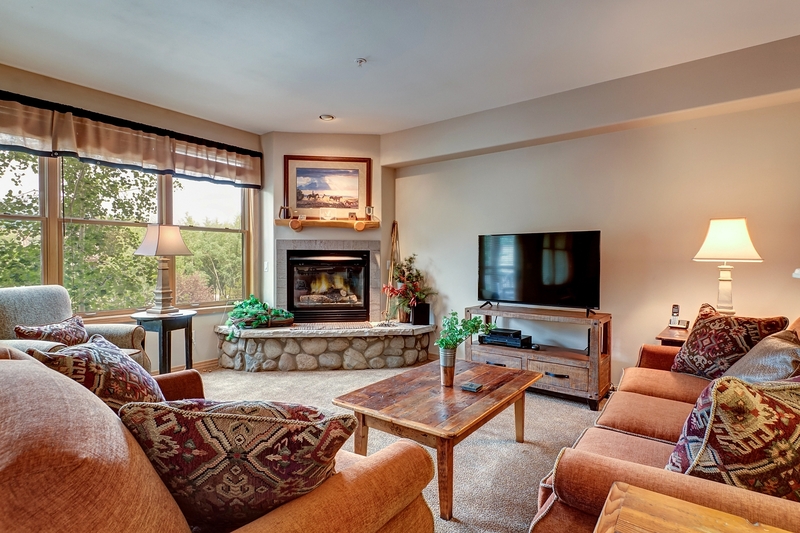 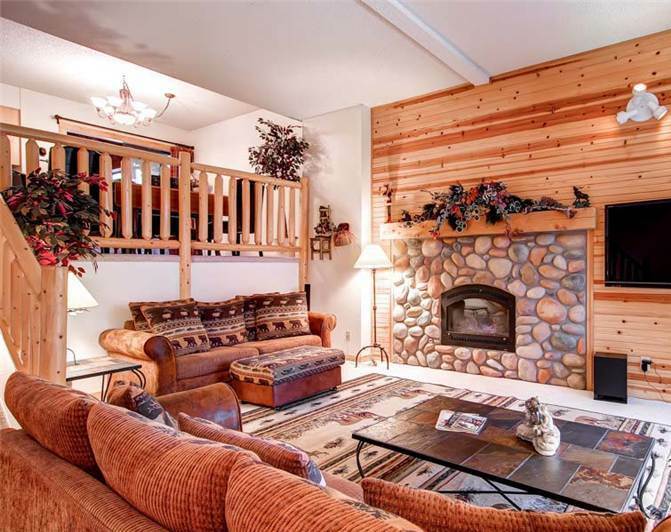 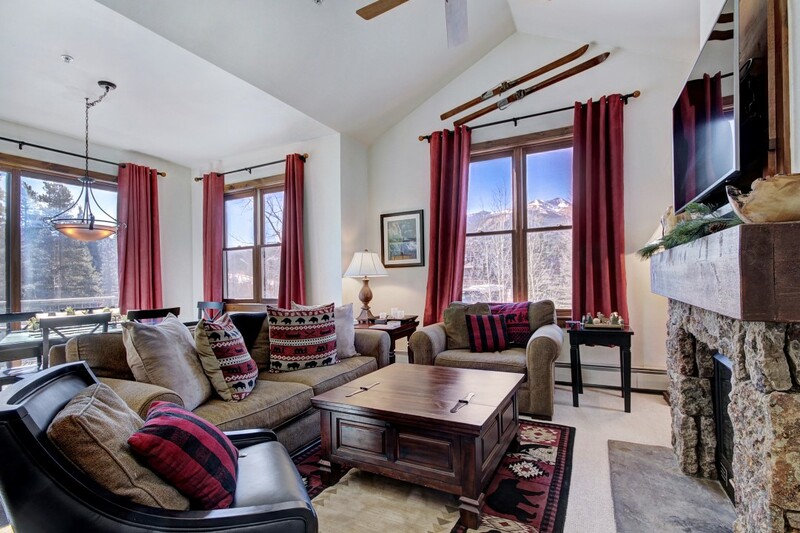 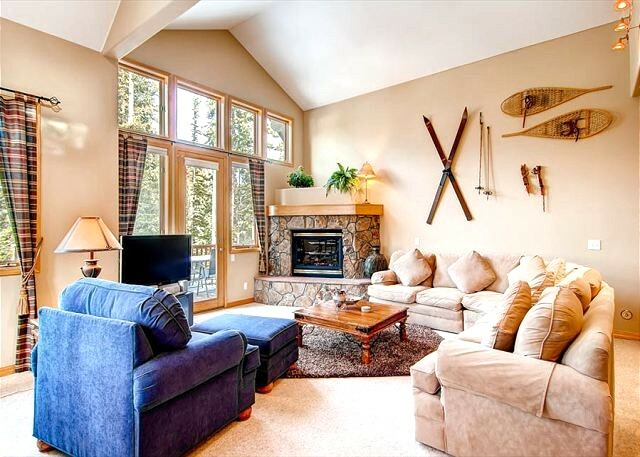 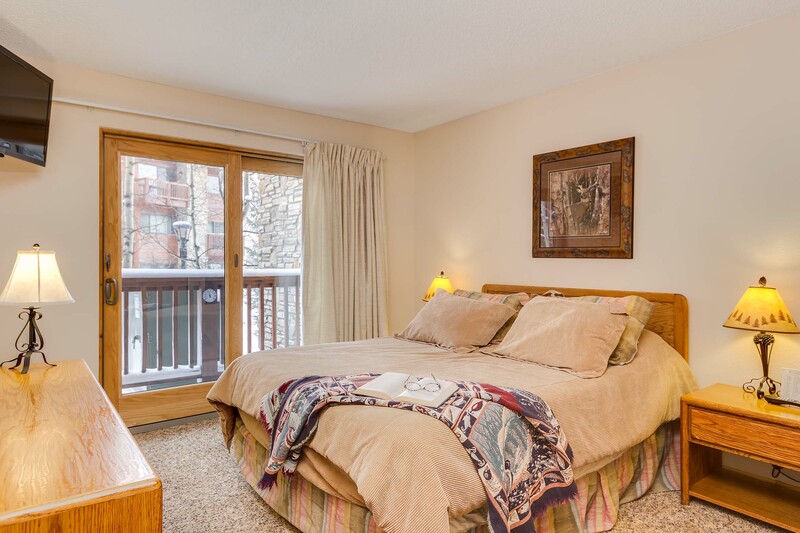 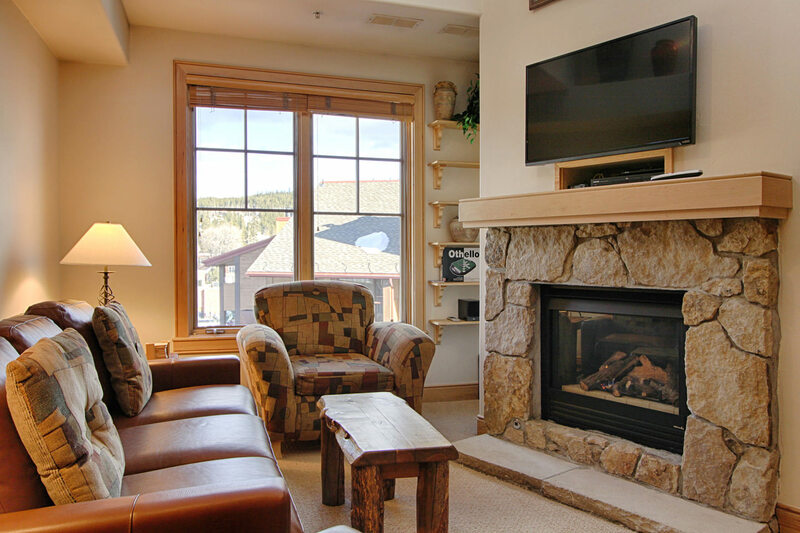 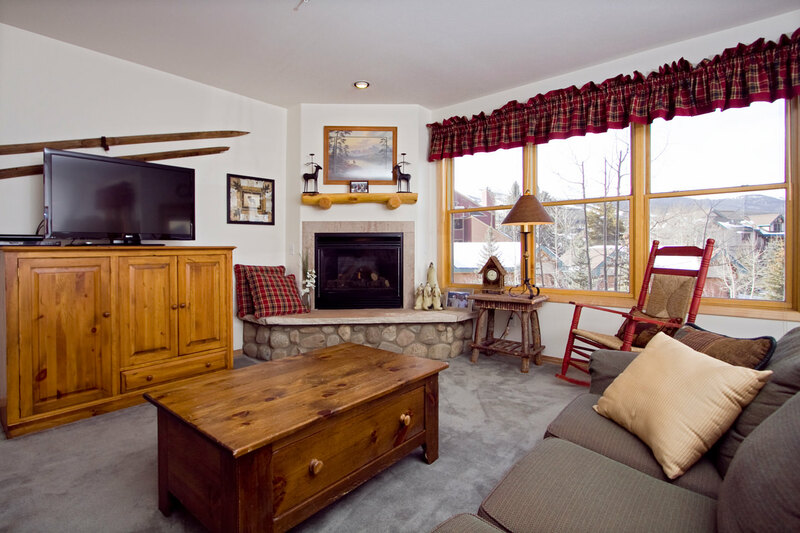 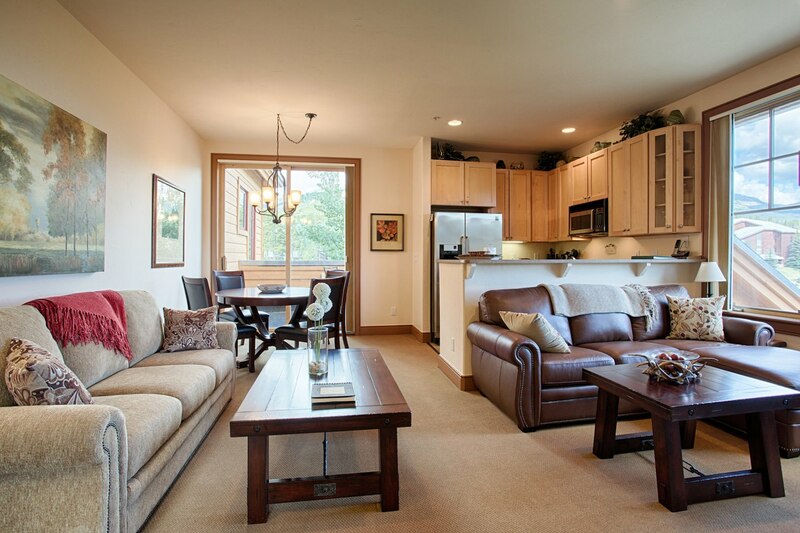 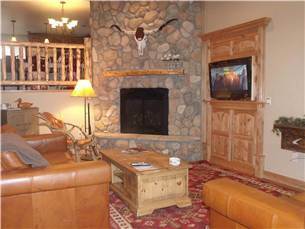 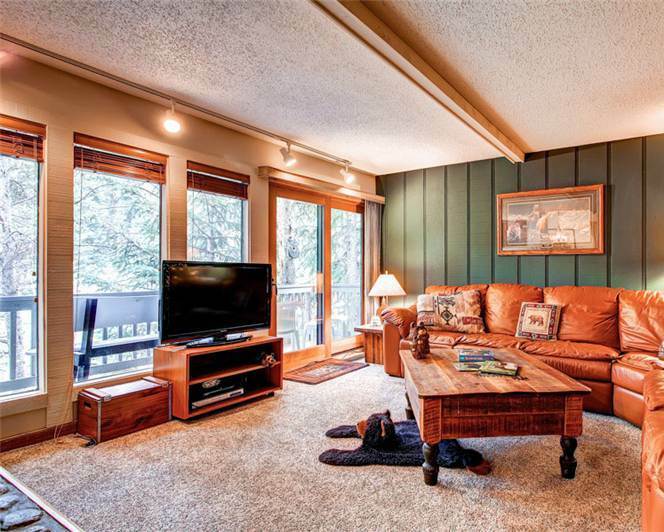 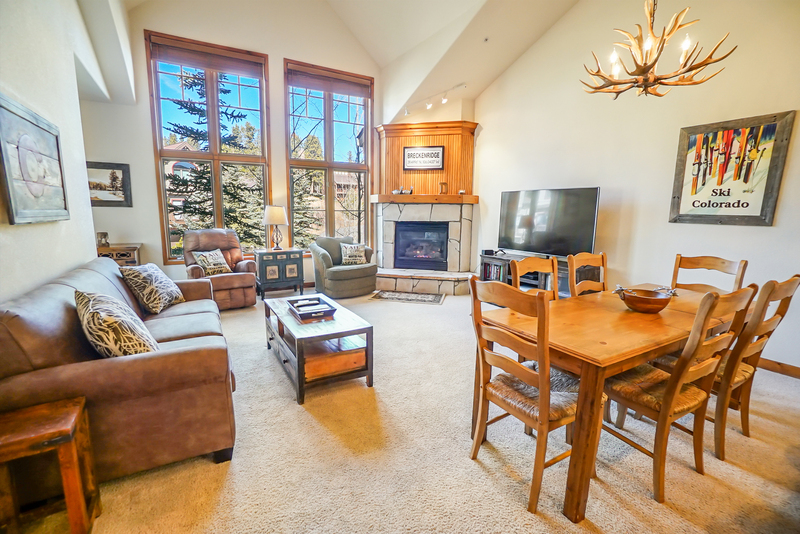 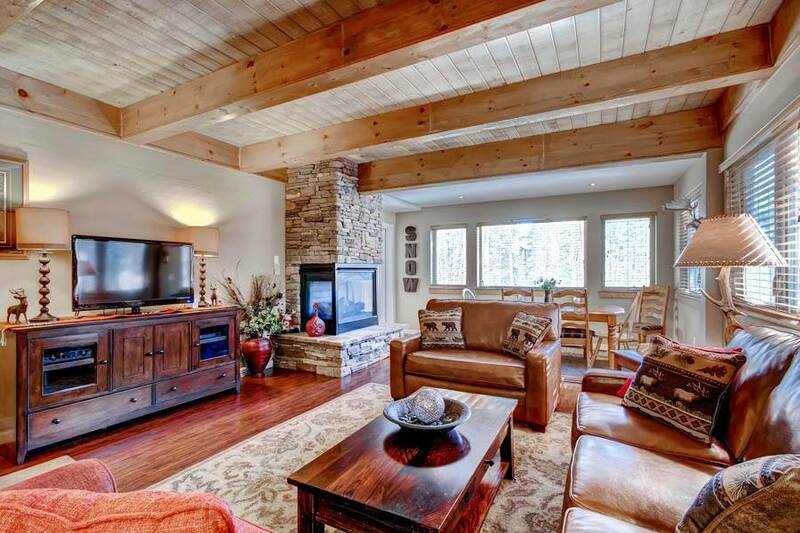 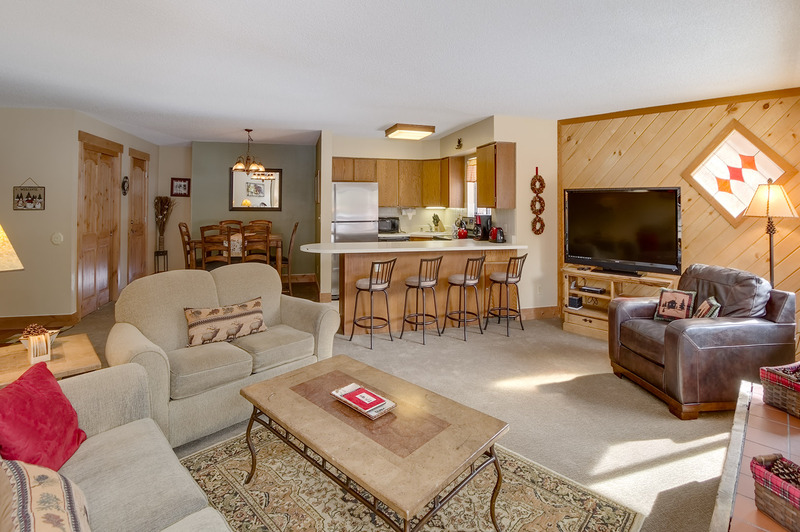 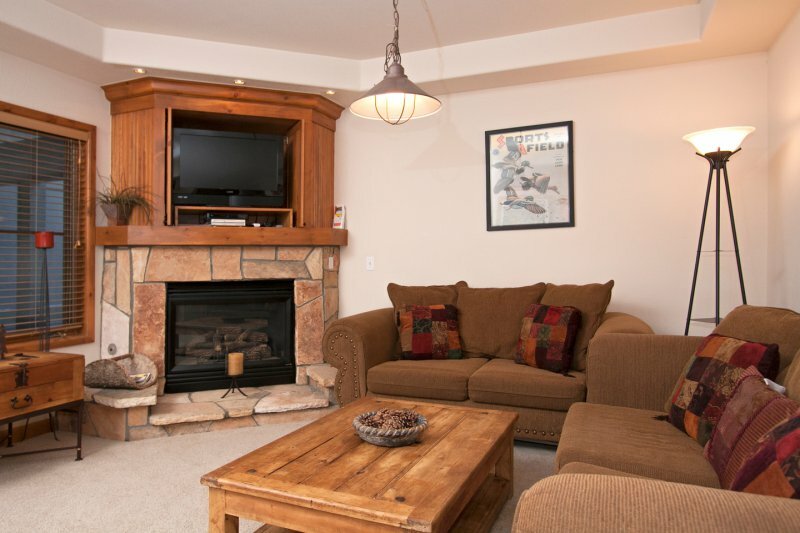 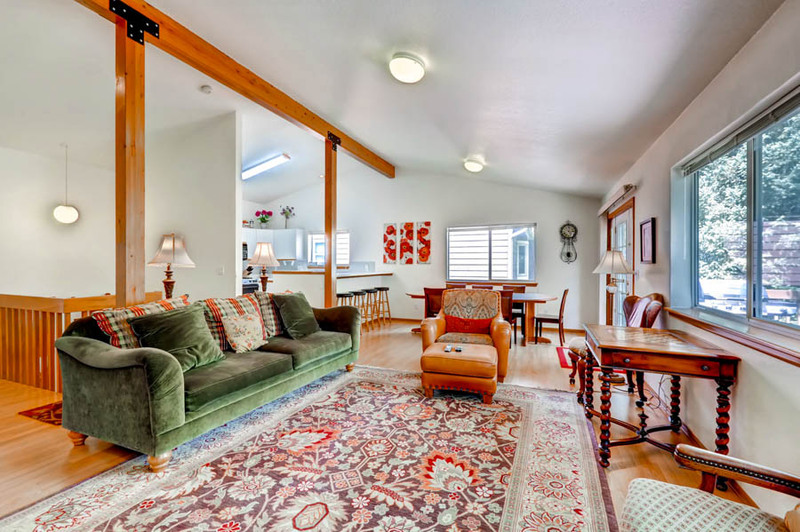 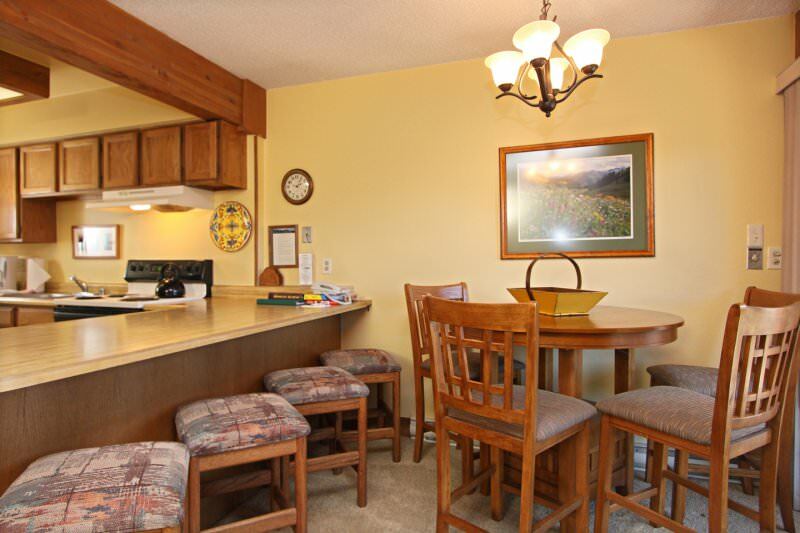 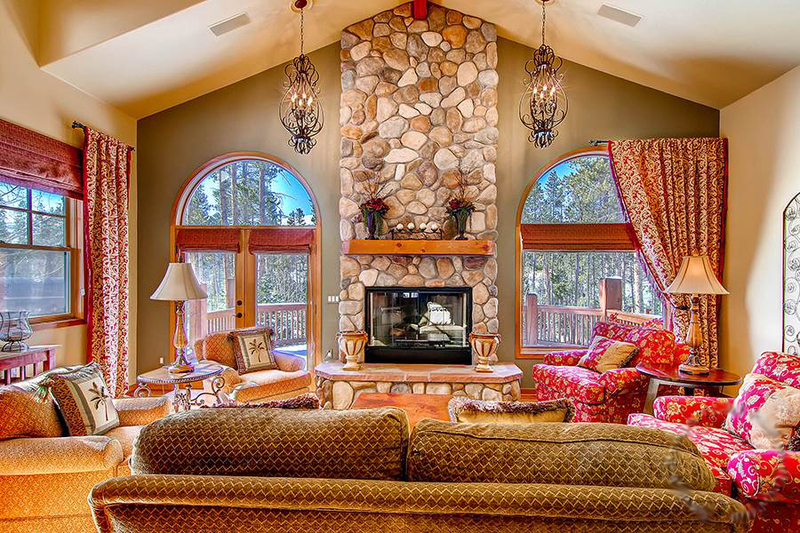 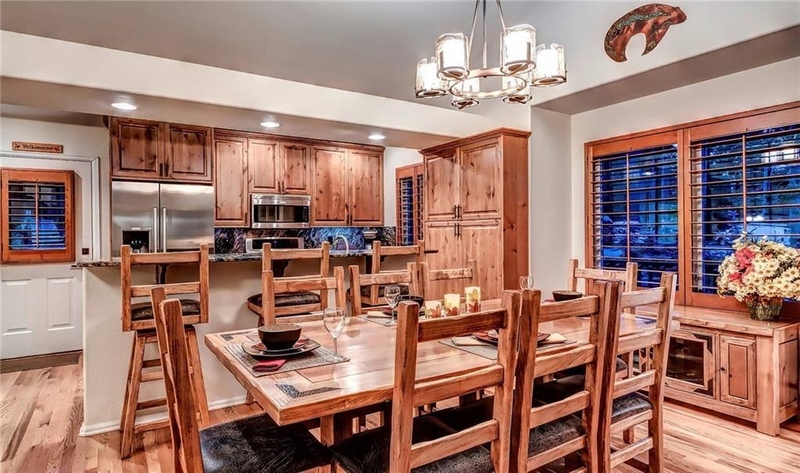 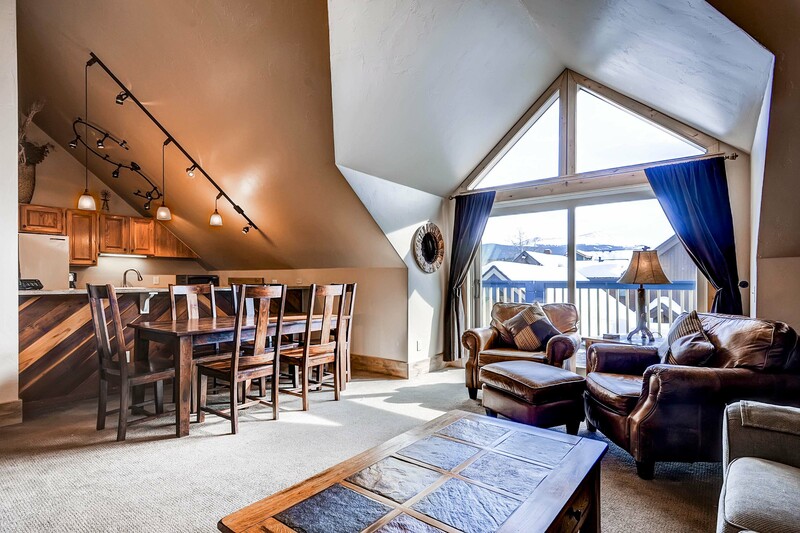 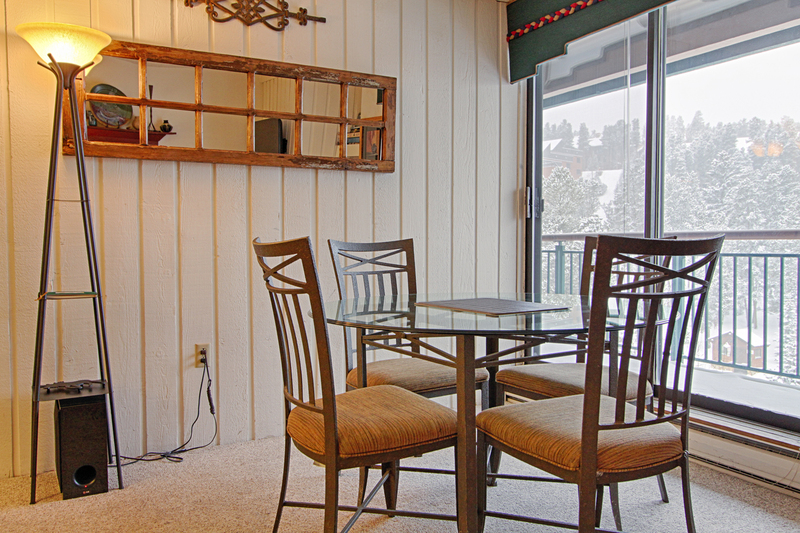 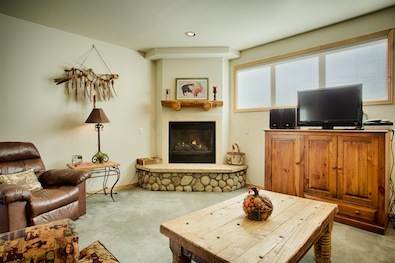 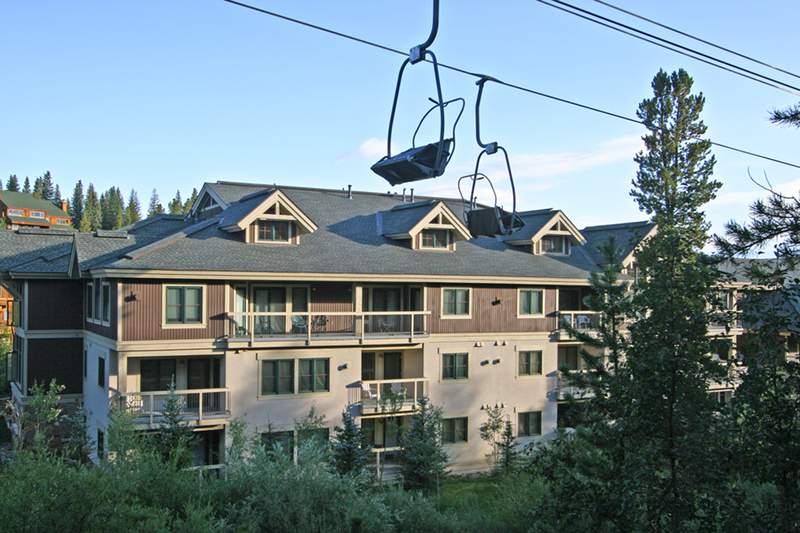 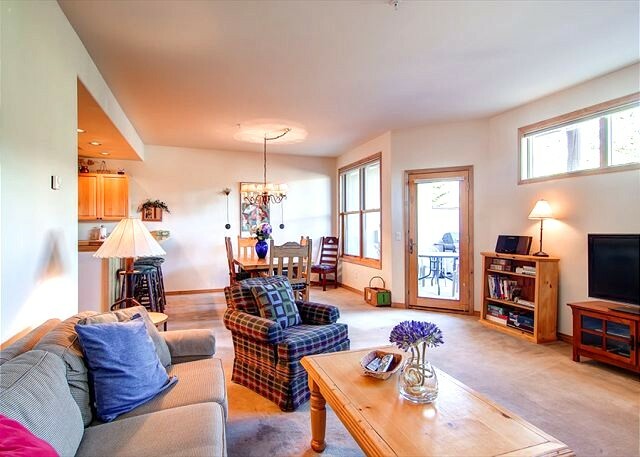 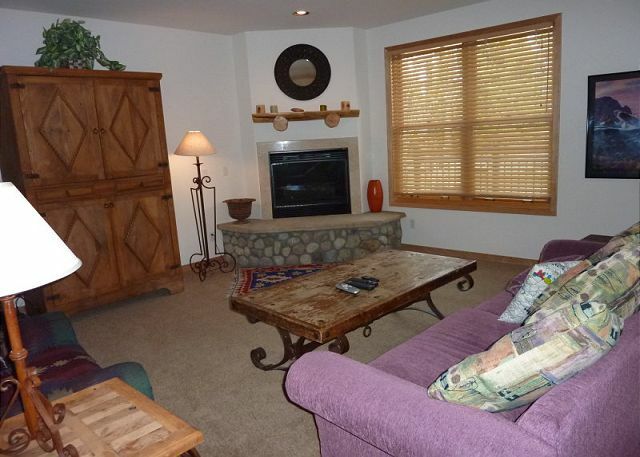 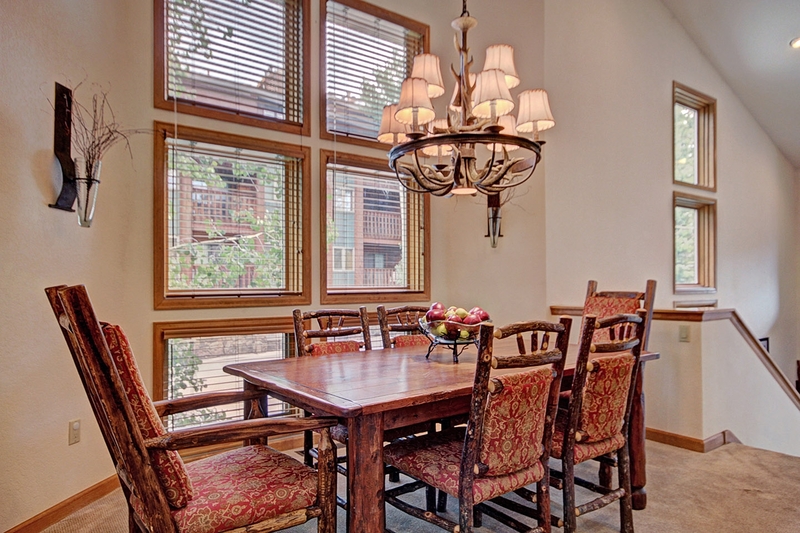 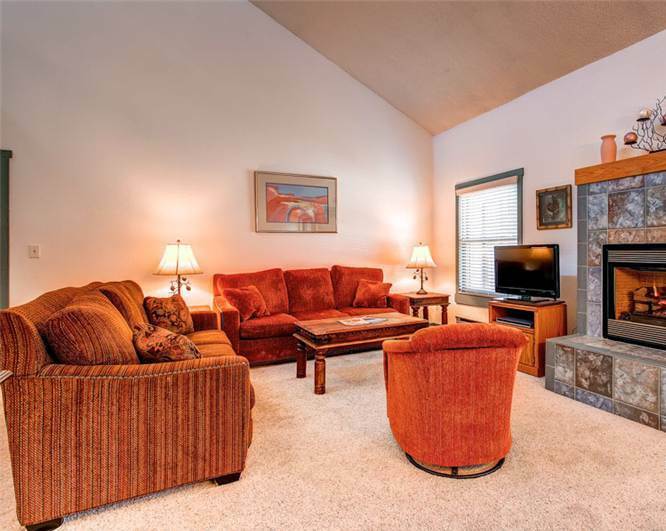 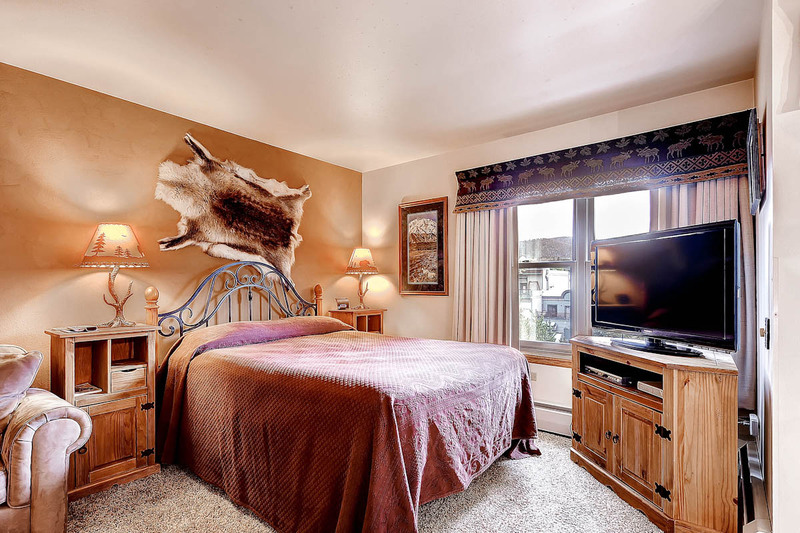 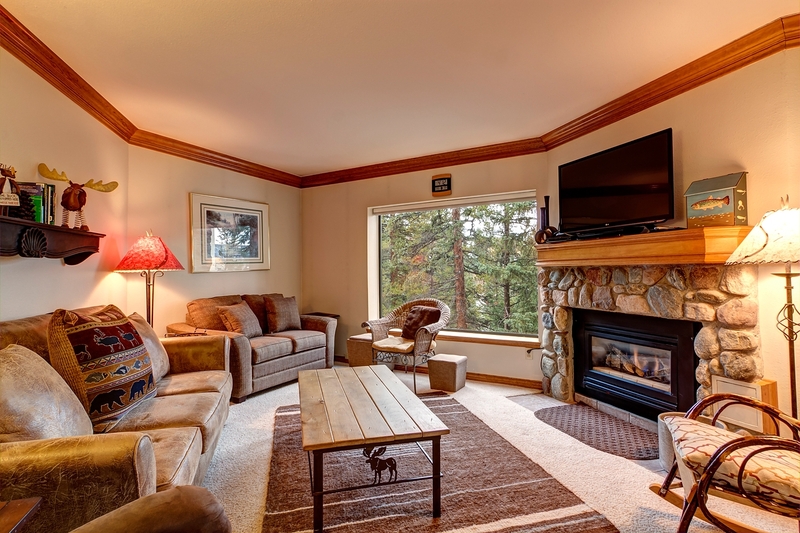 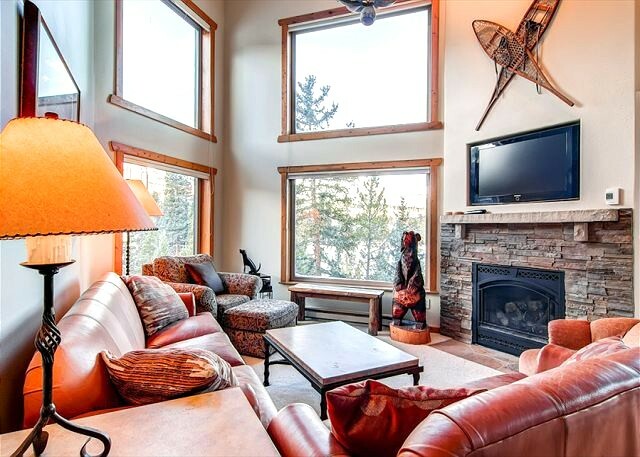 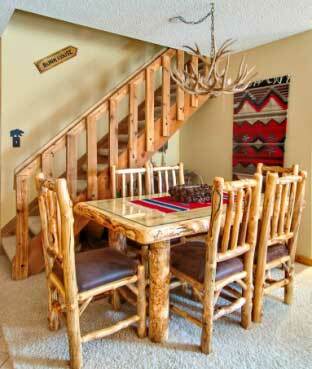 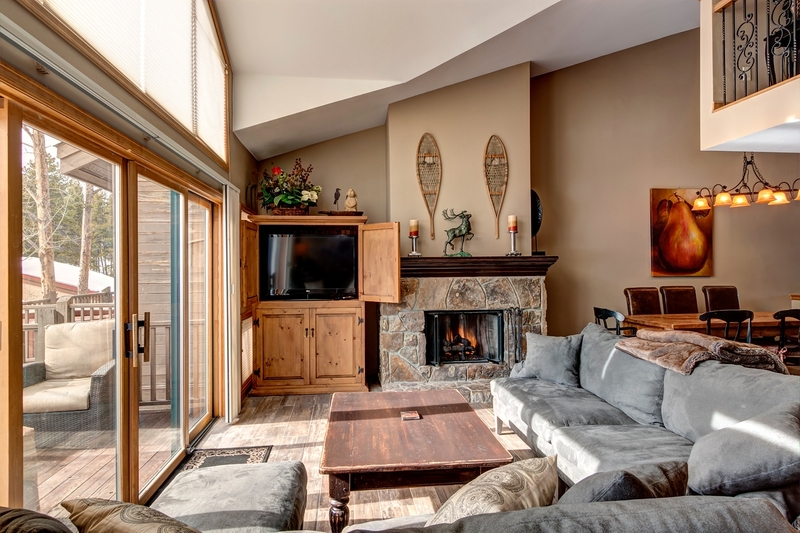 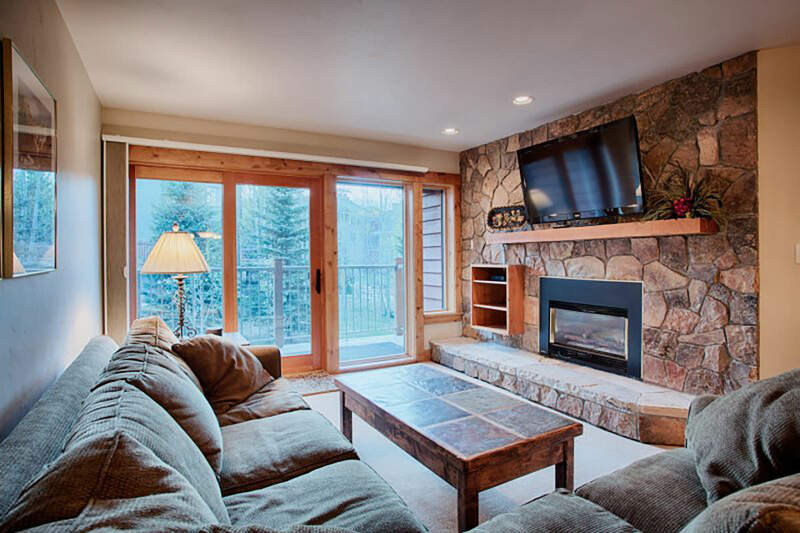 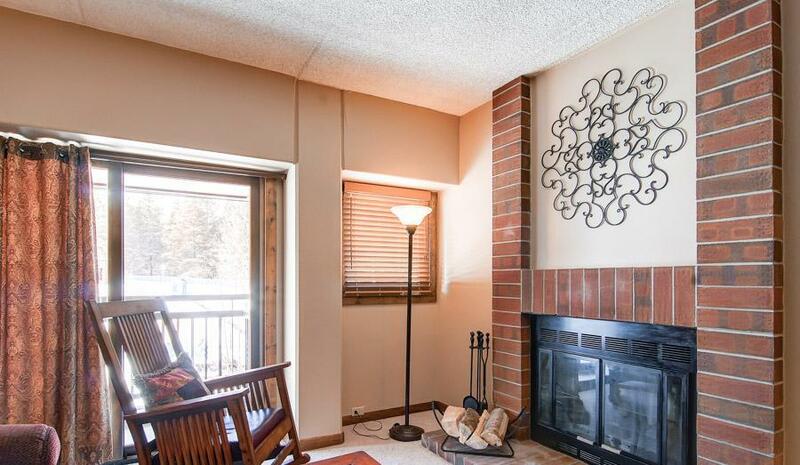 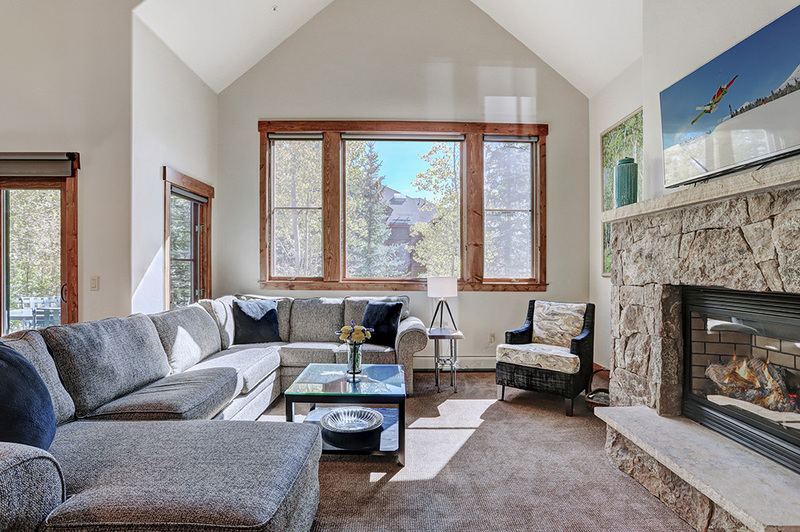 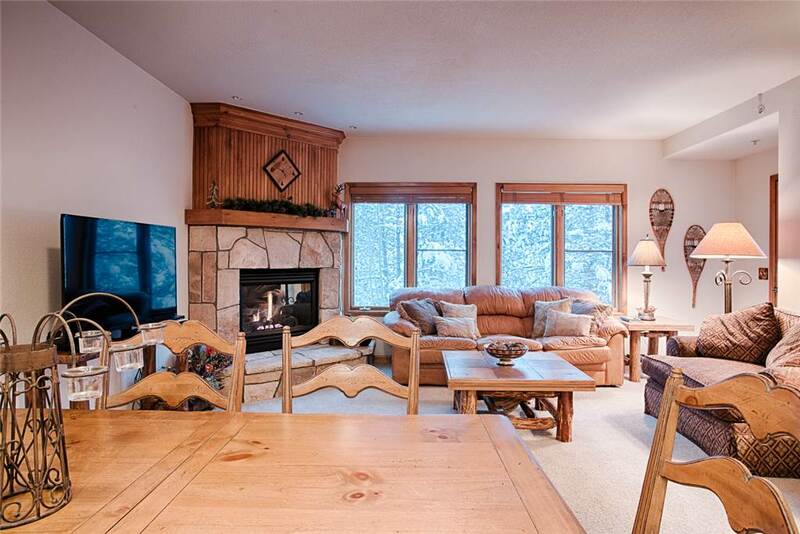 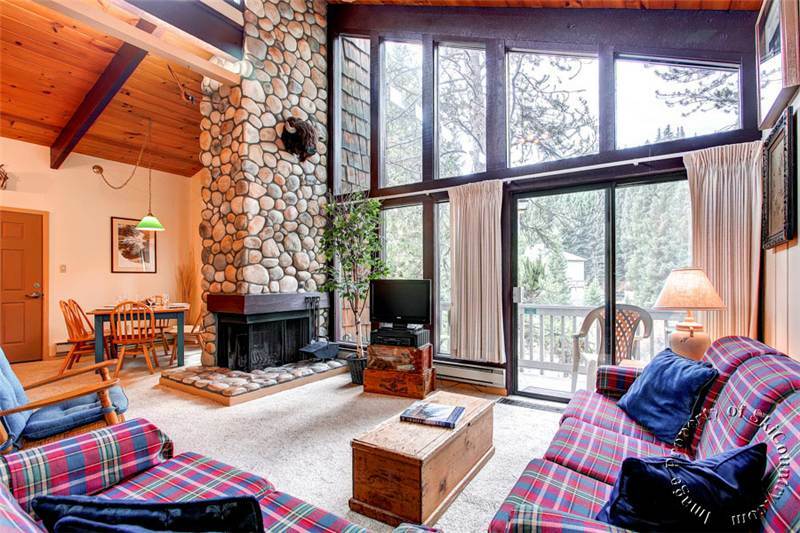 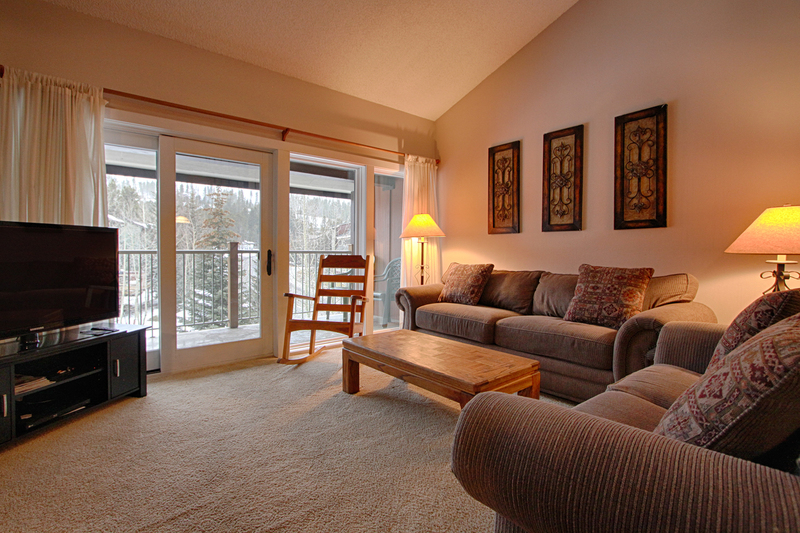 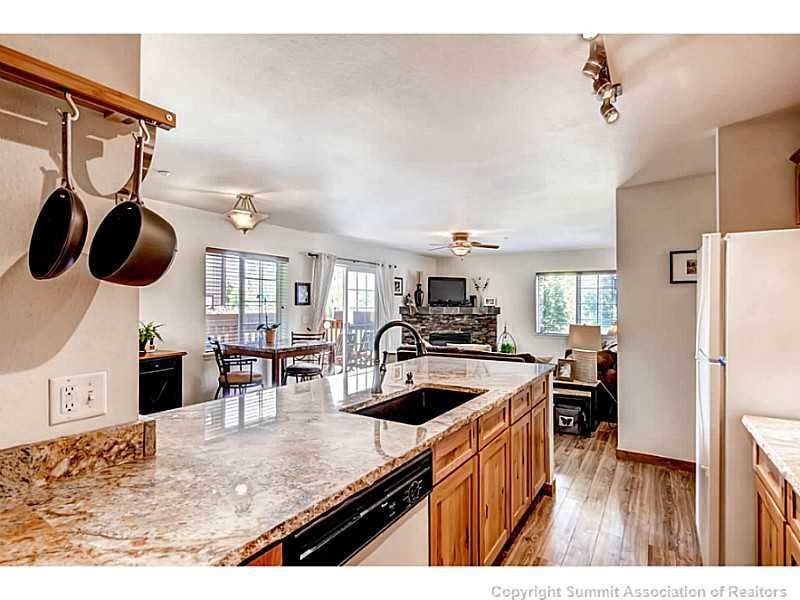 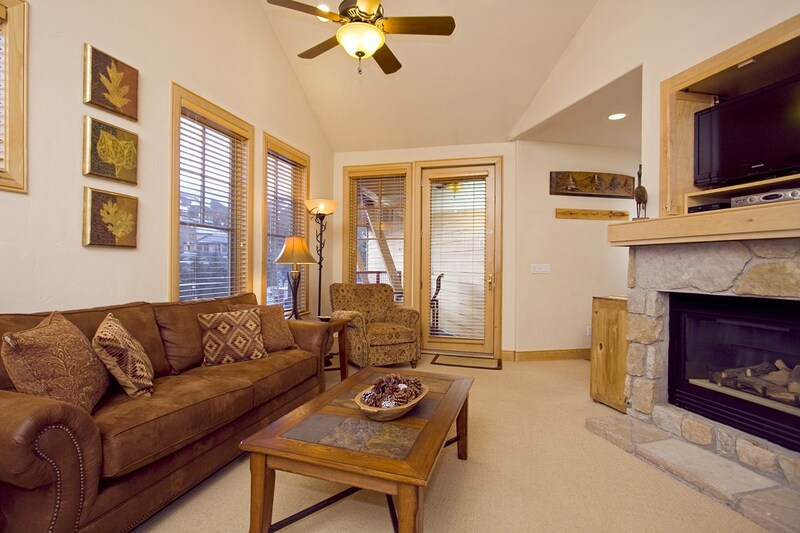 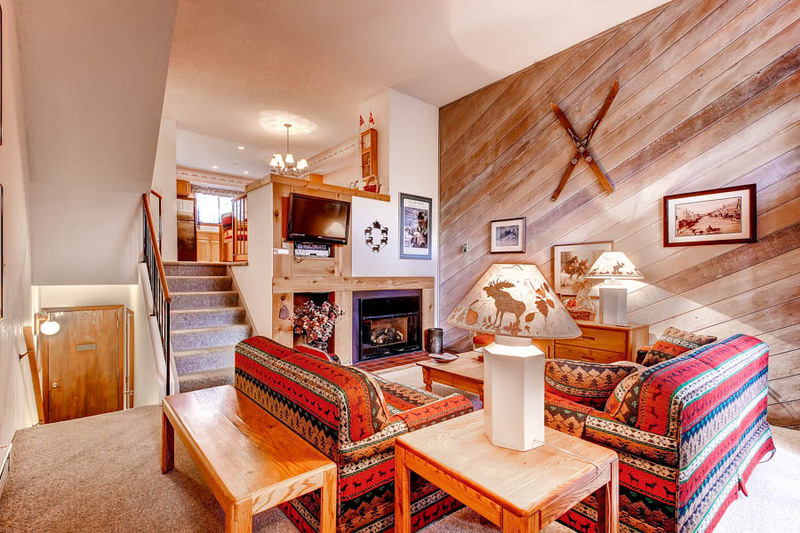 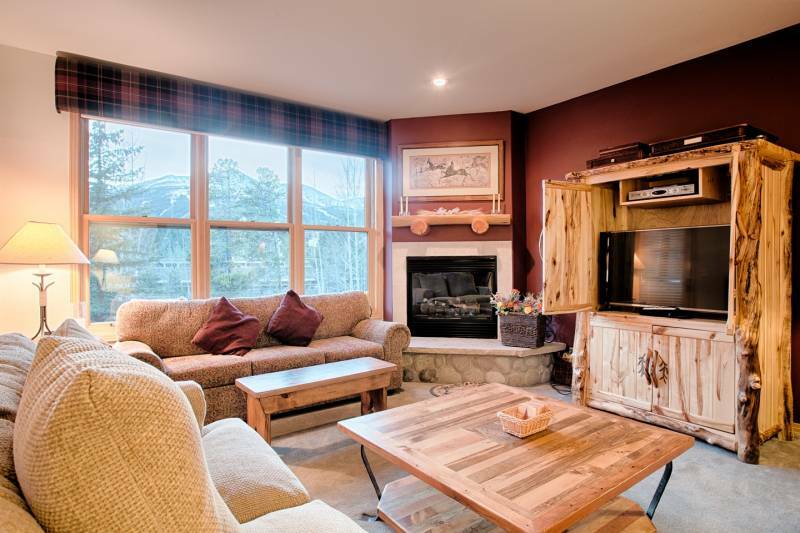 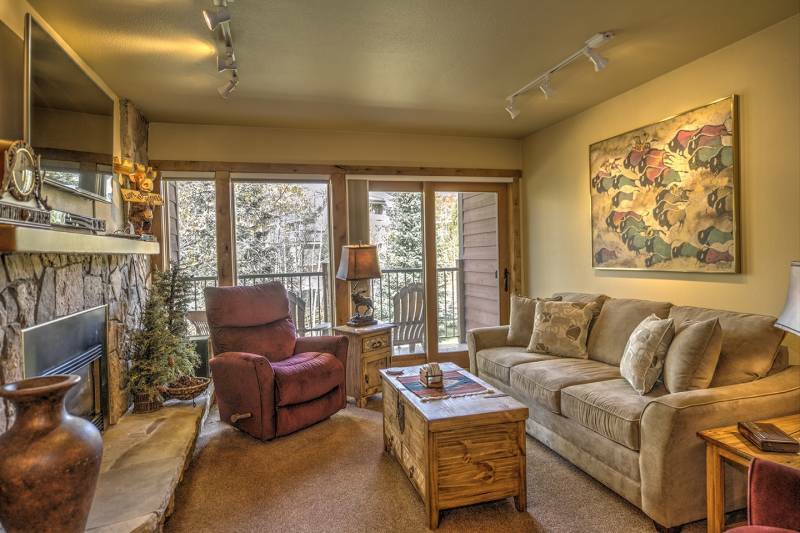 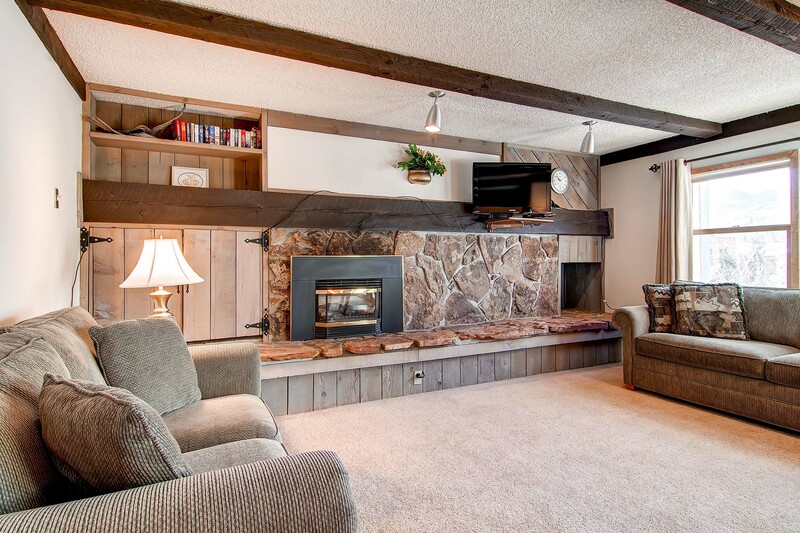 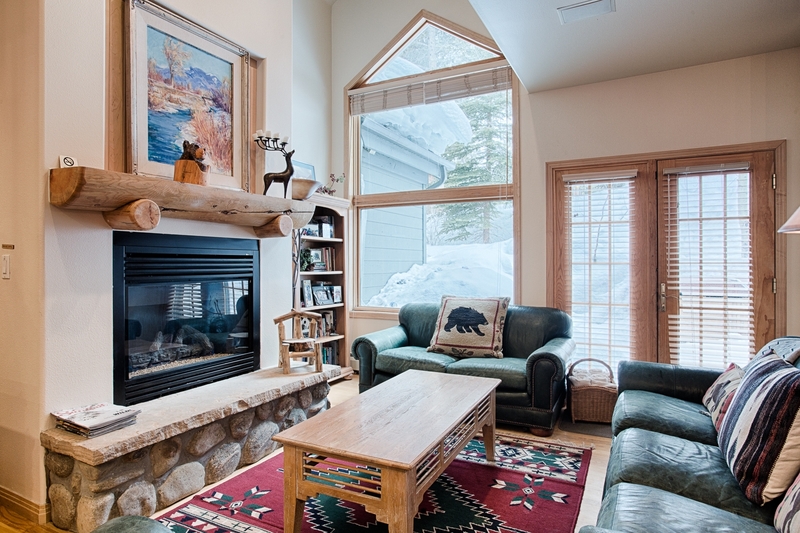 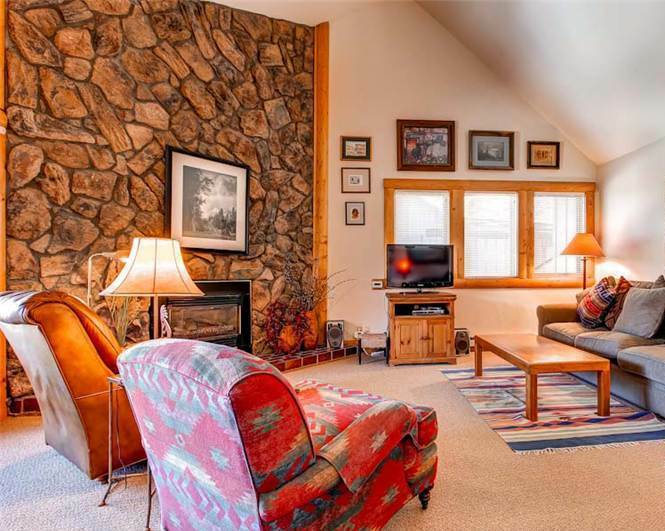 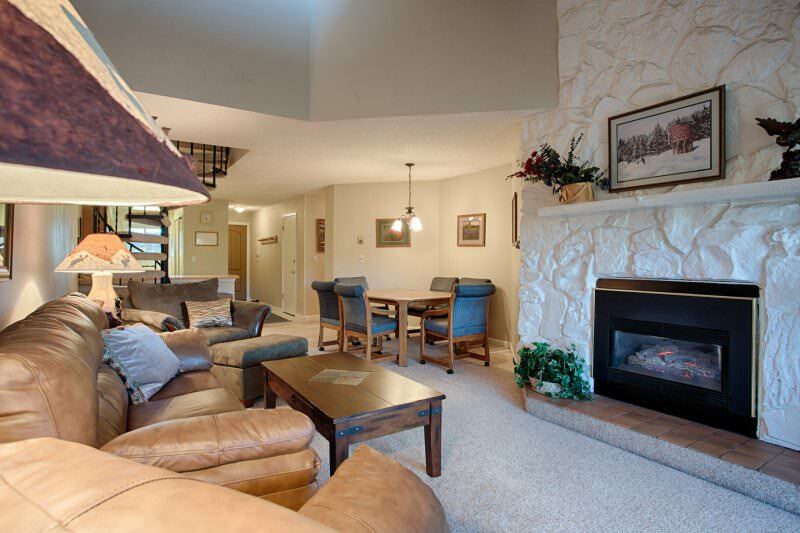 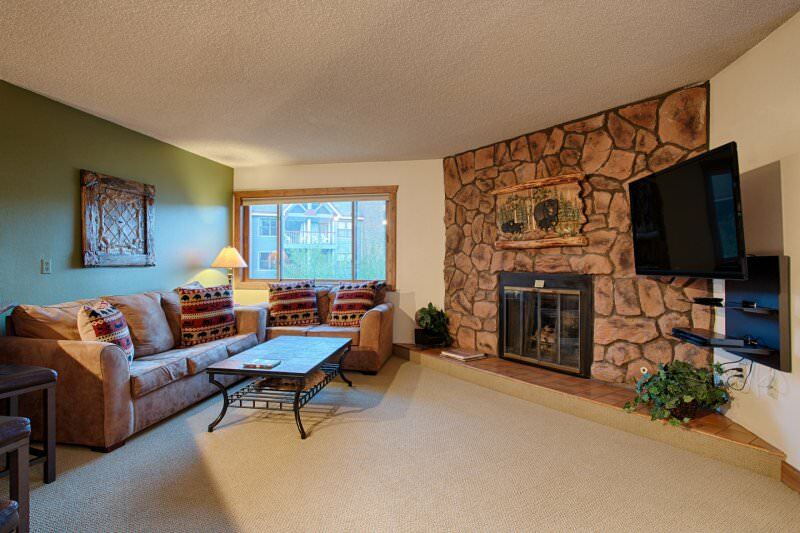 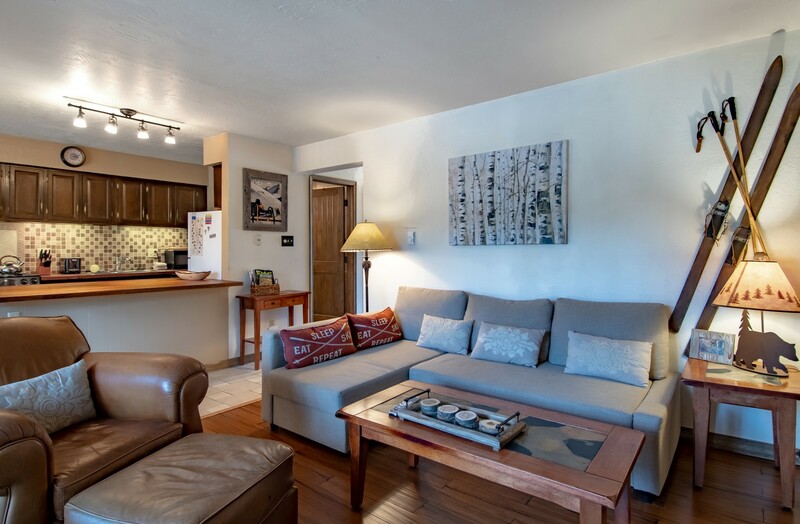 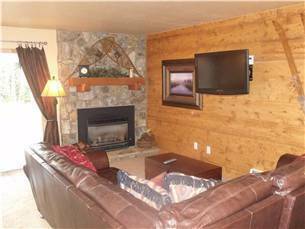 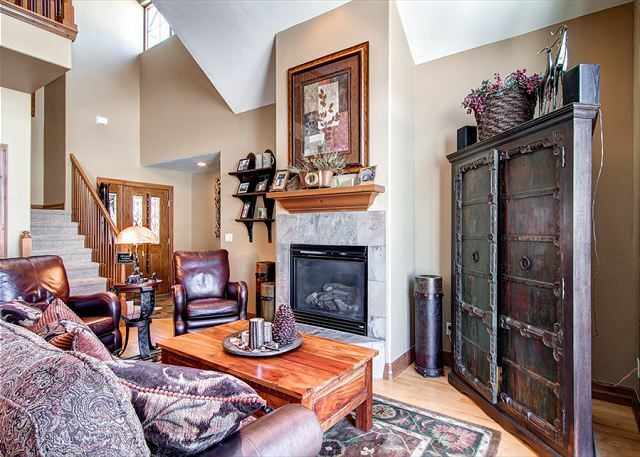 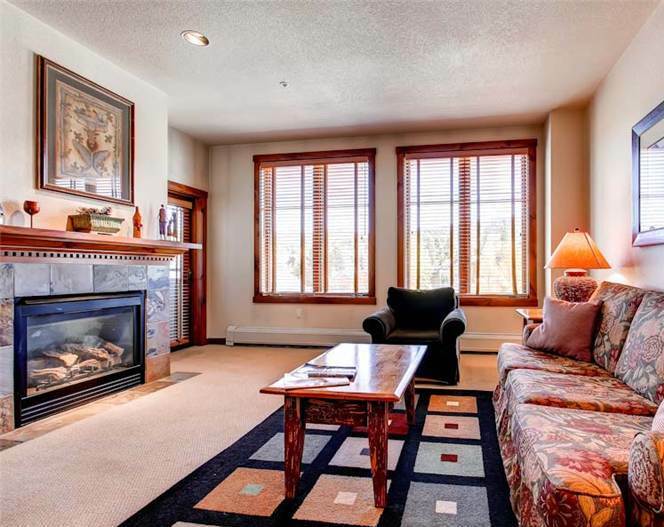 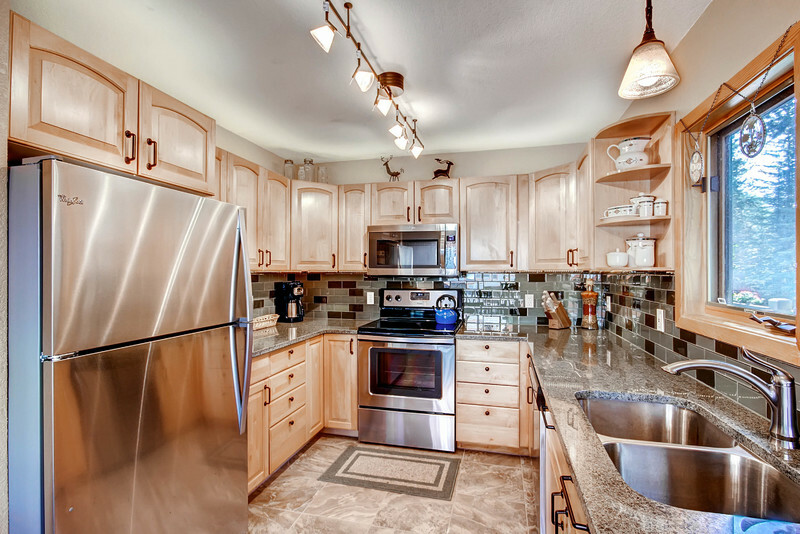 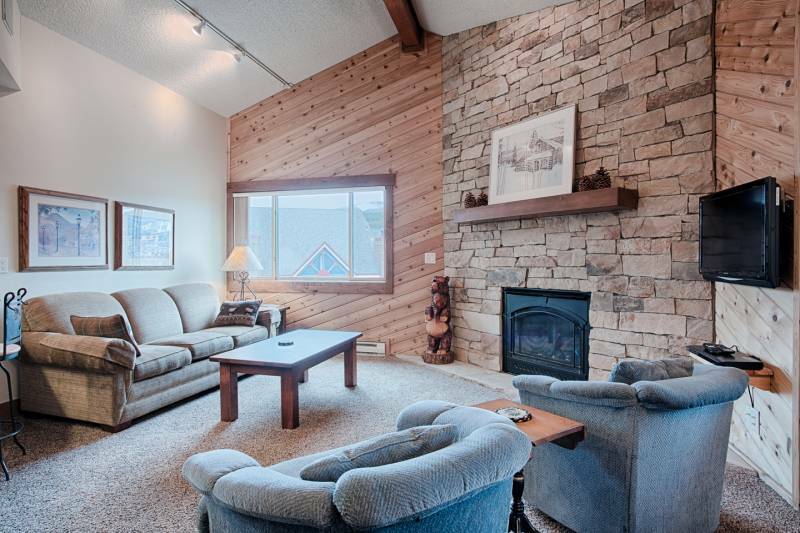 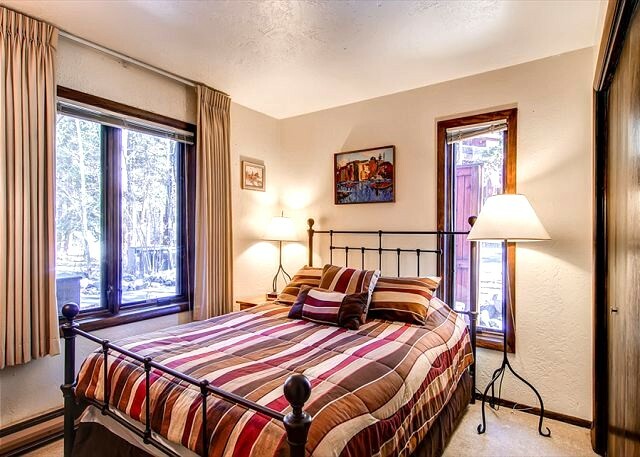 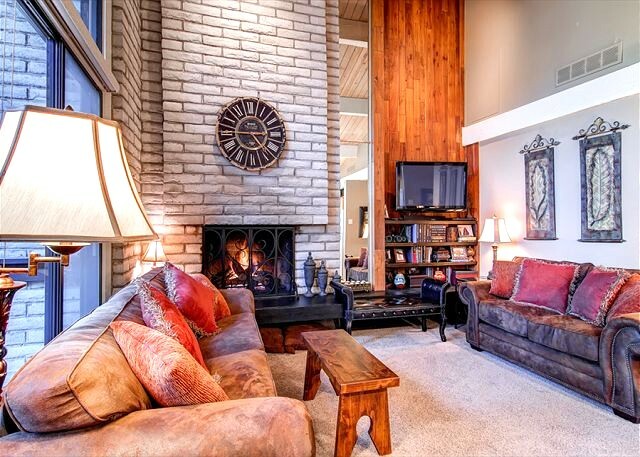 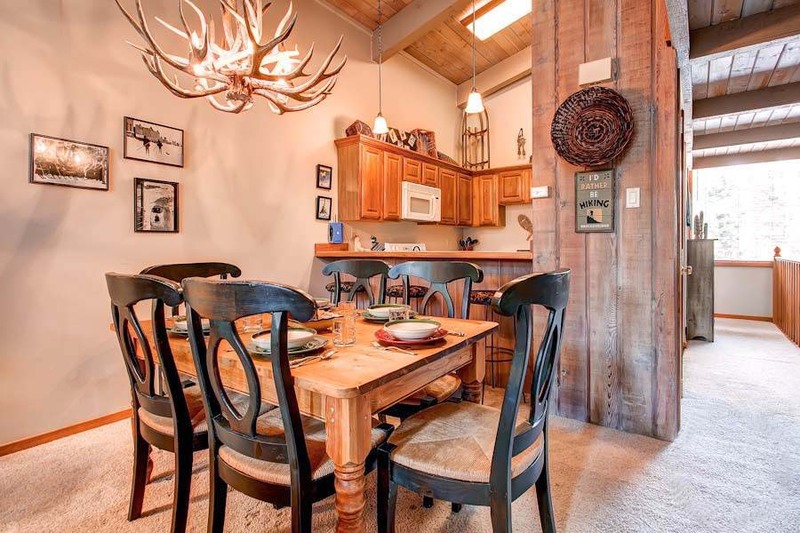 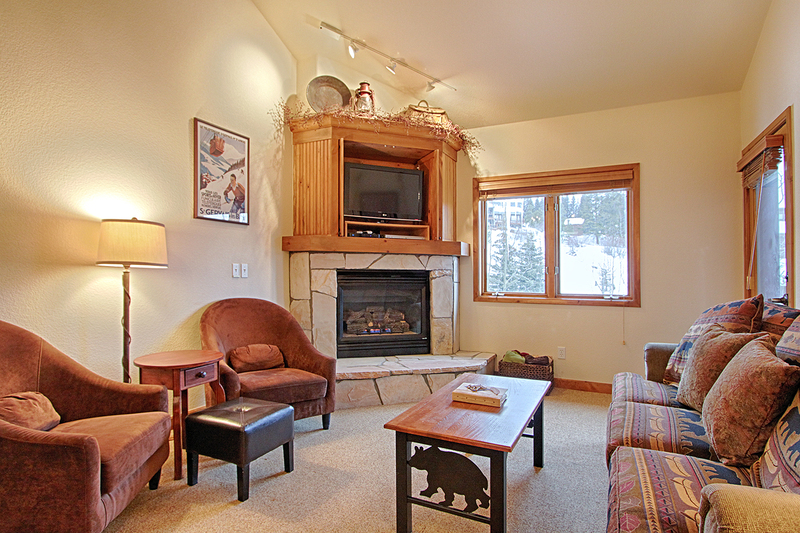 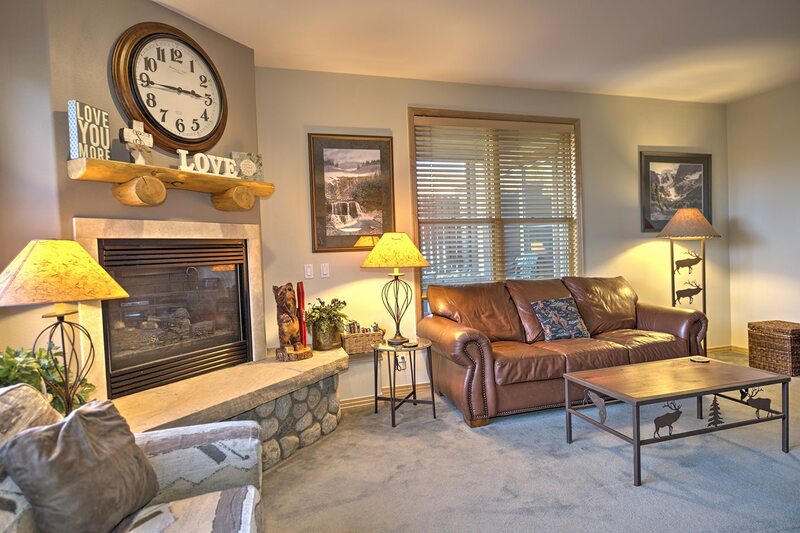 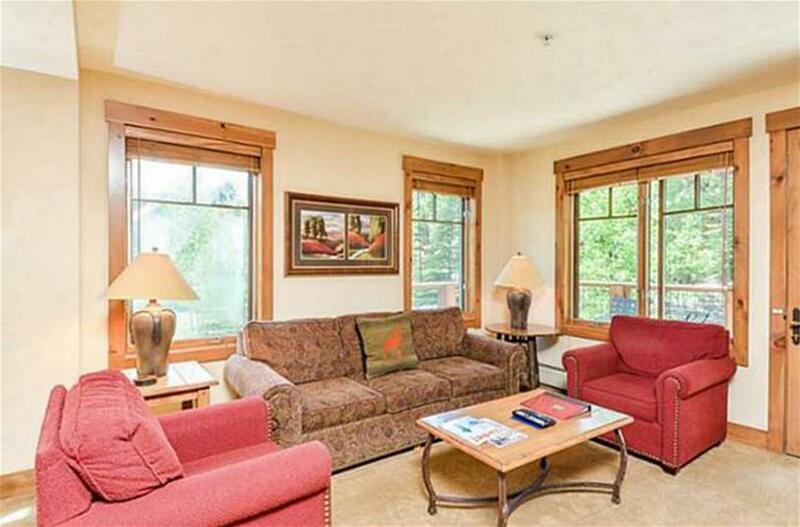 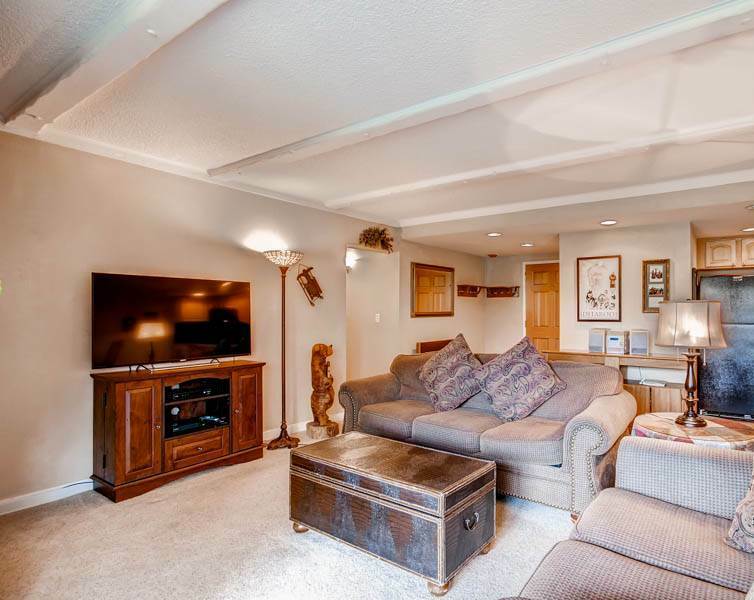 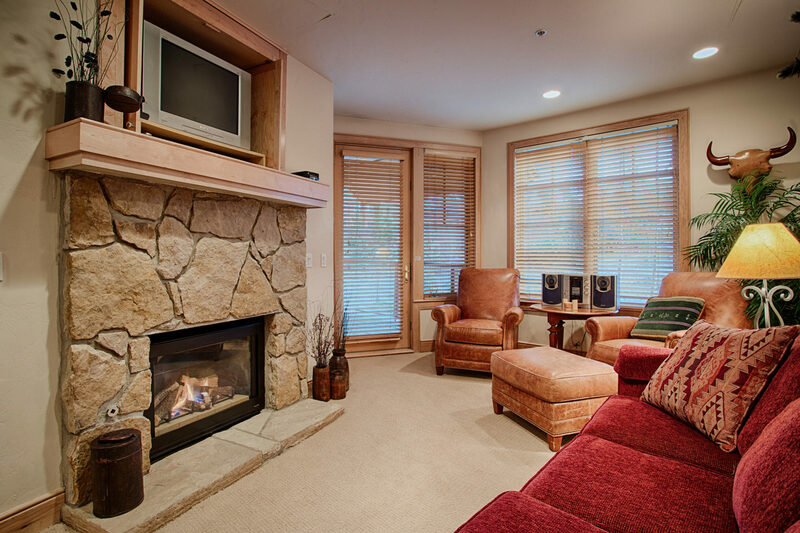 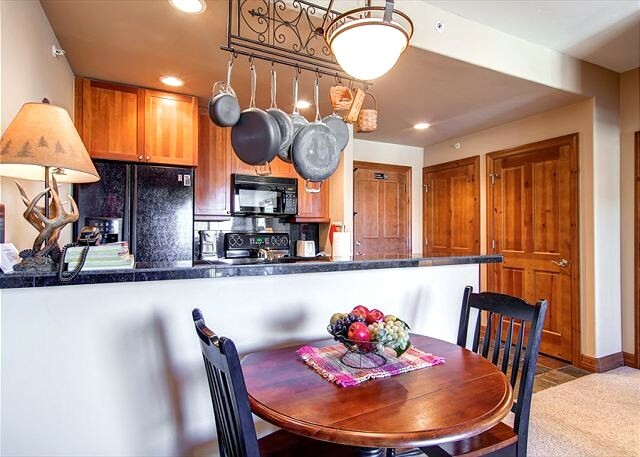 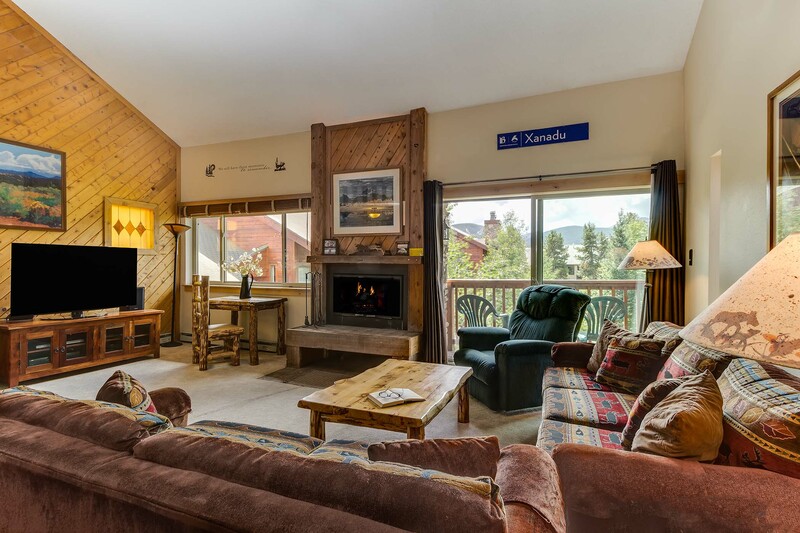 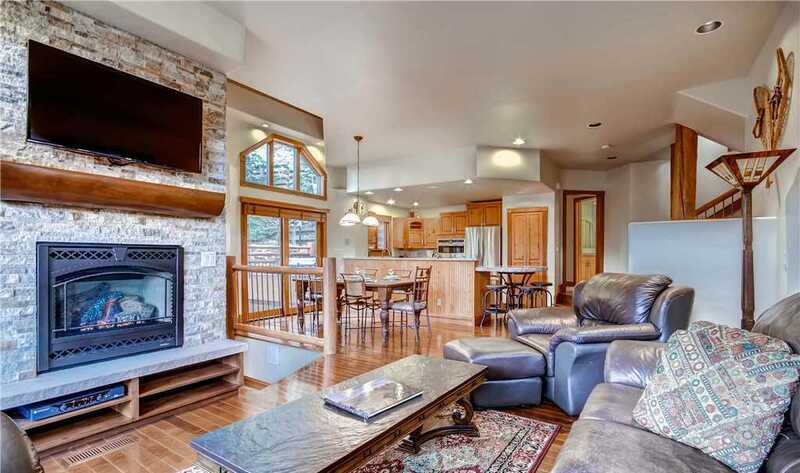 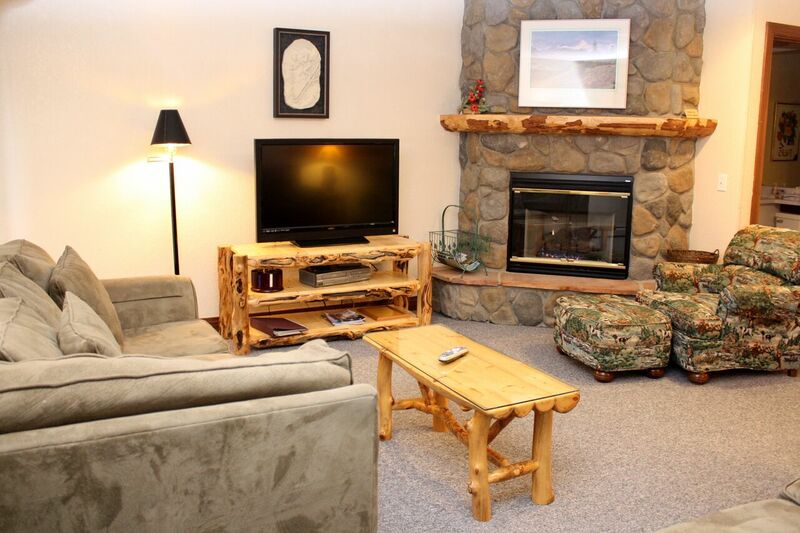 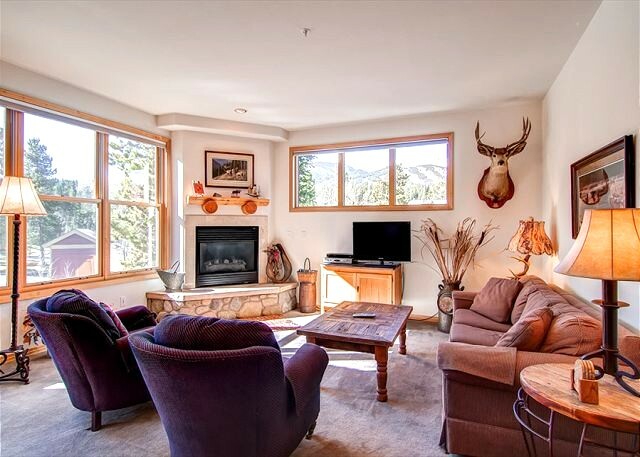 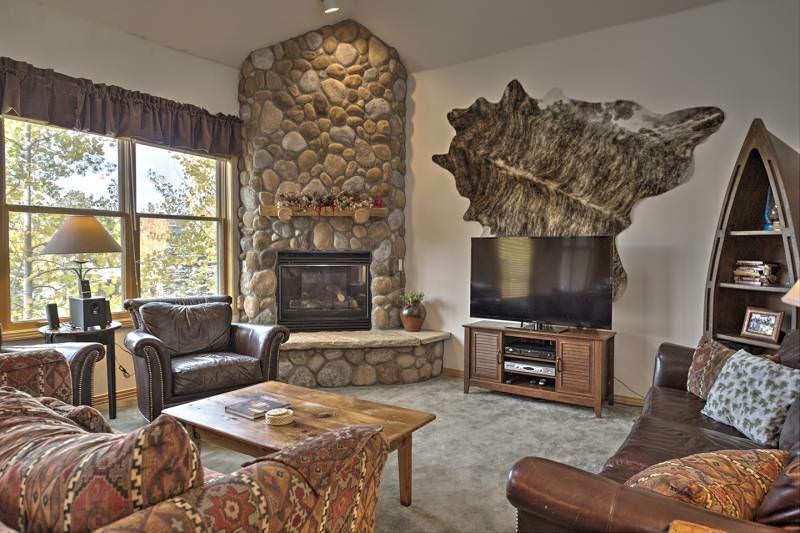 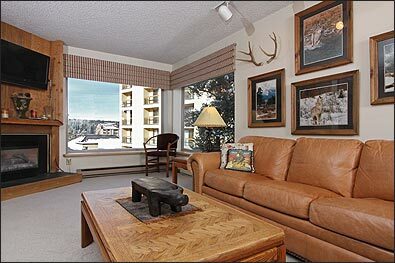 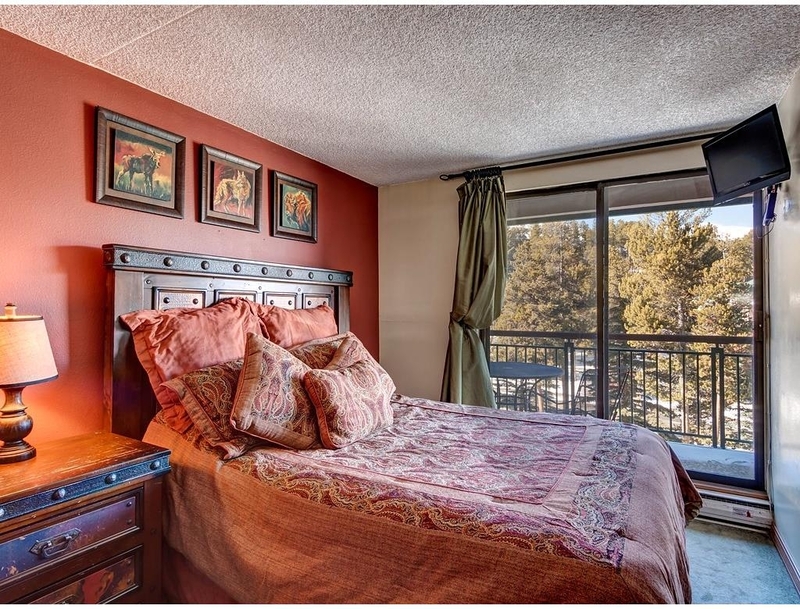 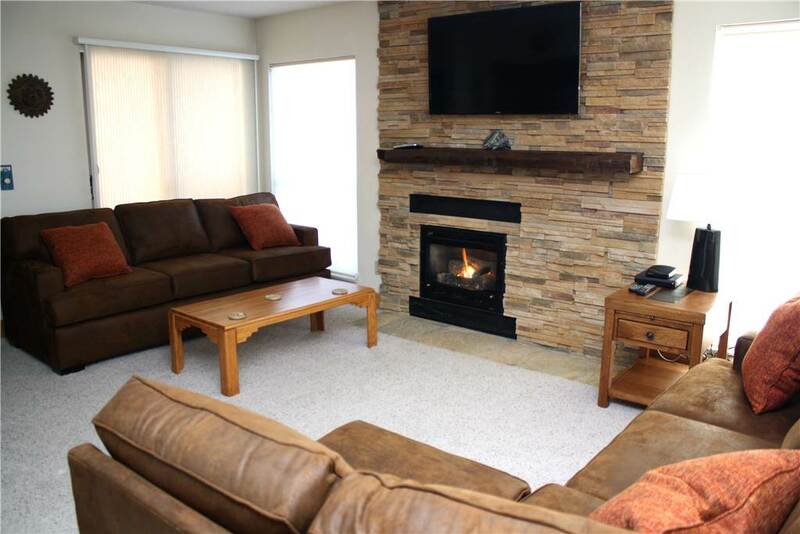 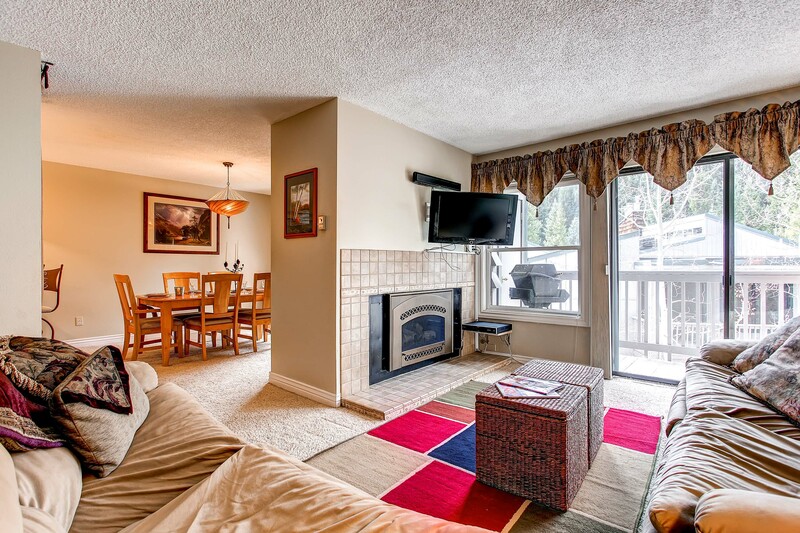 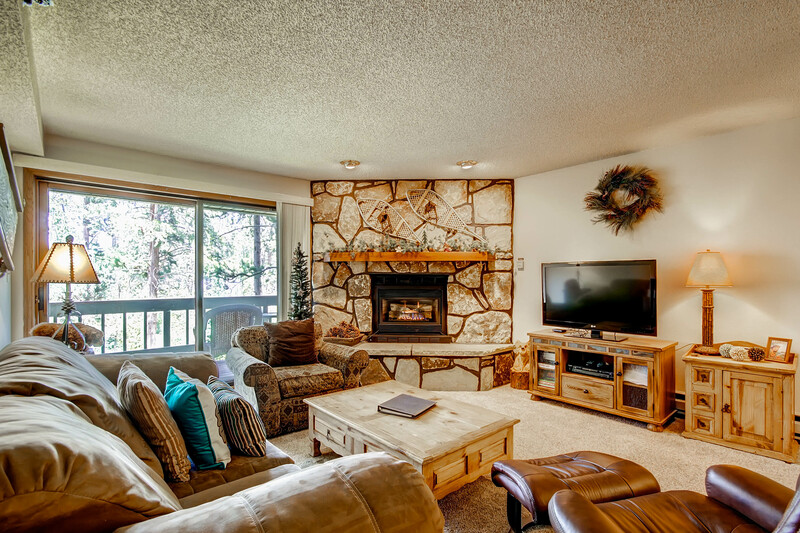 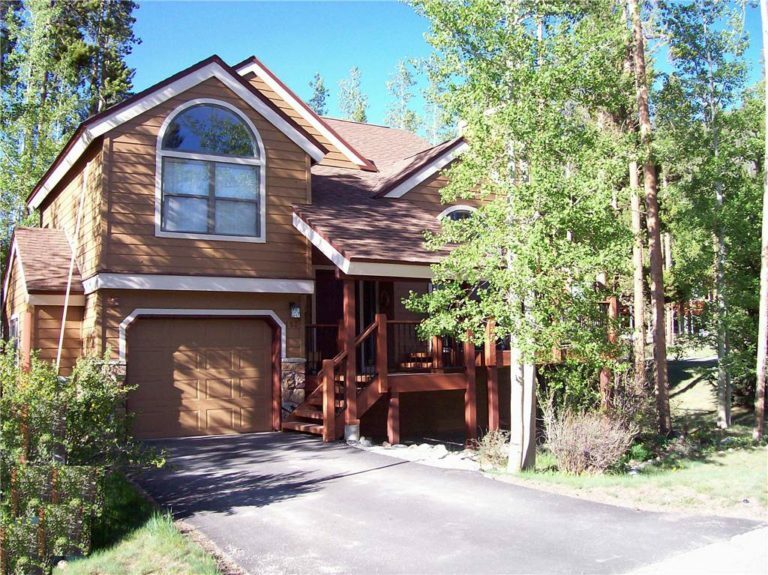 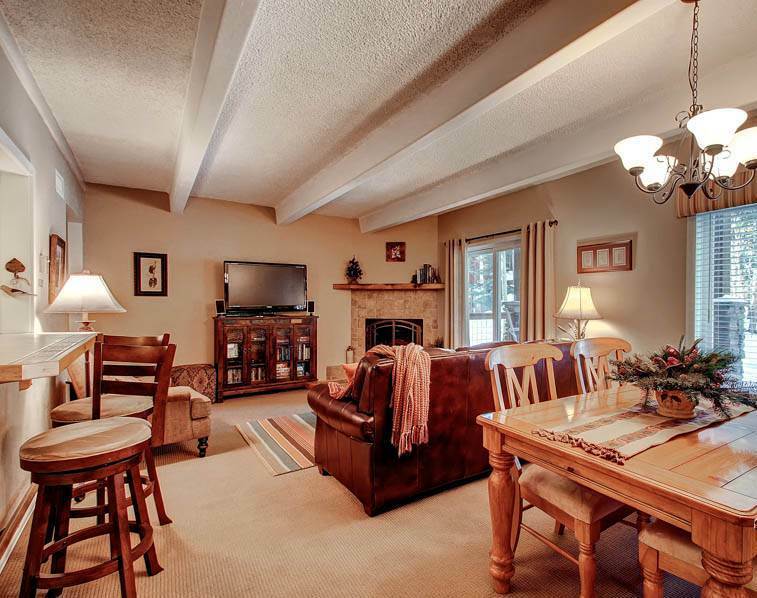 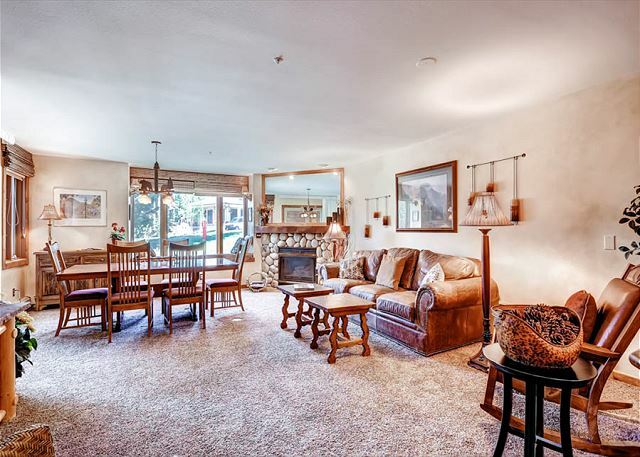 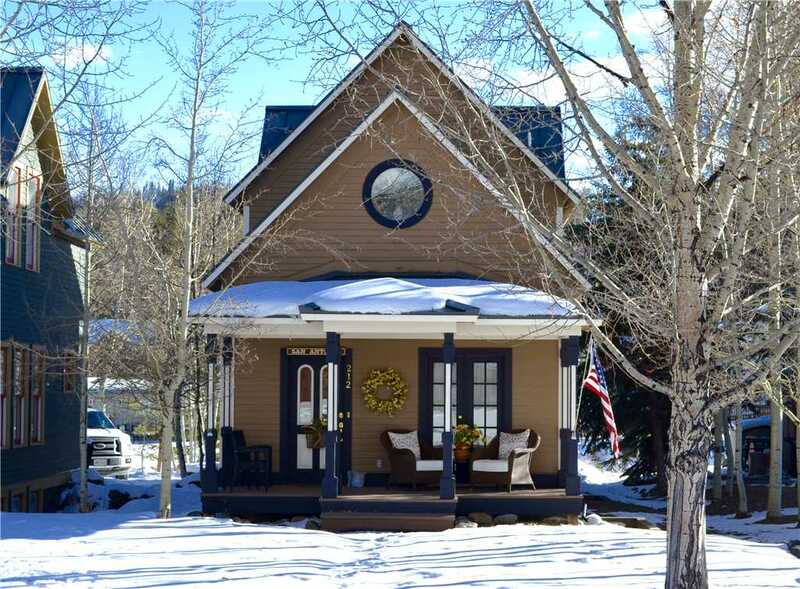 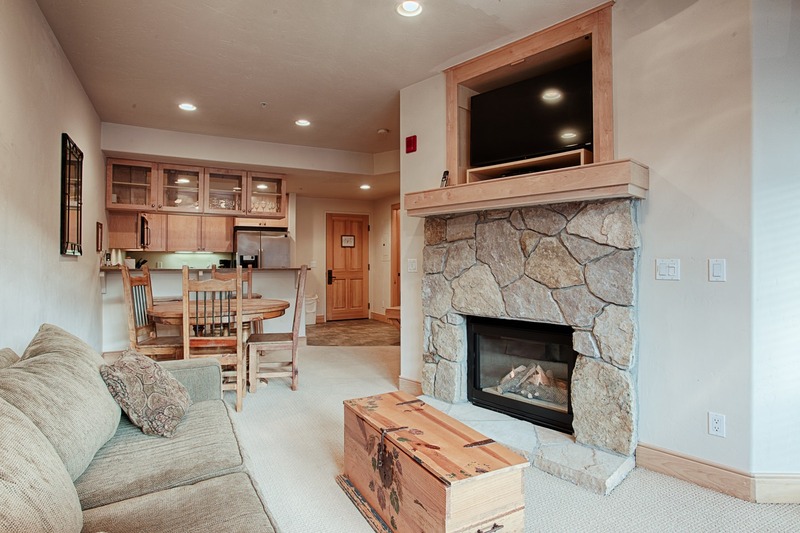 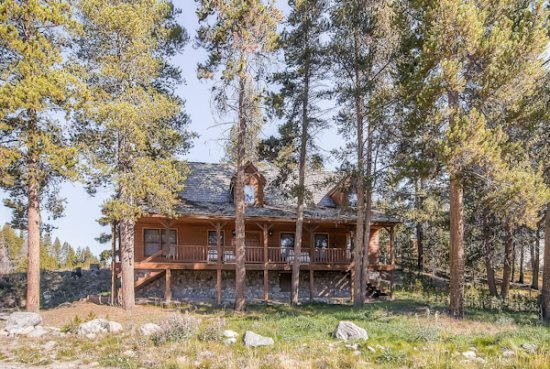 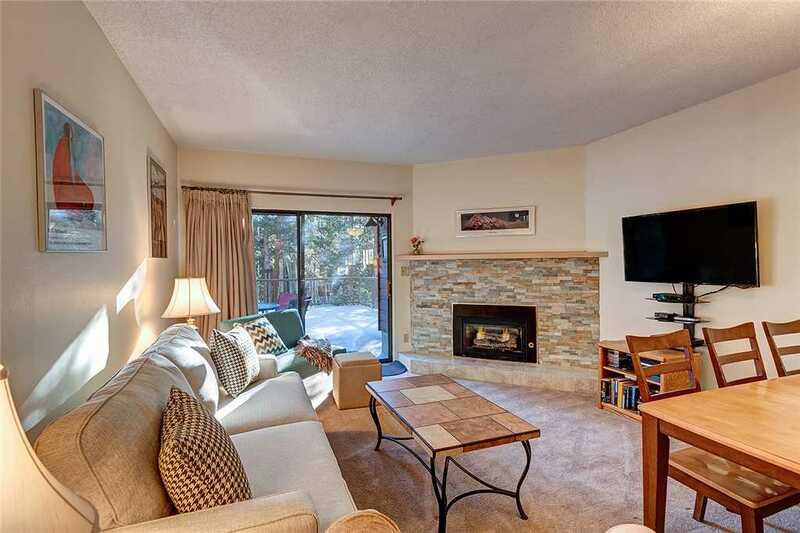 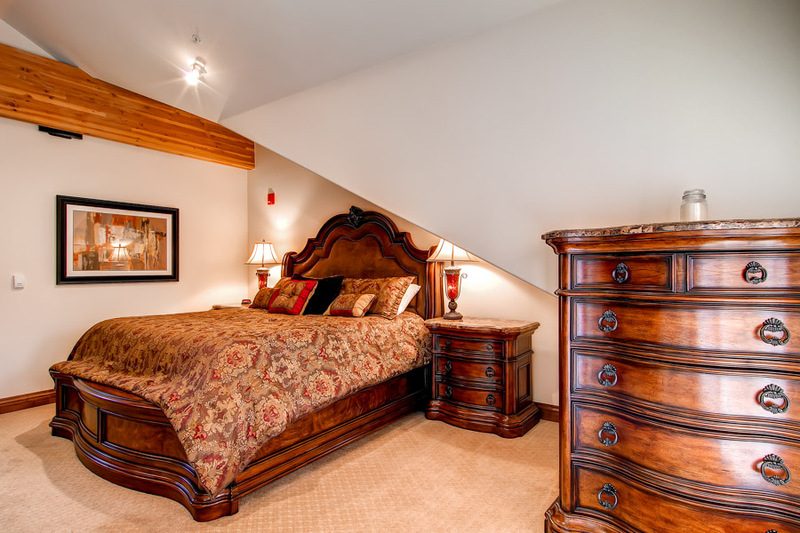 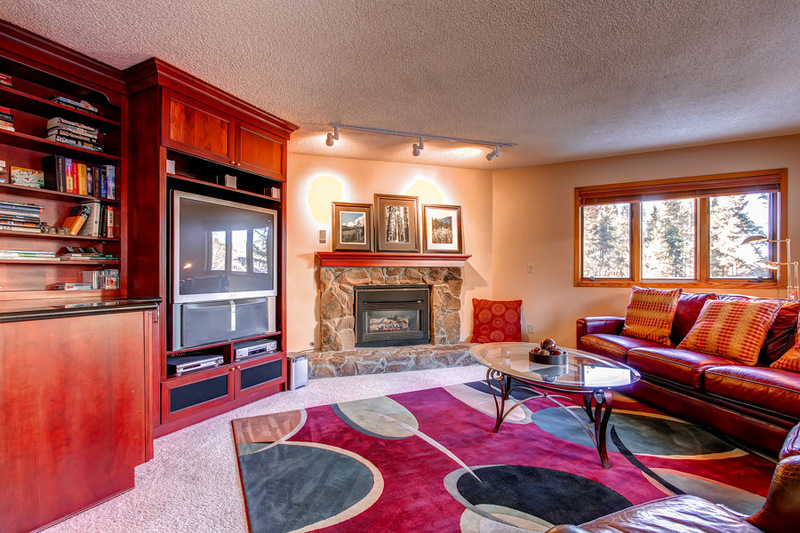 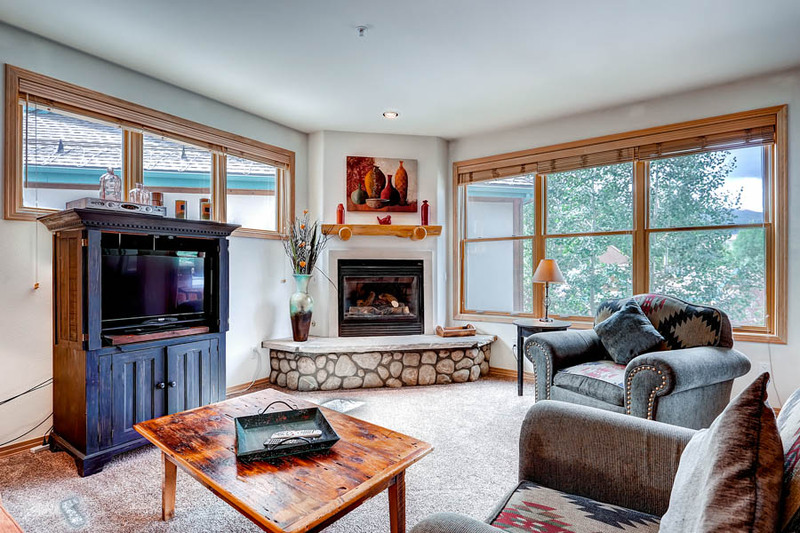 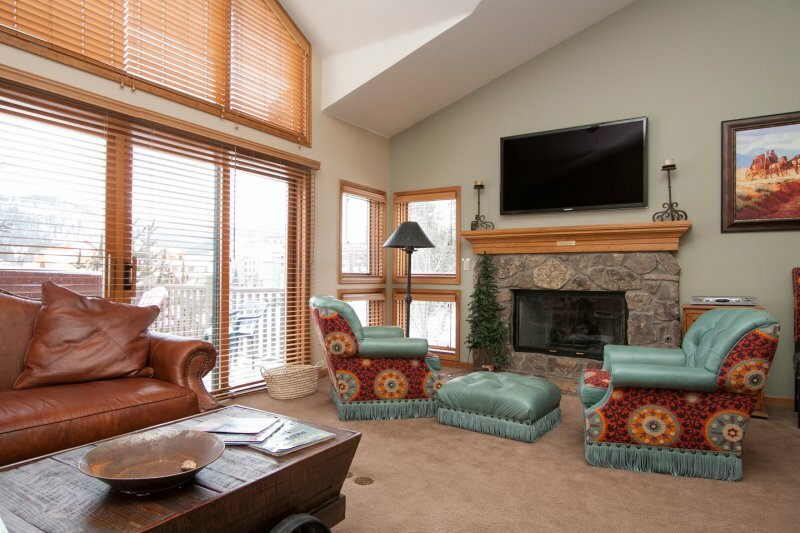 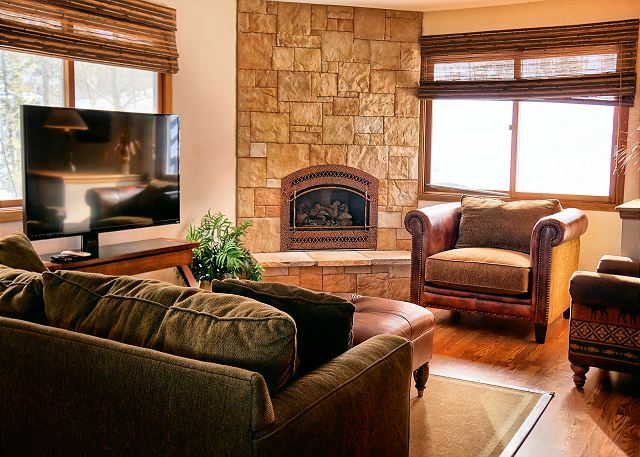 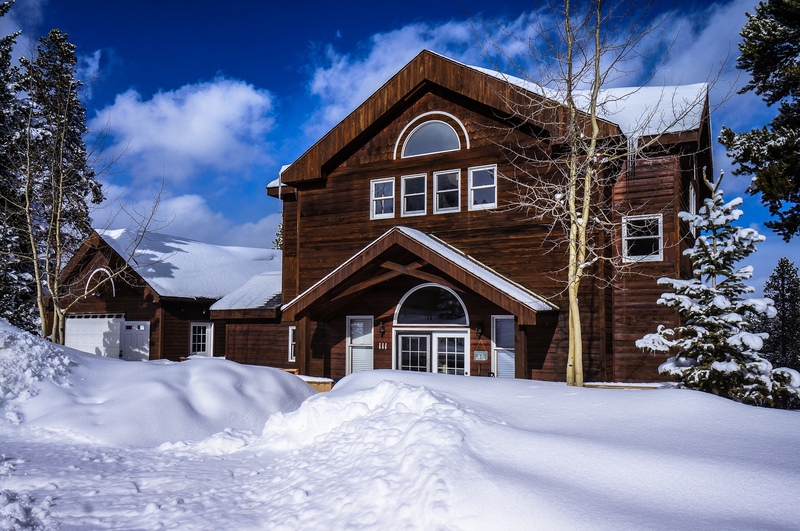 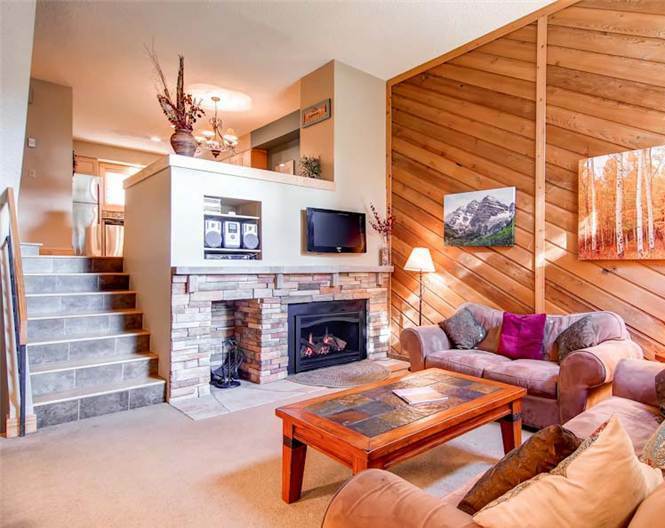 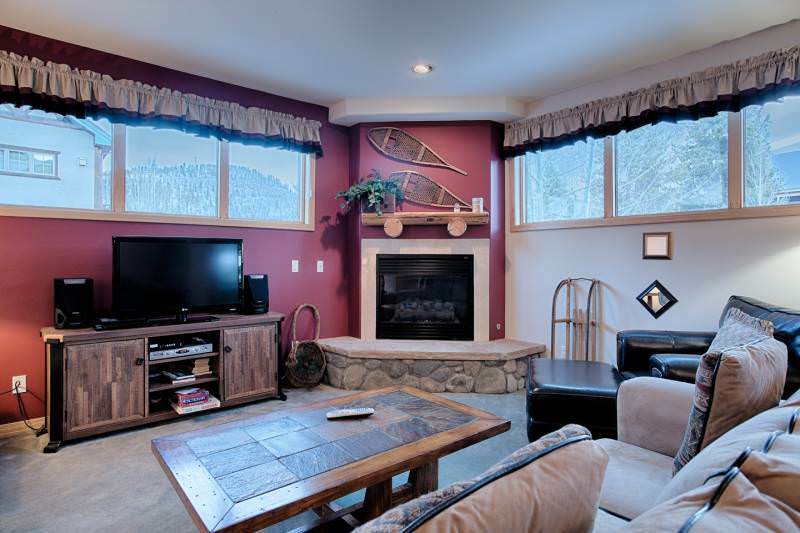 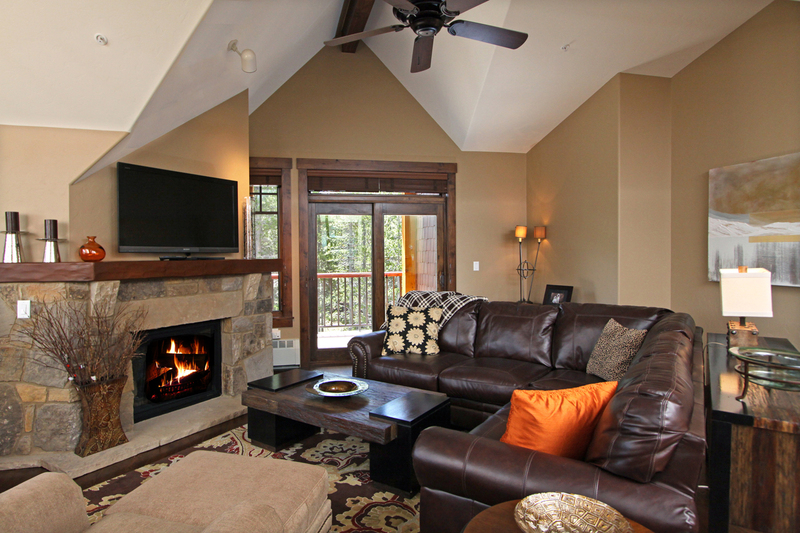 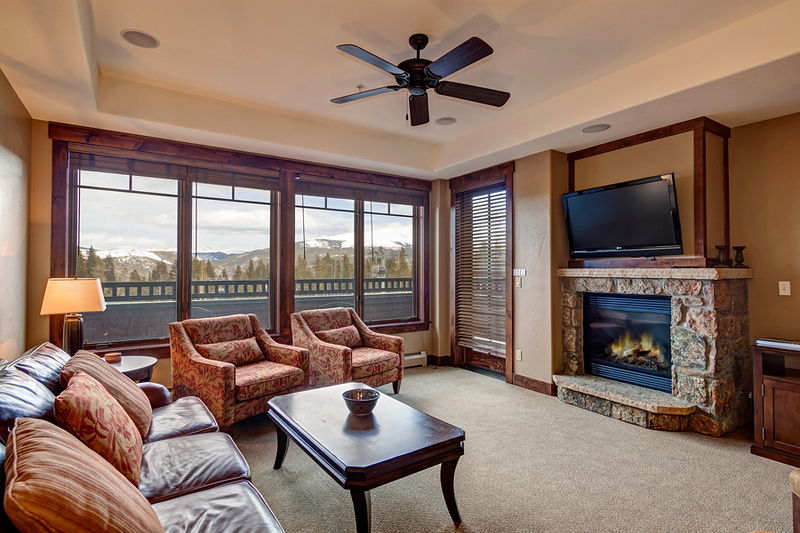 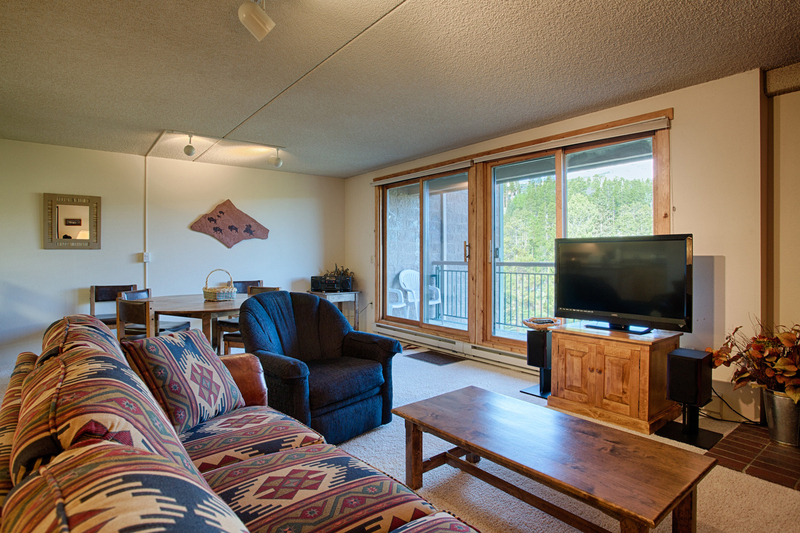 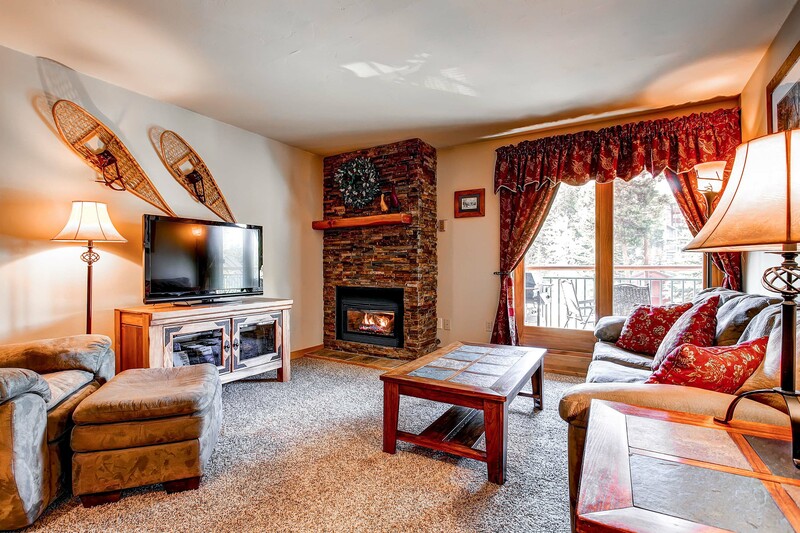 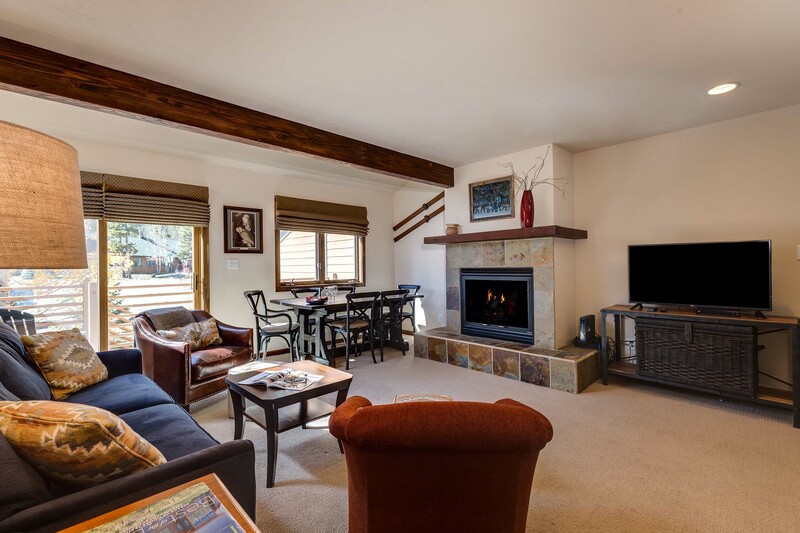 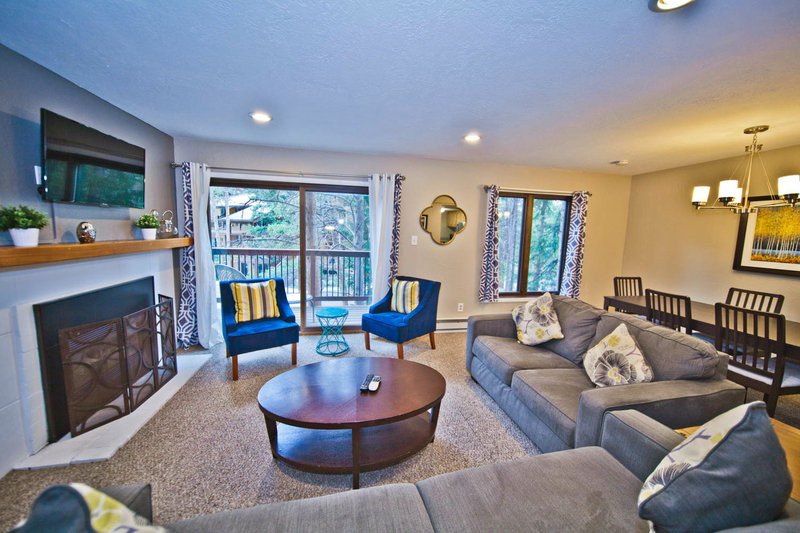 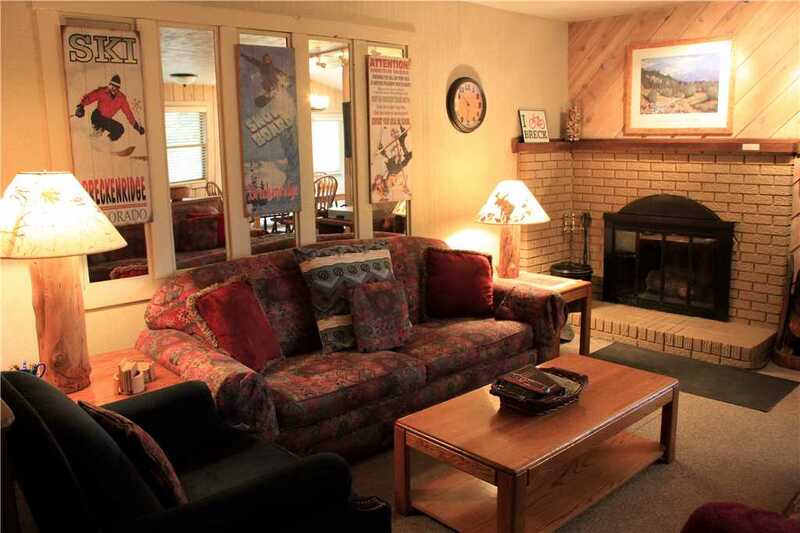 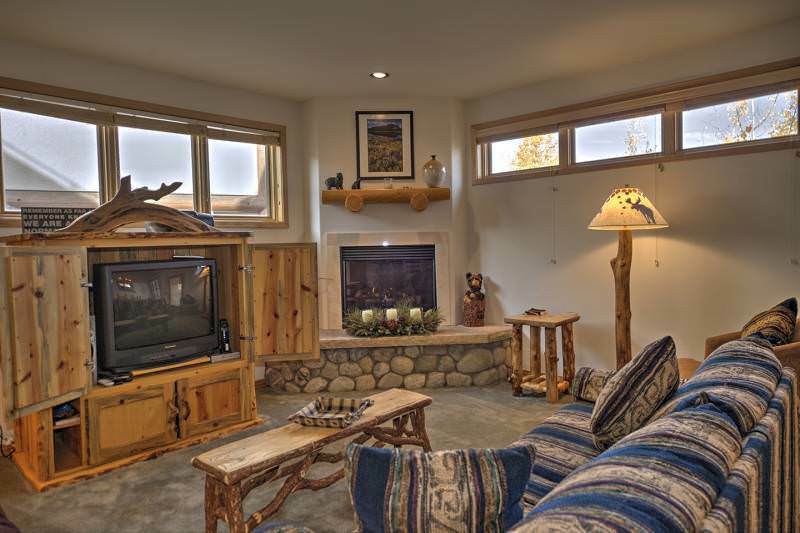 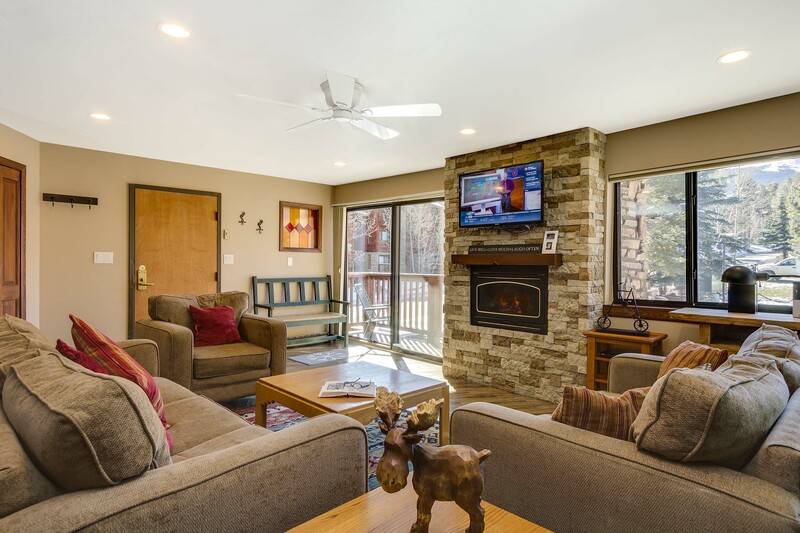 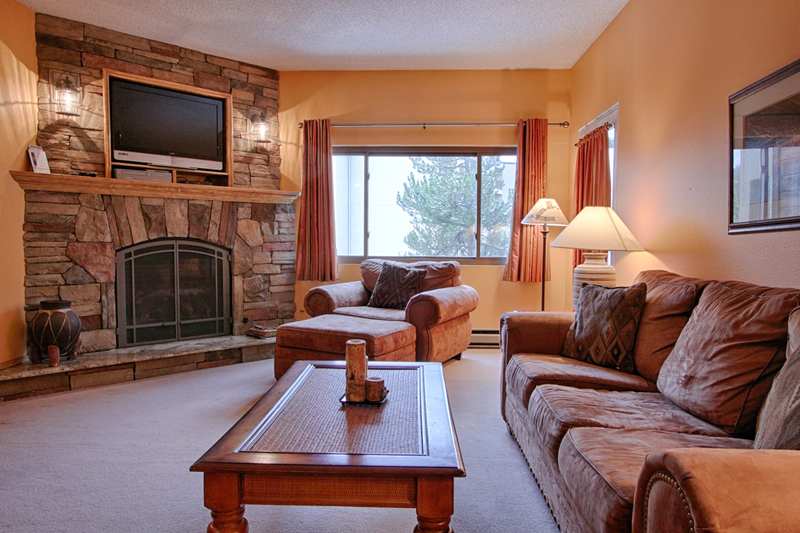 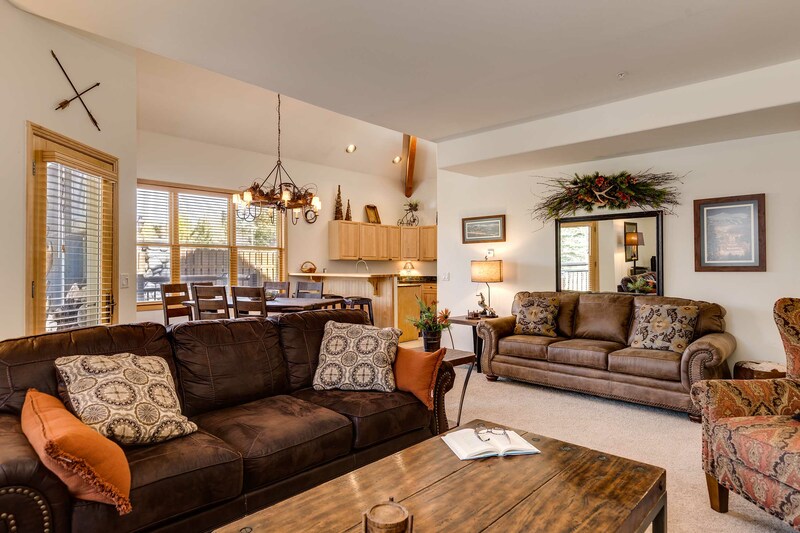 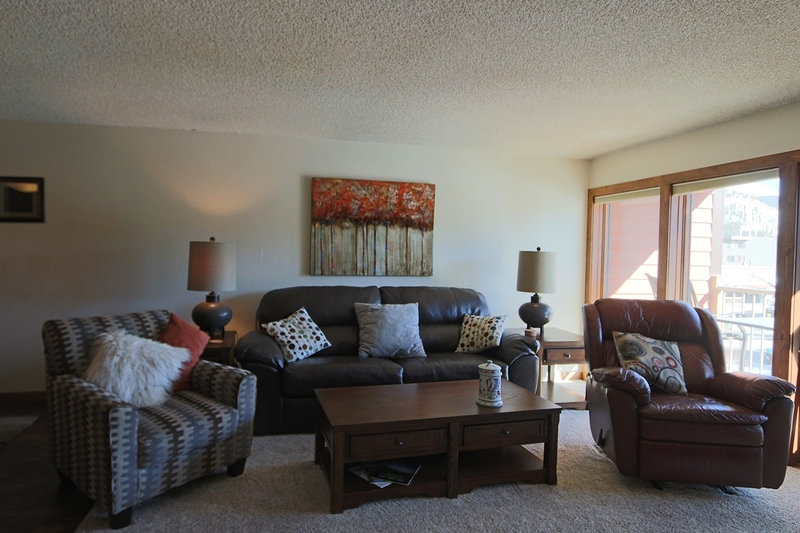 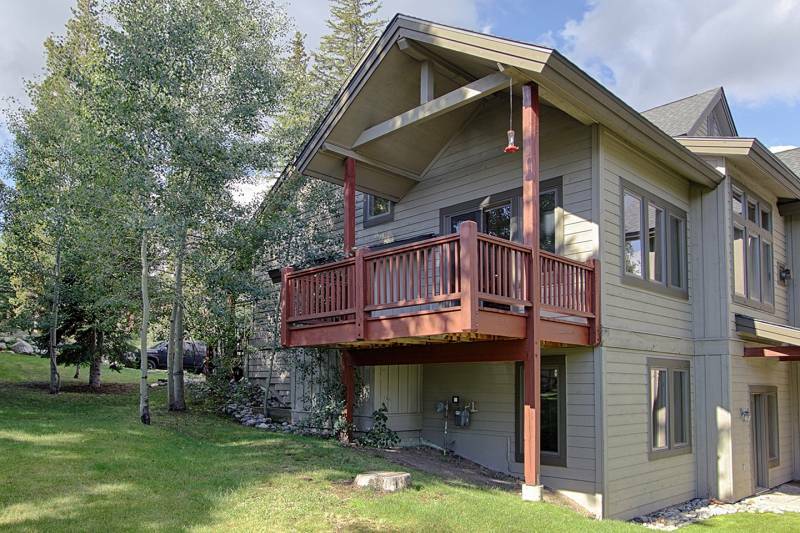 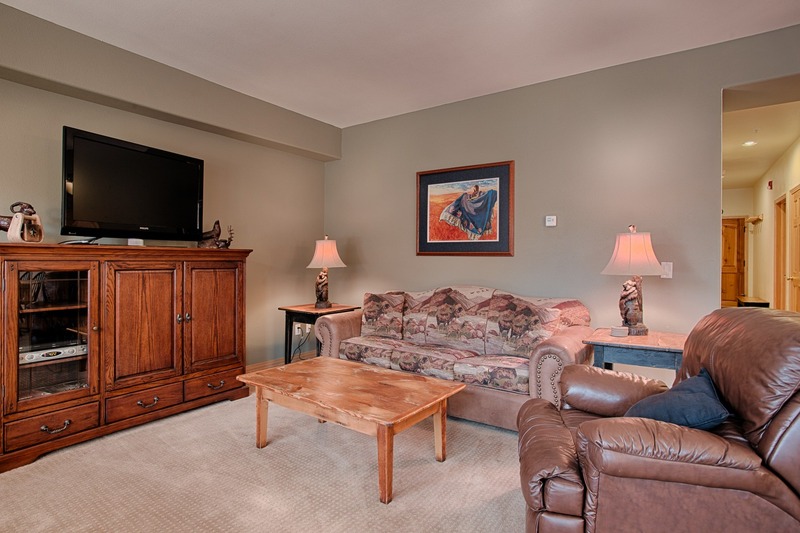 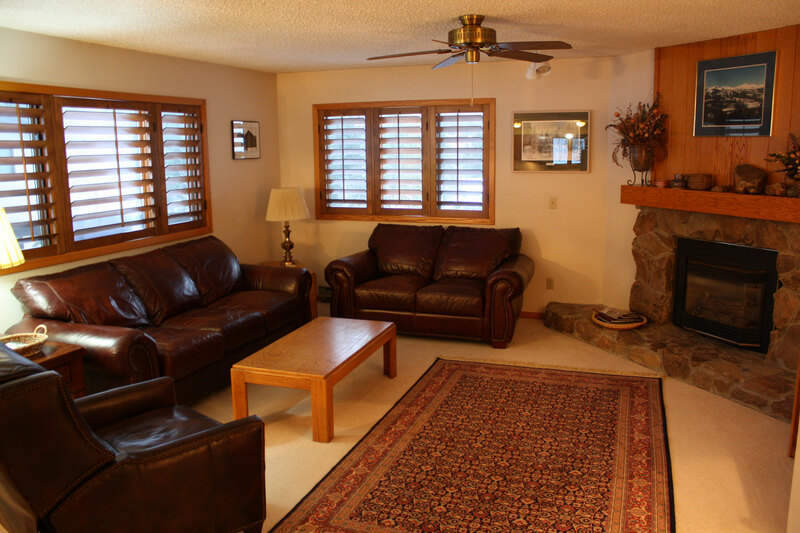 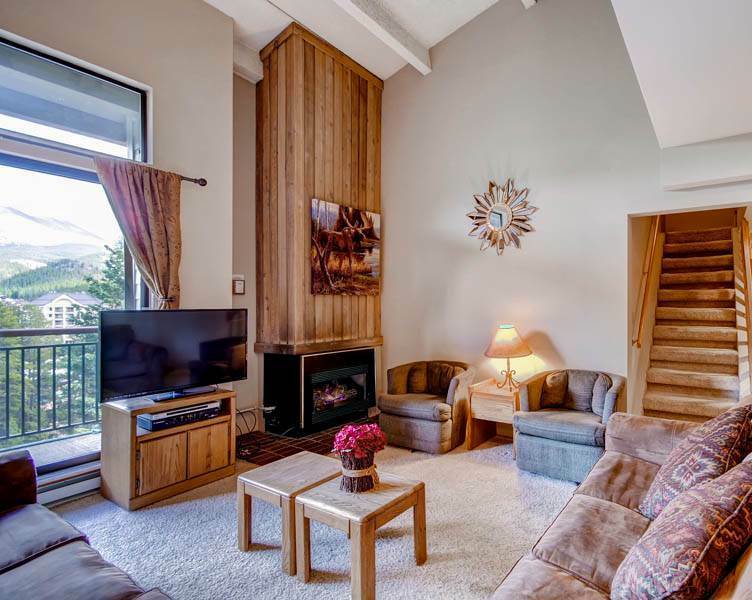 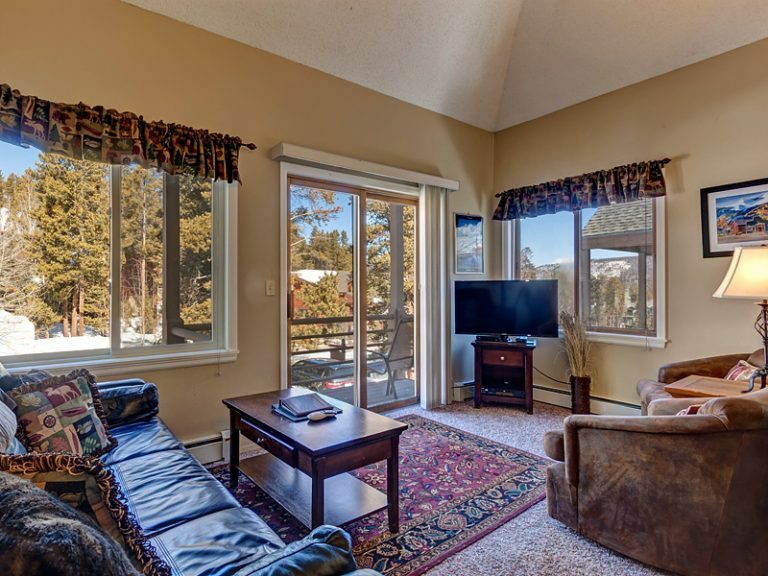 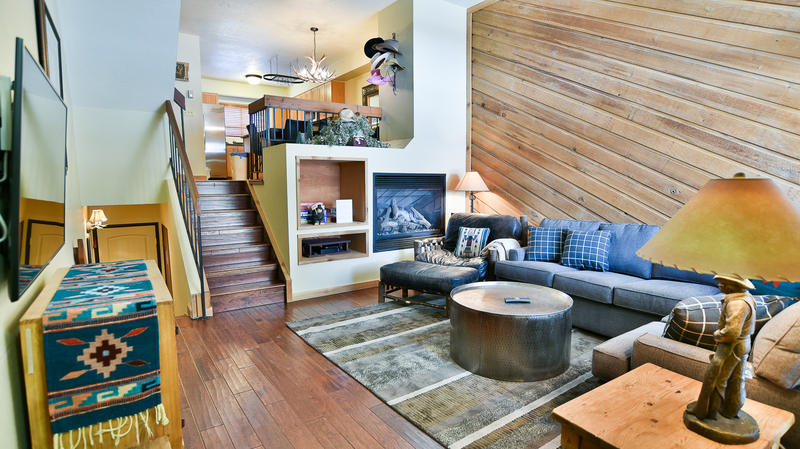 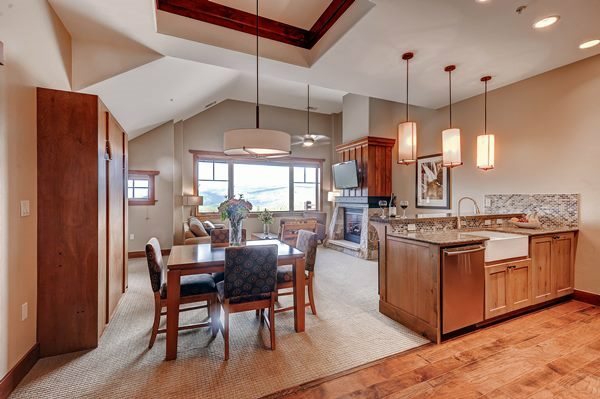 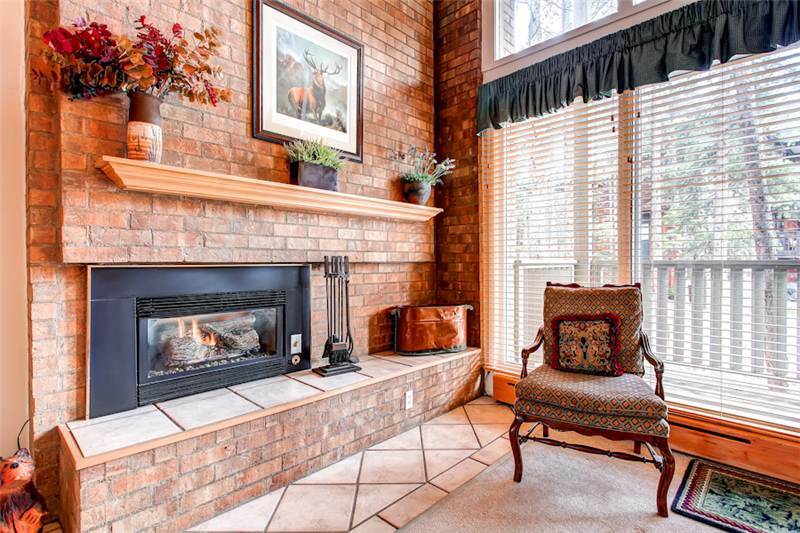 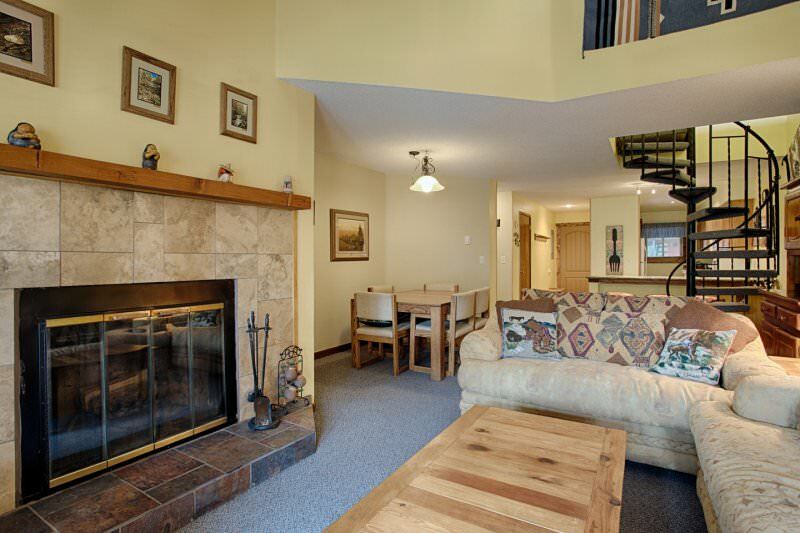 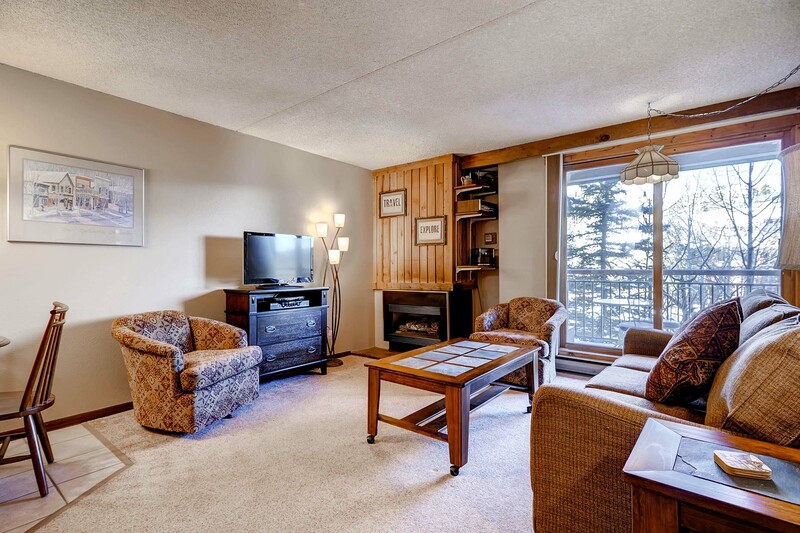 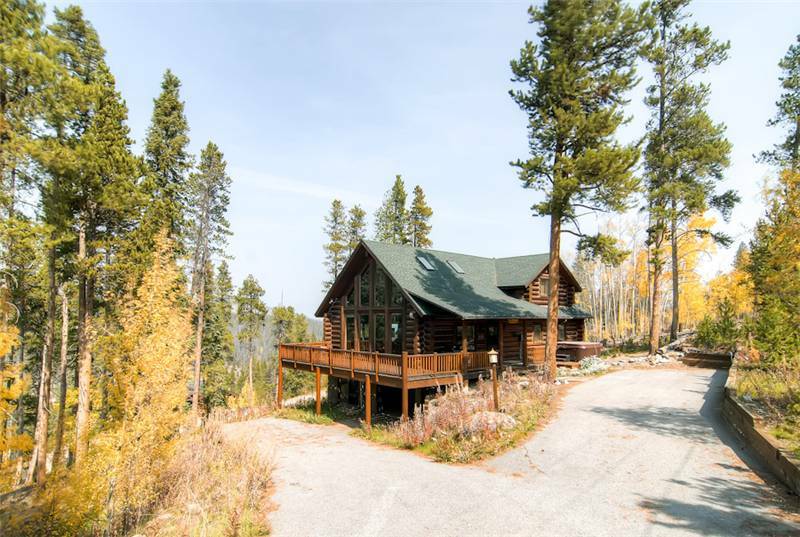 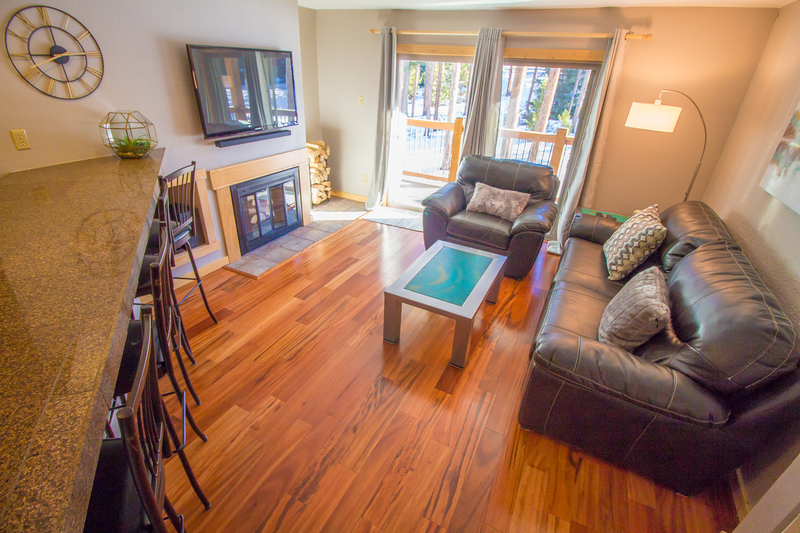 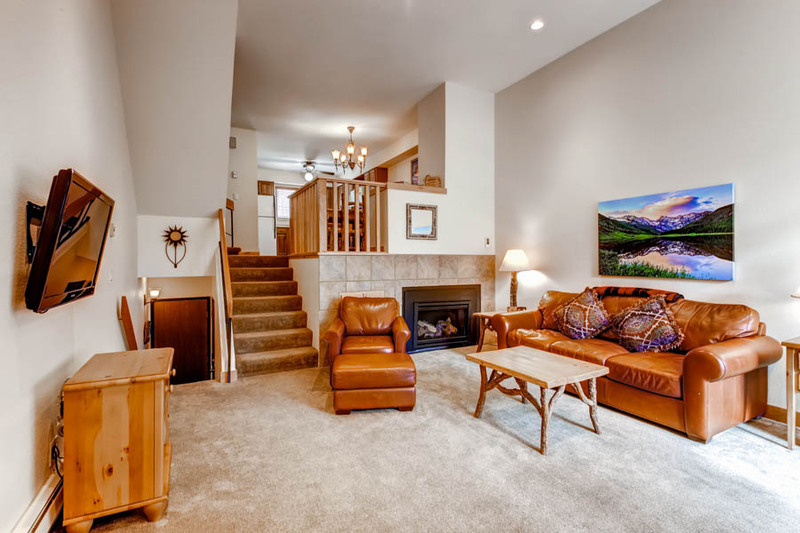 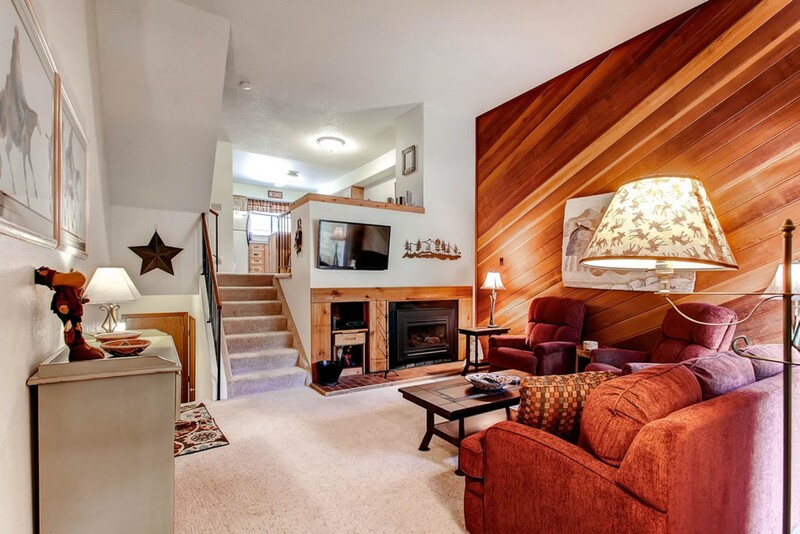 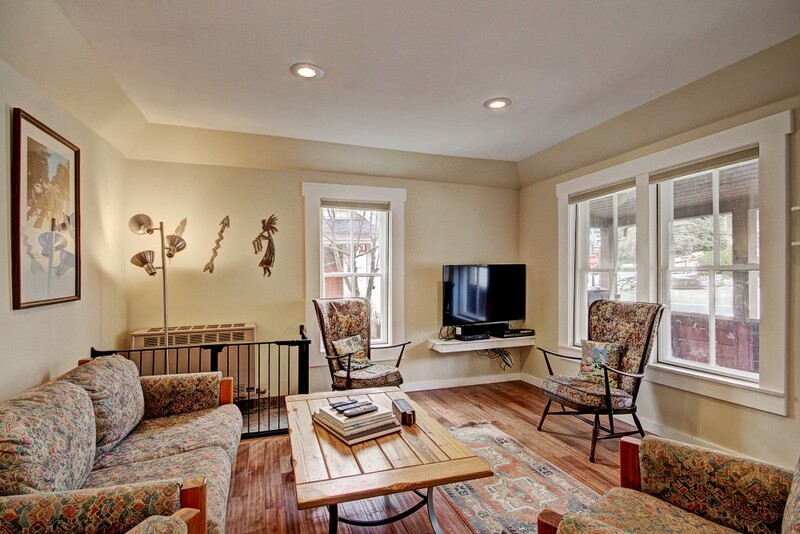 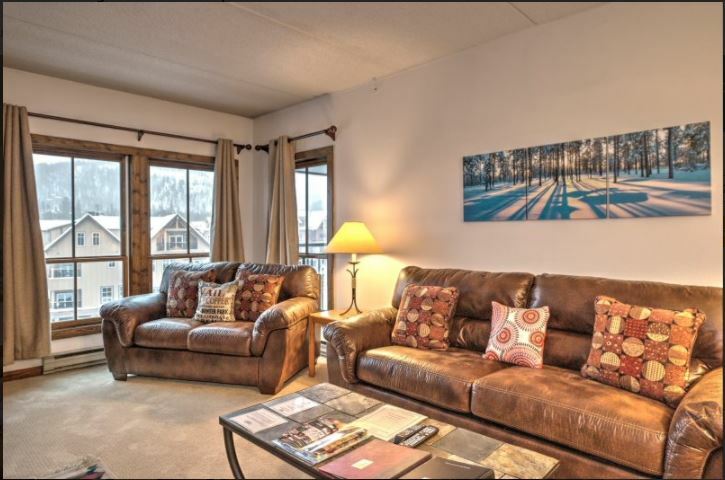 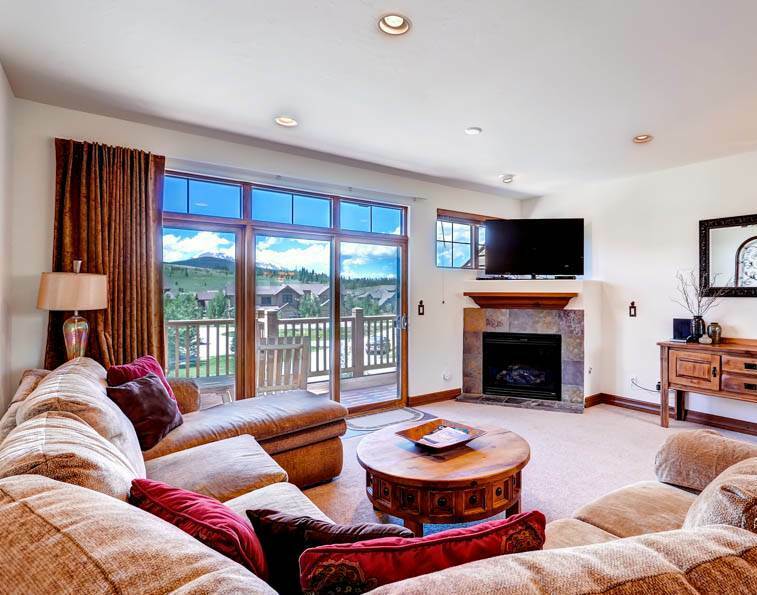 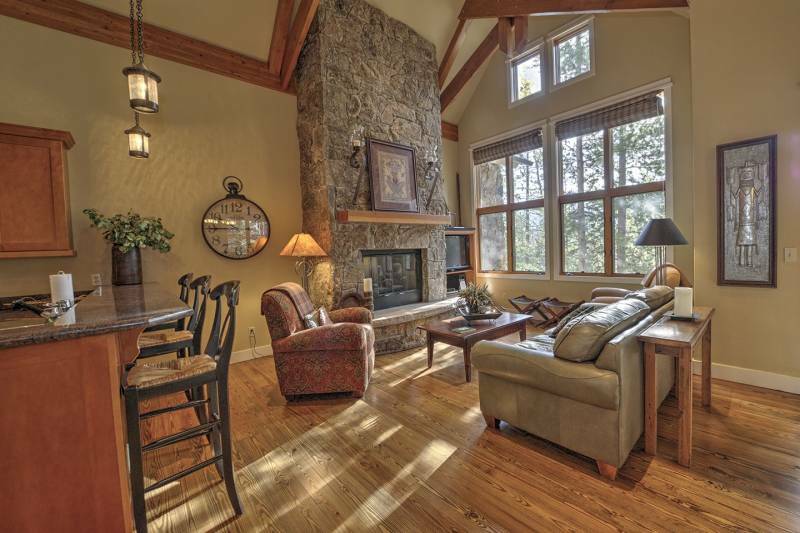 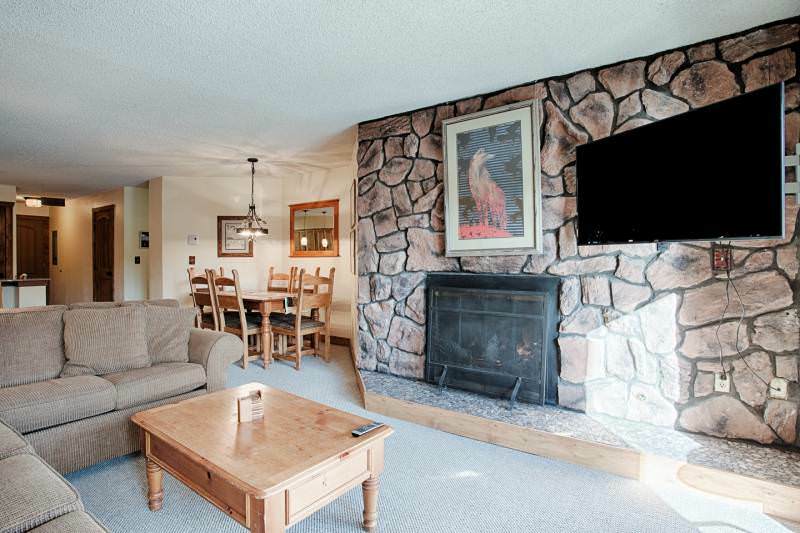 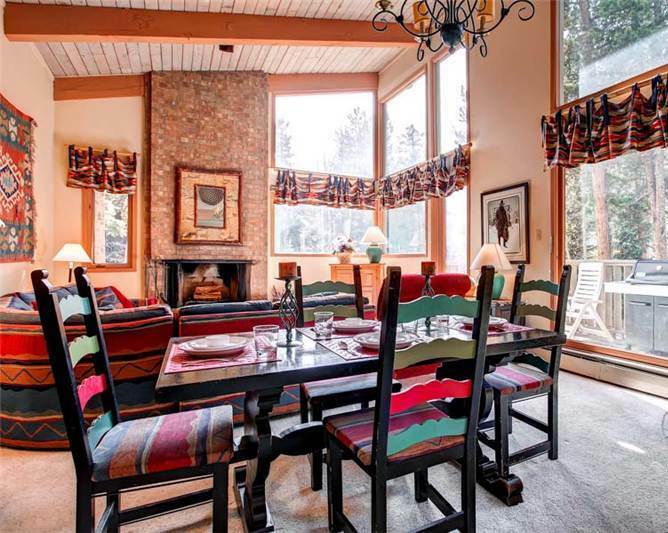 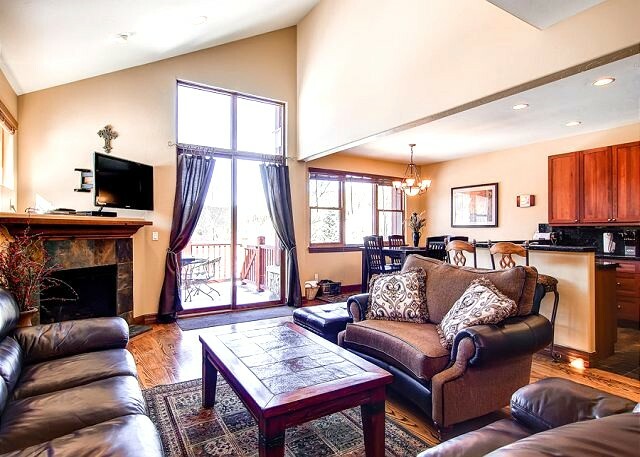 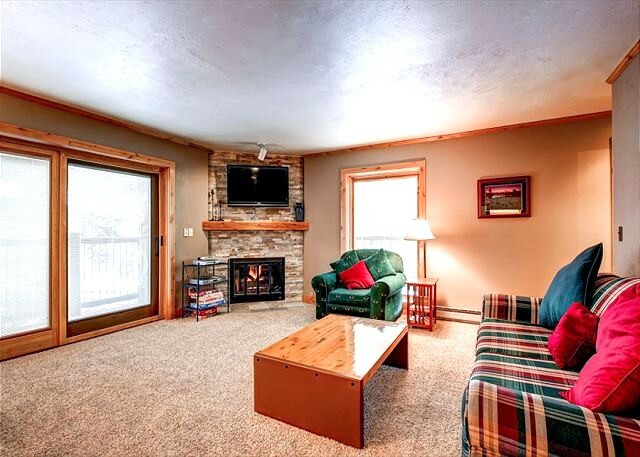 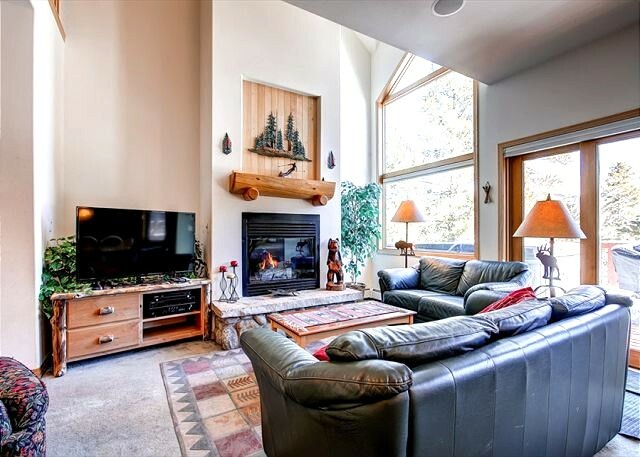 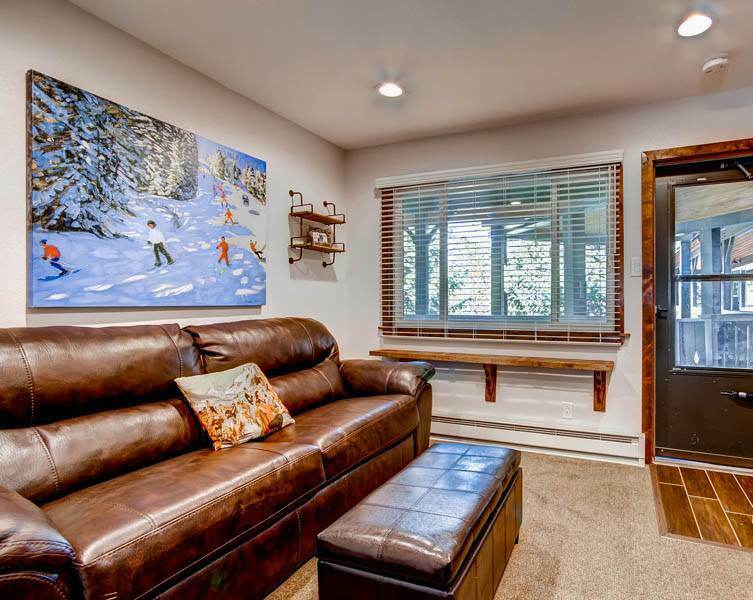 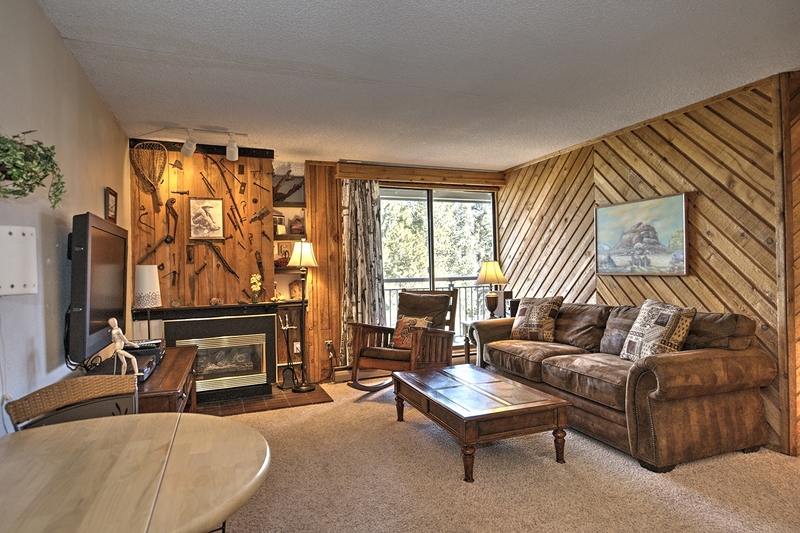 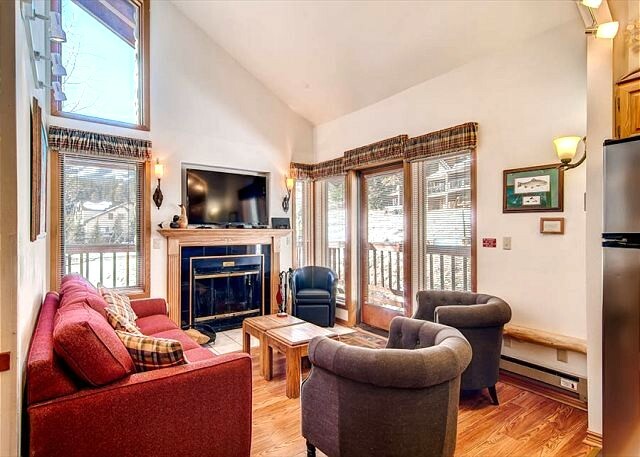 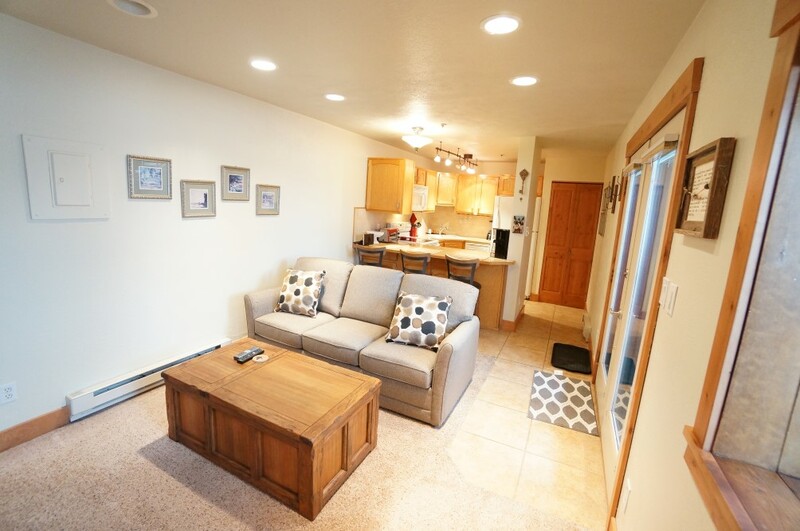 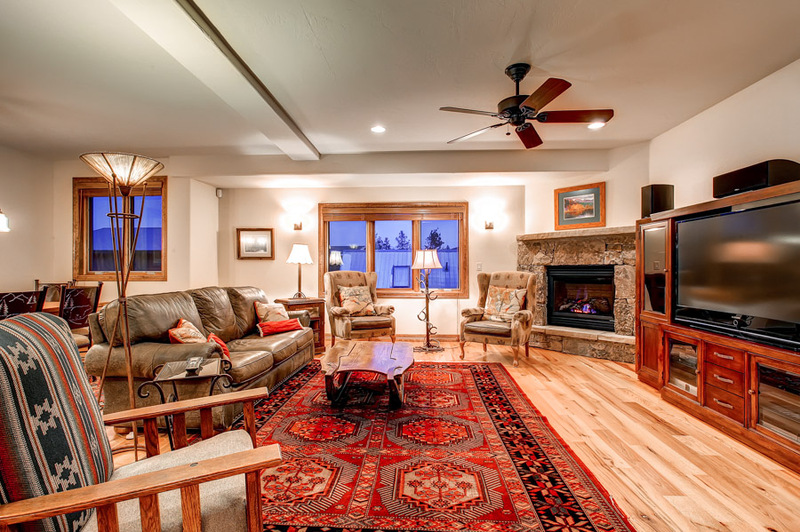 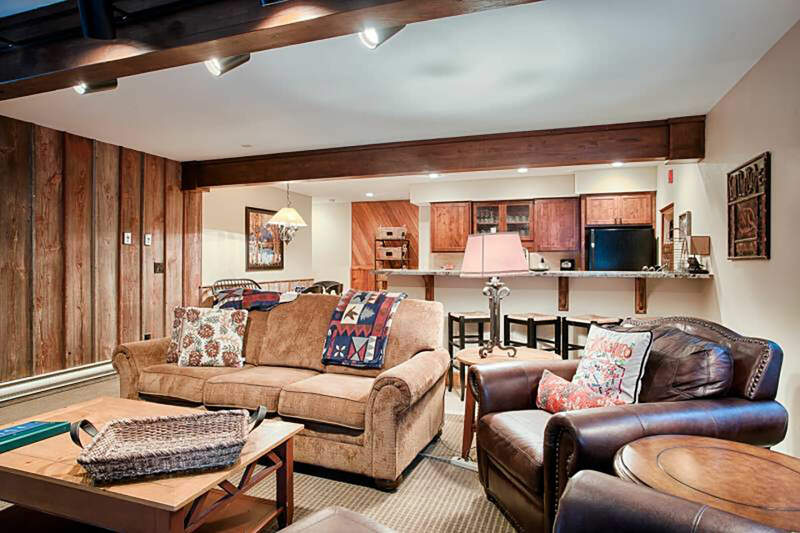 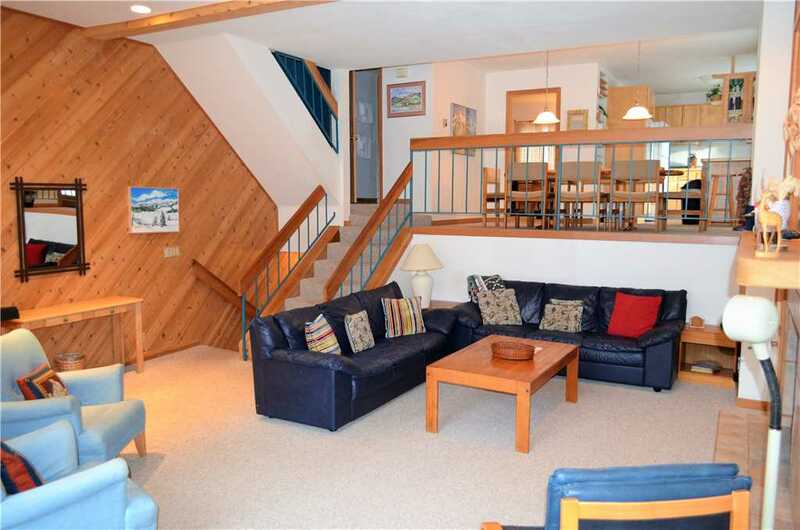 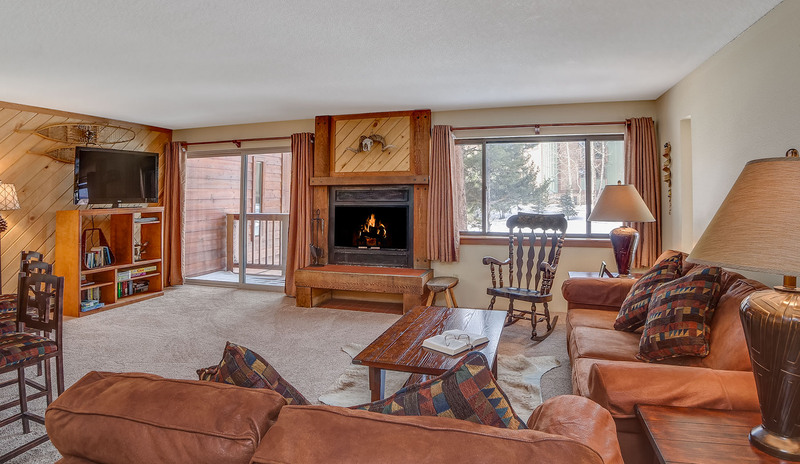 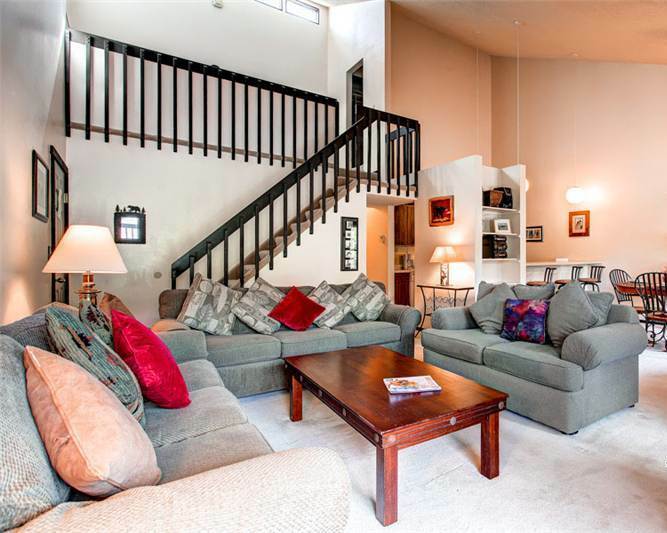 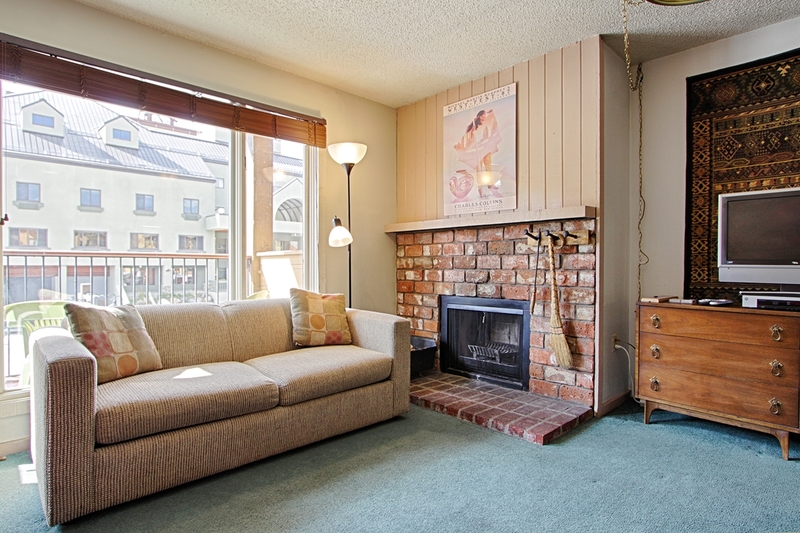 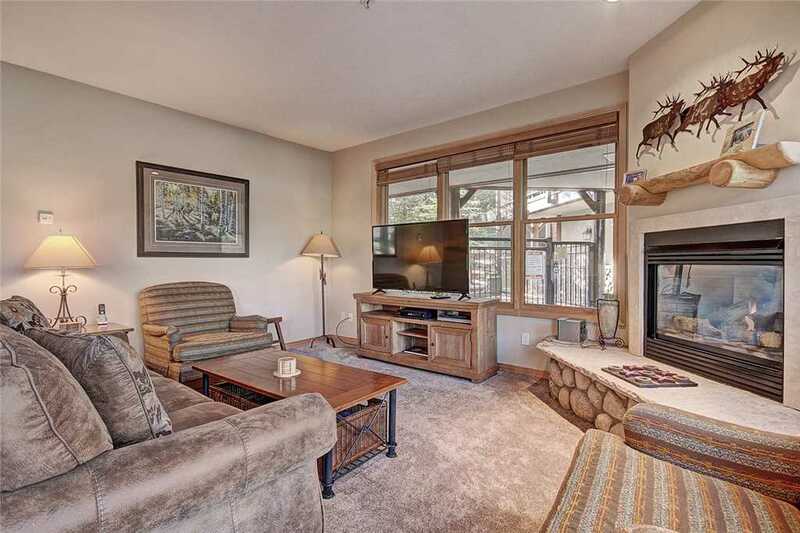 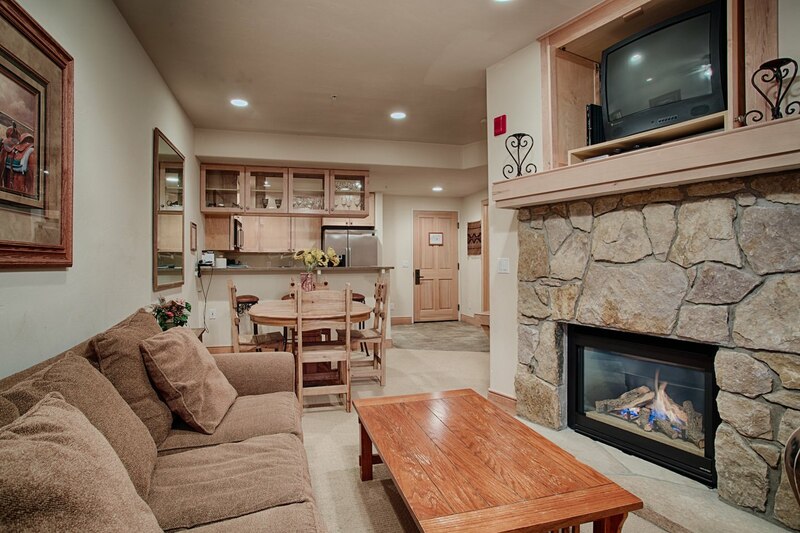 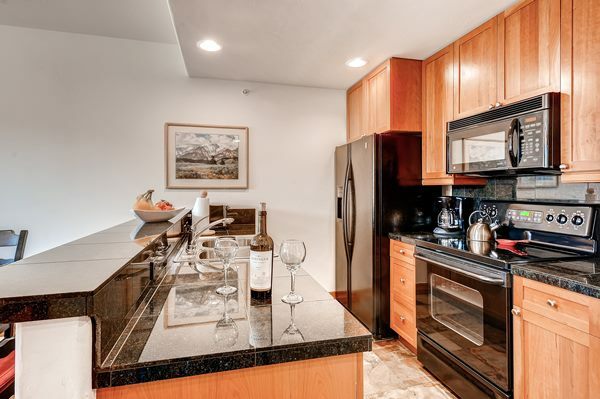 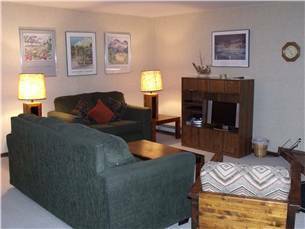 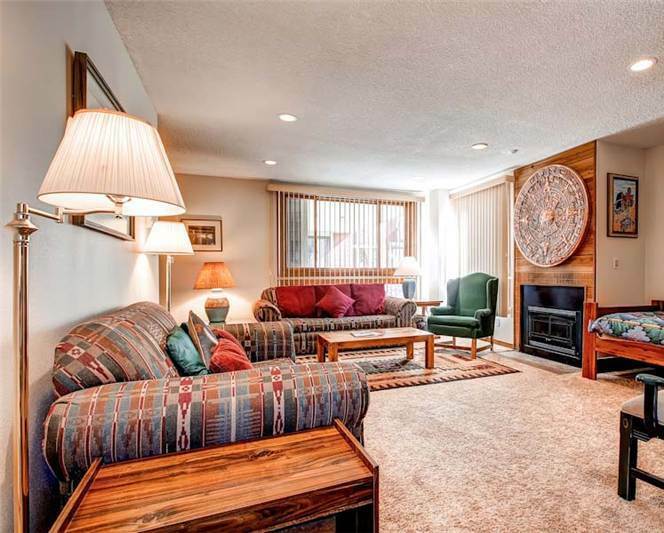 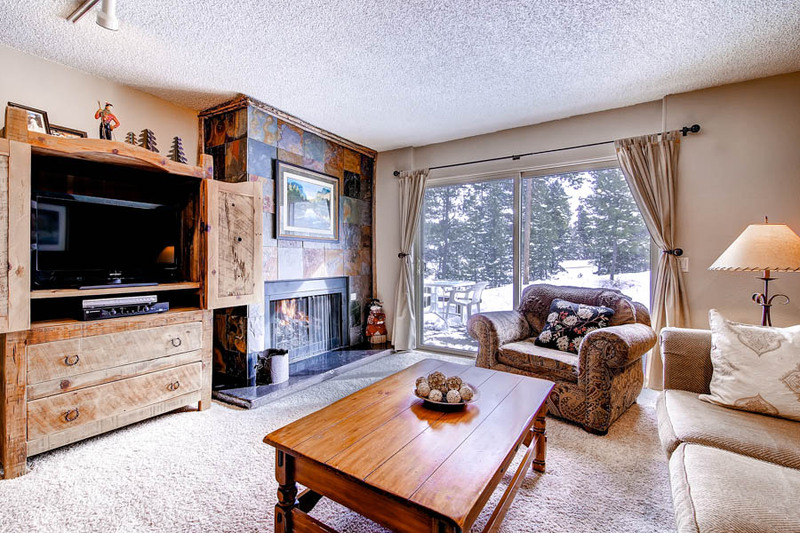 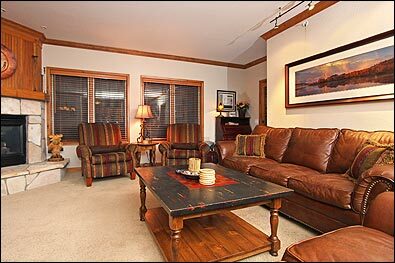 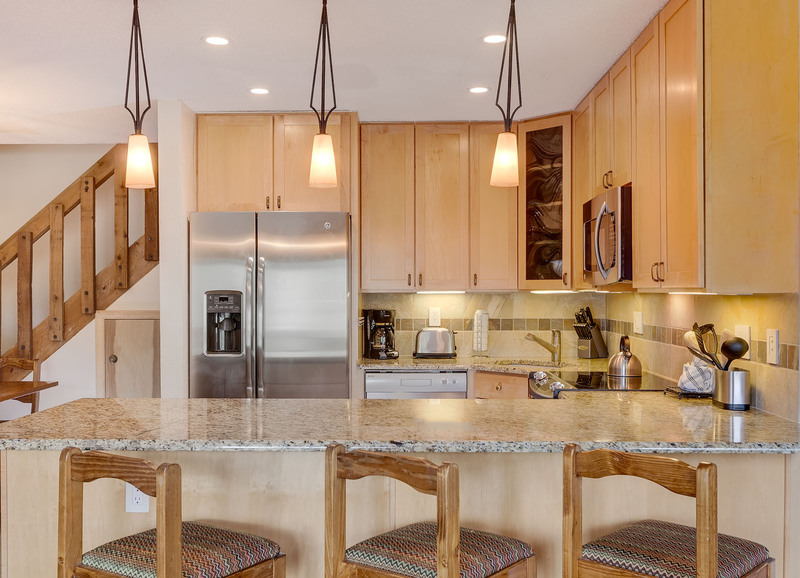 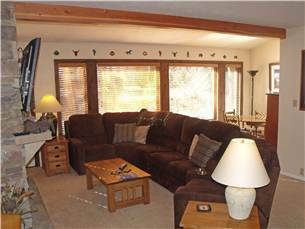 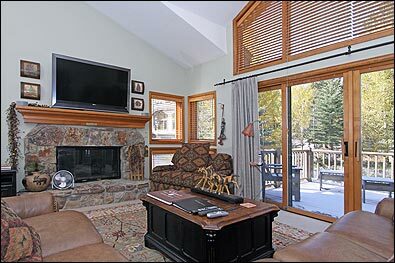 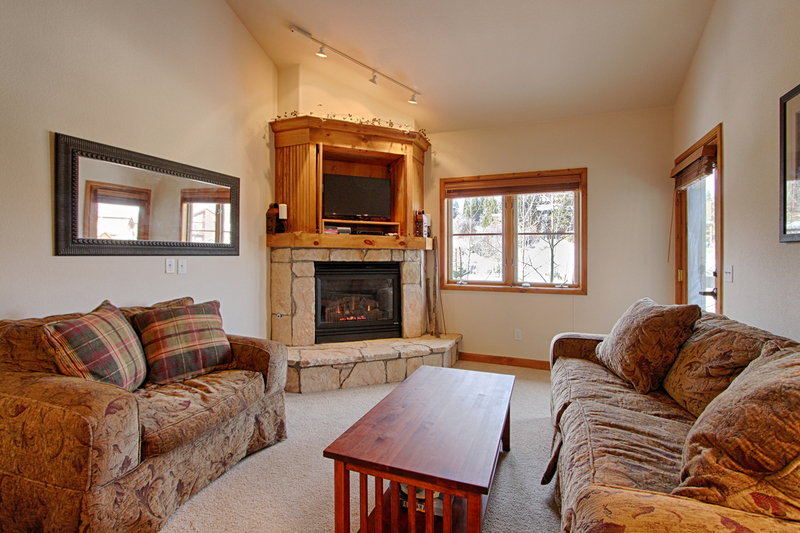 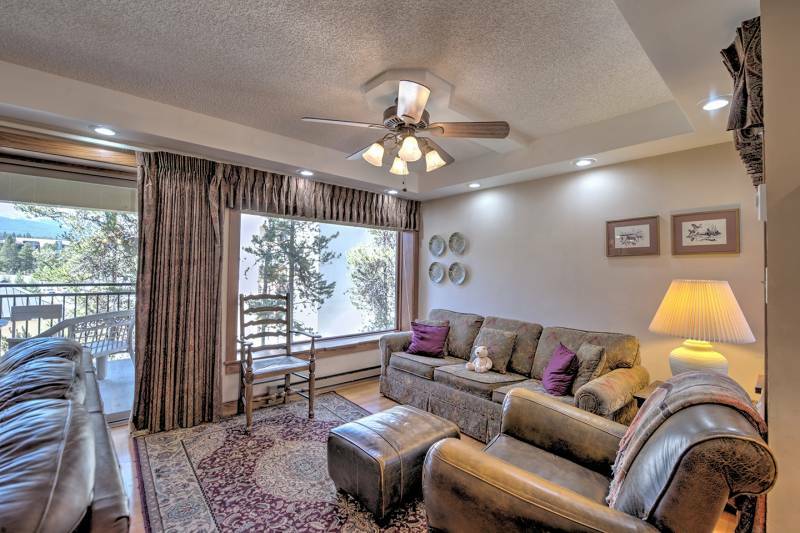 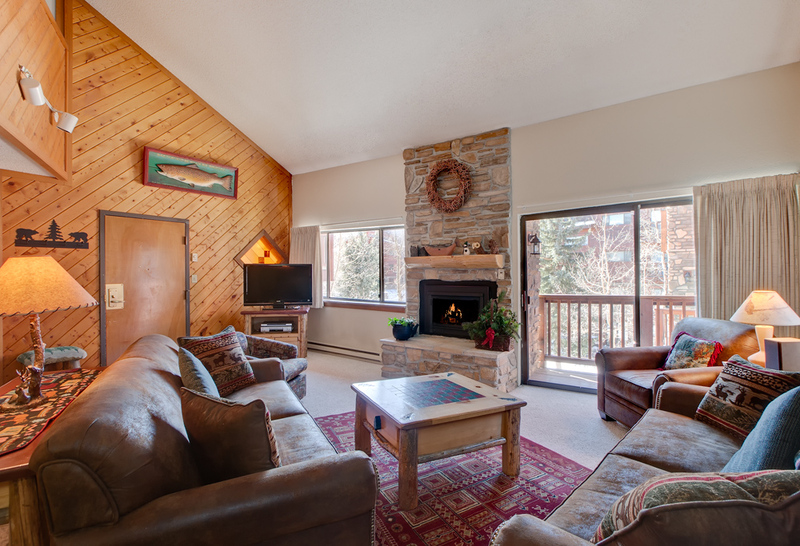 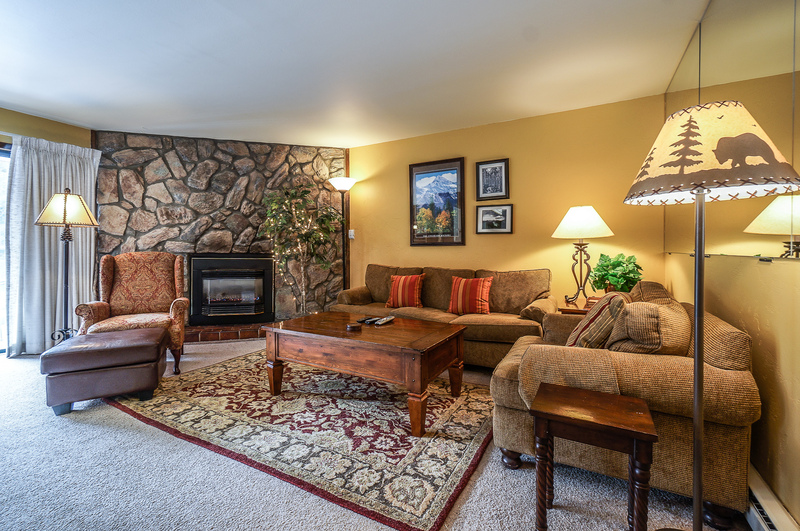 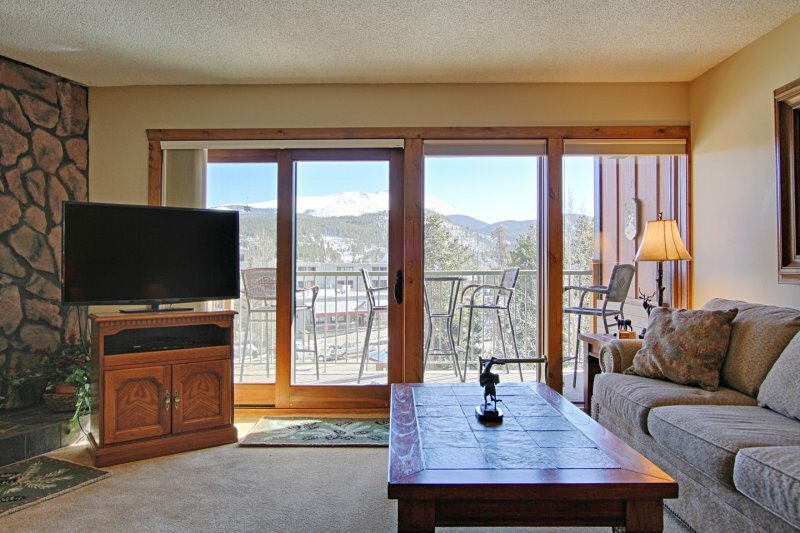 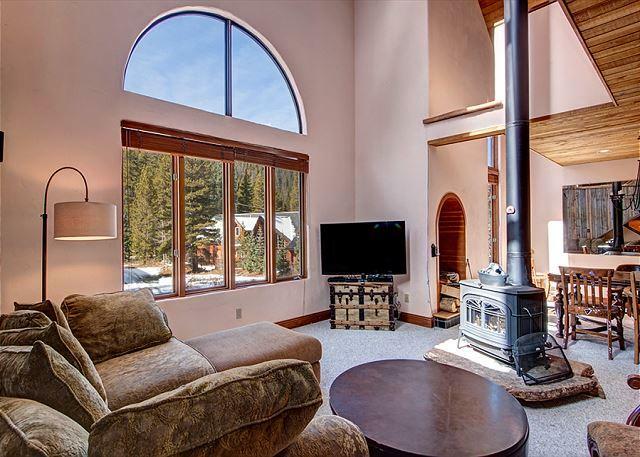 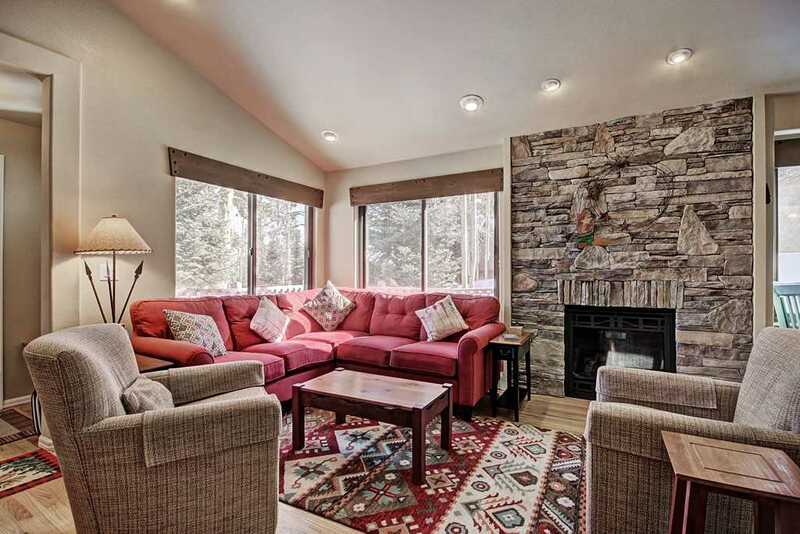 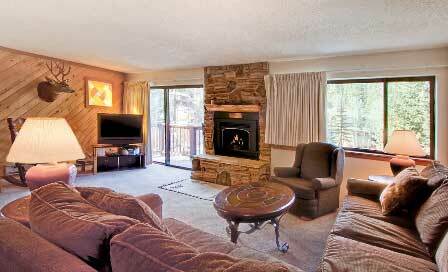 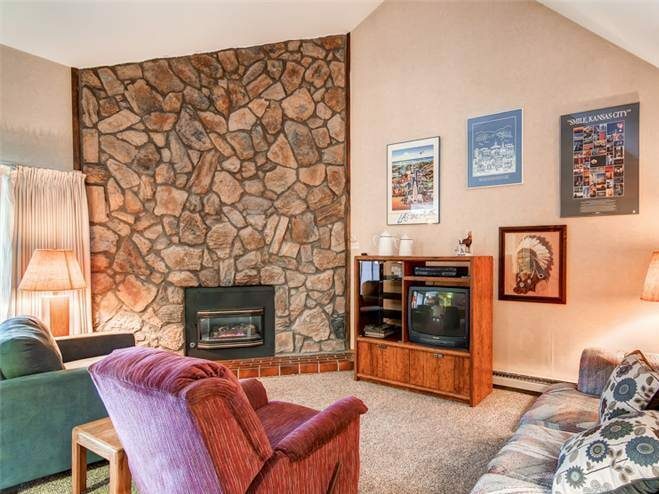 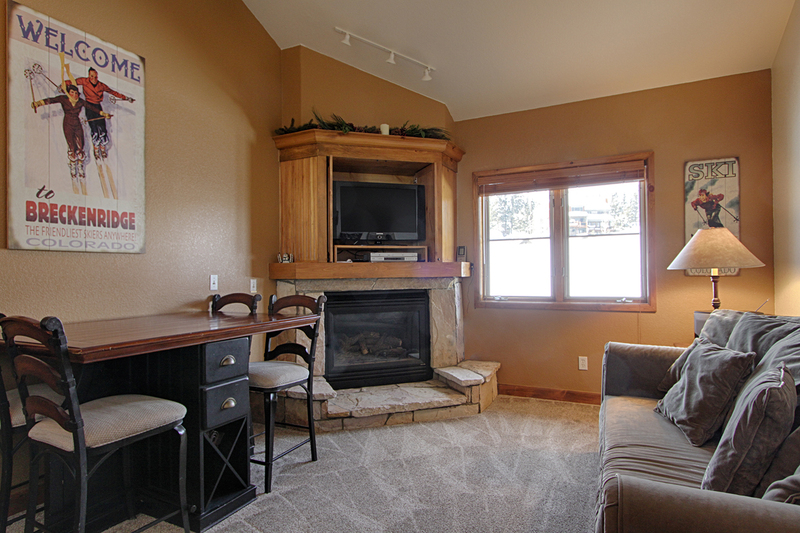 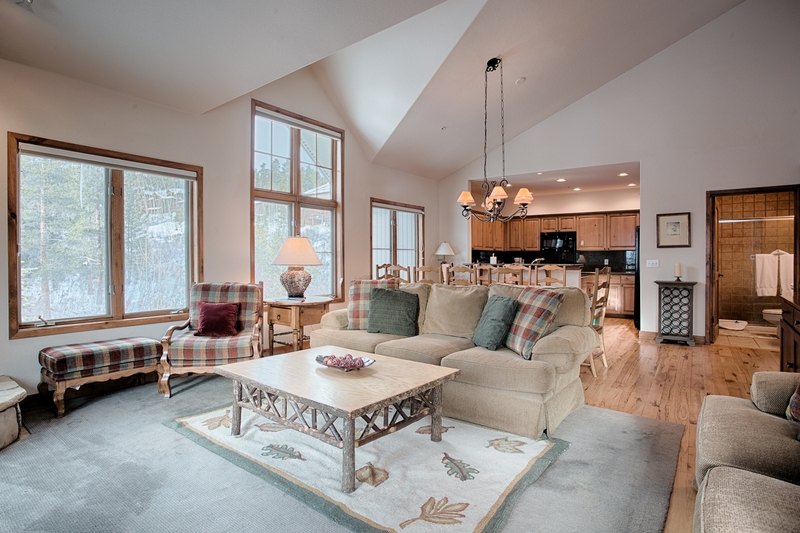 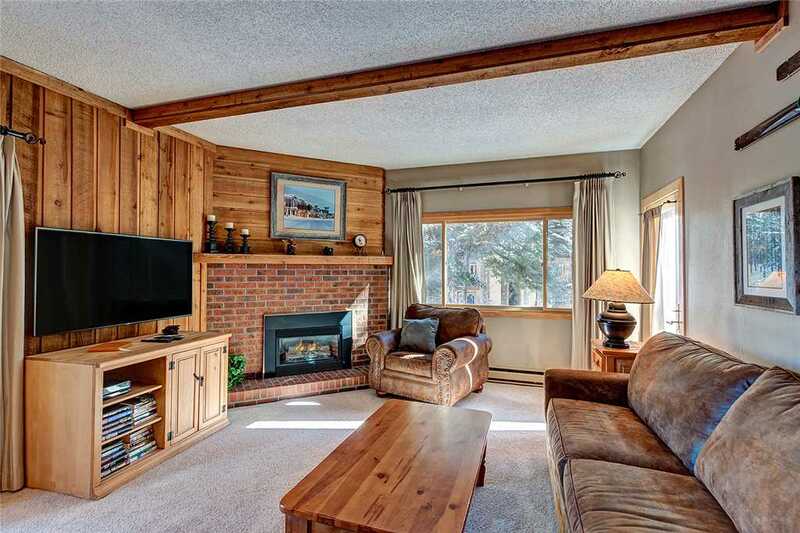 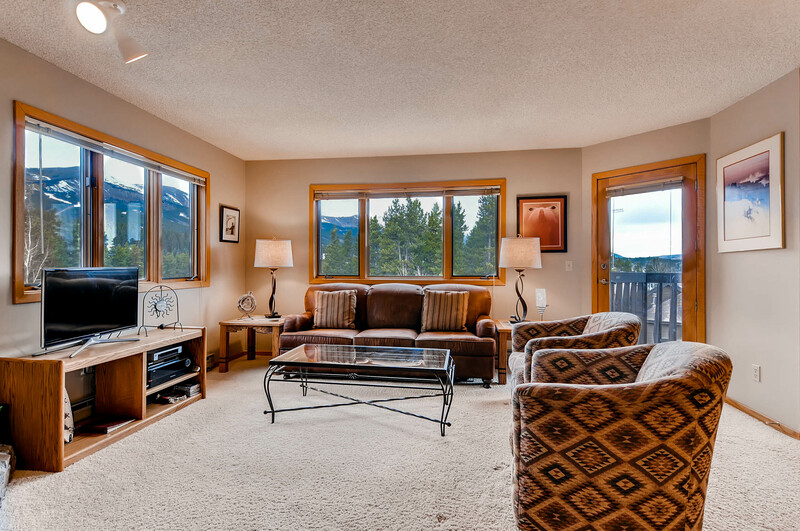 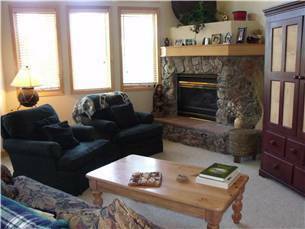 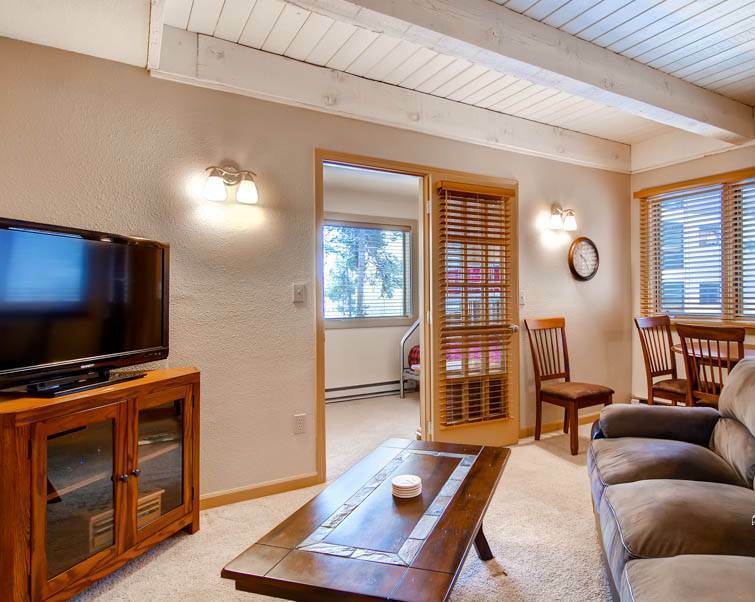 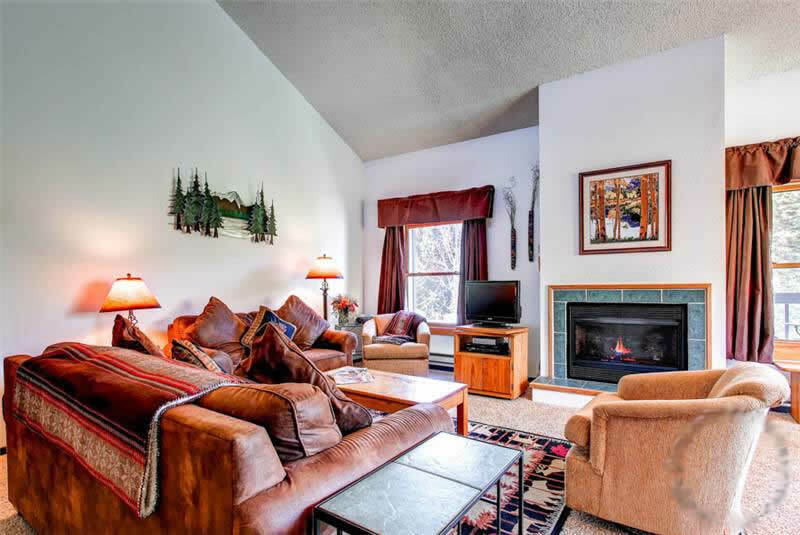 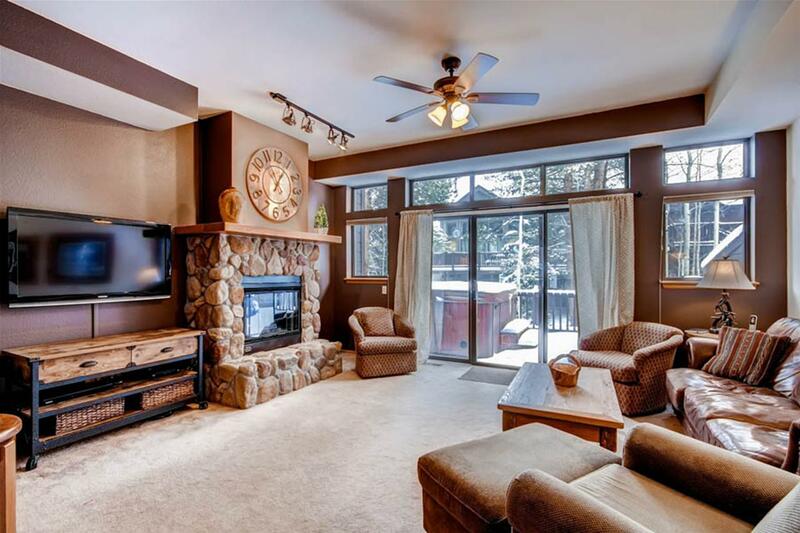 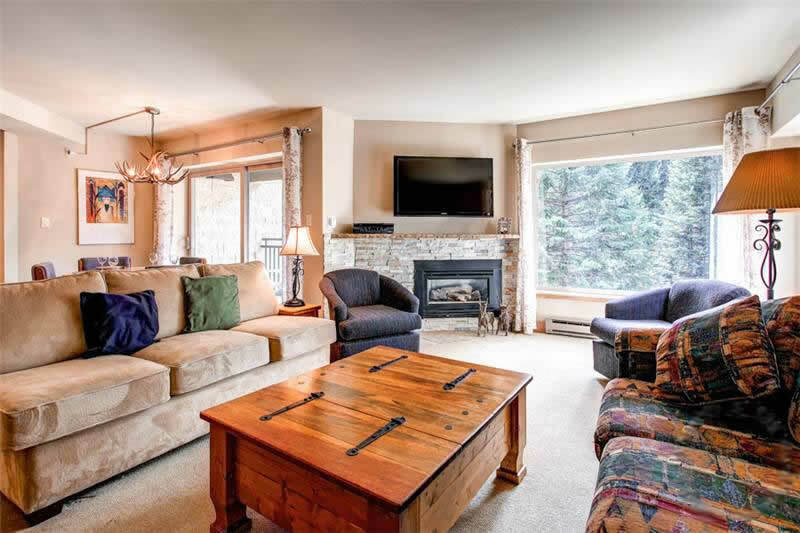 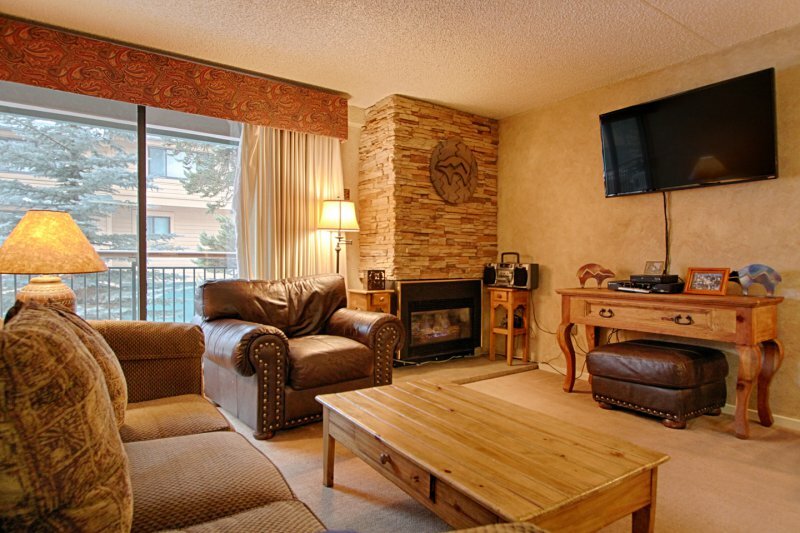 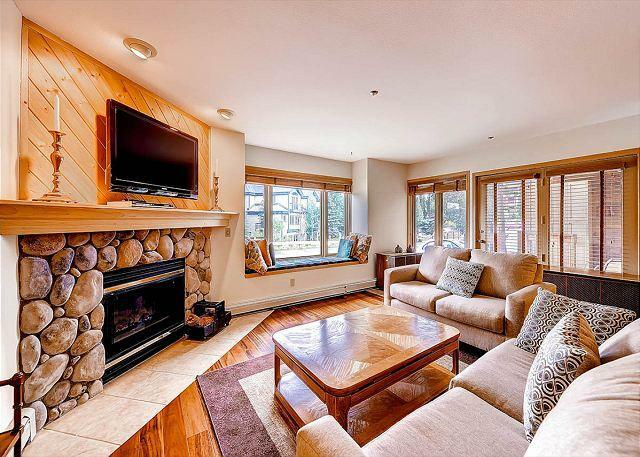 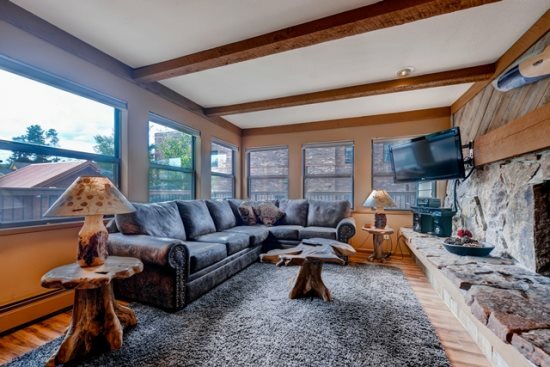 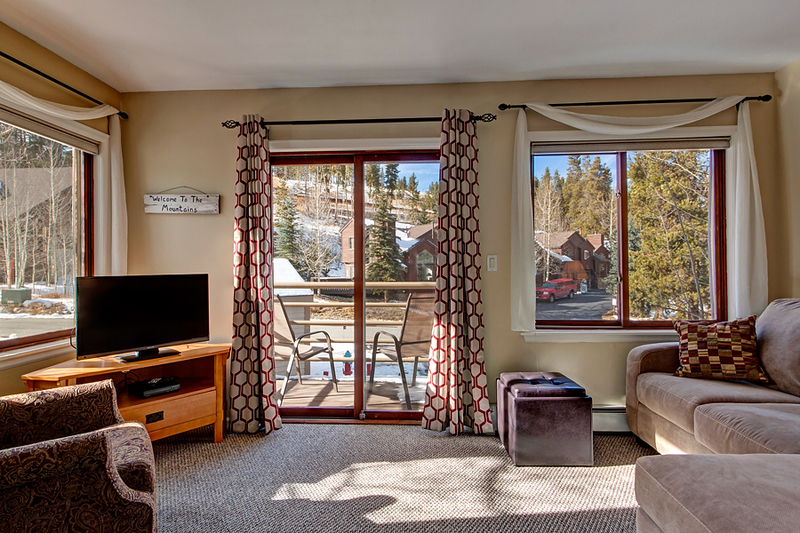 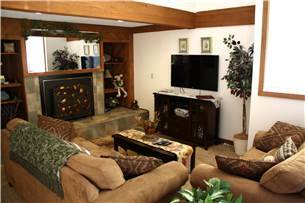 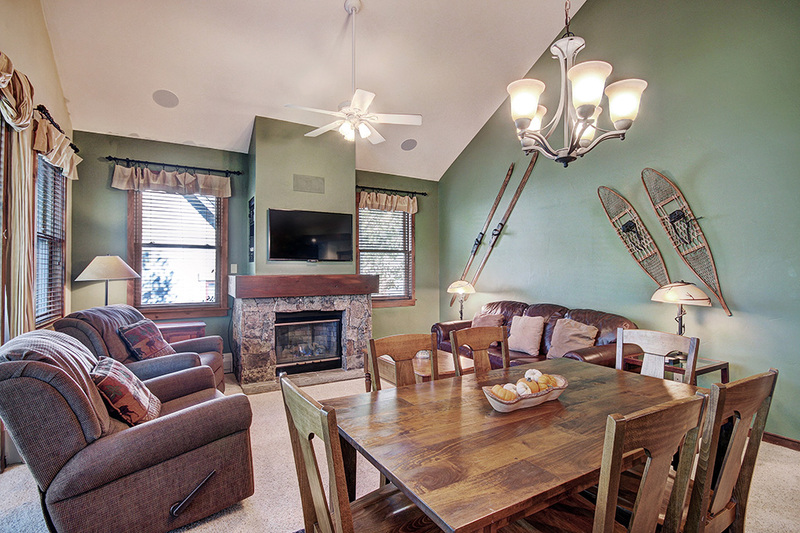 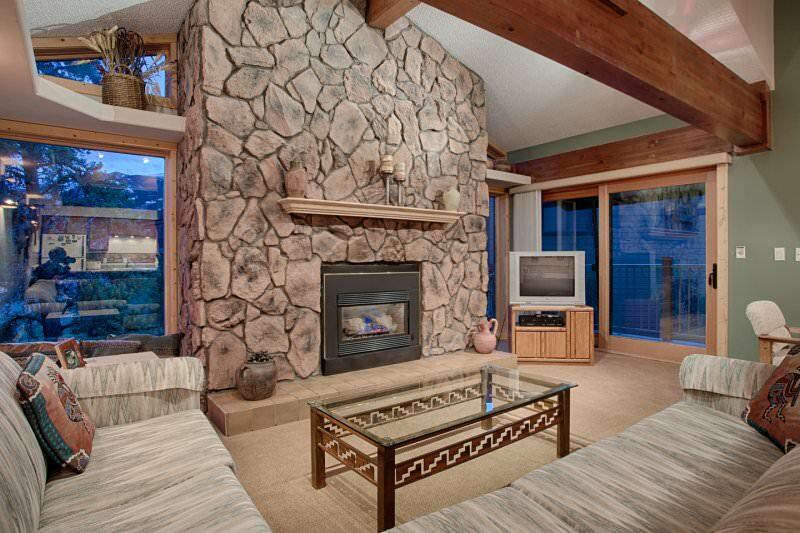 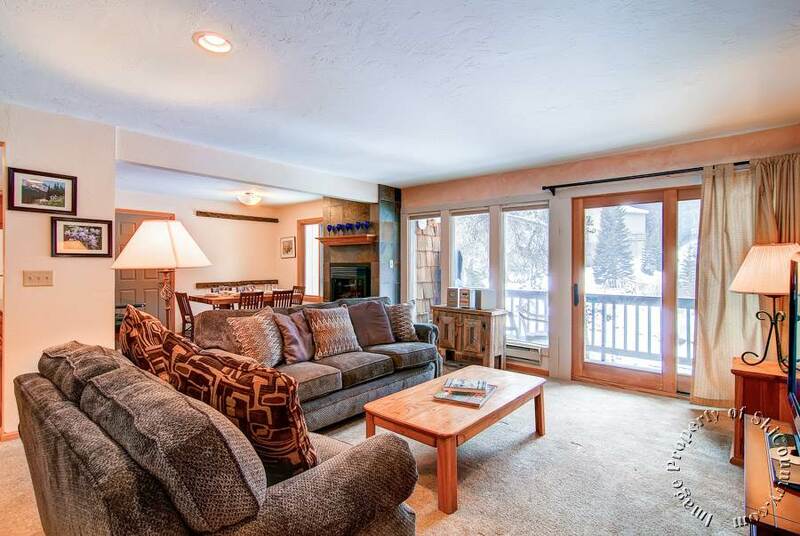 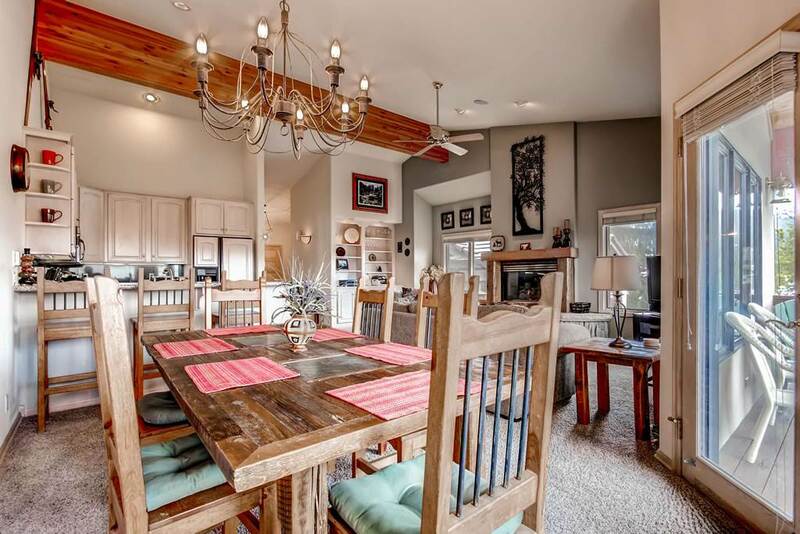 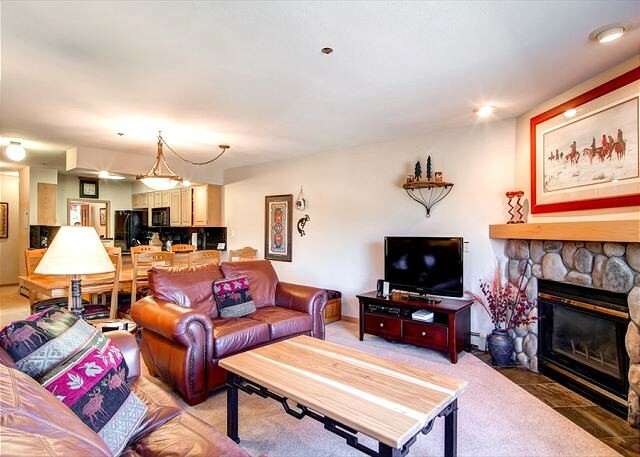 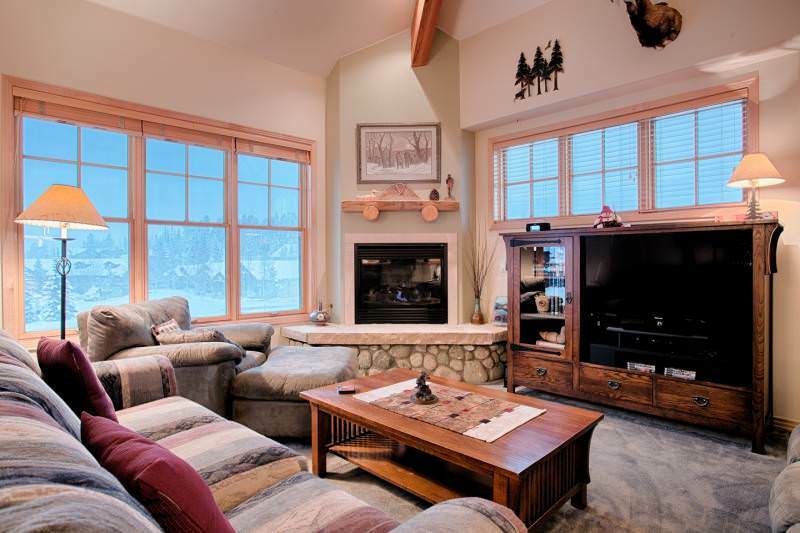 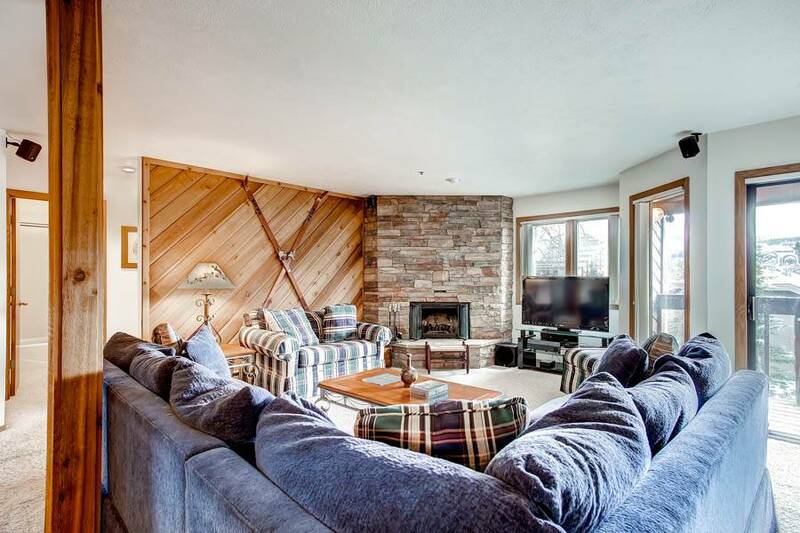 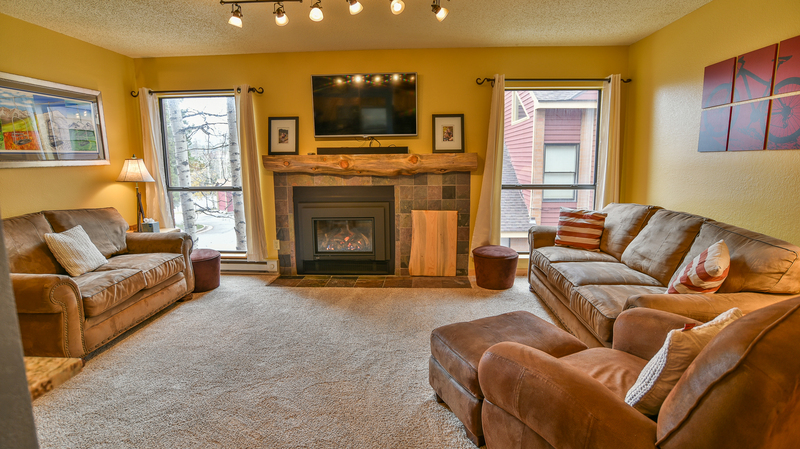 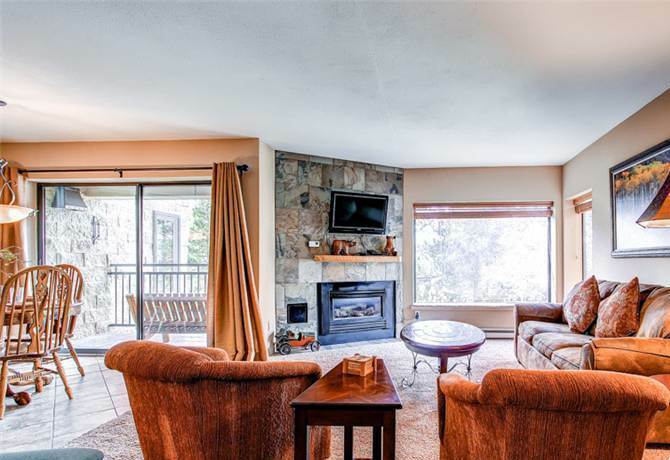 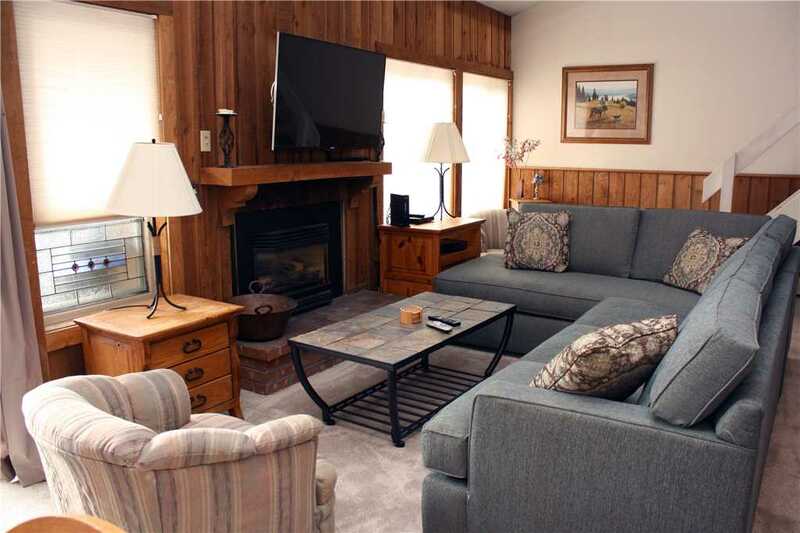 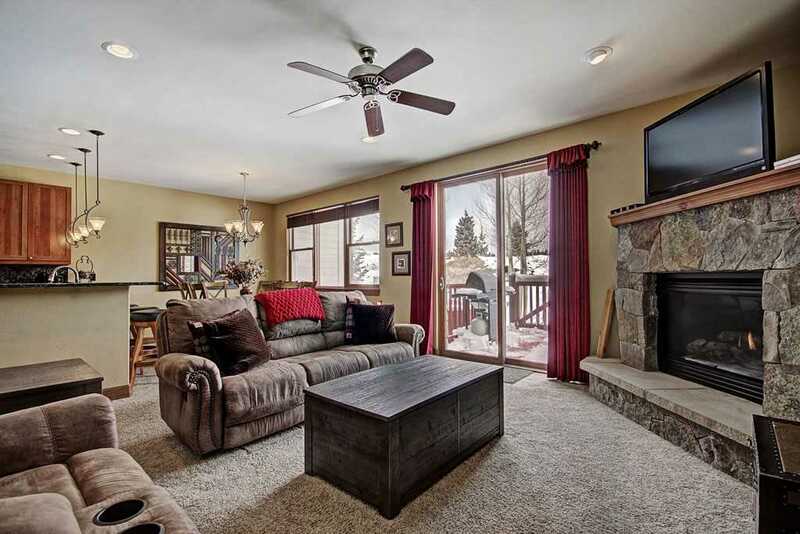 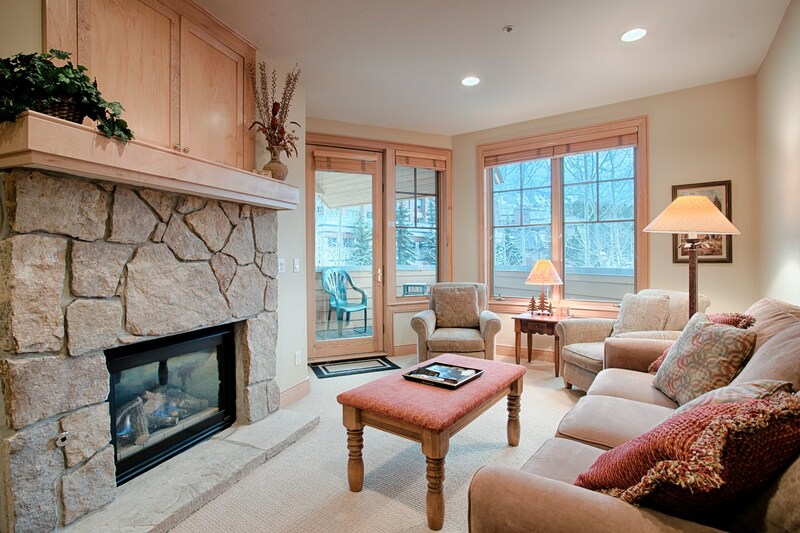 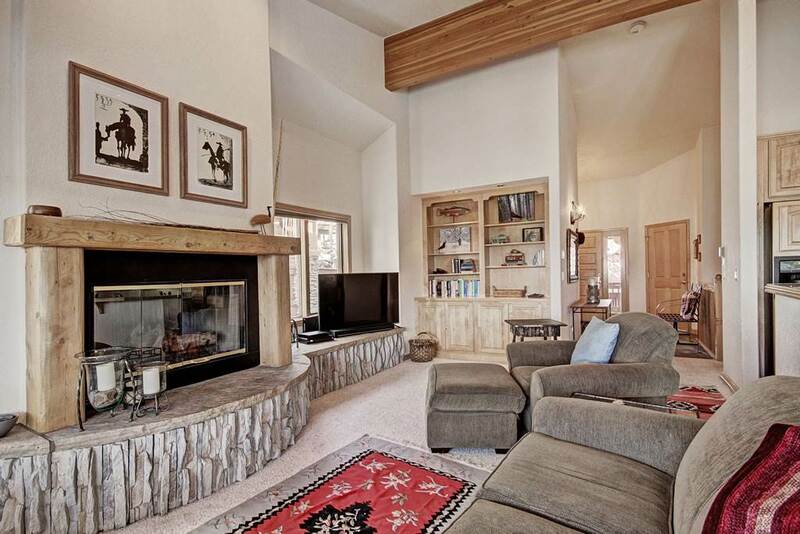 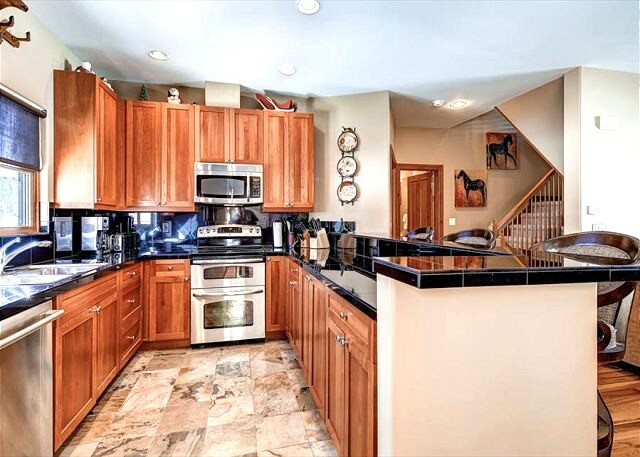 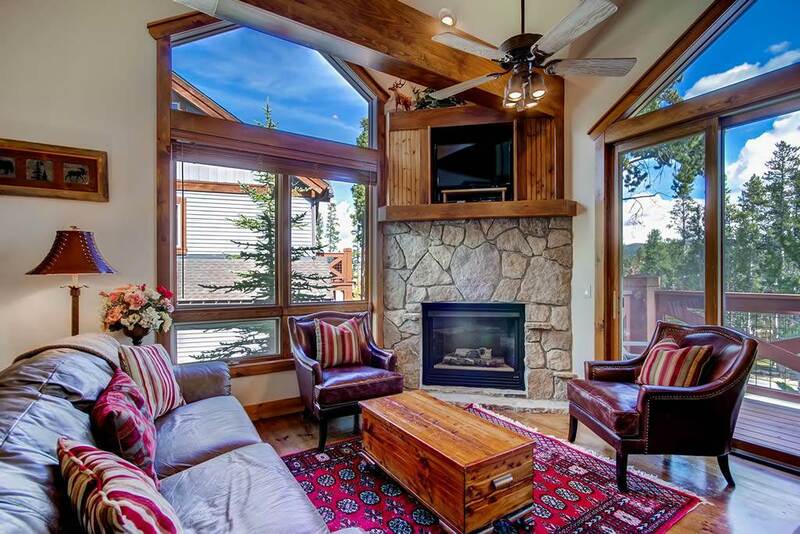 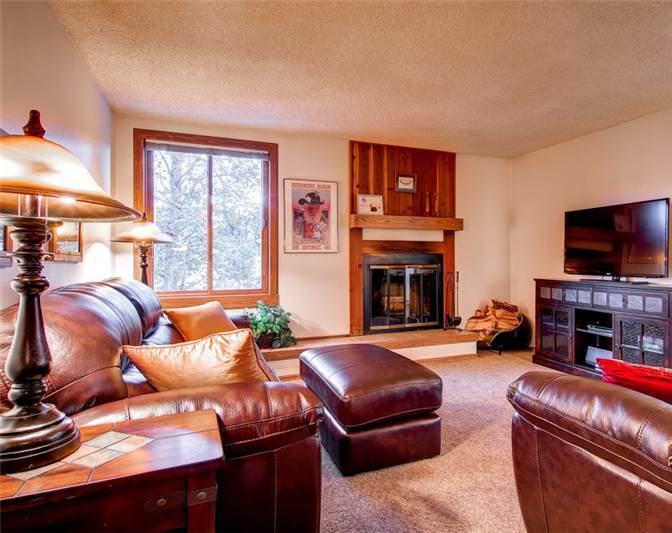 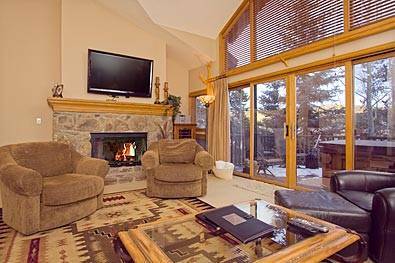 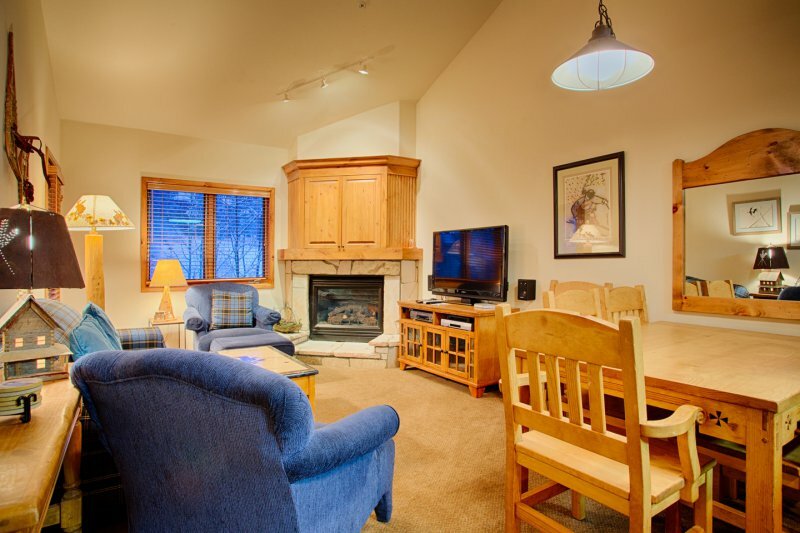 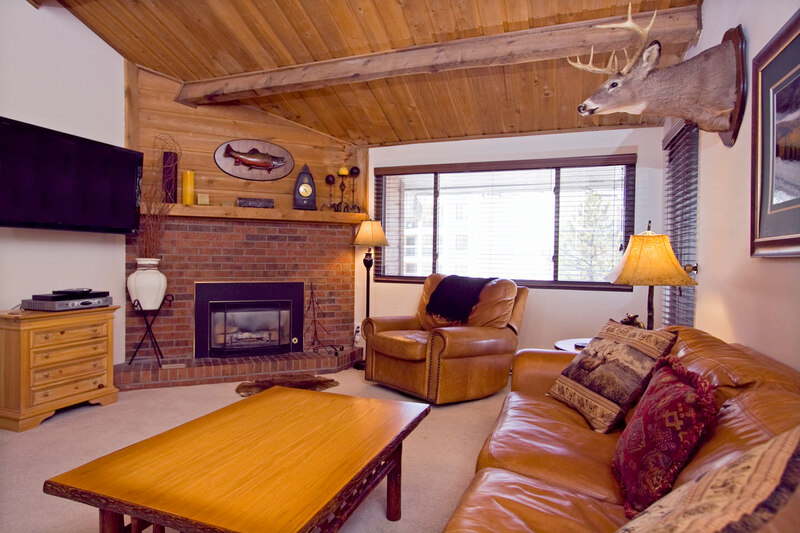 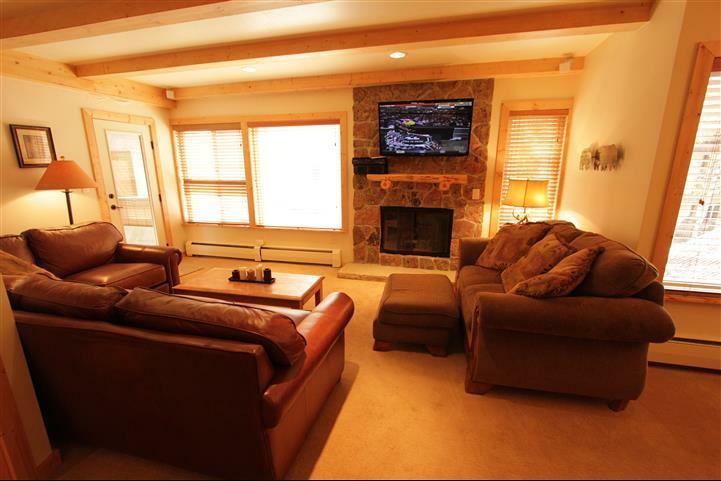 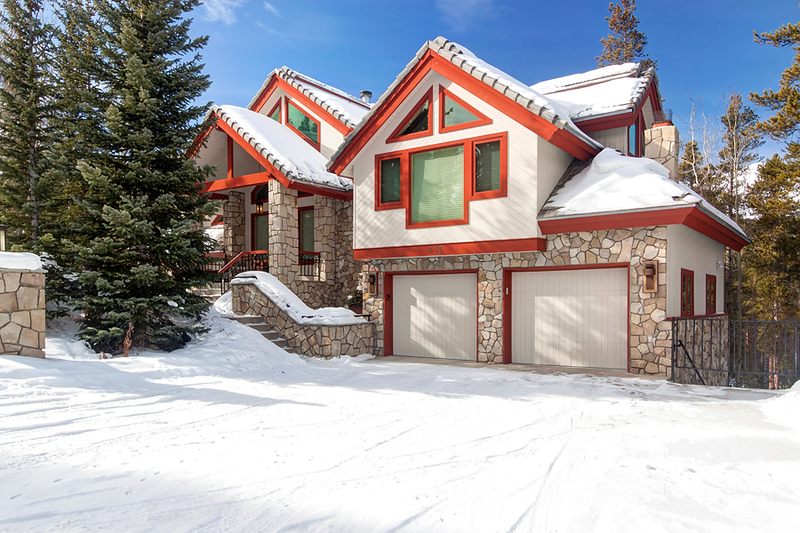 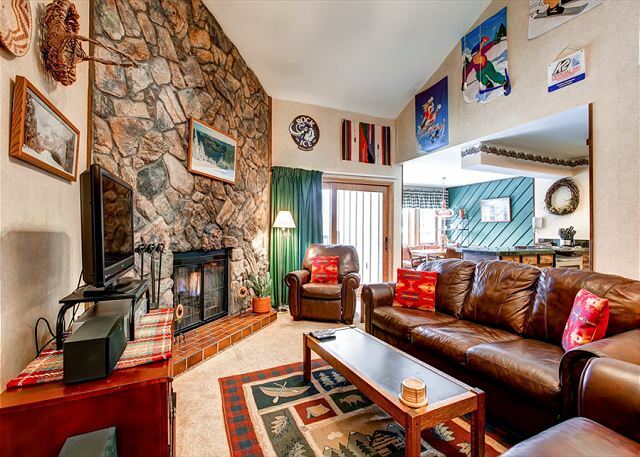 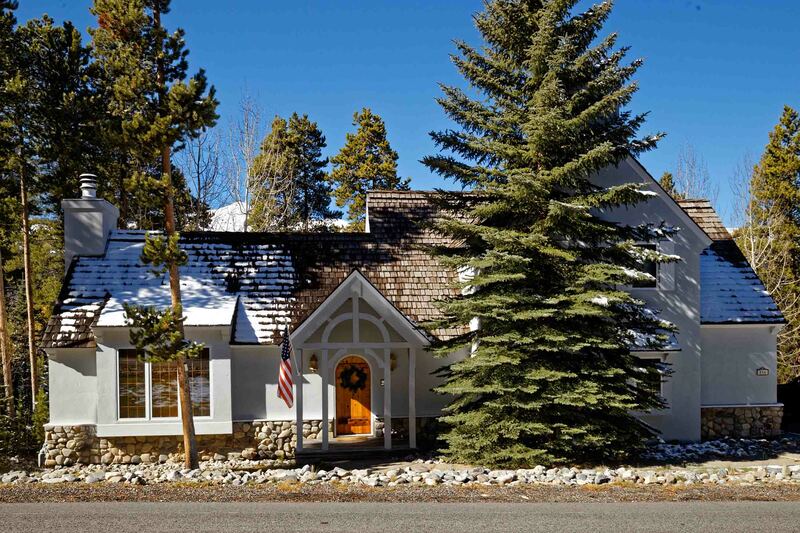 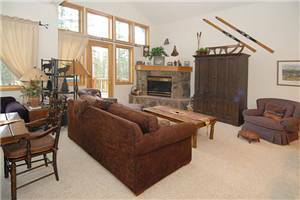 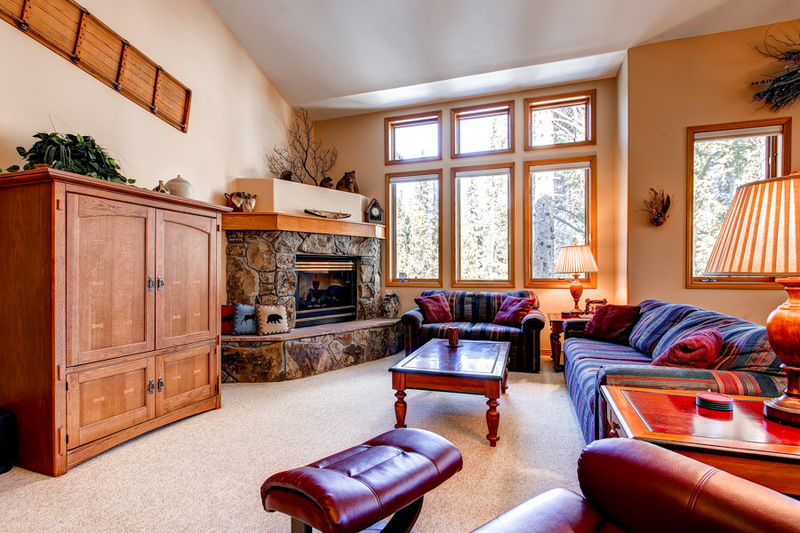 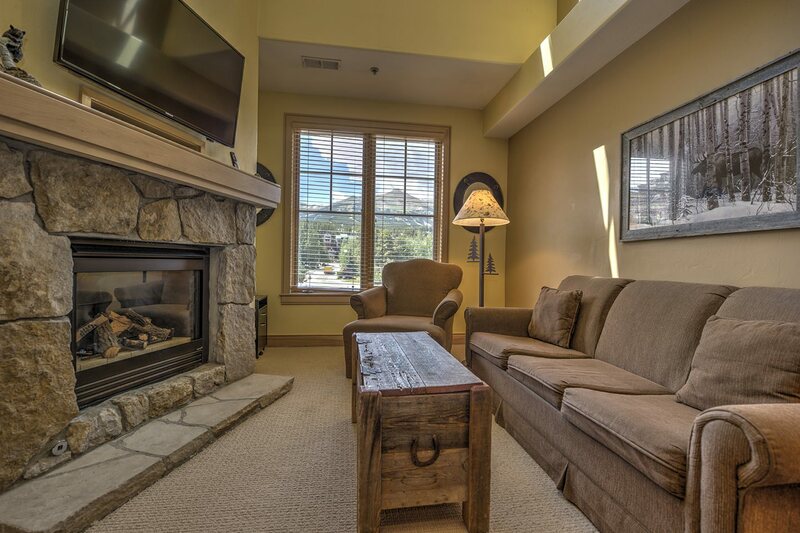 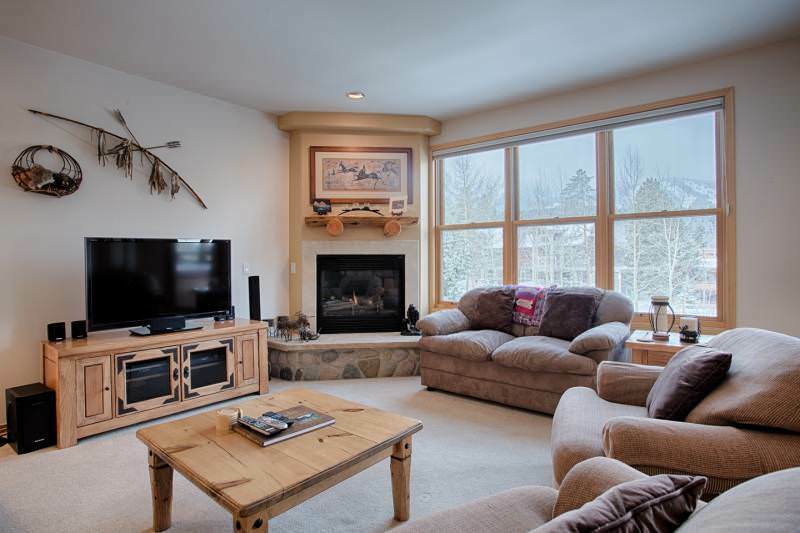 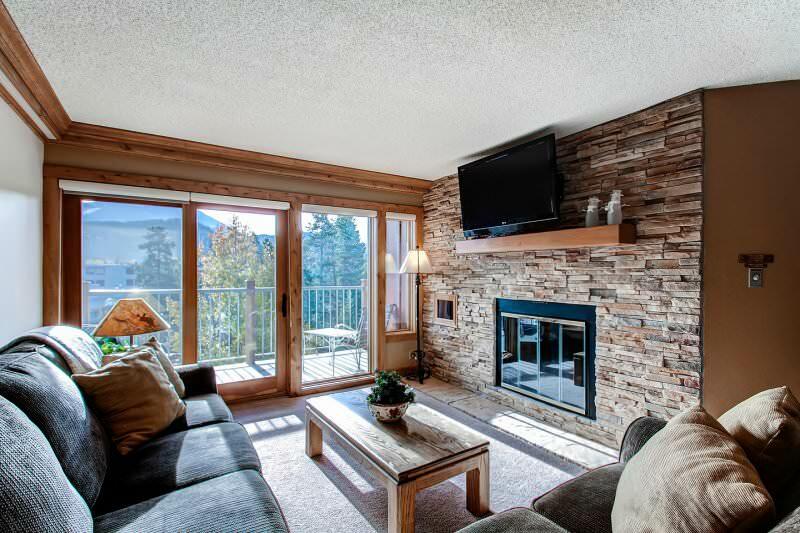 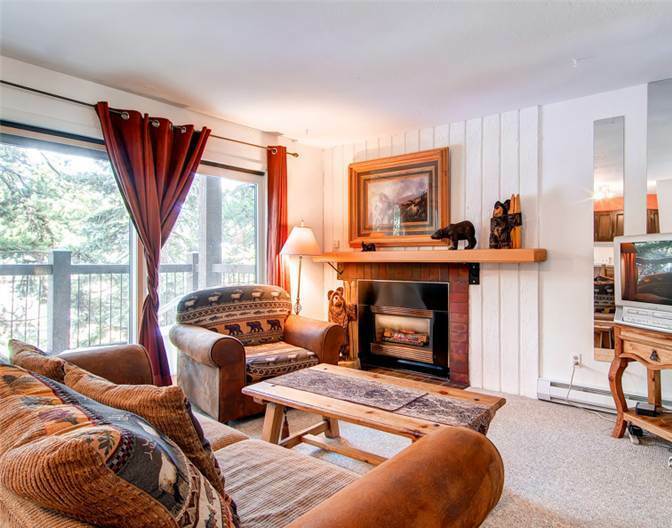 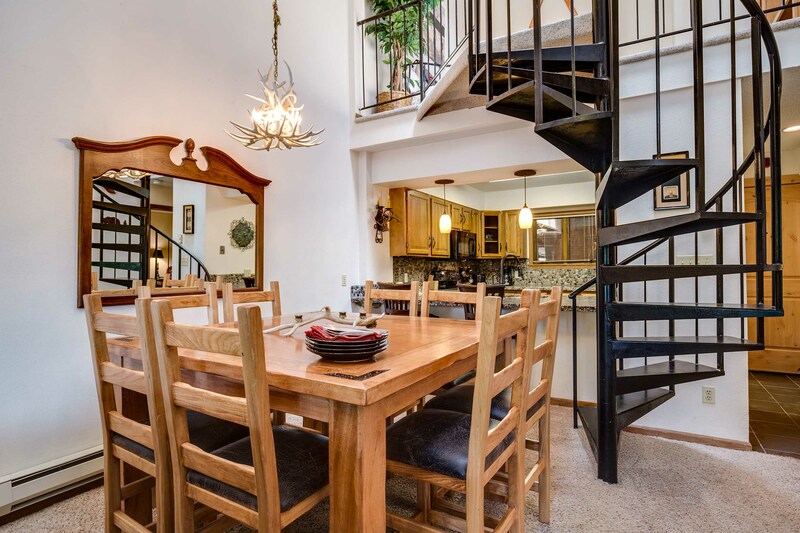 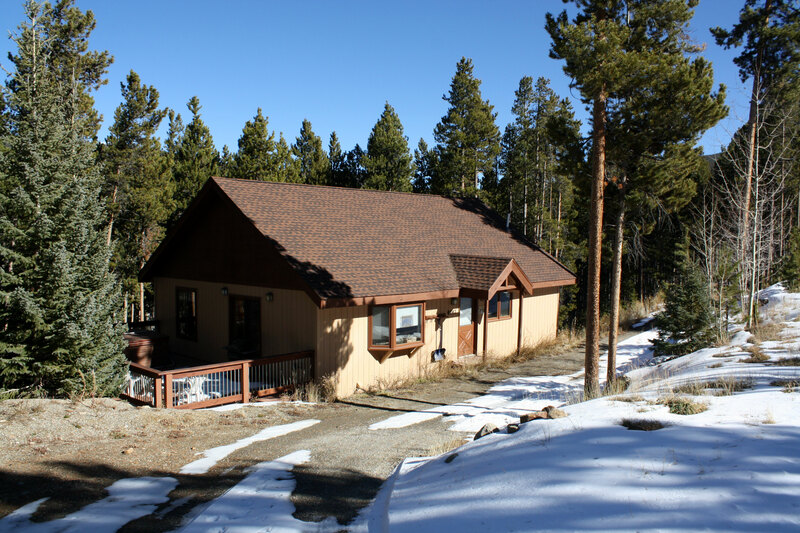 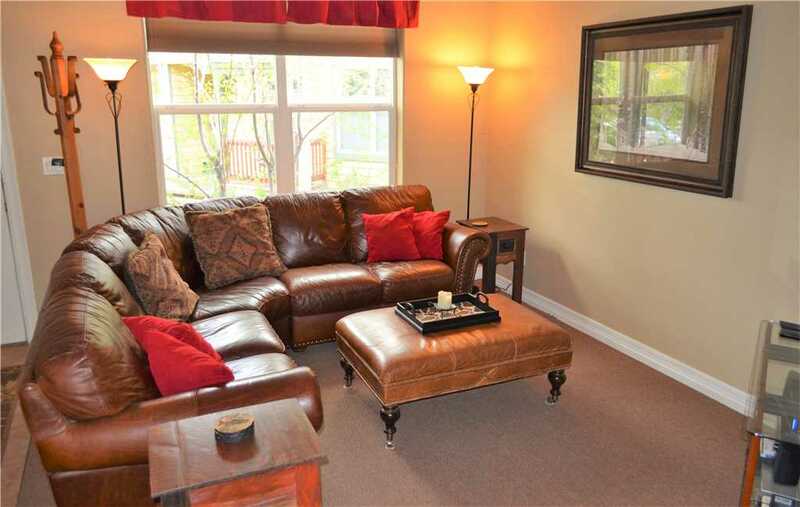 The Chimney Ridge Townhomes are among the best deals in Breck. 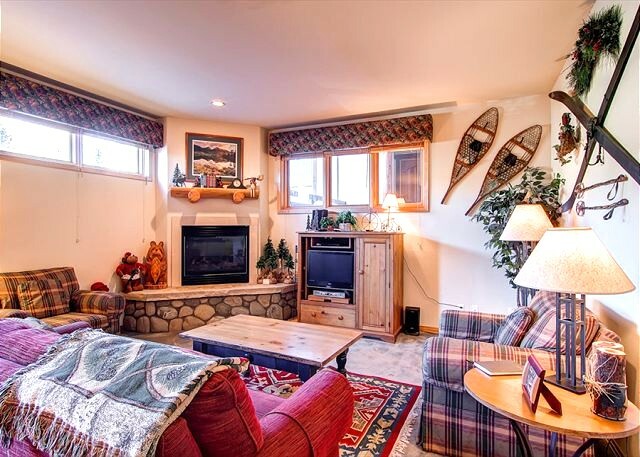 The location is great, too! 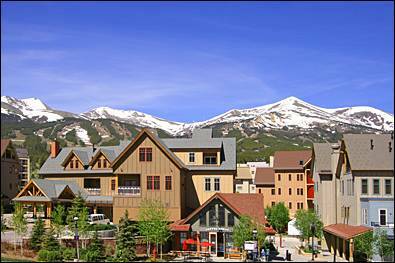 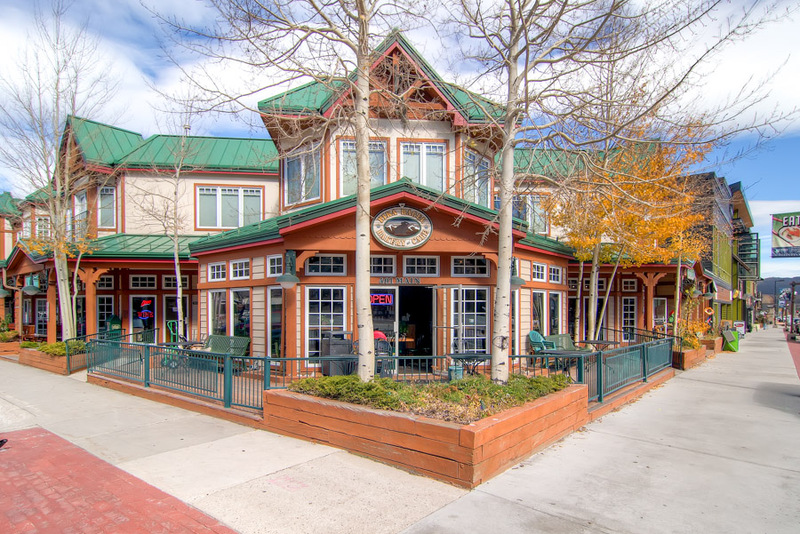 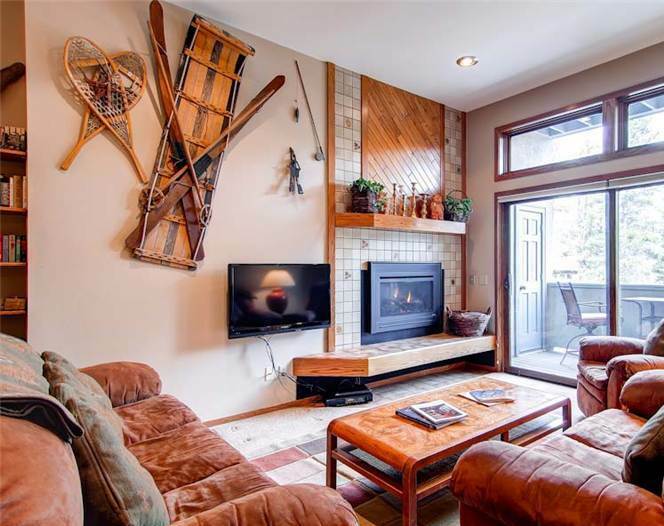 The shuttle bus to the slopes (1 stop away) and downtown Breckenridge is right at the end of the drive — or, stroll about one block to the Snowflake Lift. 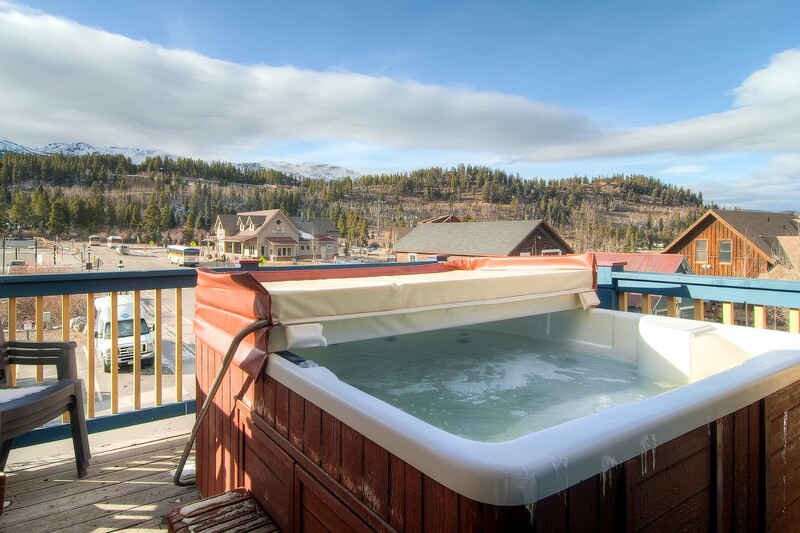 You’ll enjoy seasonal access to the Upper Village pool and hot tubs as well. 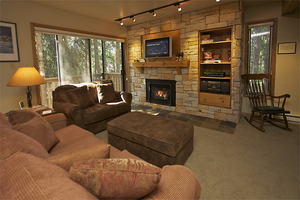 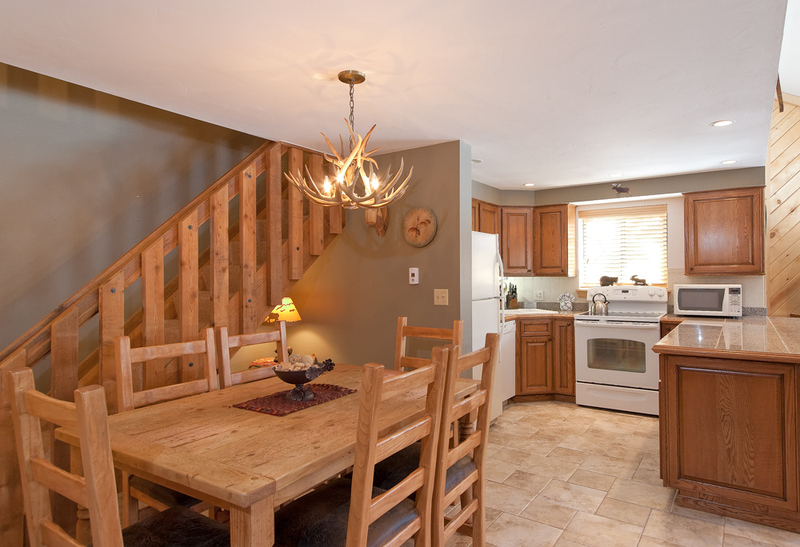 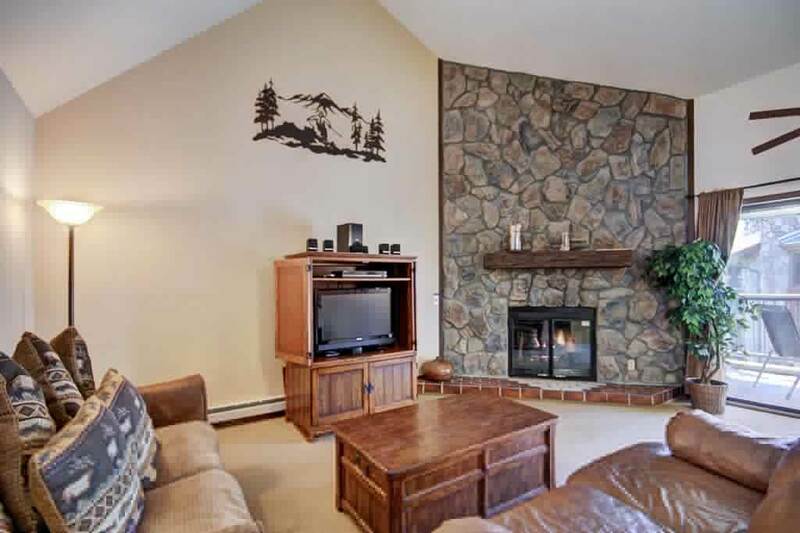 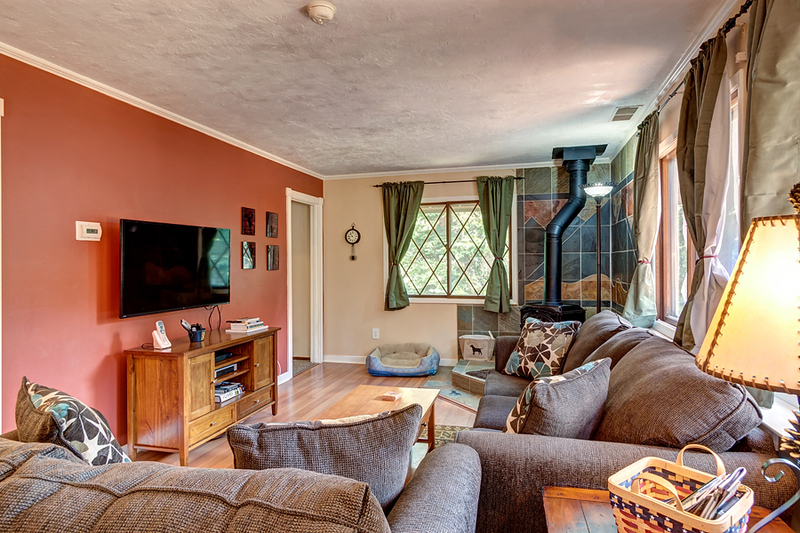 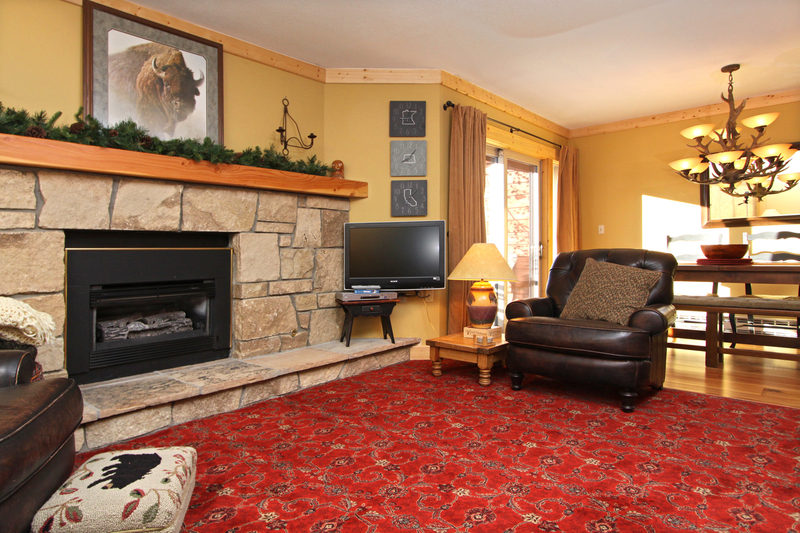 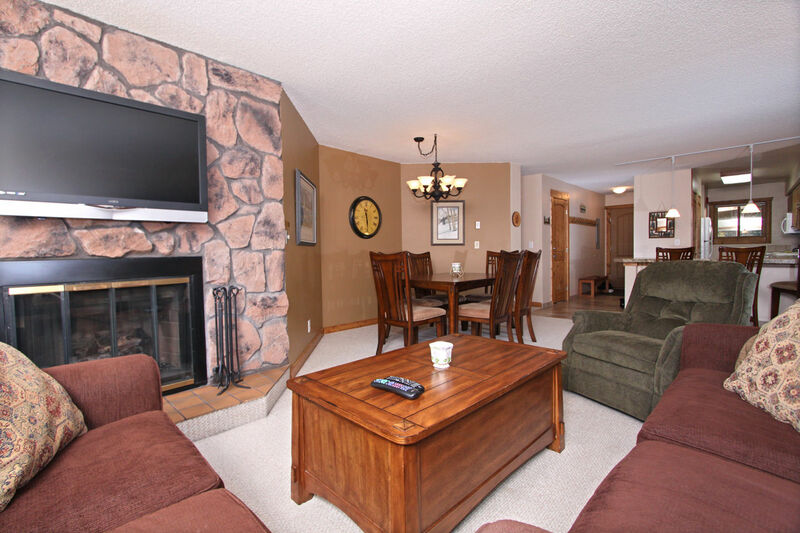 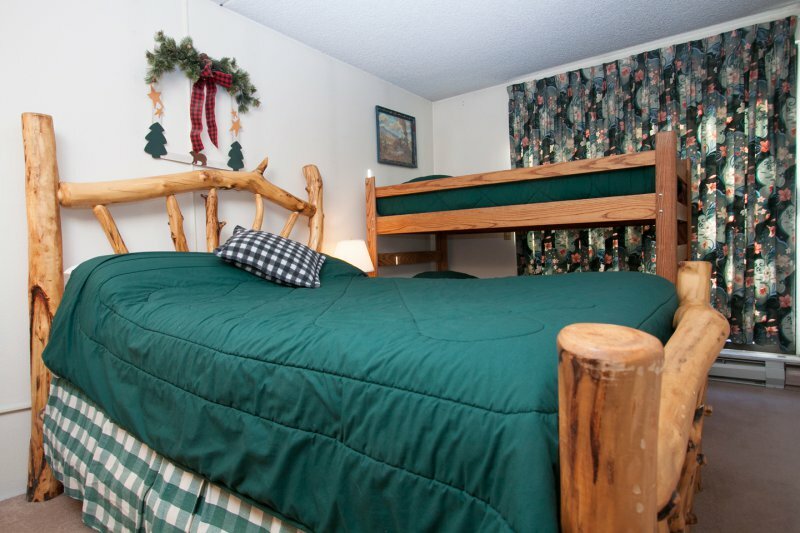 Chimney Ridgeis a great choice for families and groups. 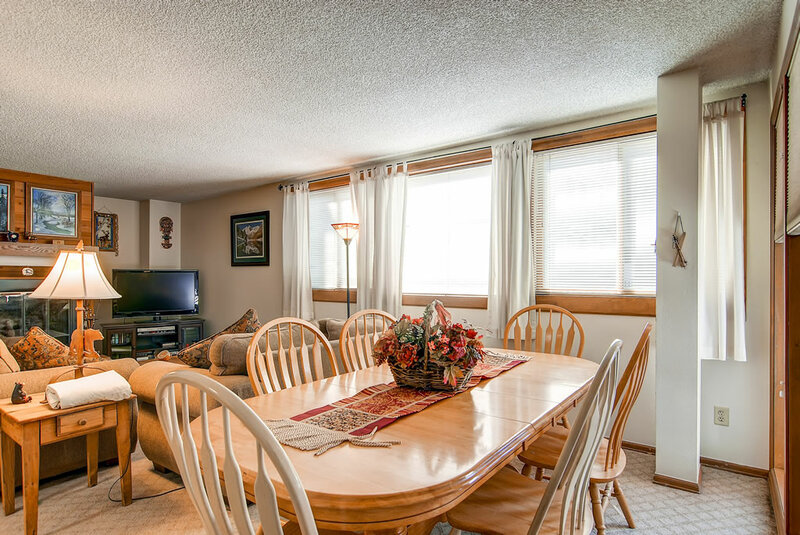 The multilevel layout gives everyone plenty of room to spread out and relax — and makes this a great home for multiple families to share. 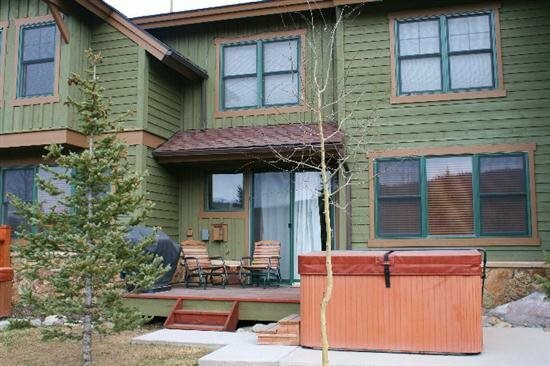 And of course, everyone will love the private hot tub! 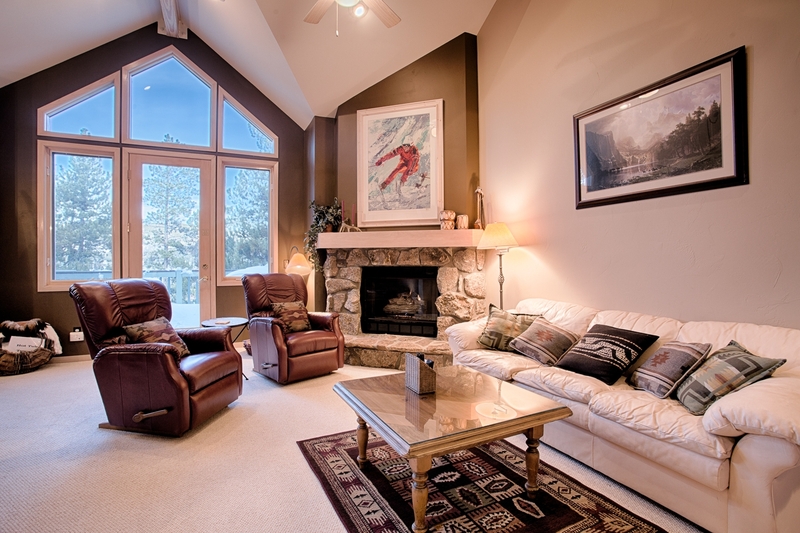 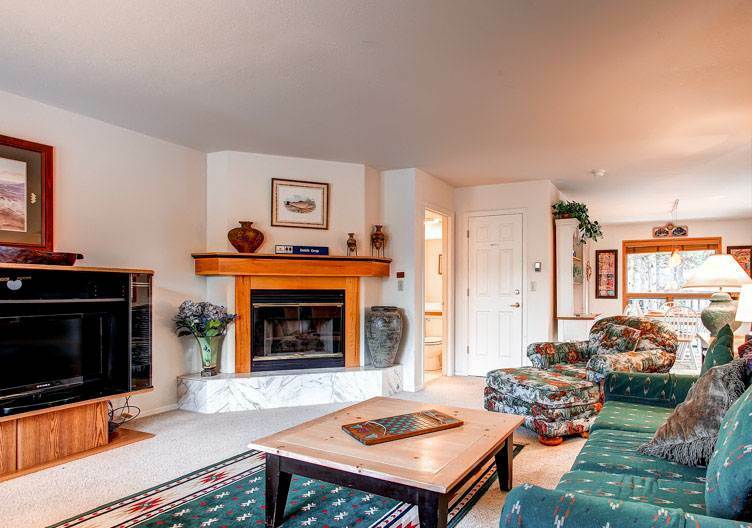 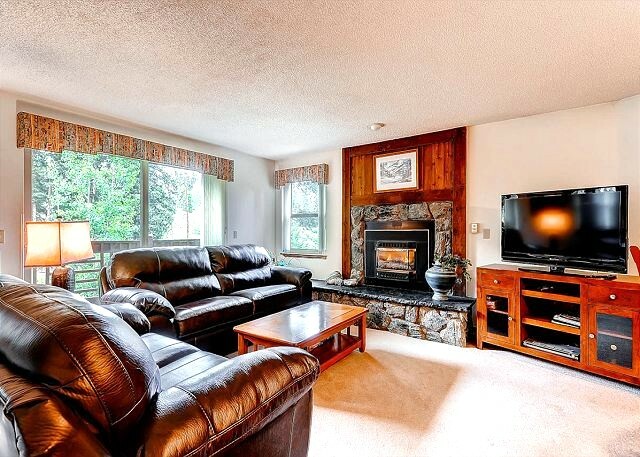 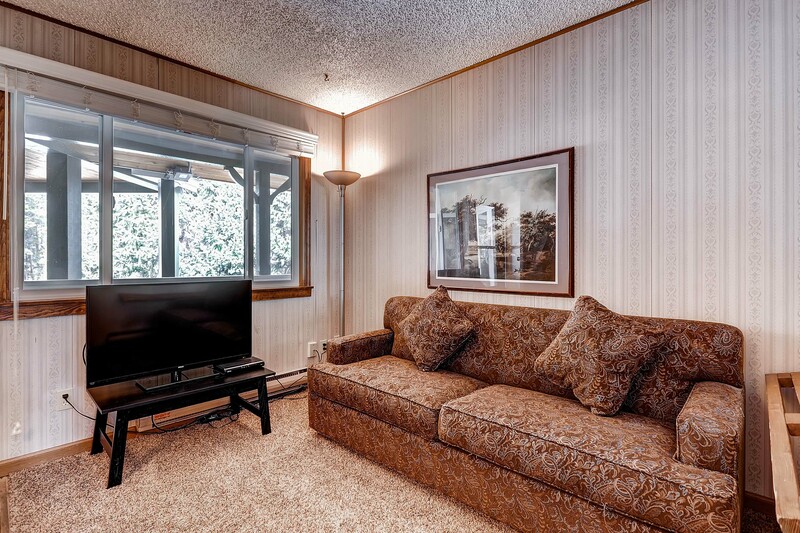 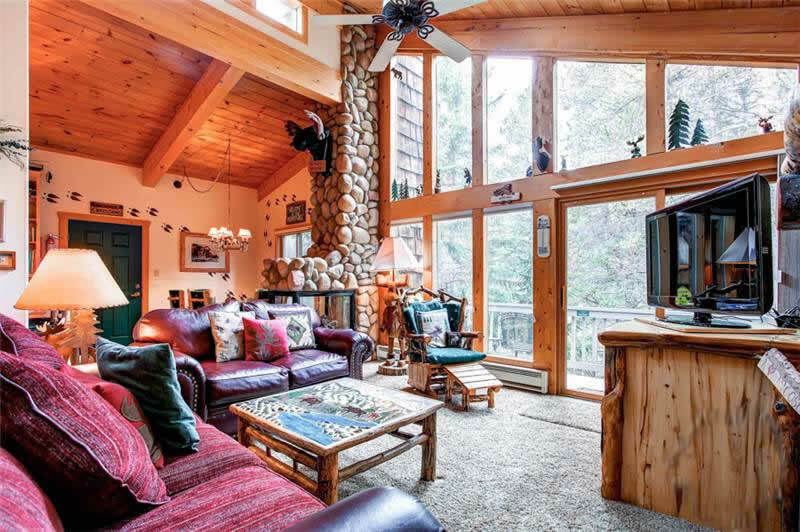 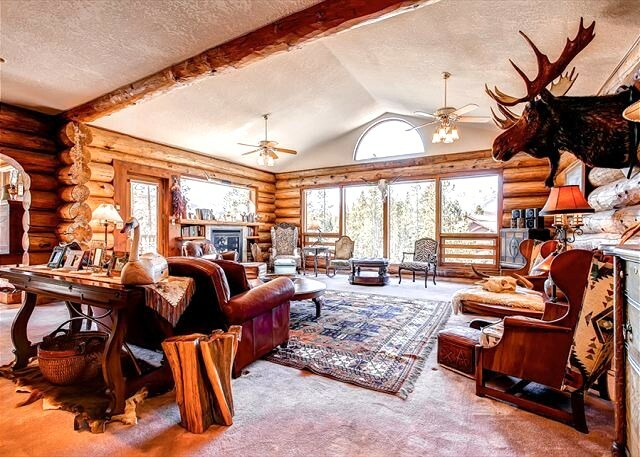 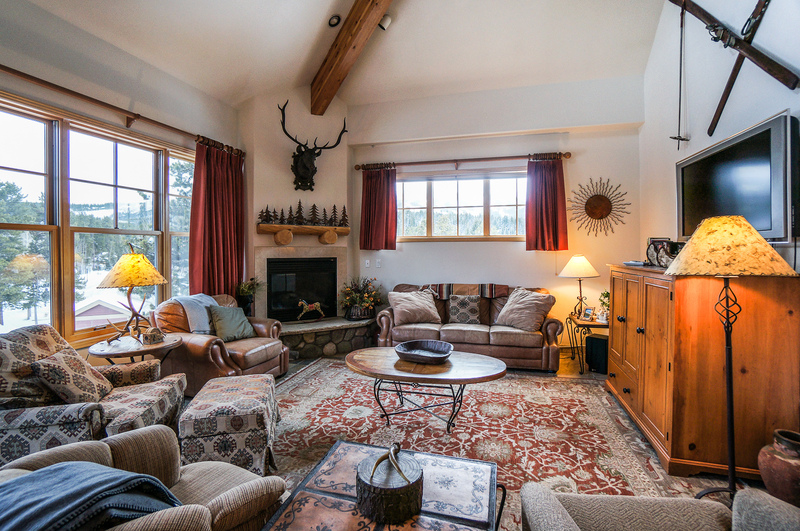 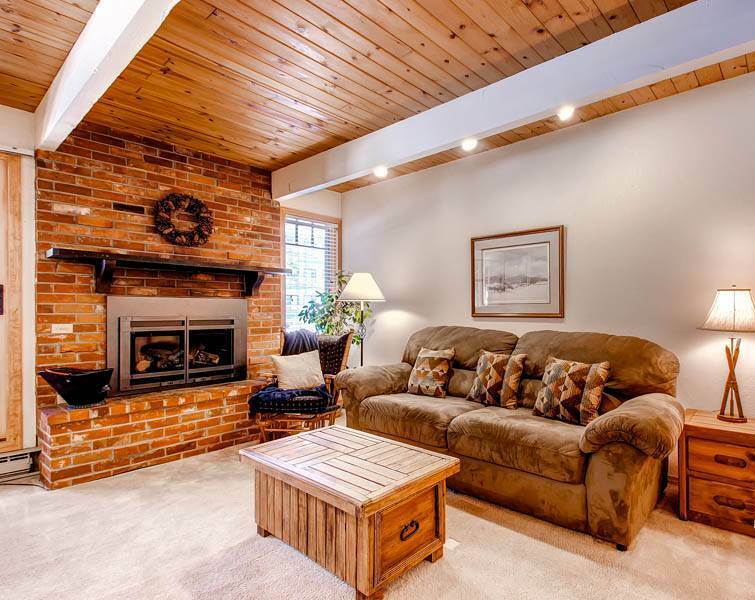 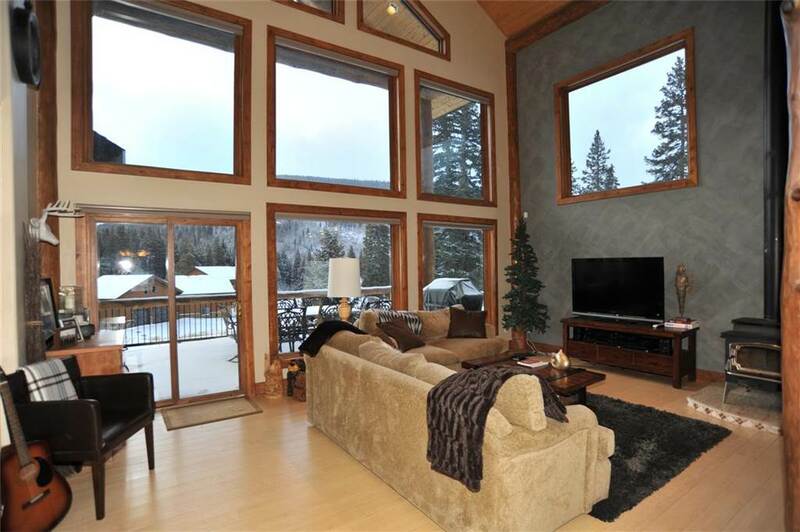 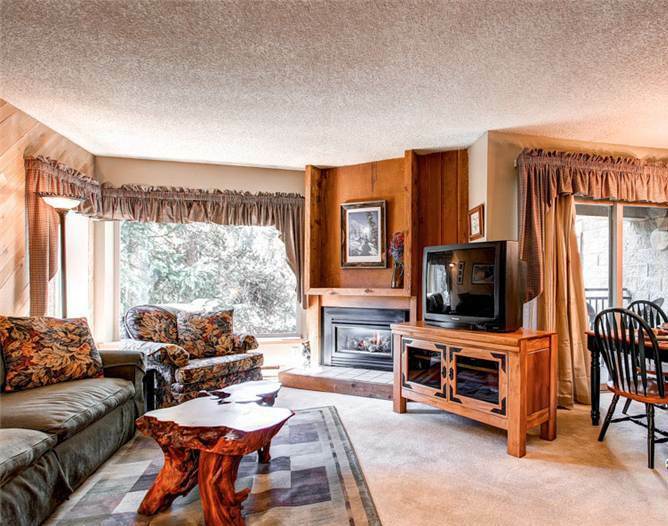 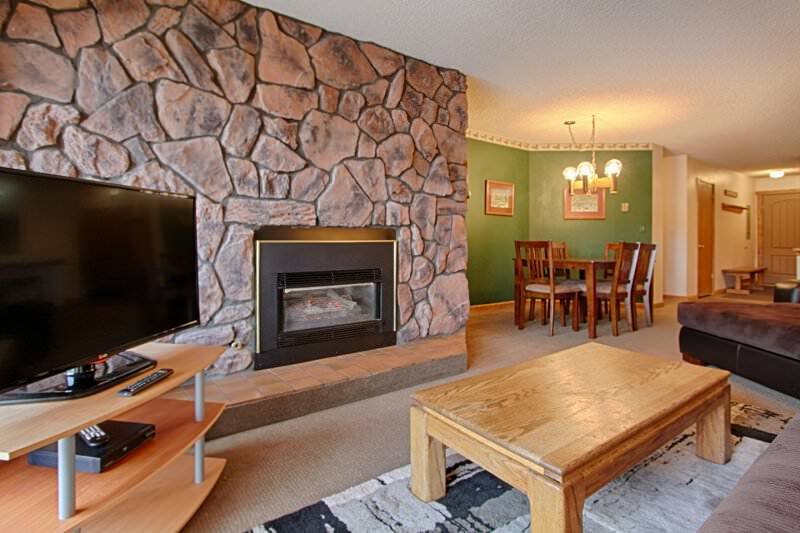 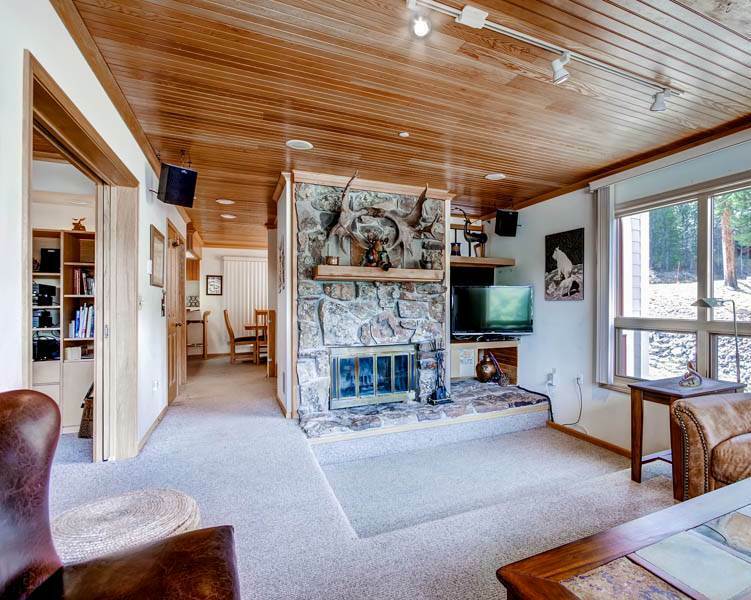 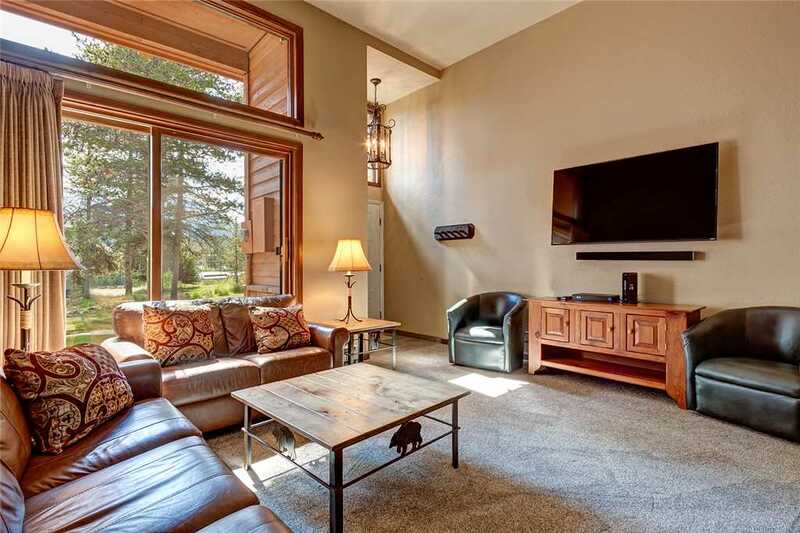 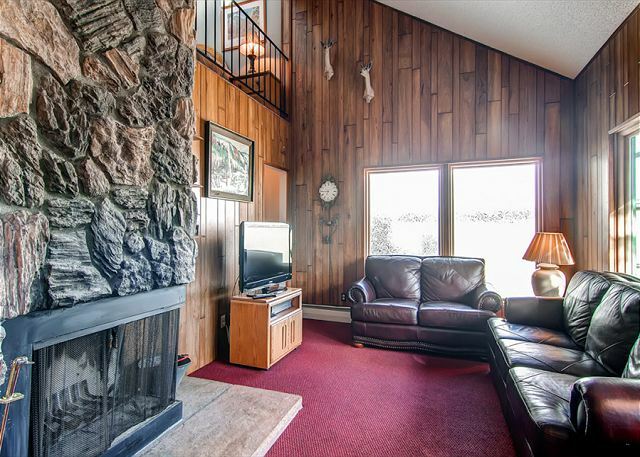 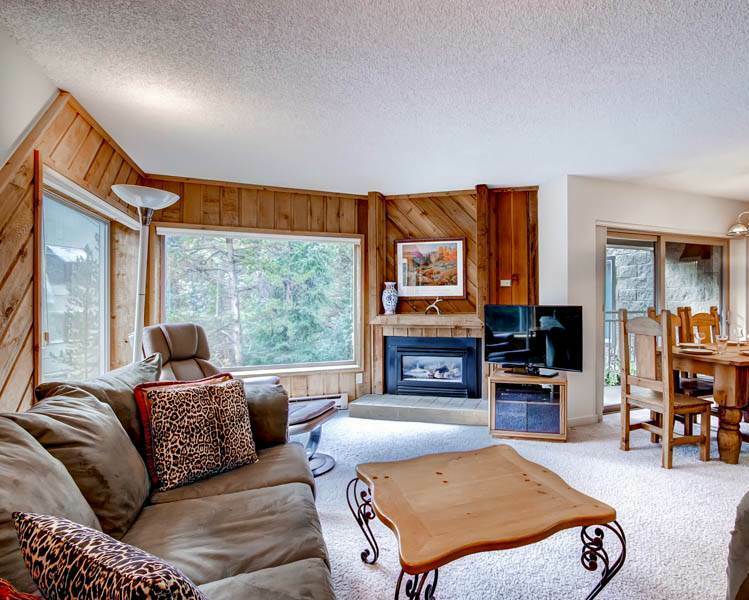 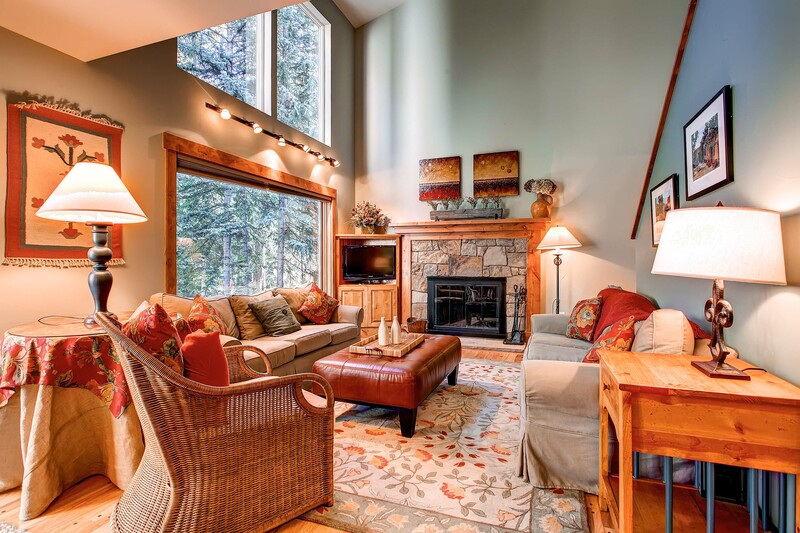 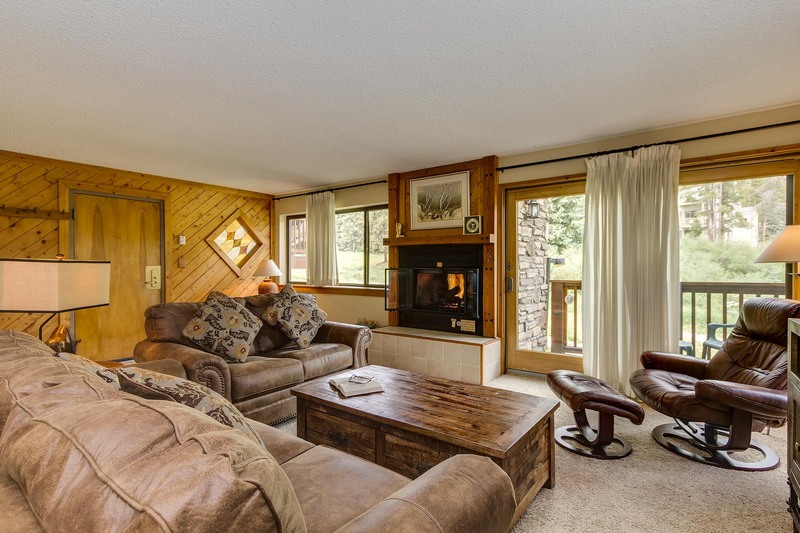 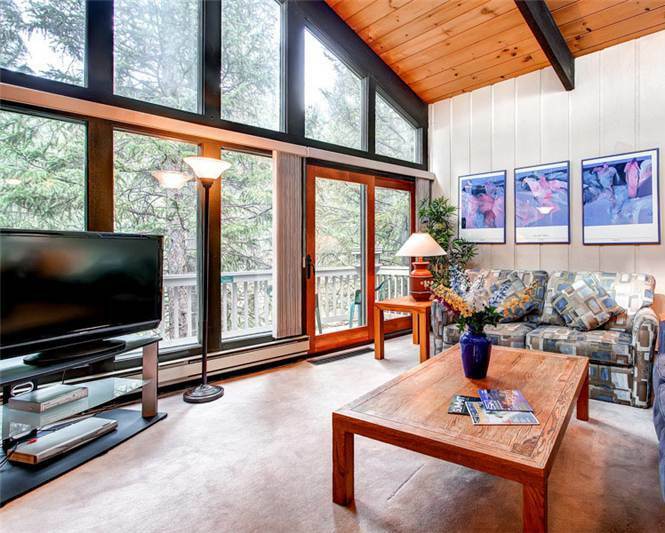 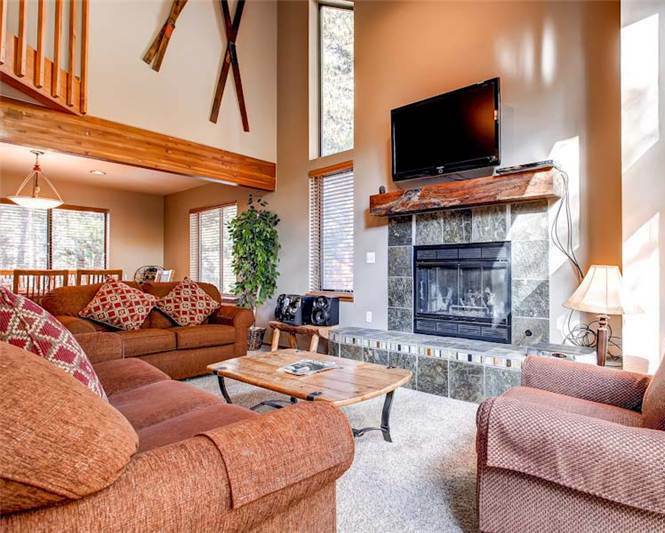 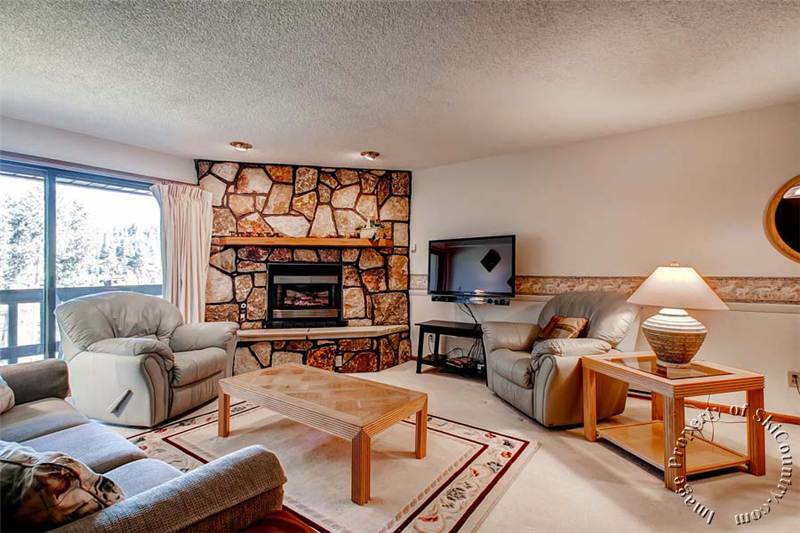 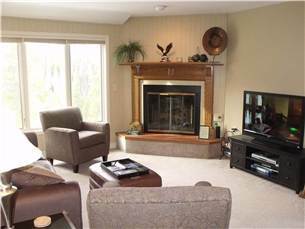 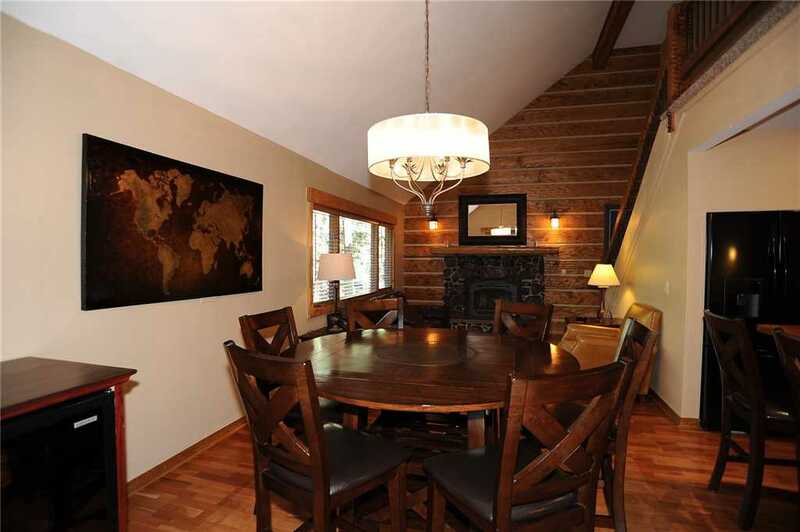 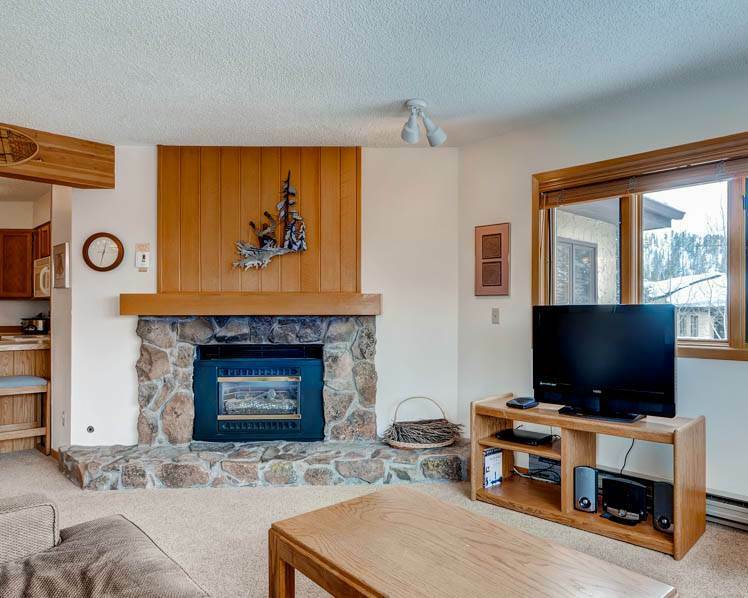 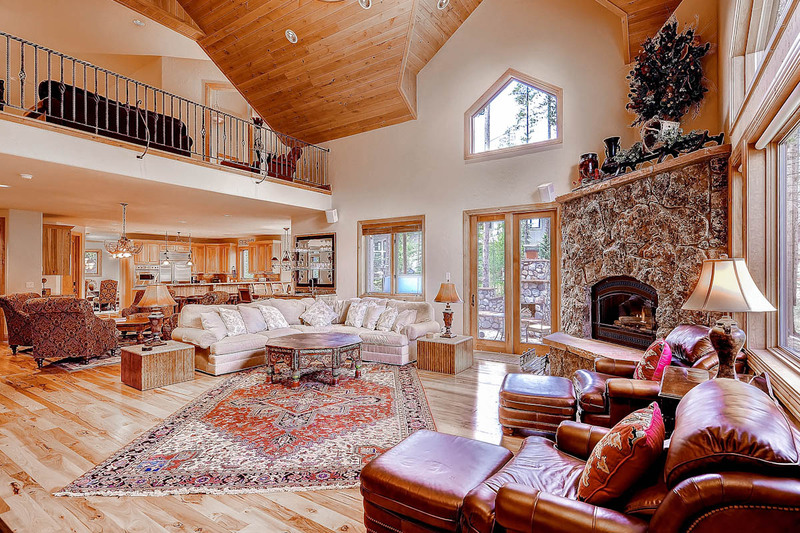 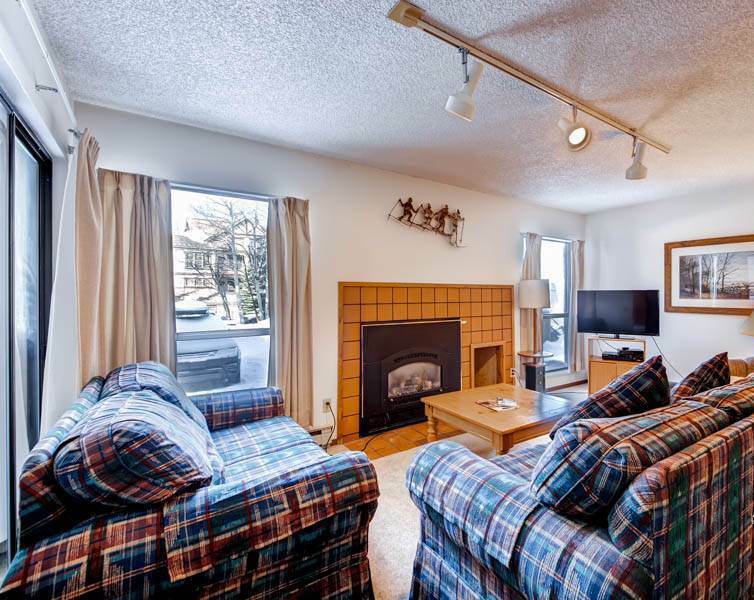 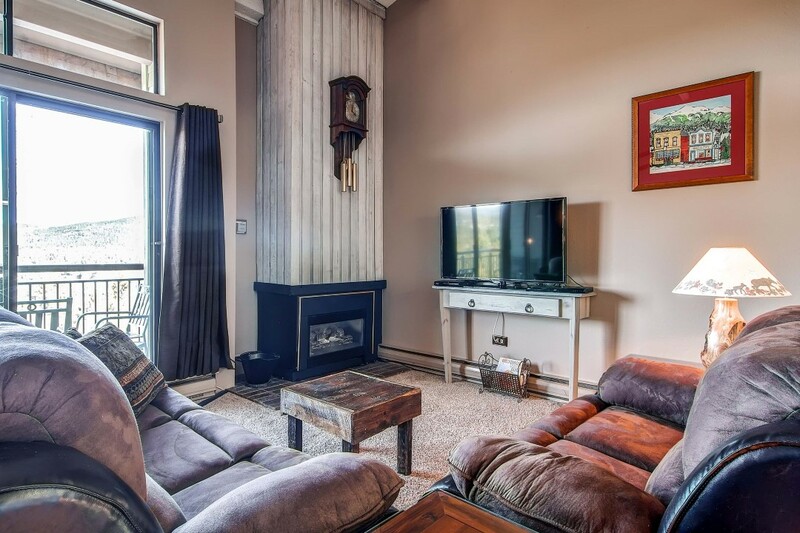 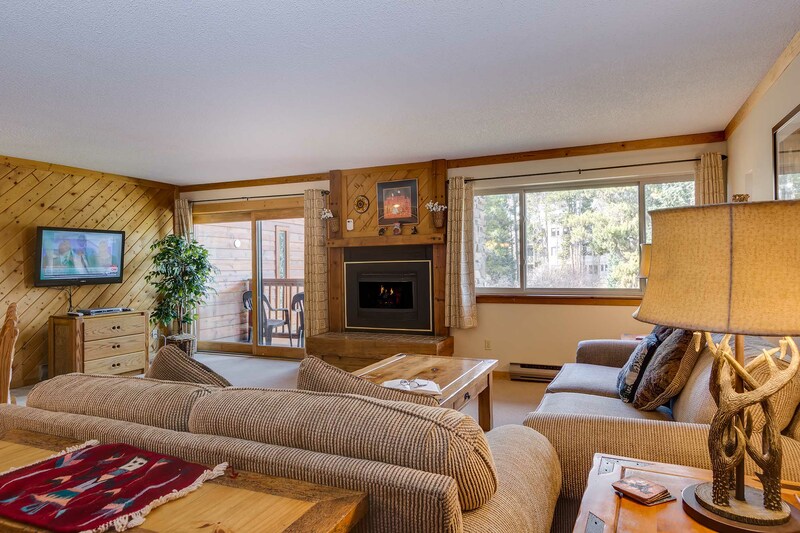 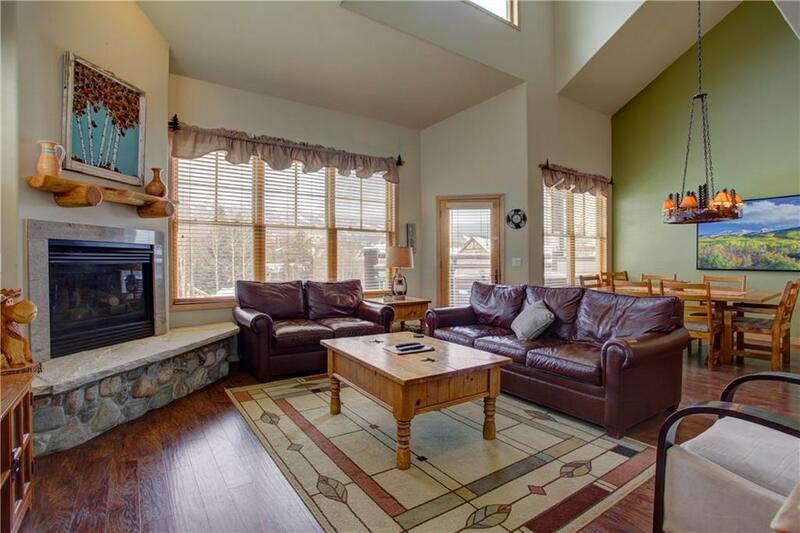 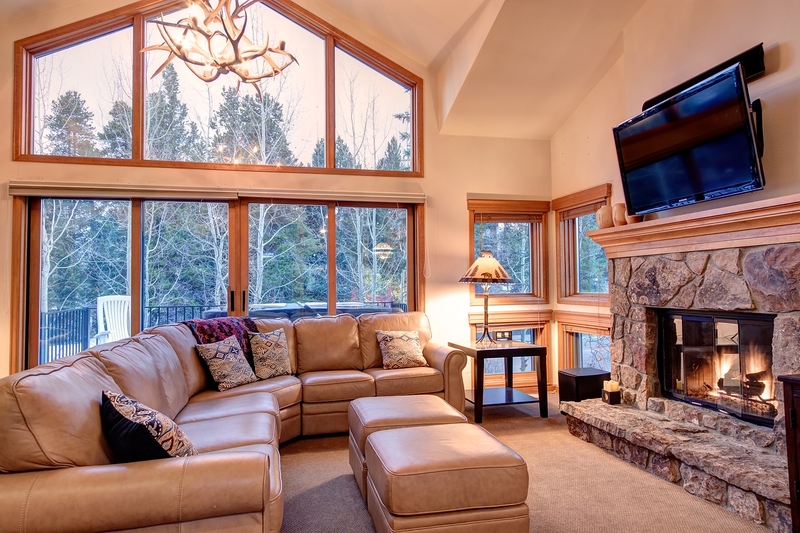 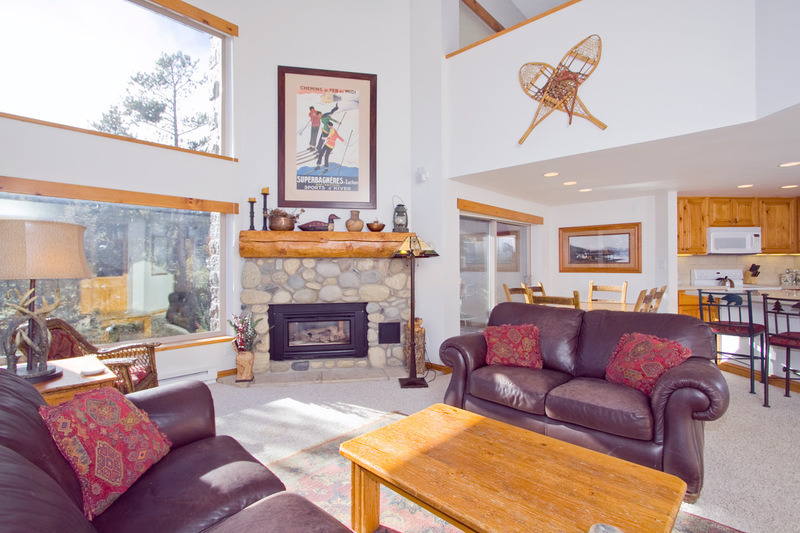 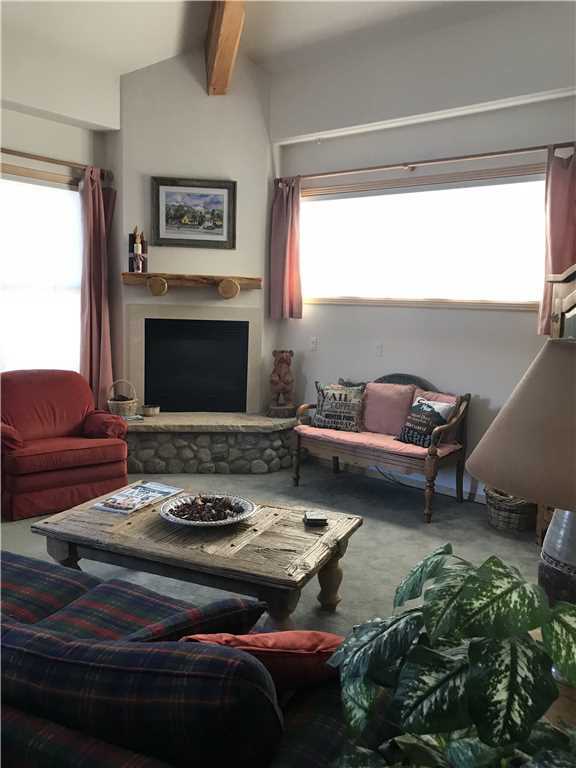 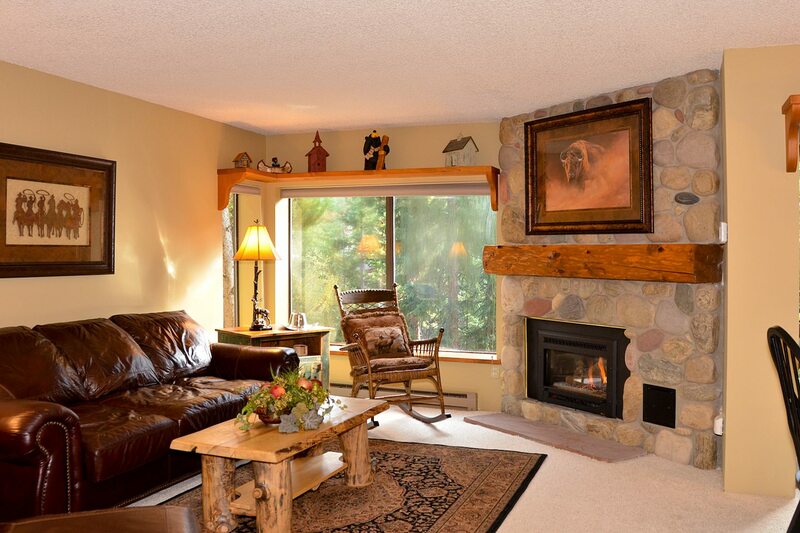 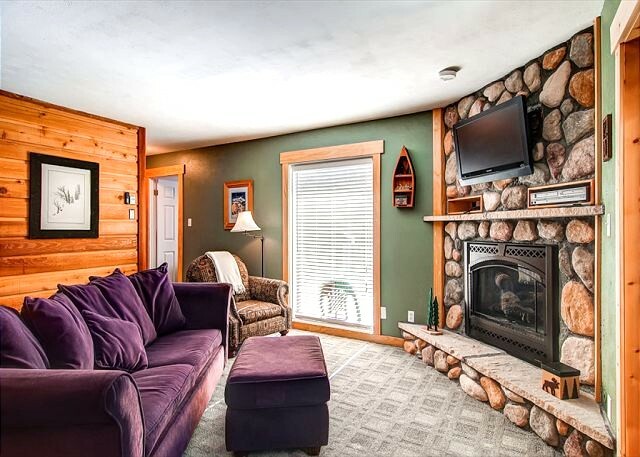 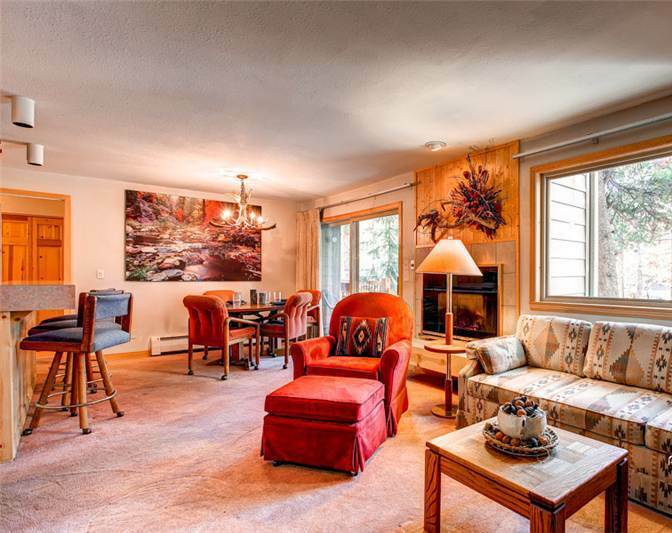 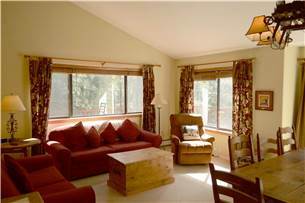 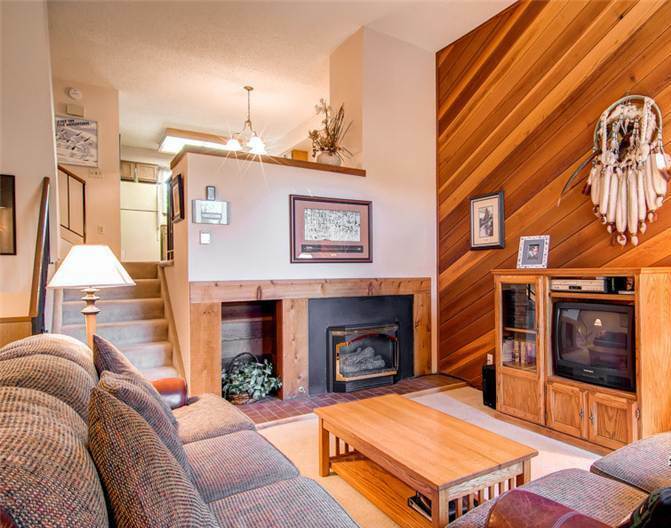 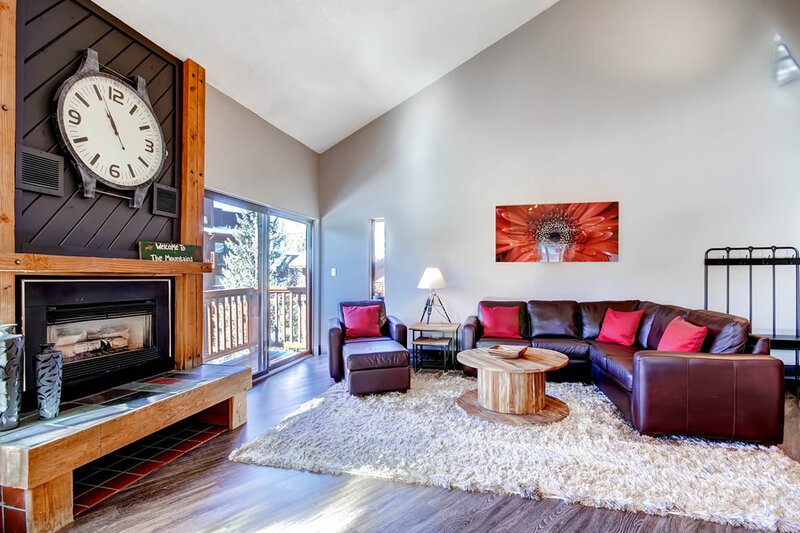 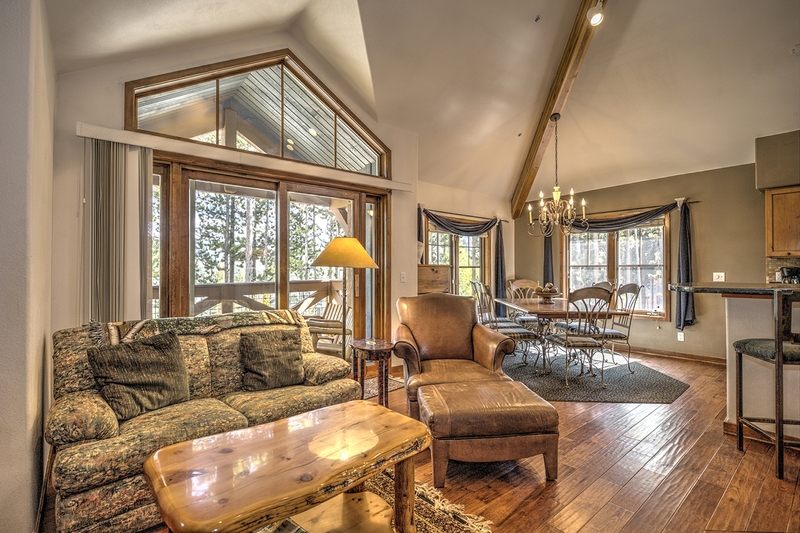 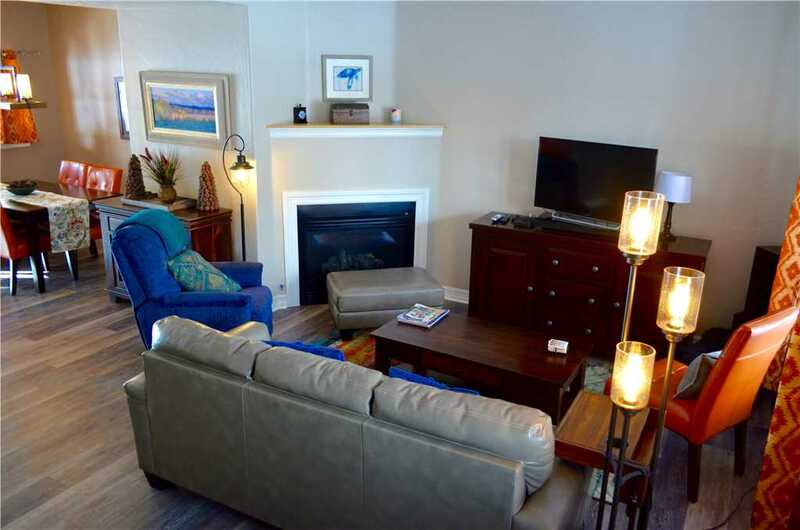 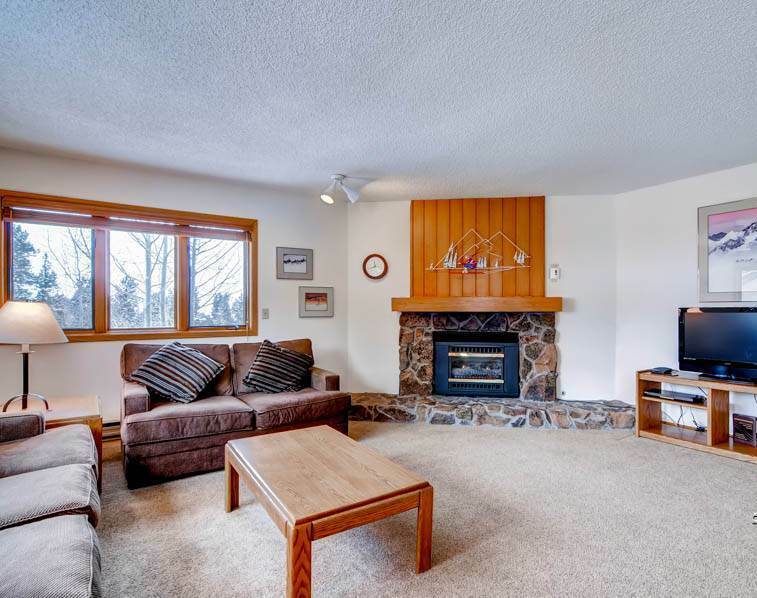 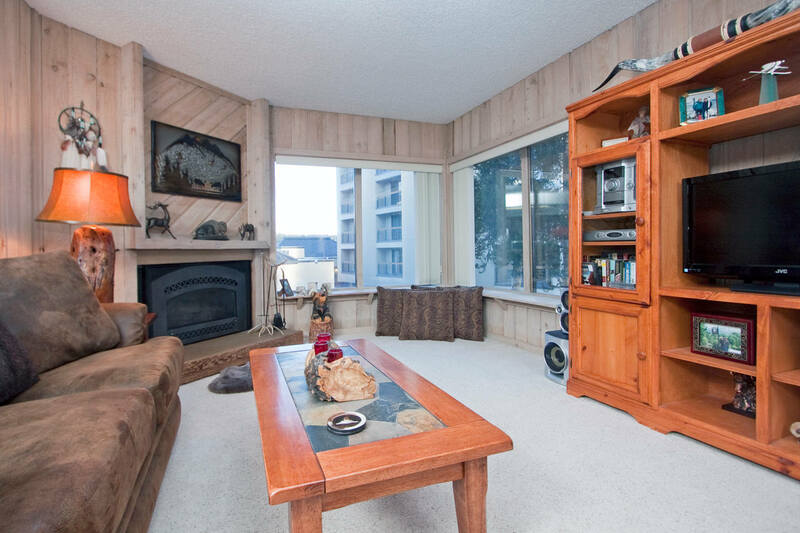 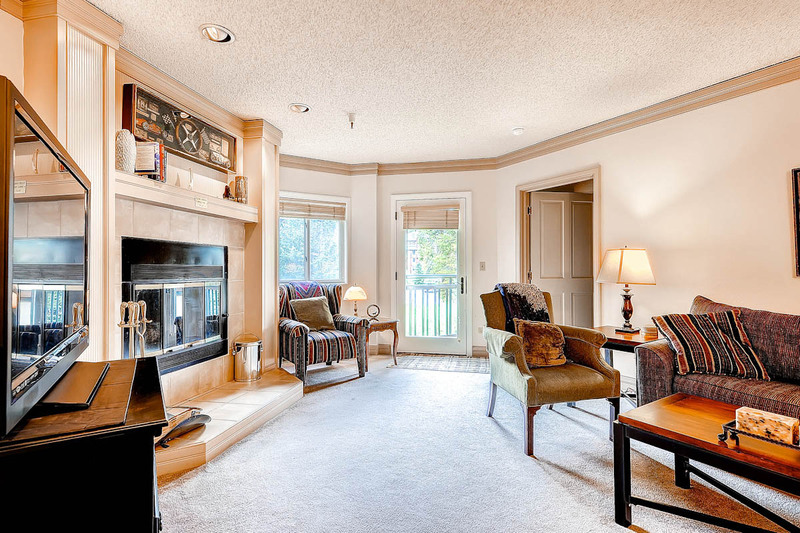 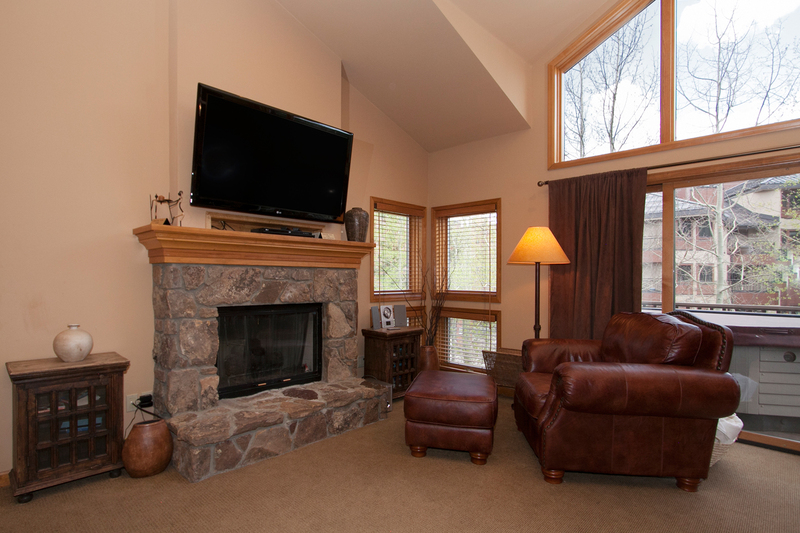 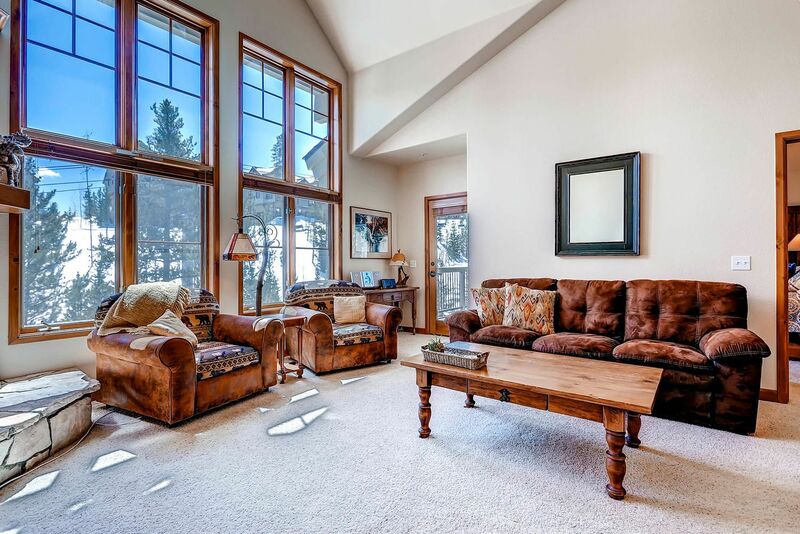 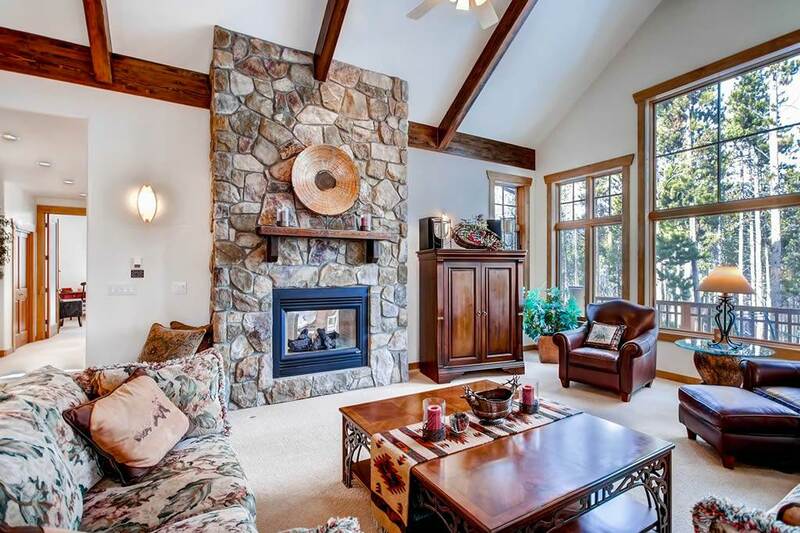 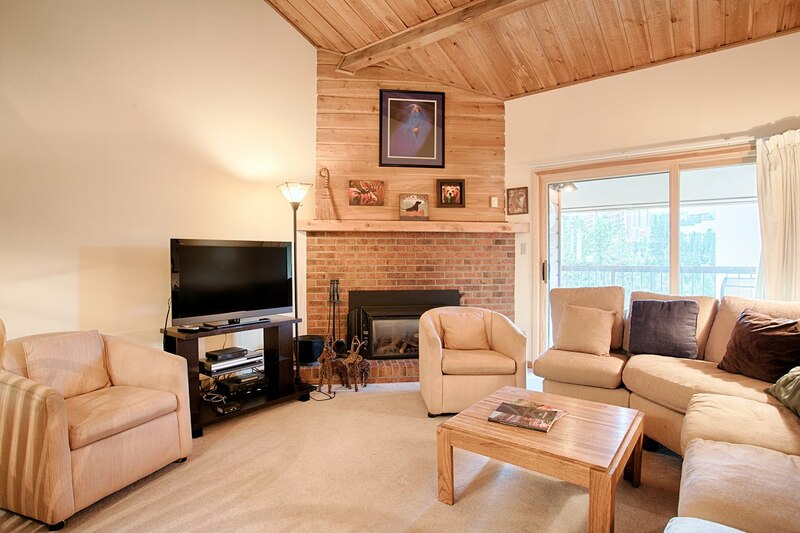 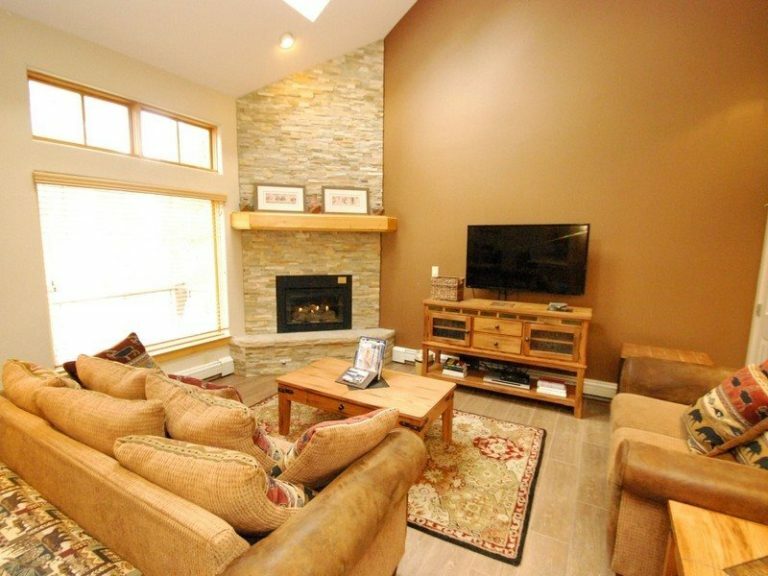 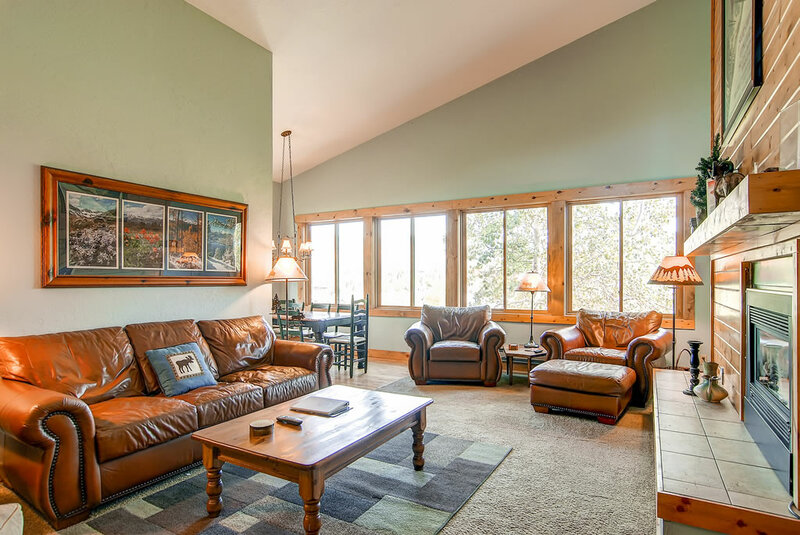 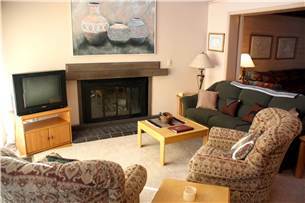 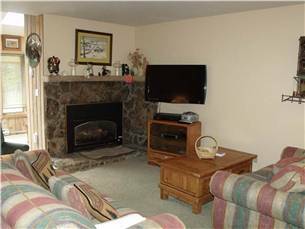 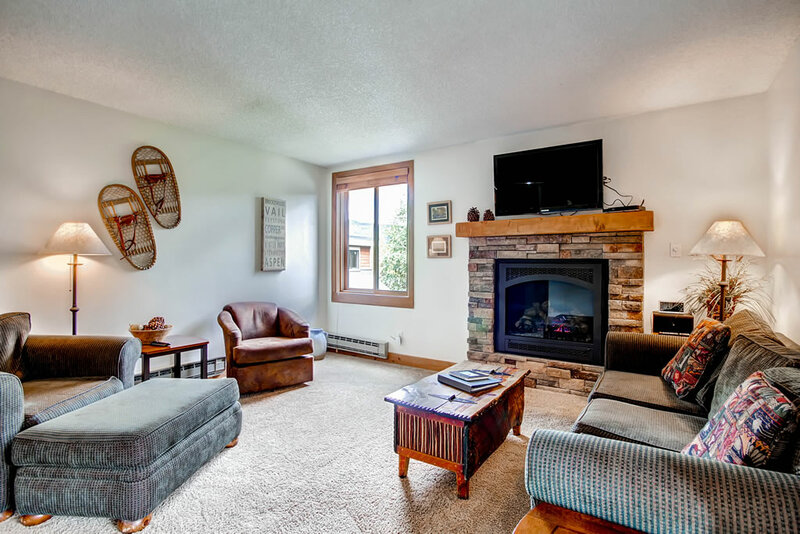 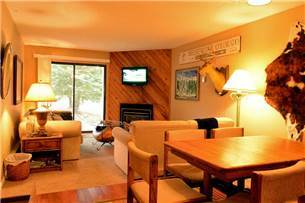 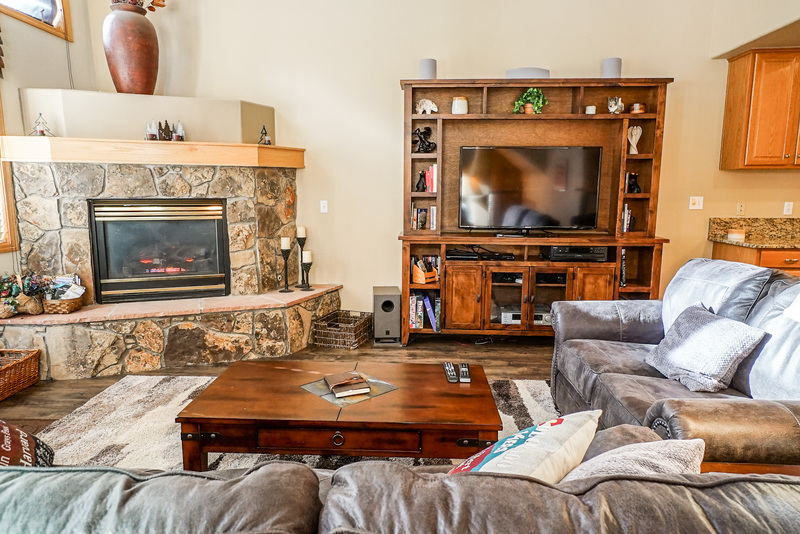 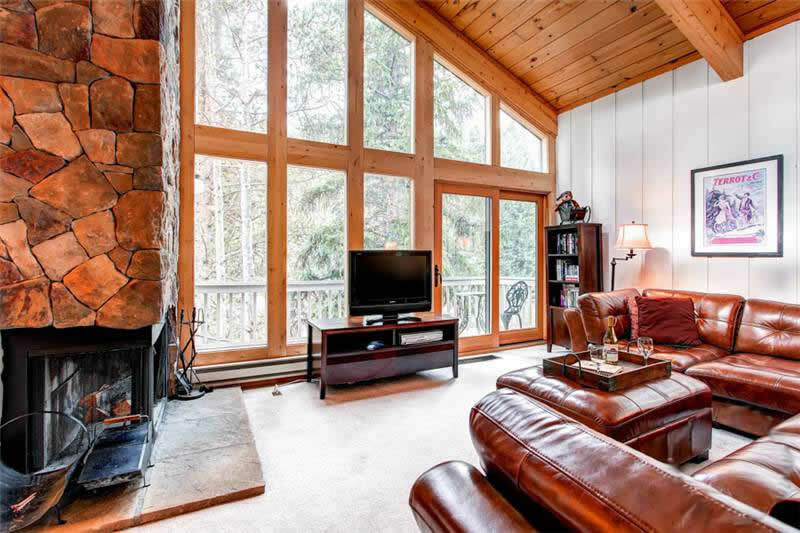 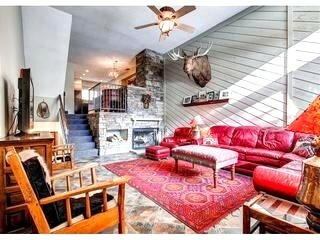 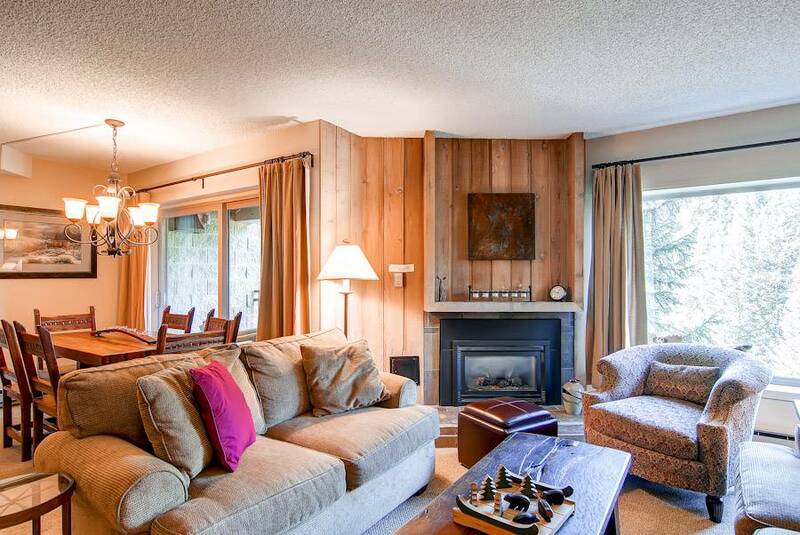 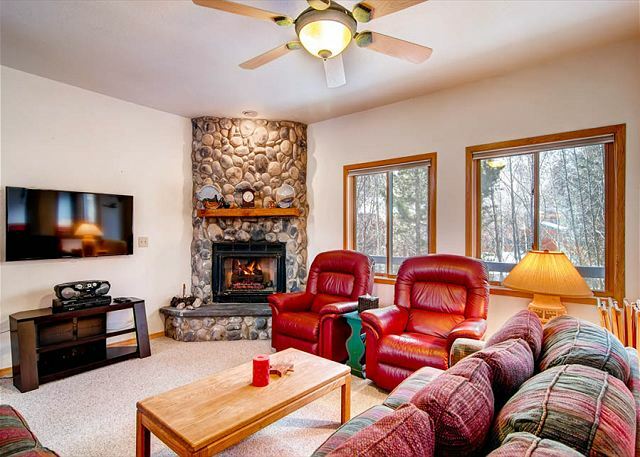 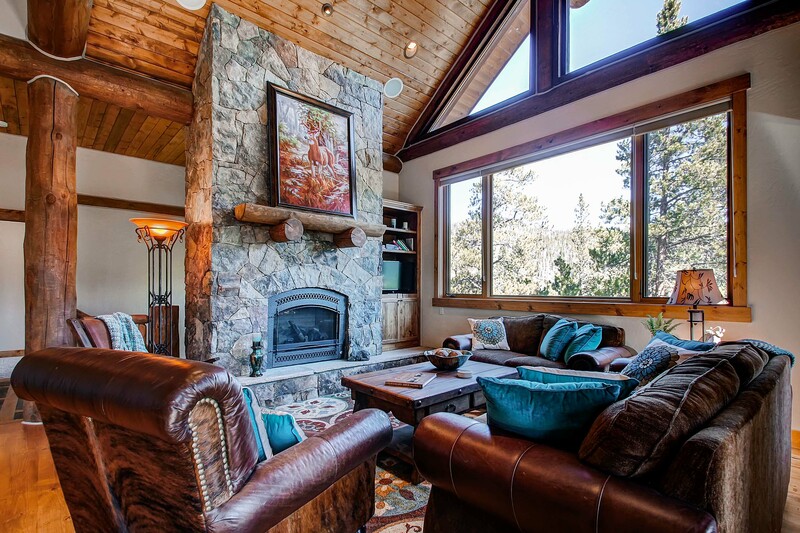 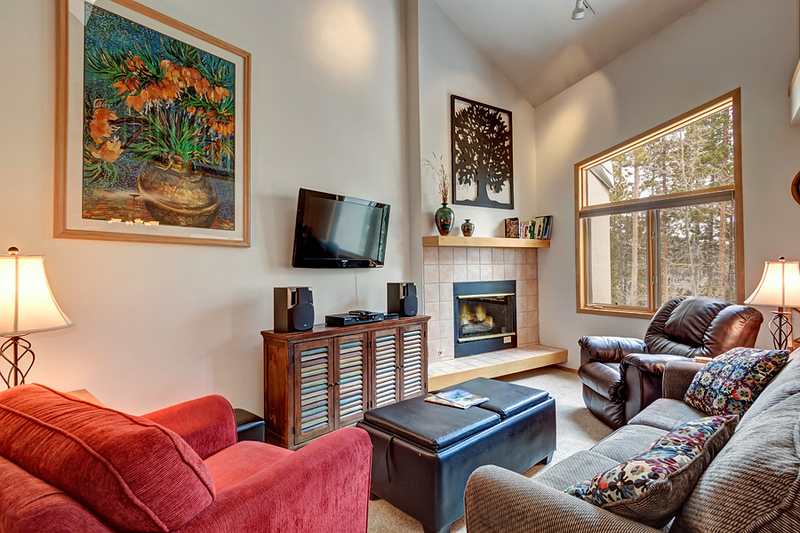 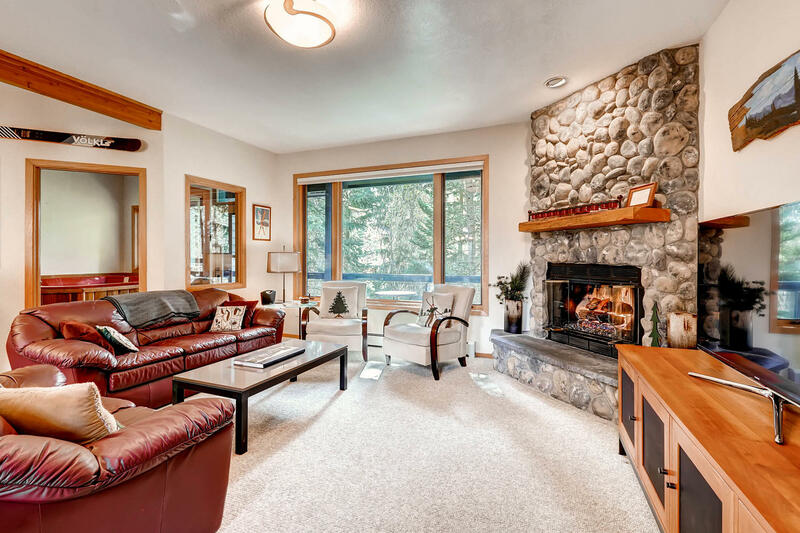 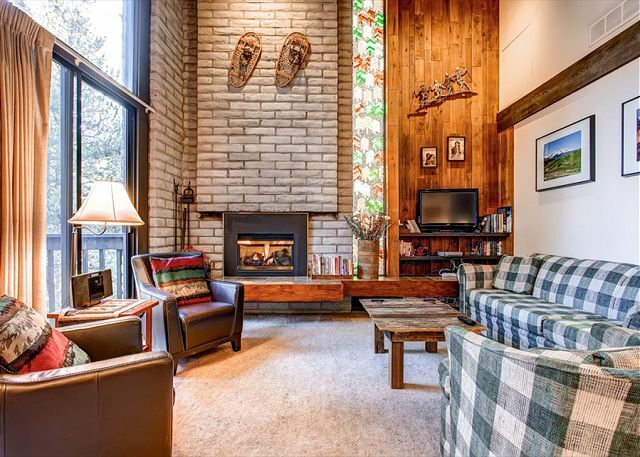 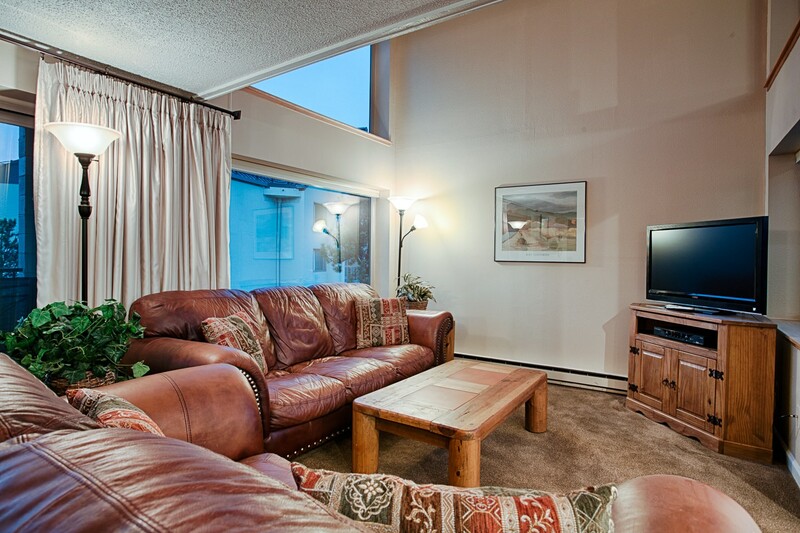 The great room features large windows and high ceilings for a comfortable, open feel; there’s also a gas fireplace, a large LCD-TV and plenty of seating. 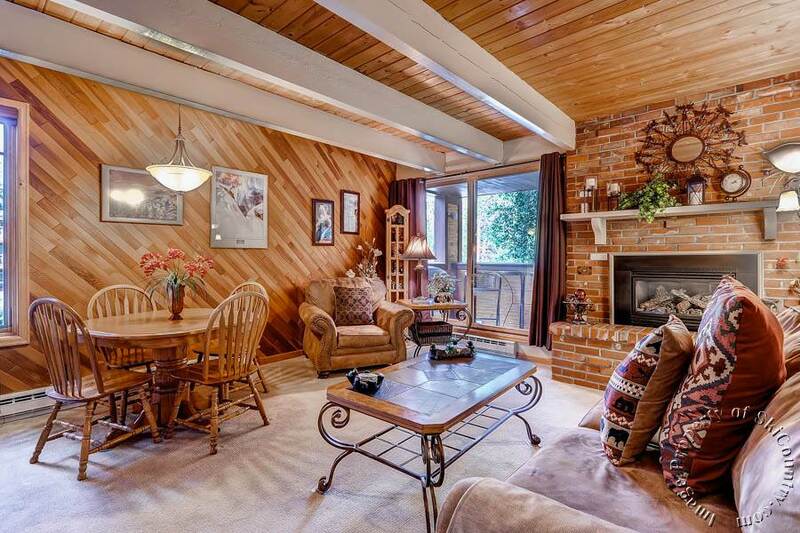 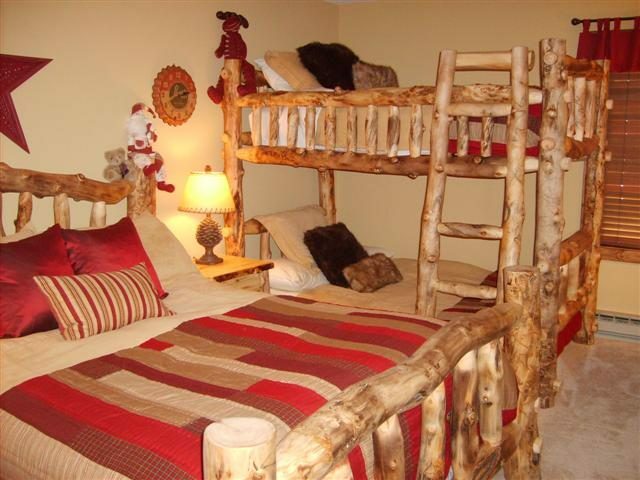 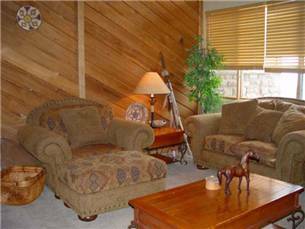 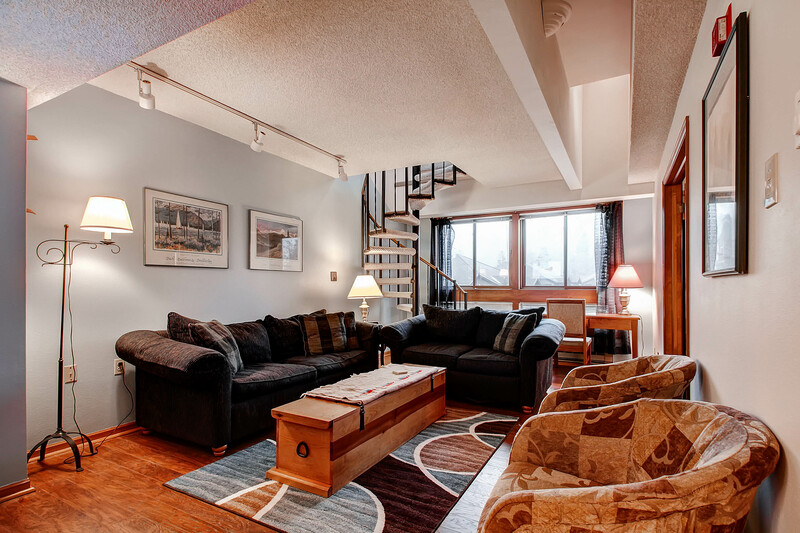 The loft area above is wonderful for reading, relaxing and conversation, or sleeping on the hide-a-bed. 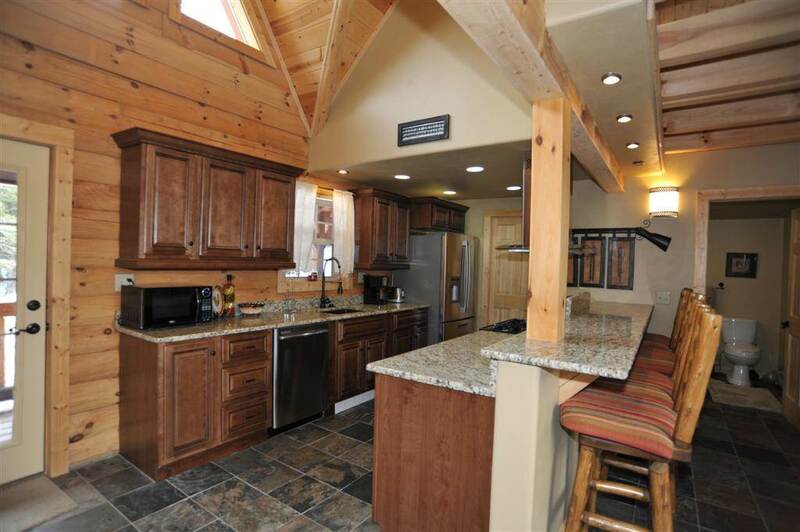 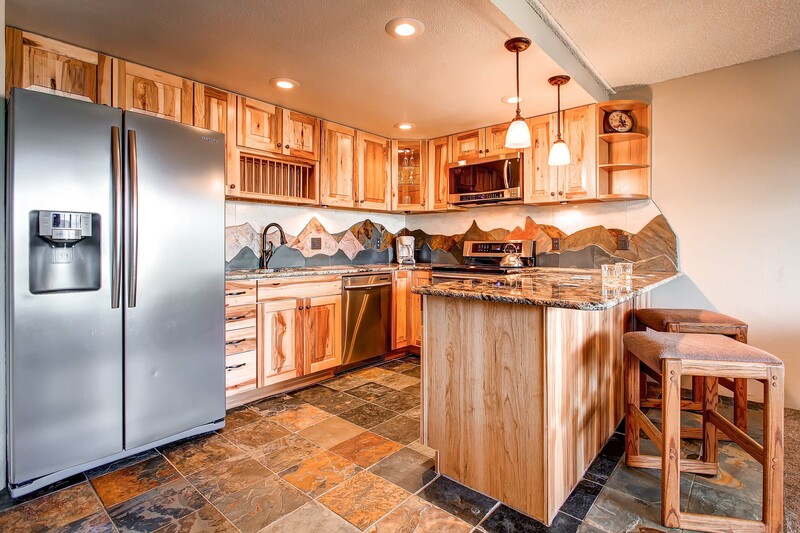 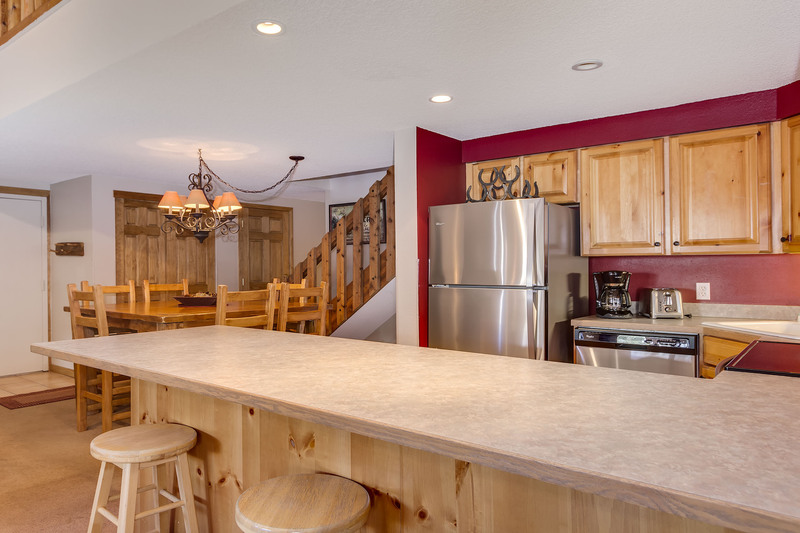 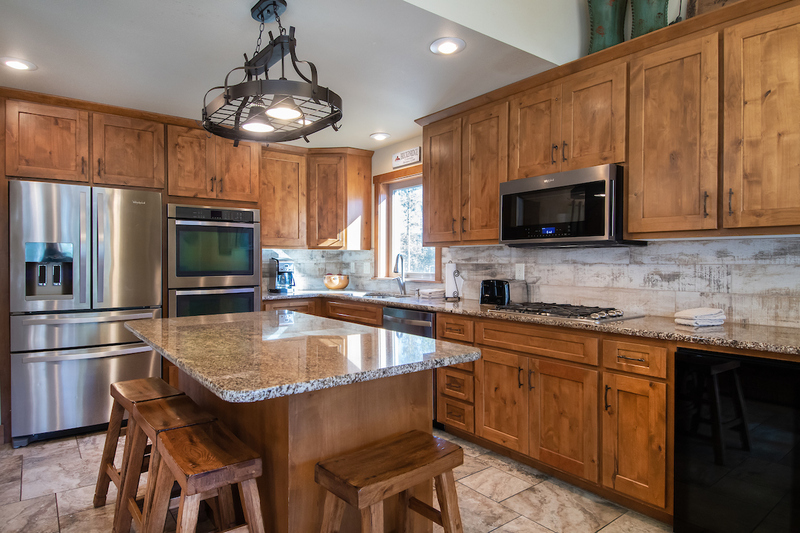 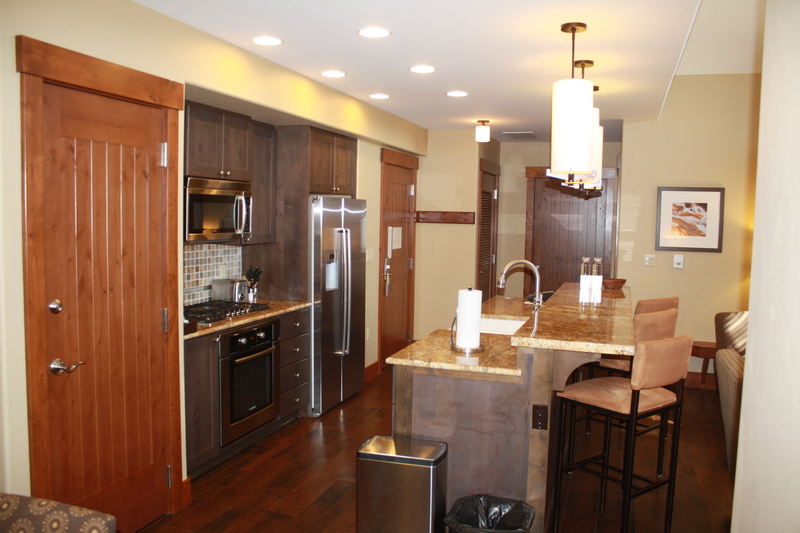 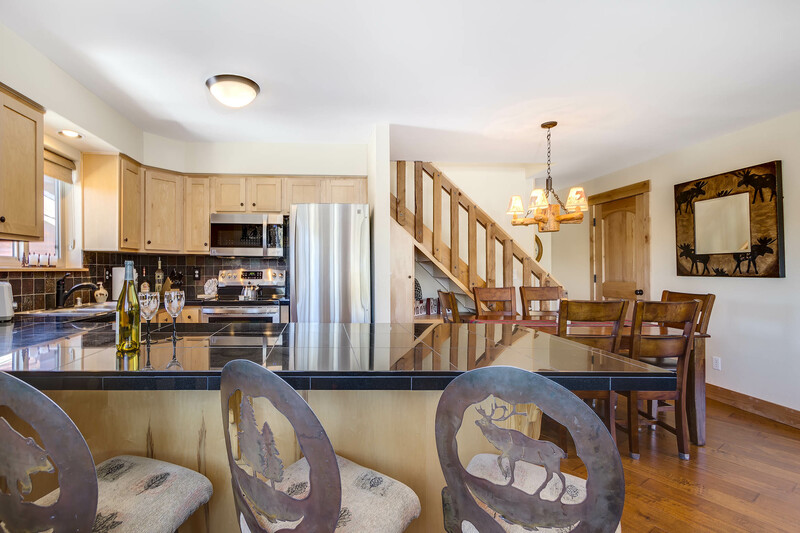 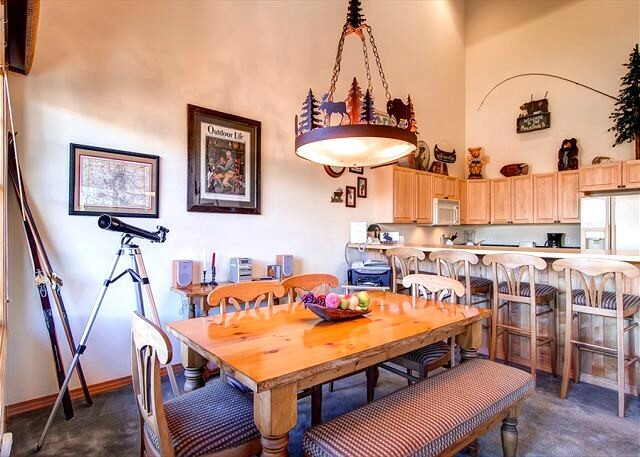 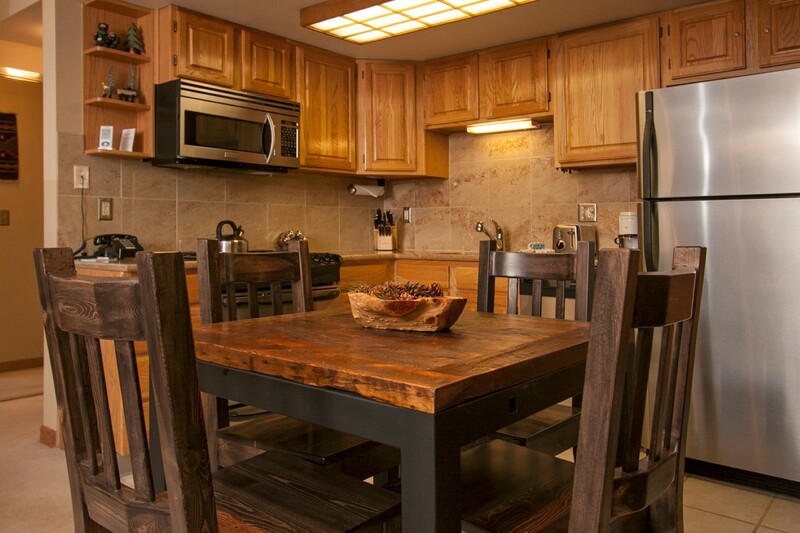 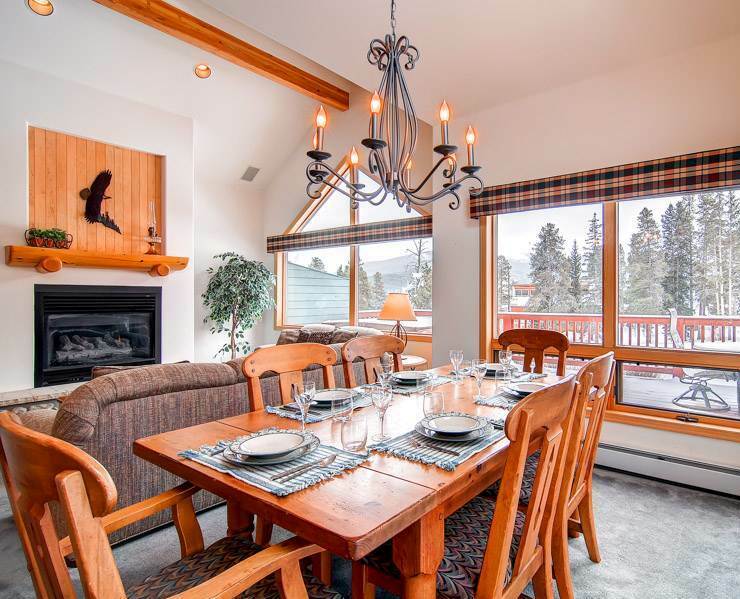 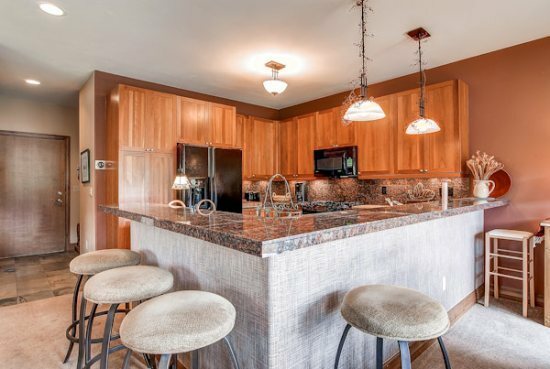 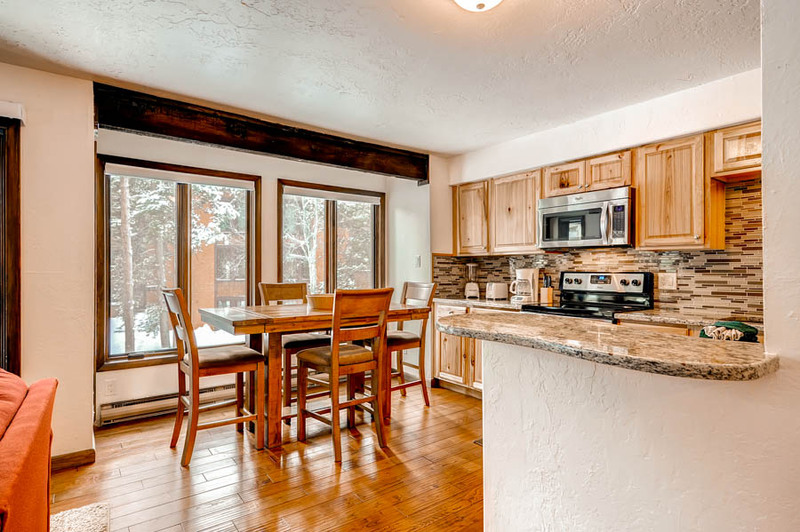 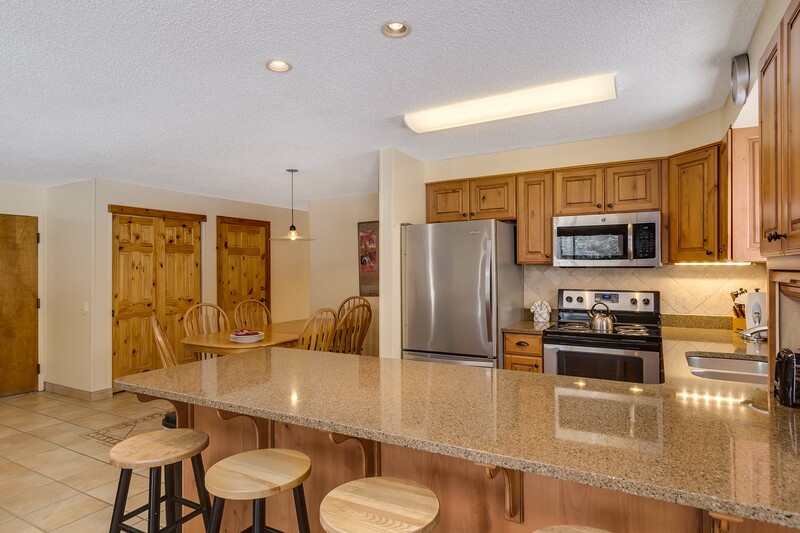 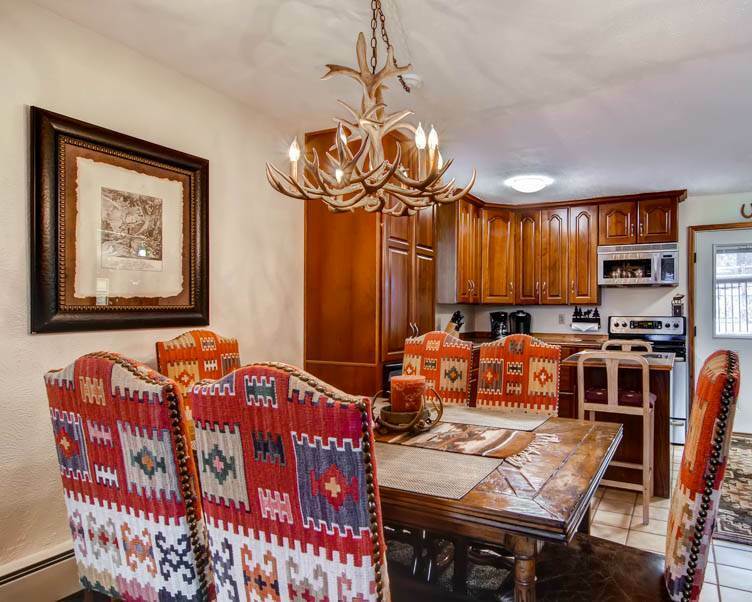 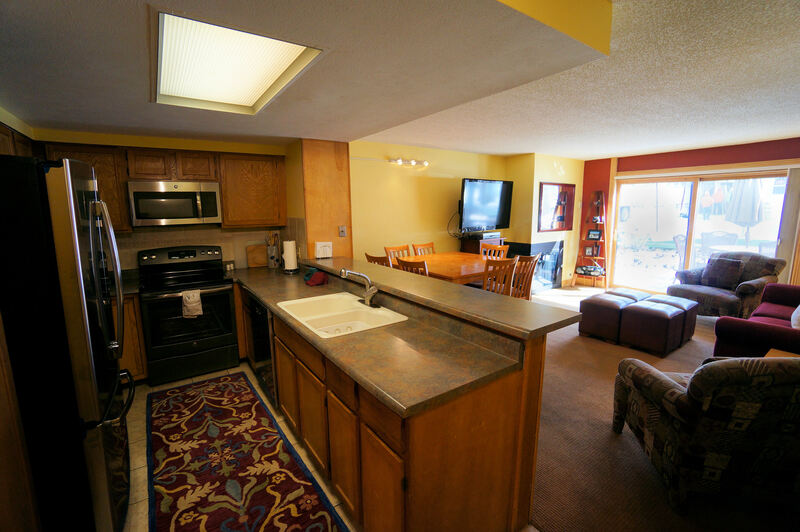 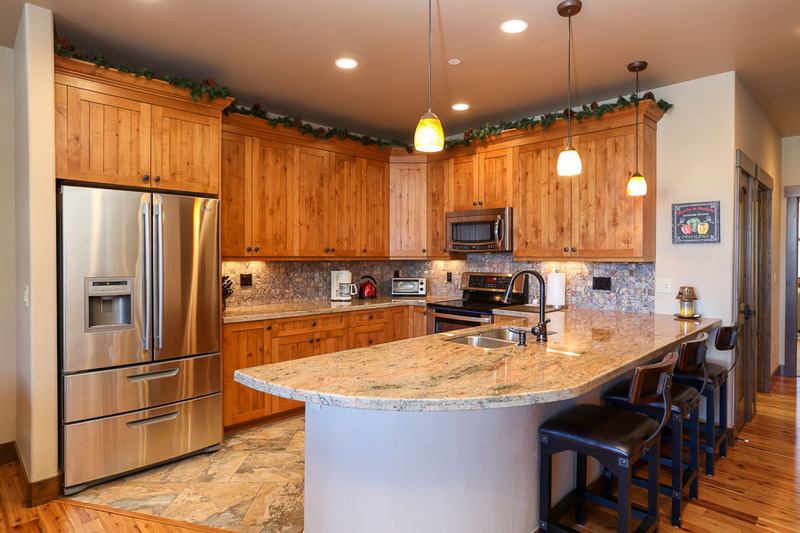 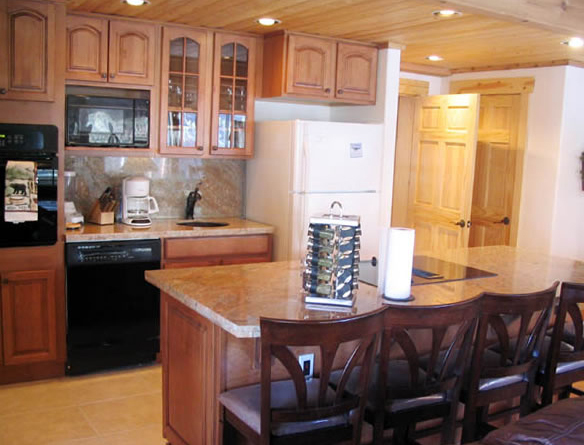 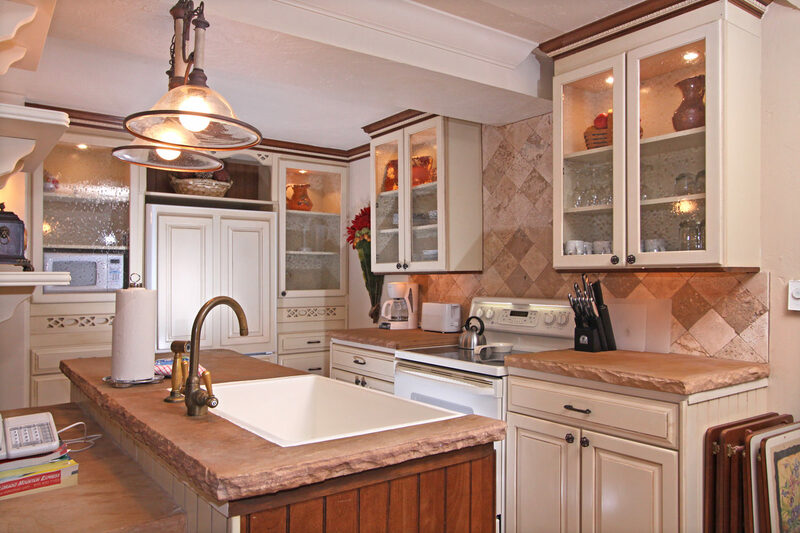 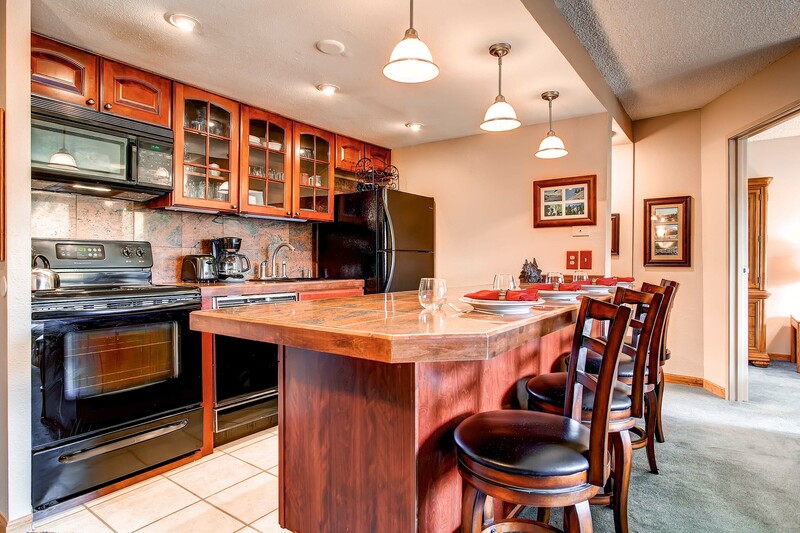 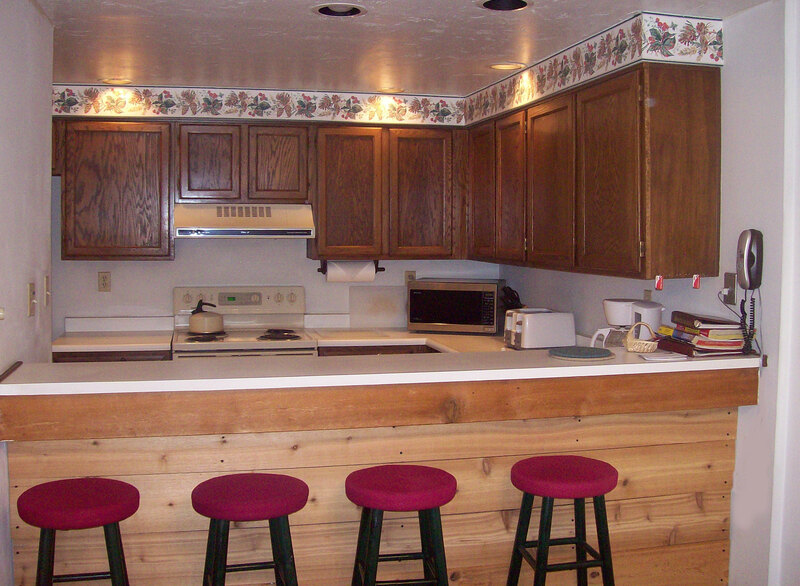 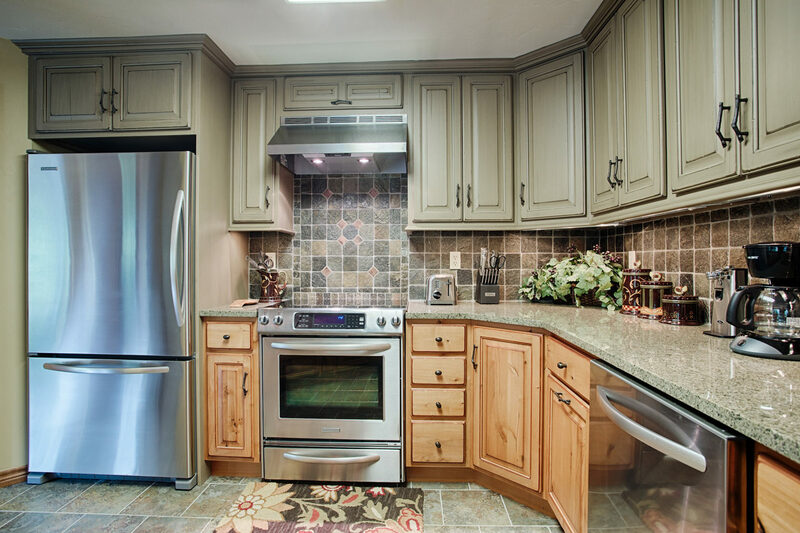 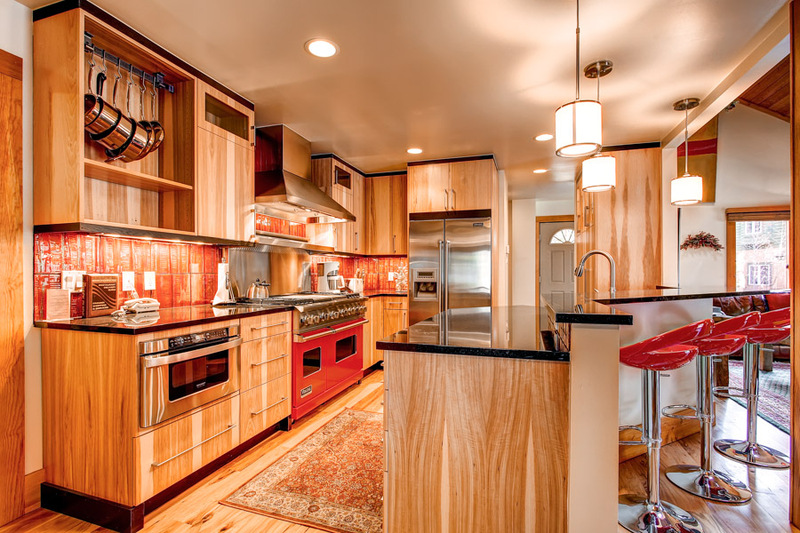 The fully equipped kitchen will let you whip up everything from après-ski snacks to holiday dinners for your hungry group. 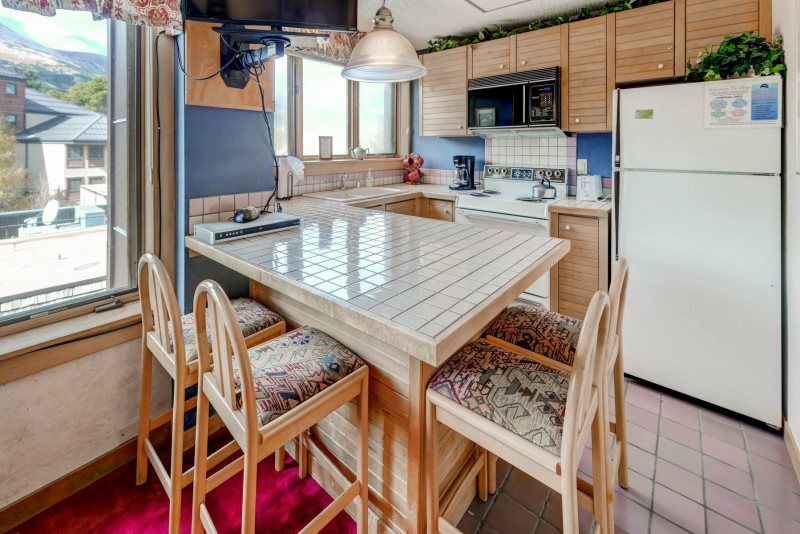 The large dining table seats eight, and there’s room for three at the counter. 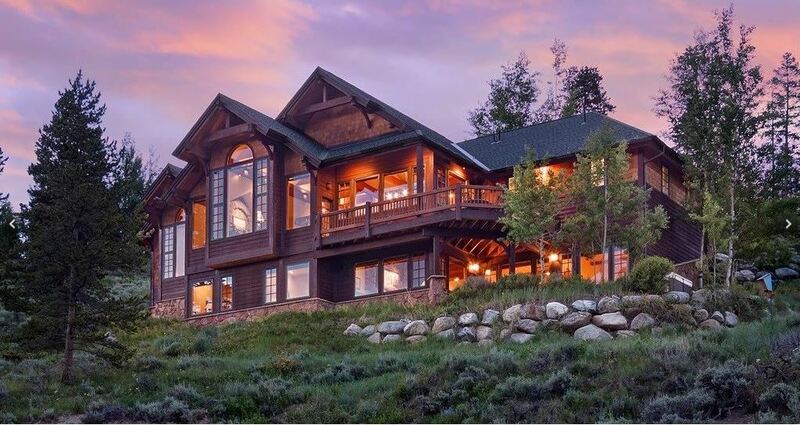 Outside there are 3 decks. 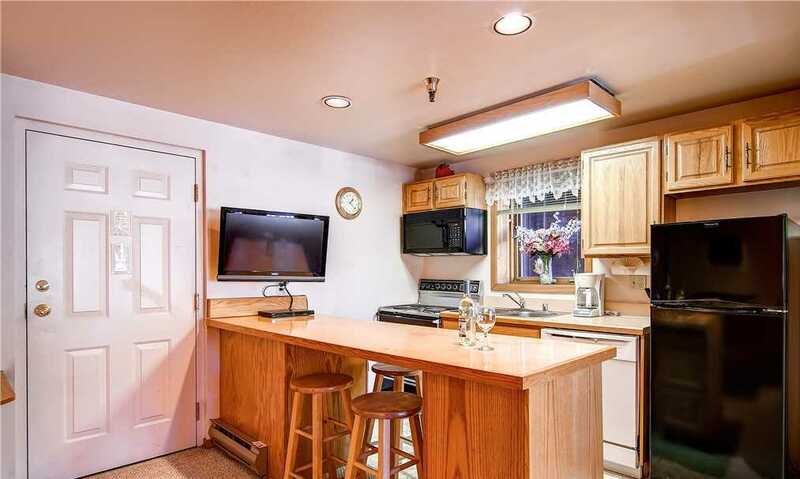 You’ll find a gas grill to go with that hot tub. 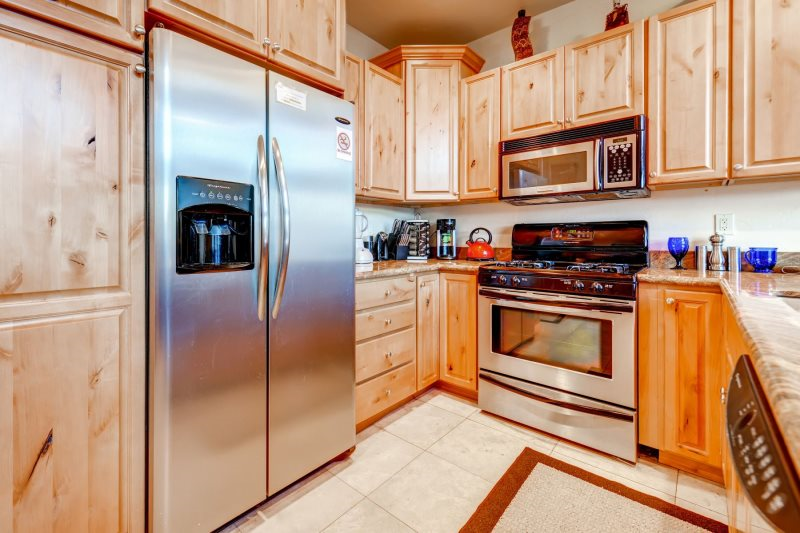 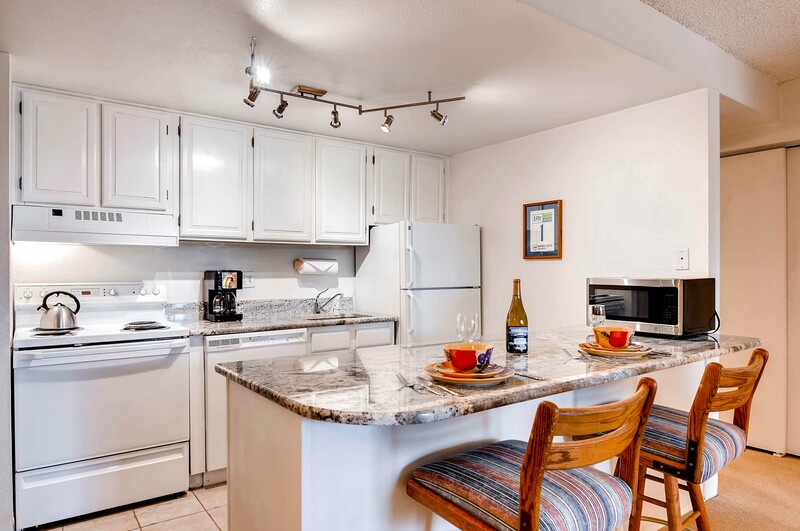 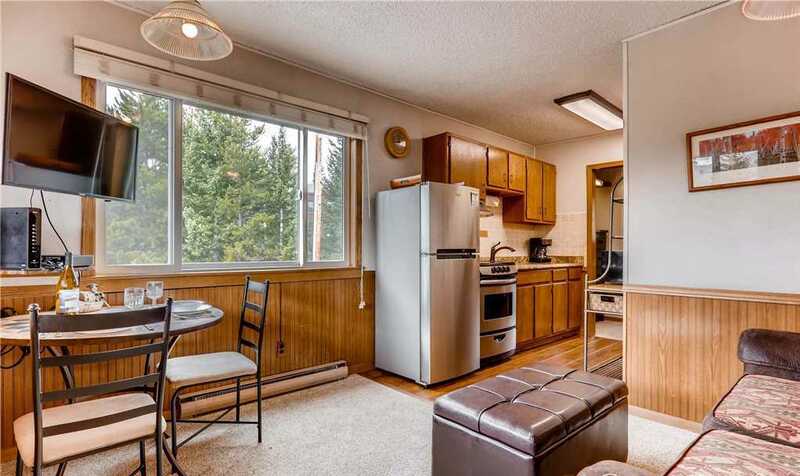 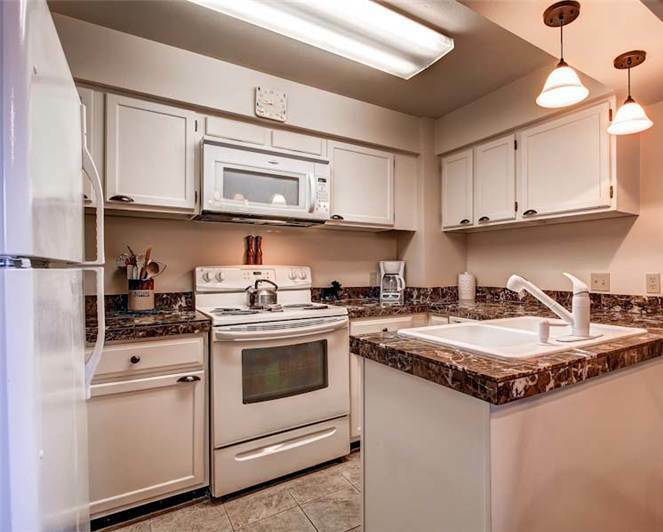 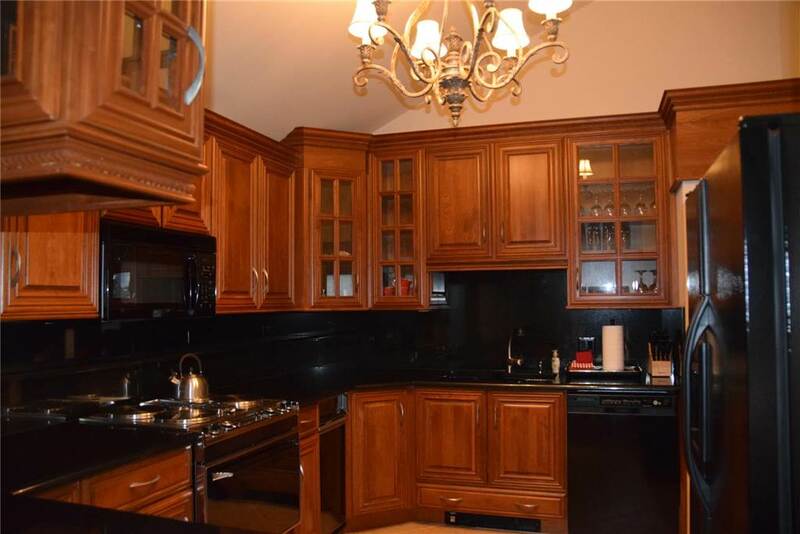 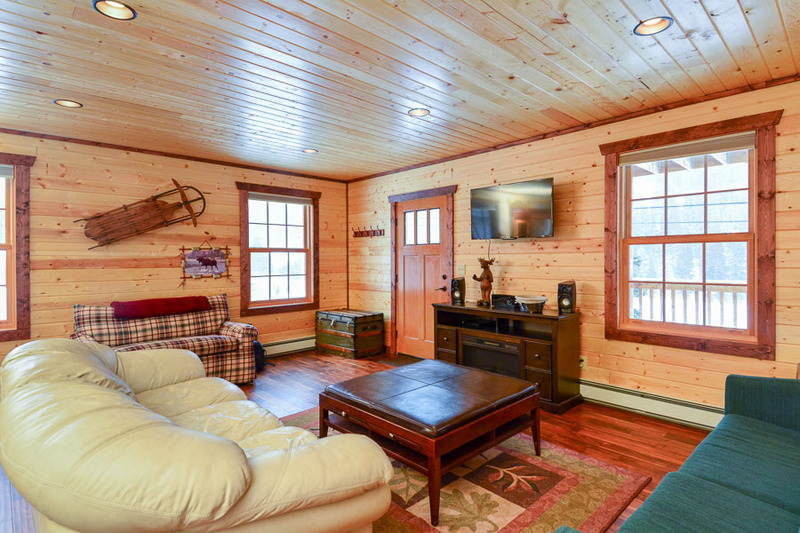 Other amenities include a heated one-car garage and one outdoor parking space, a full washer and dryer, and complimentary Wi-Fi throughout the home. 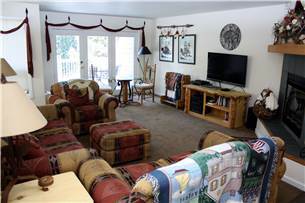 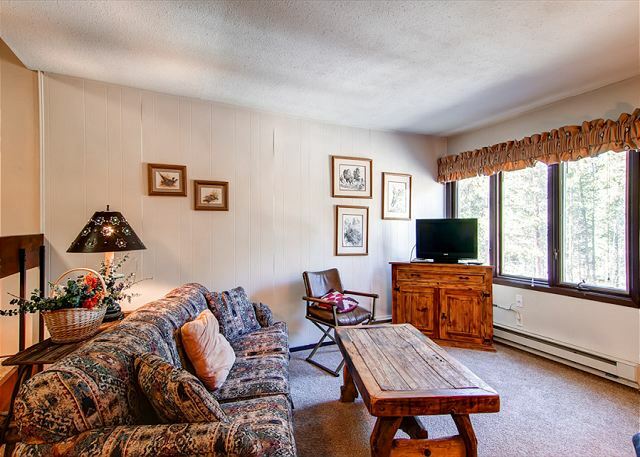 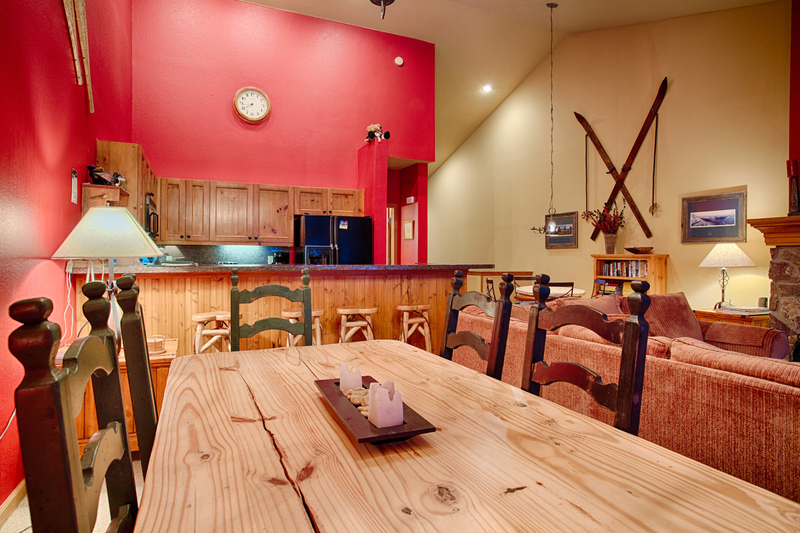 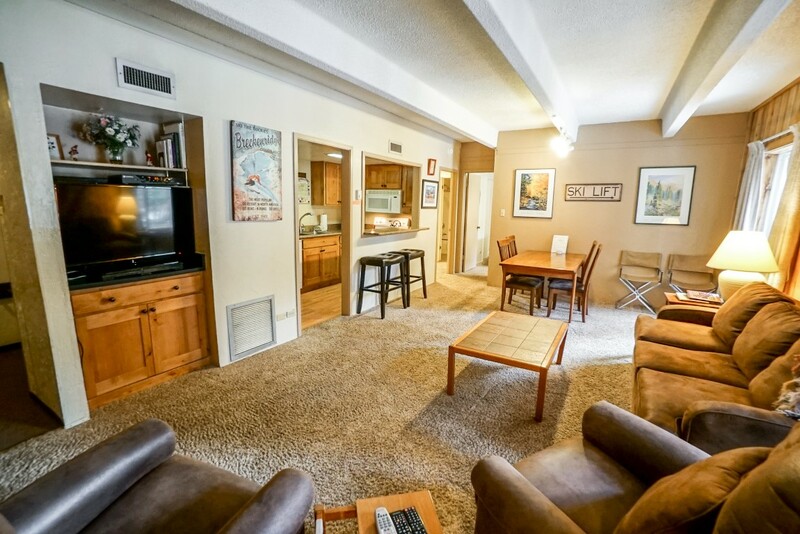 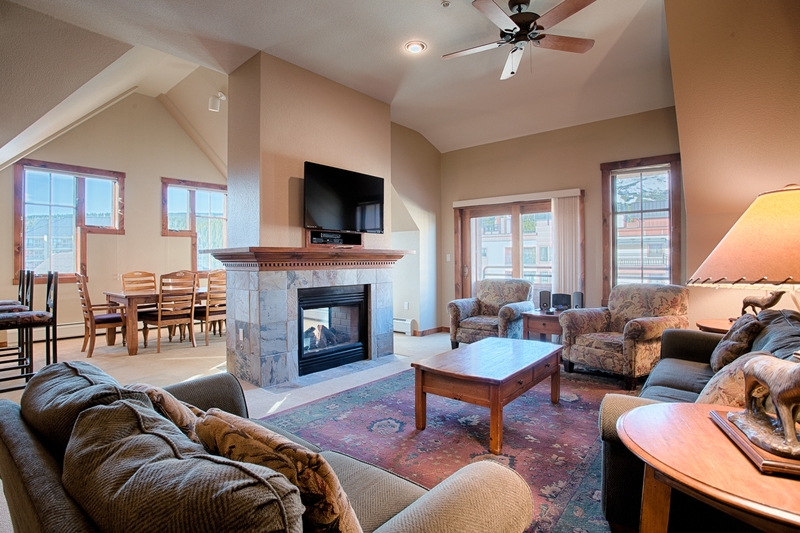 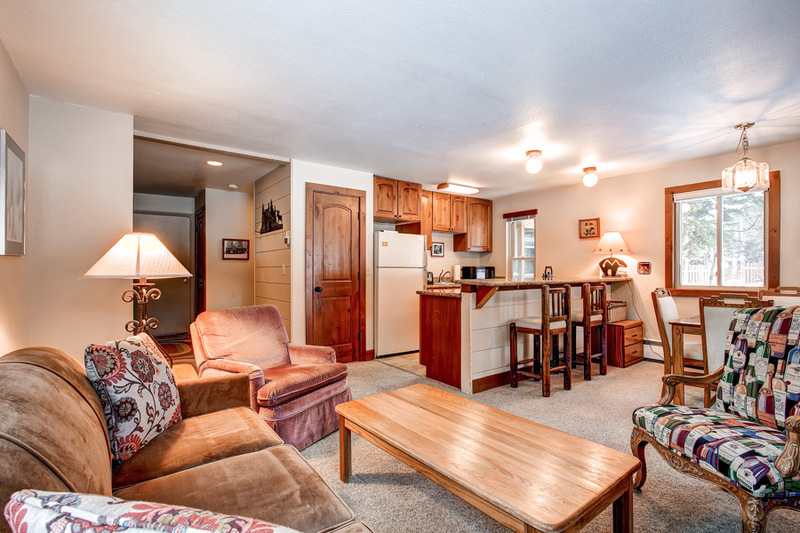 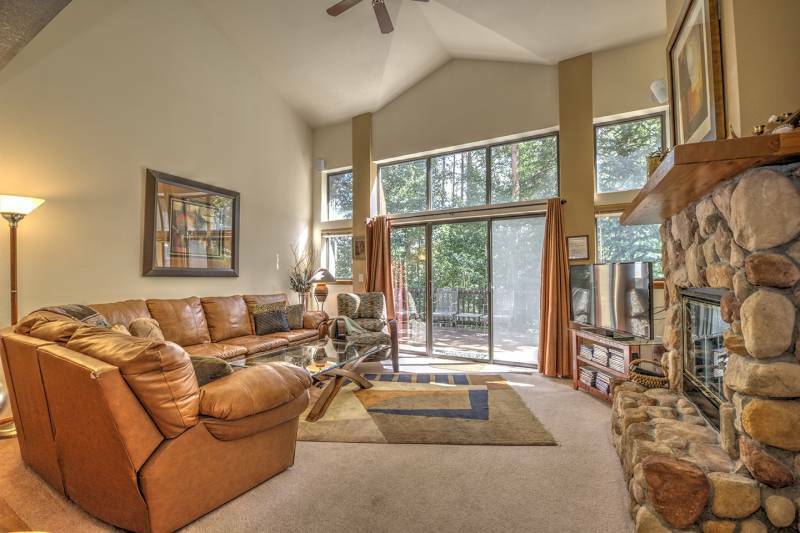 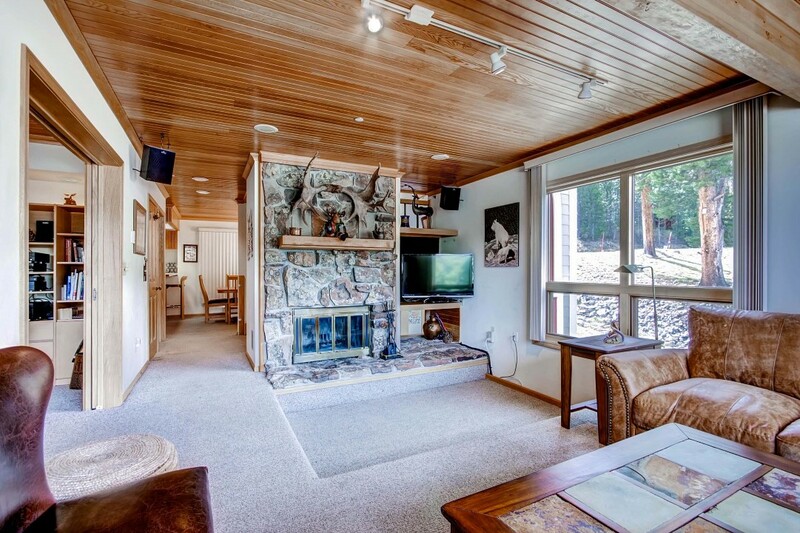 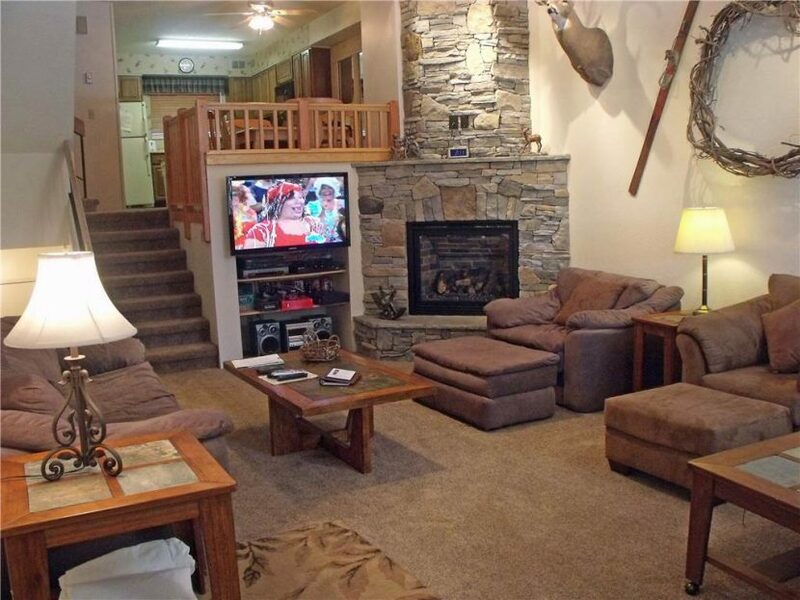 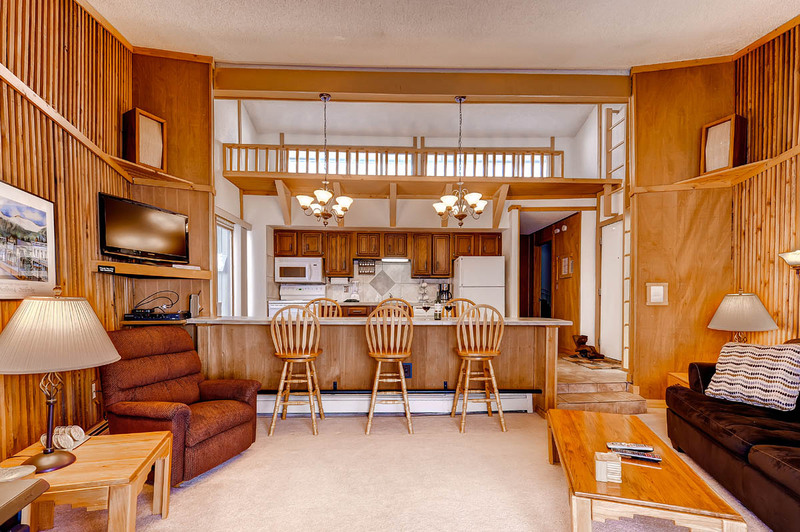 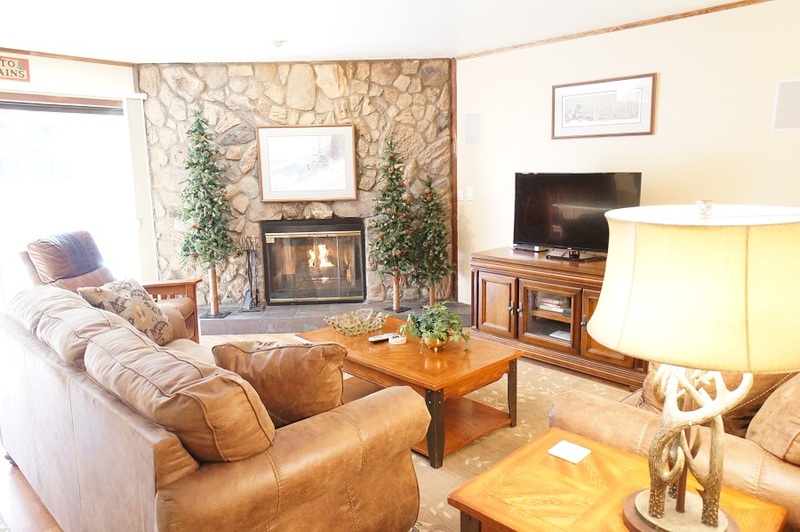 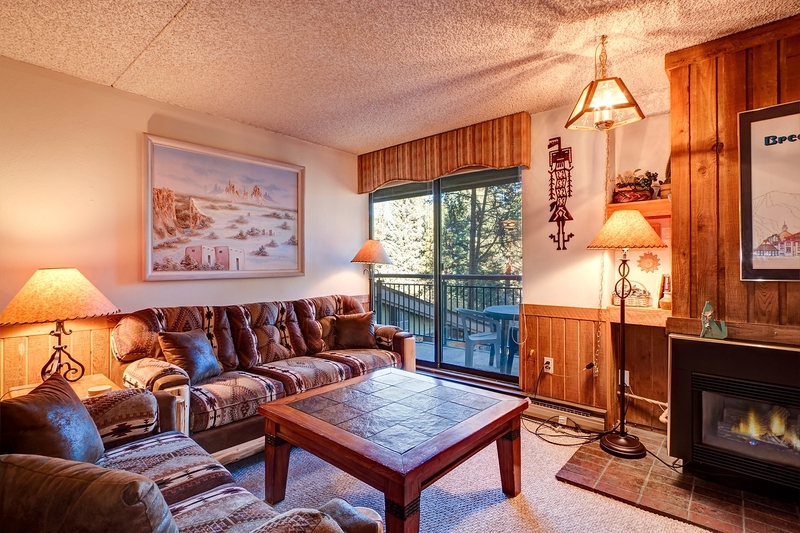 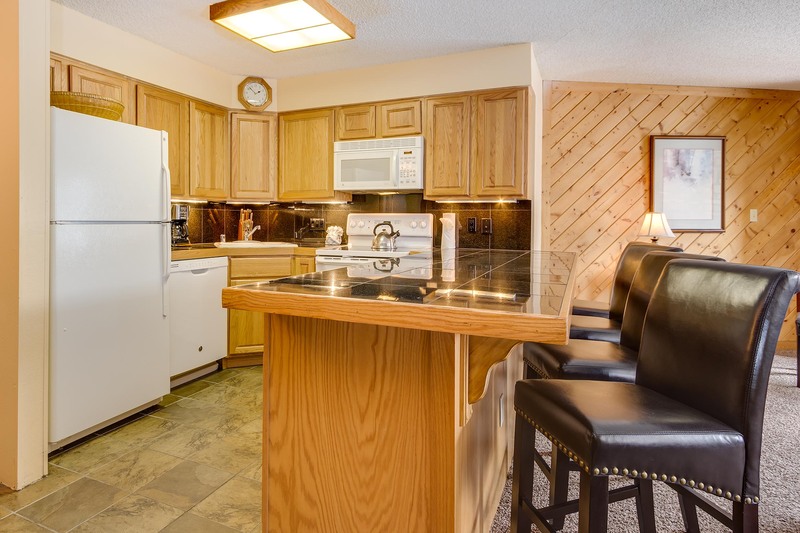 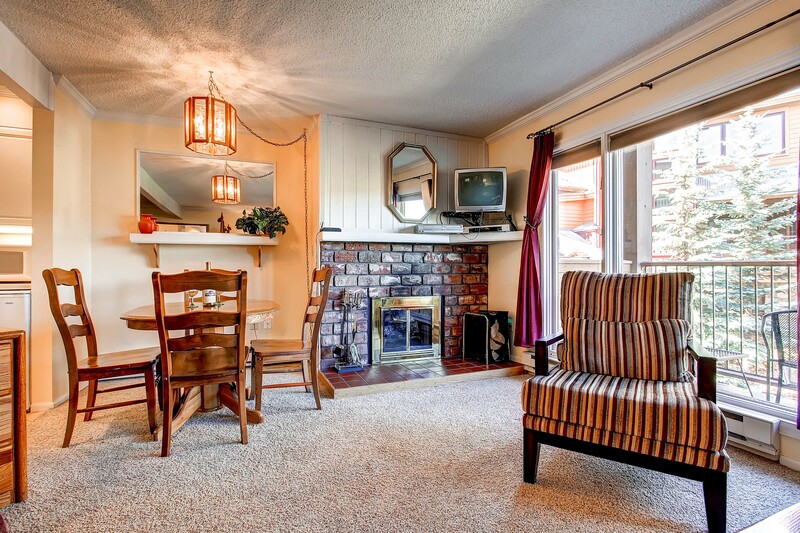 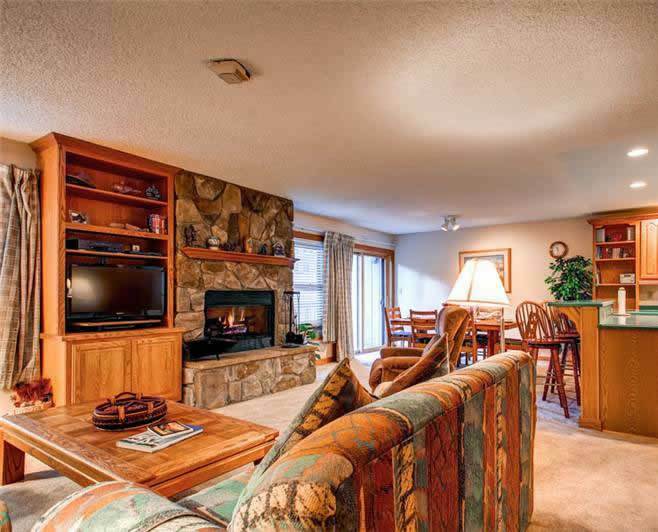 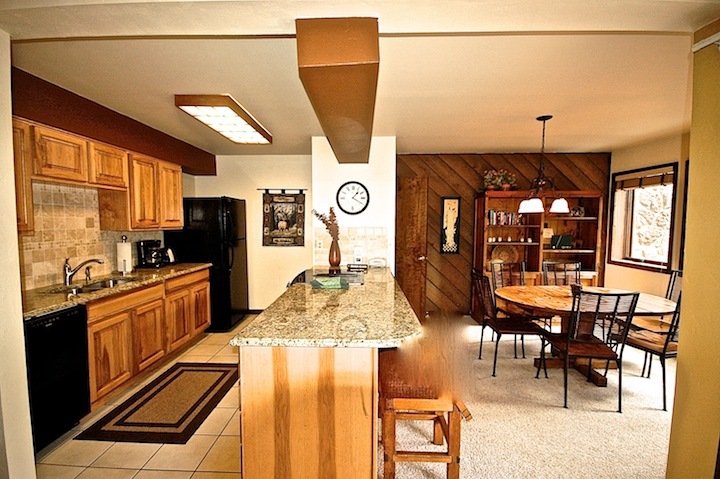 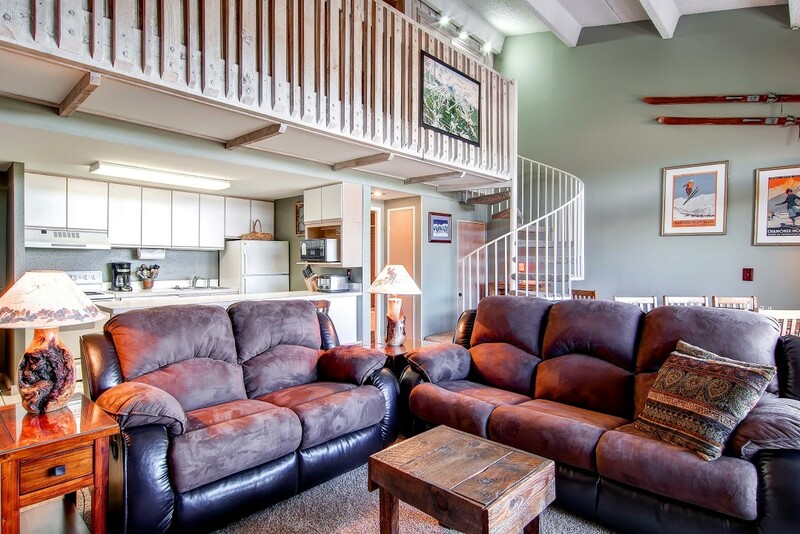 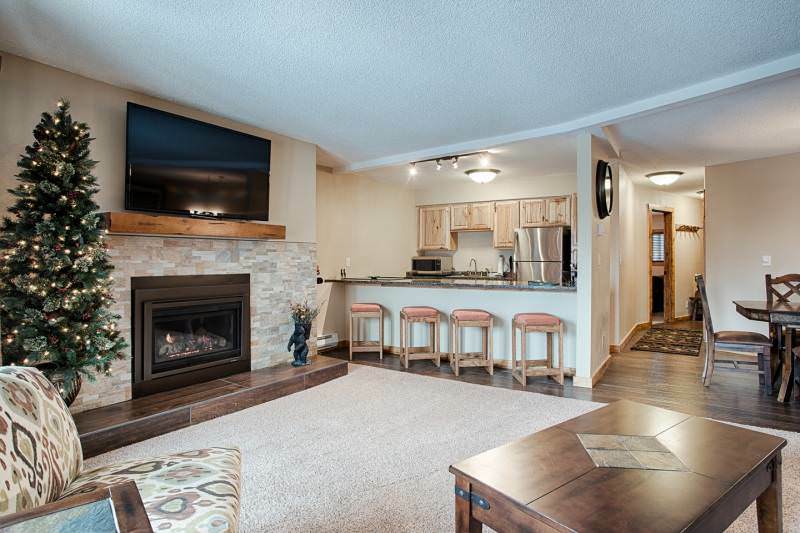 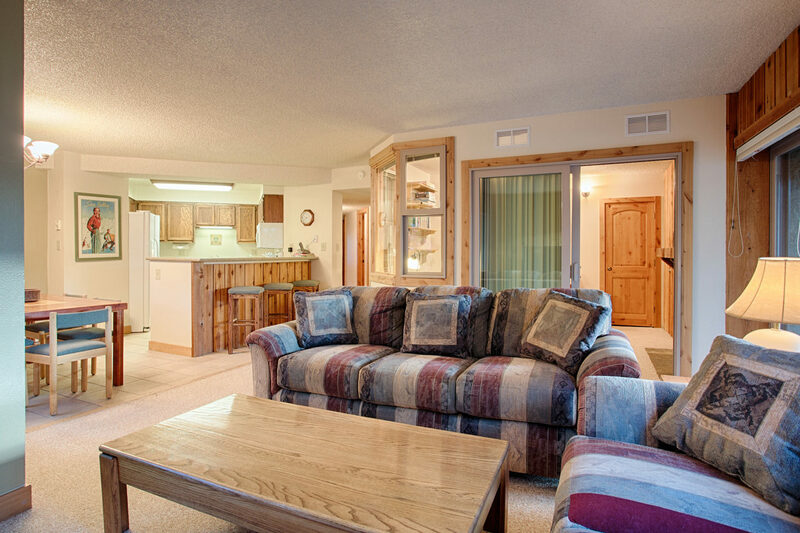 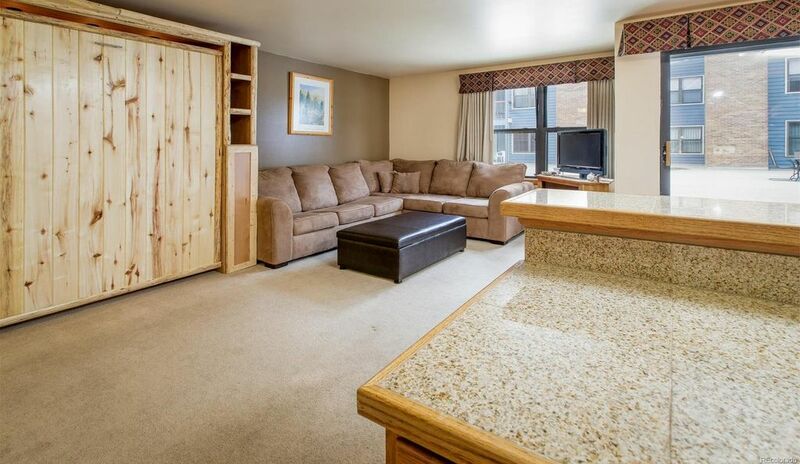 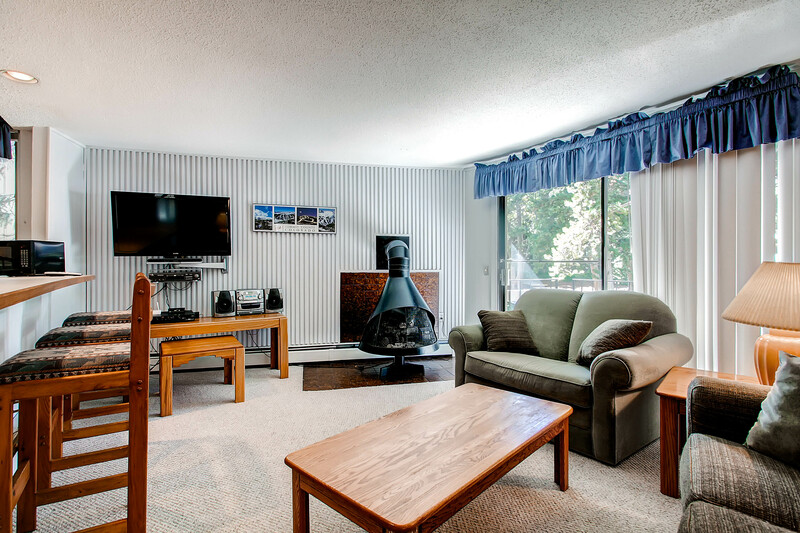 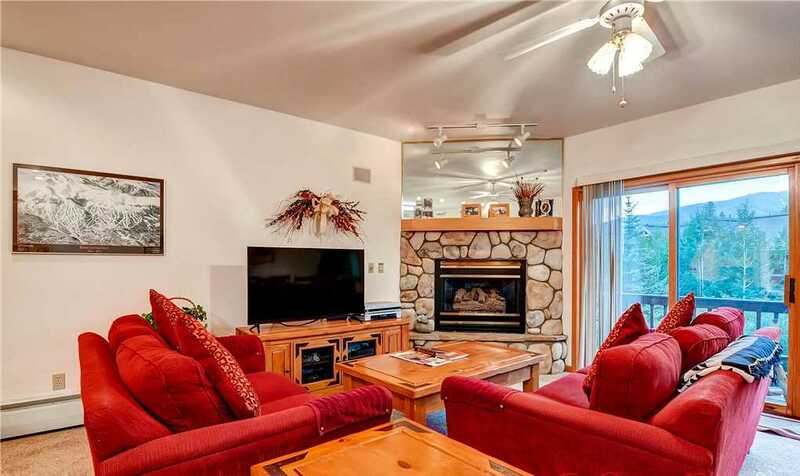 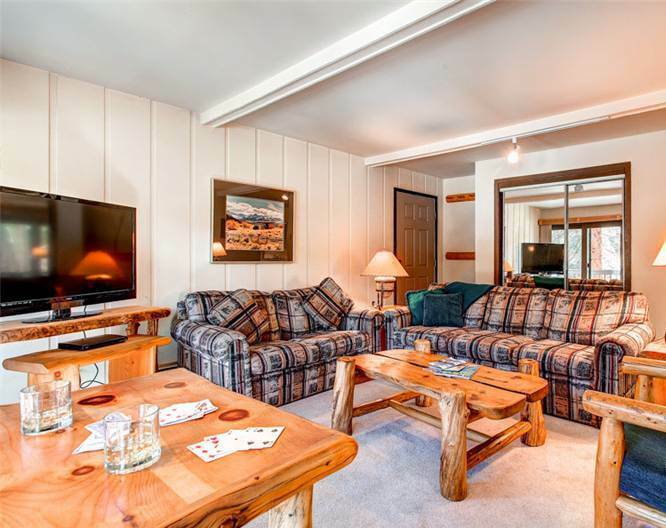 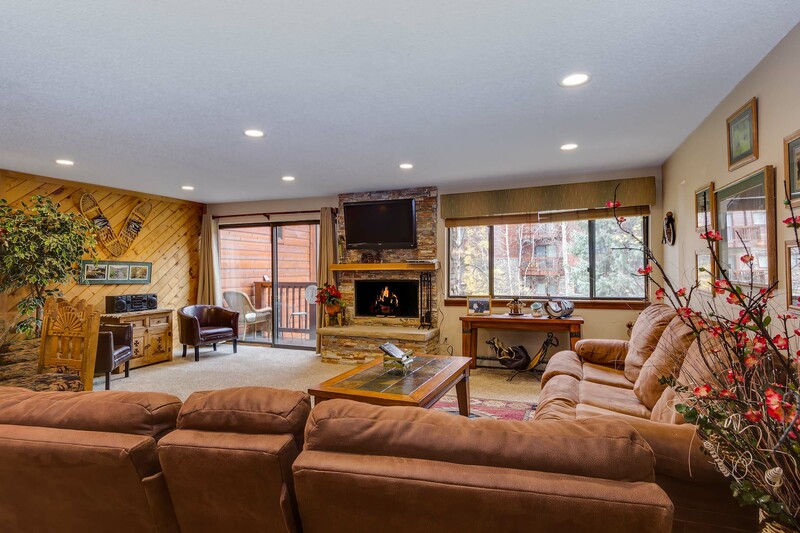 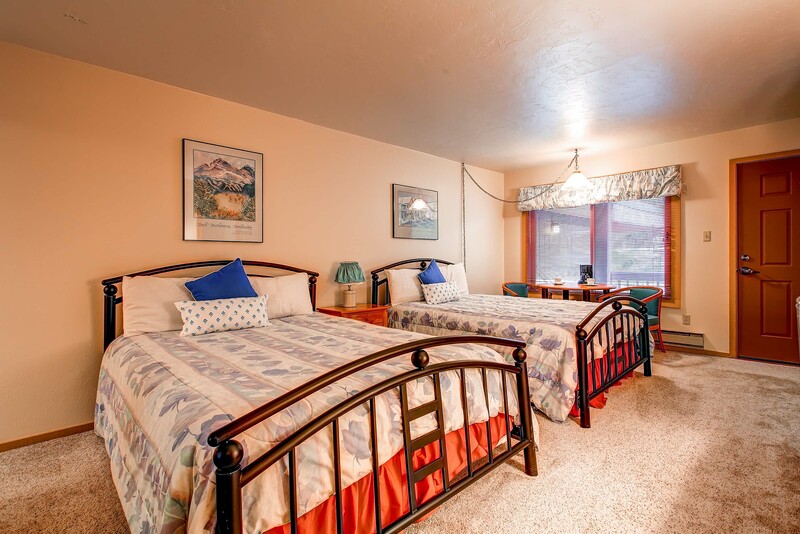 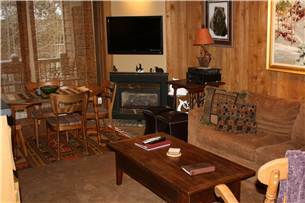 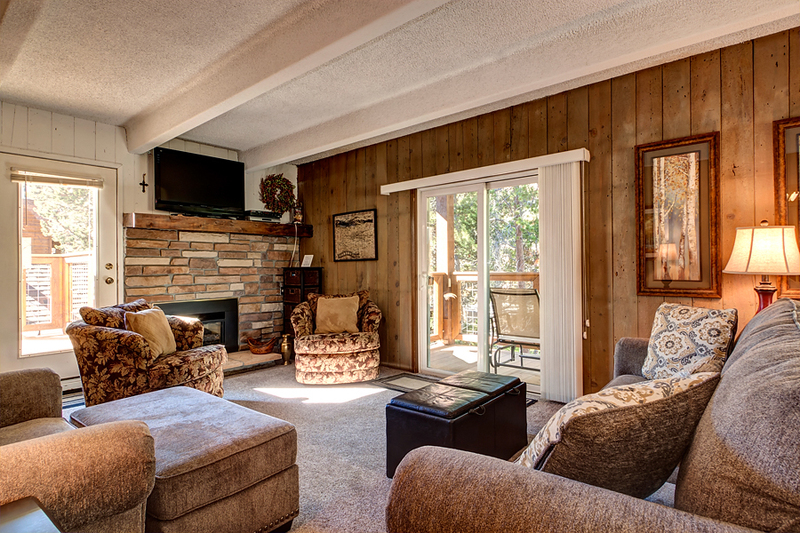 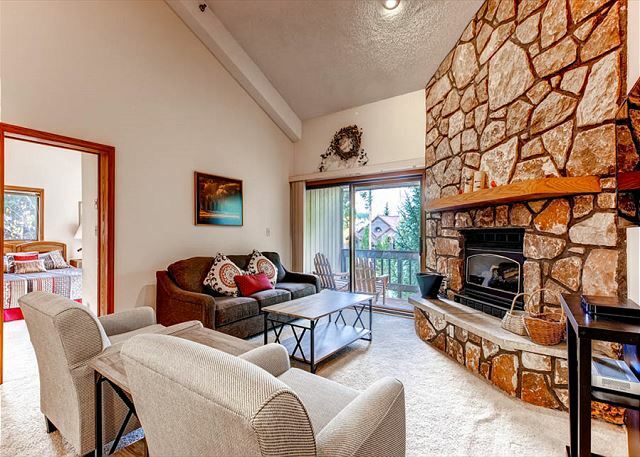 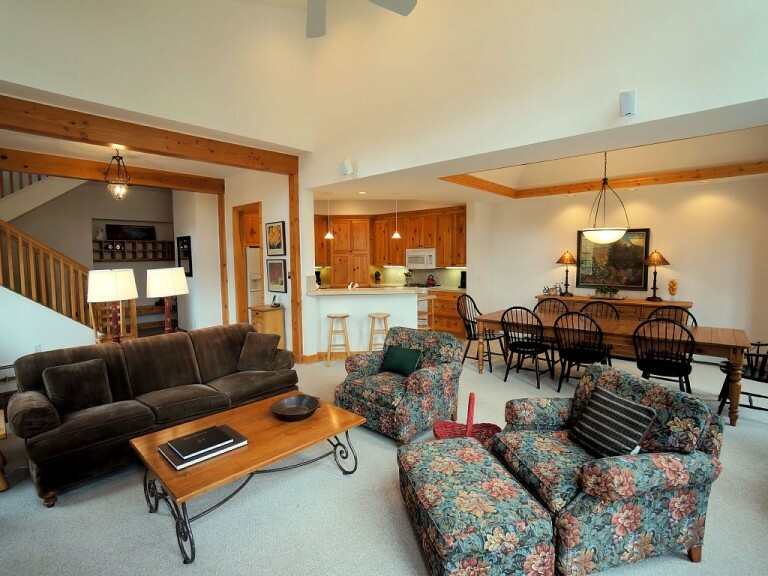 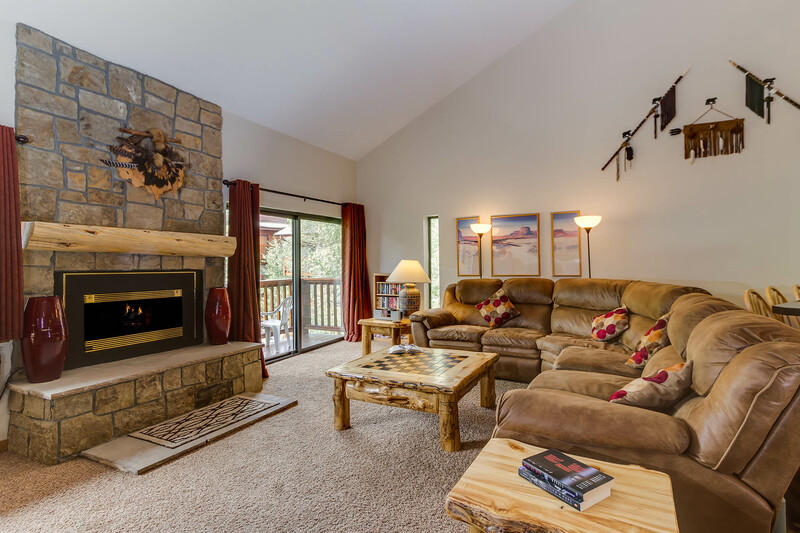 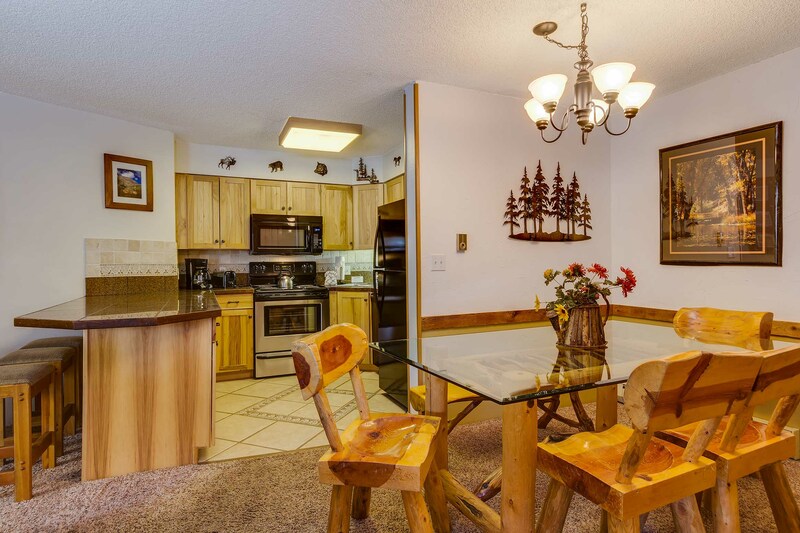 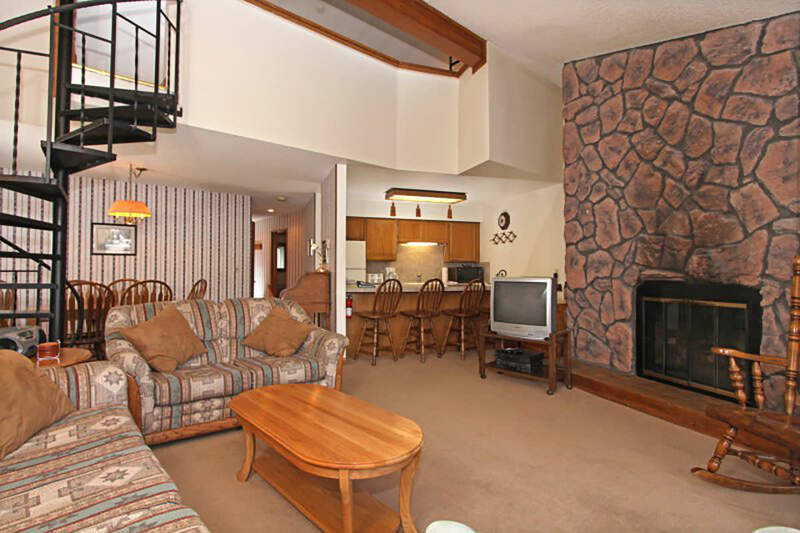 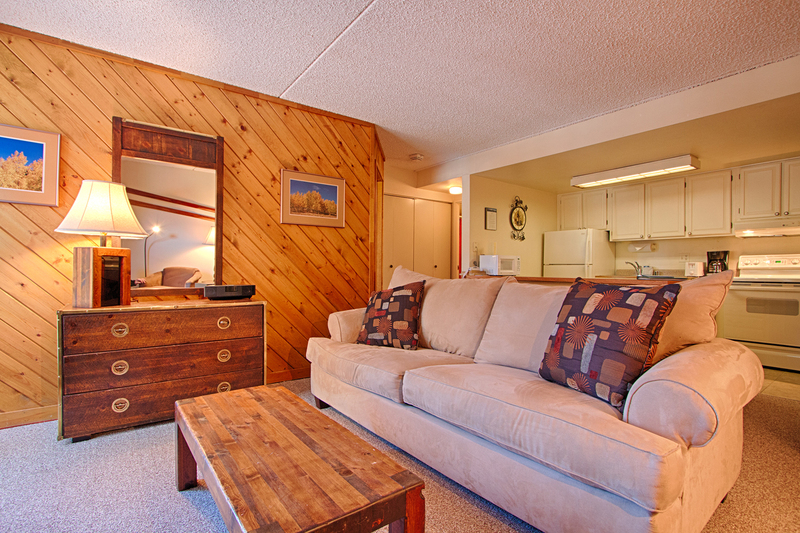 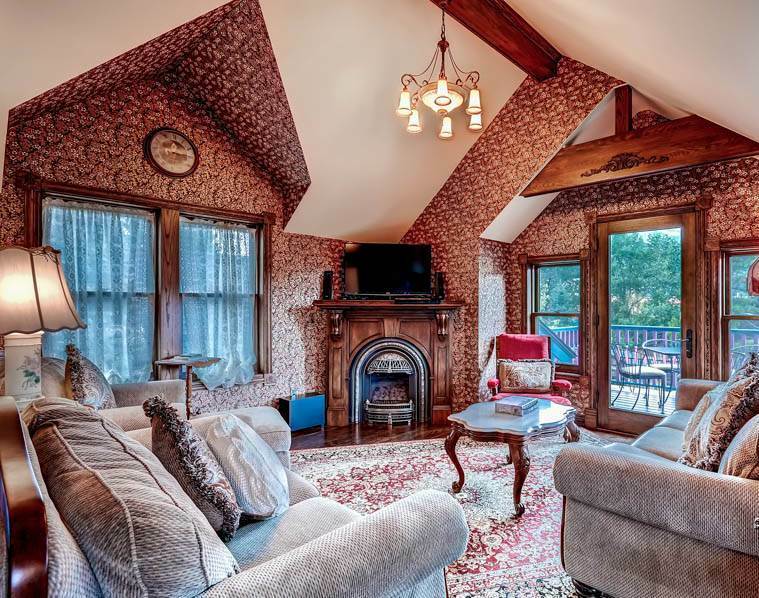 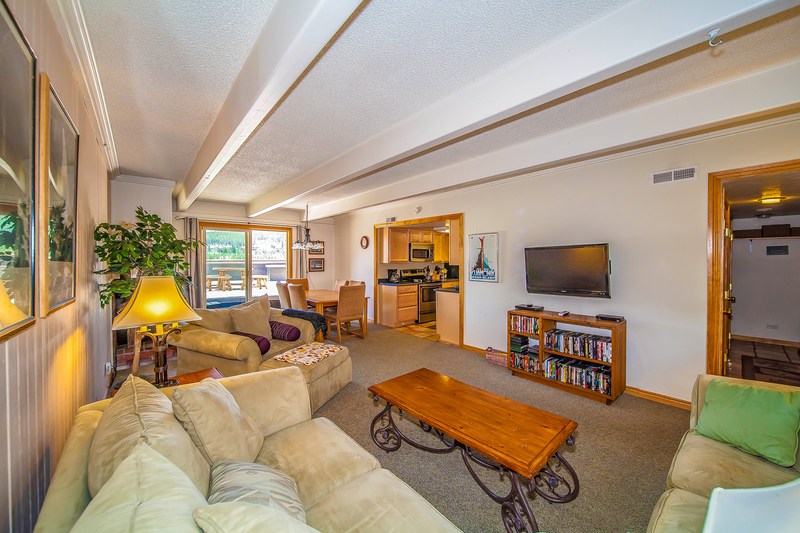 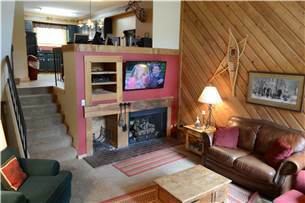 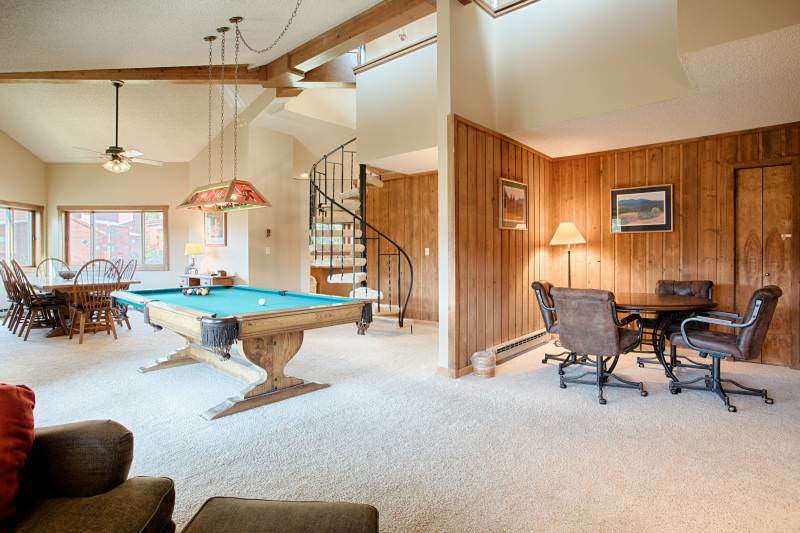 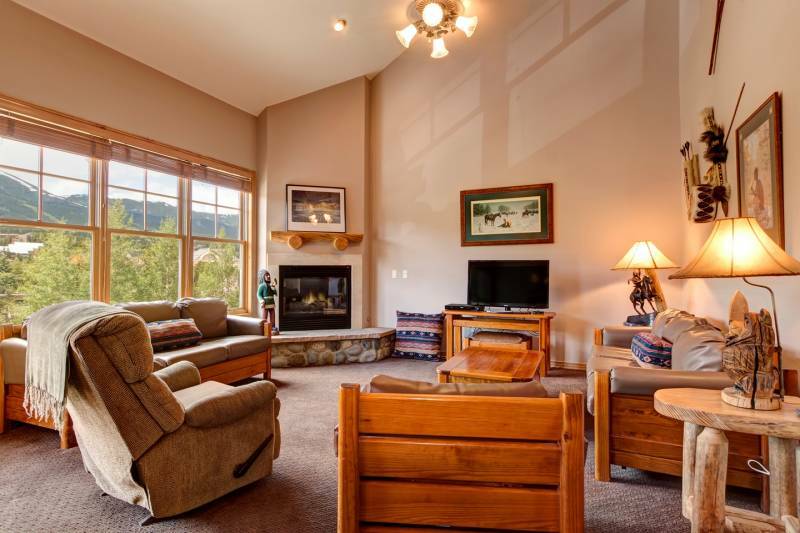 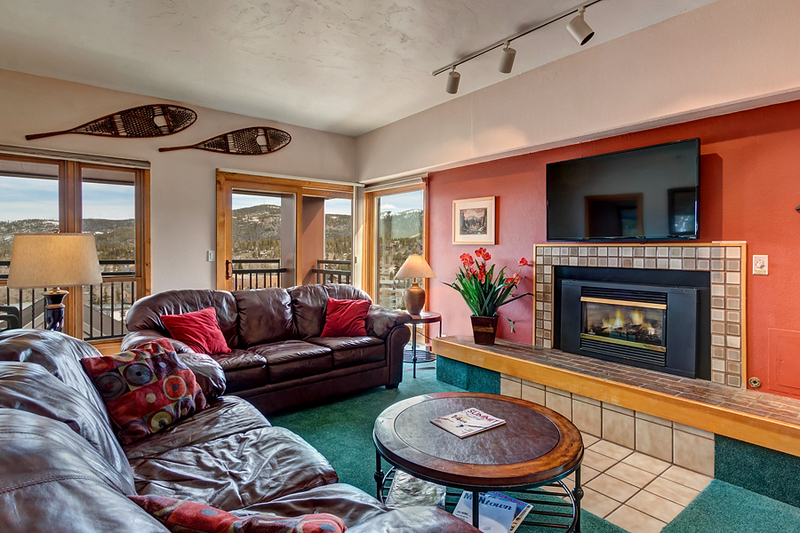 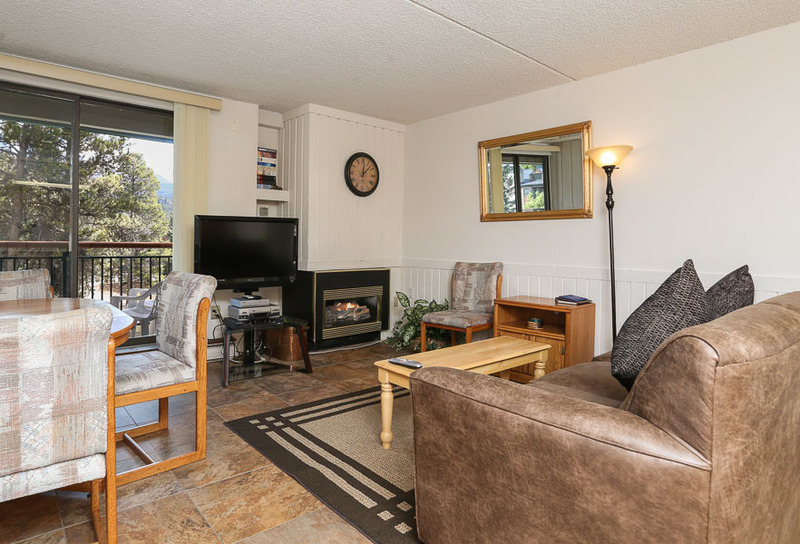 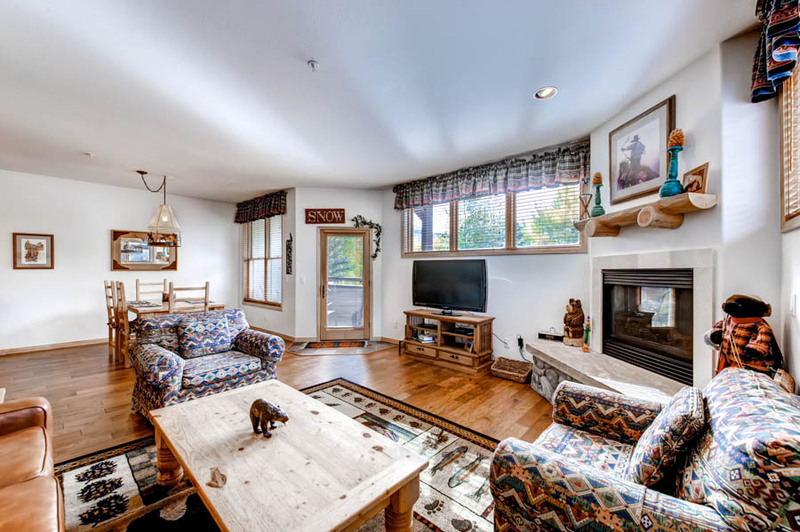 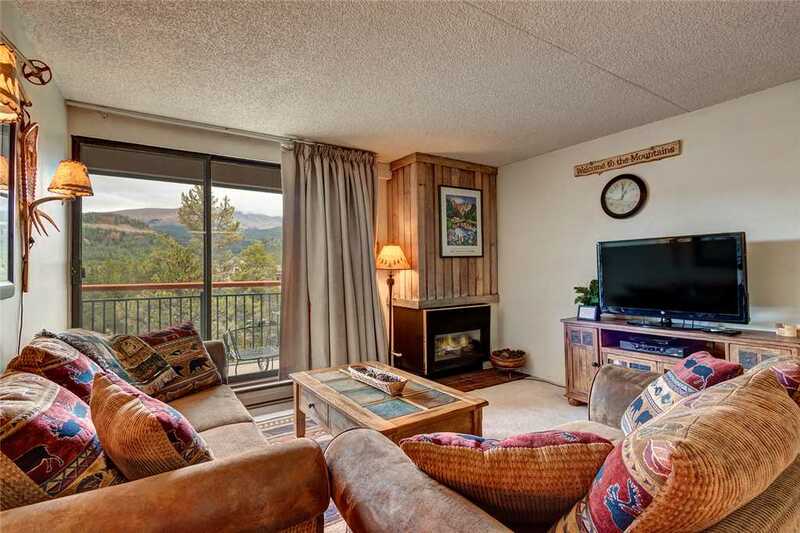 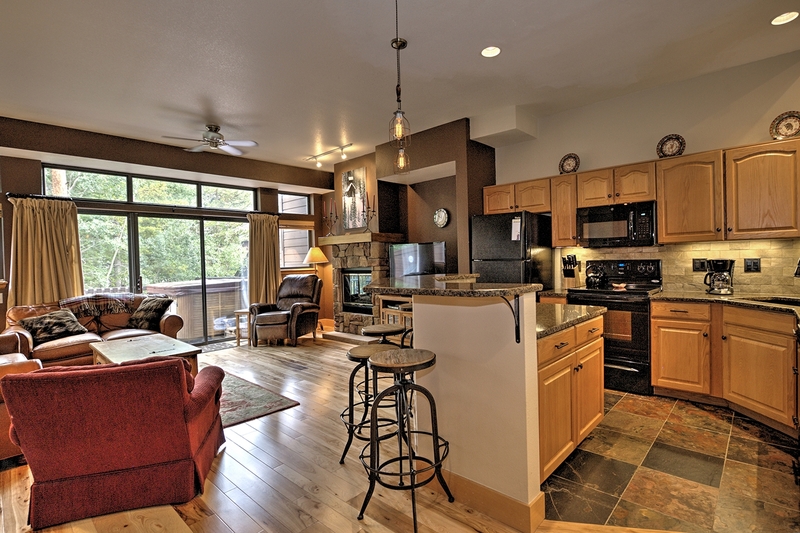 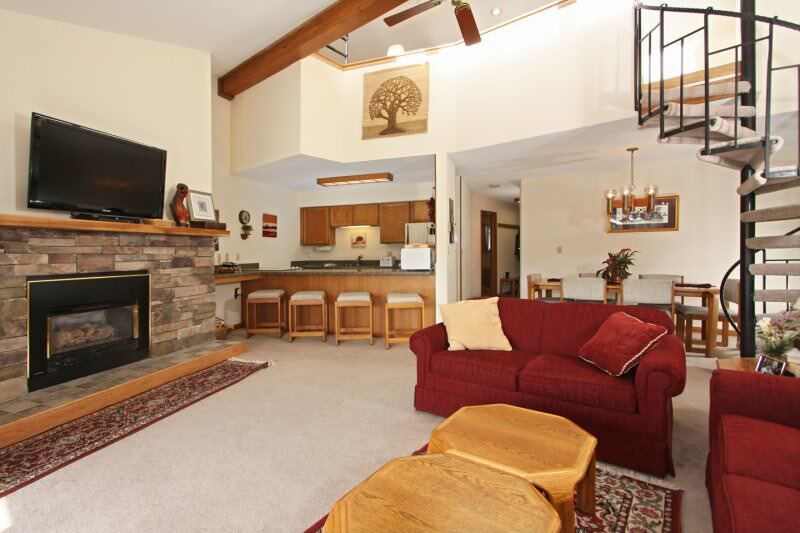 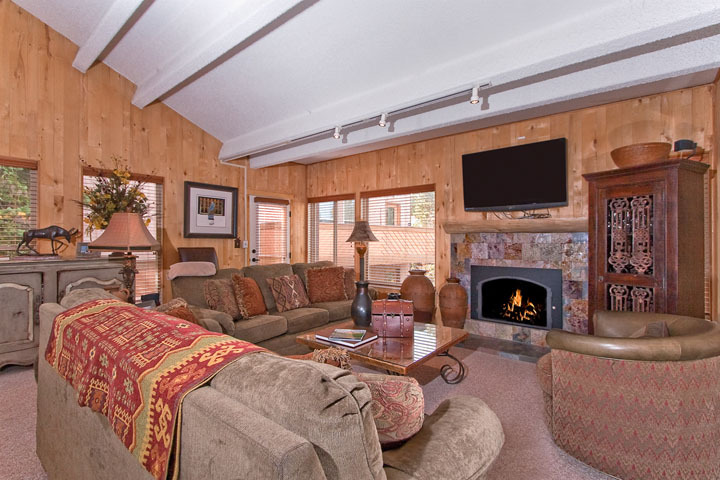 Chimney Ridge 506 has it all — room for 10, a cool location, a private hot tub and more — all at a great price. 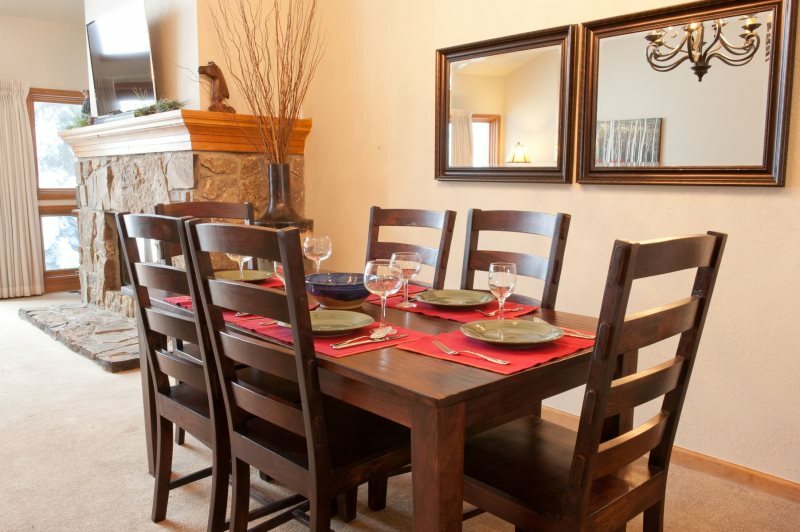 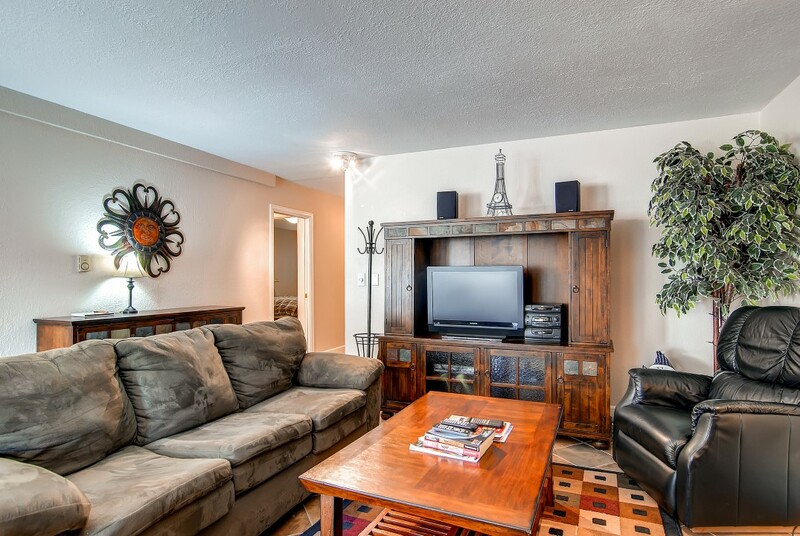 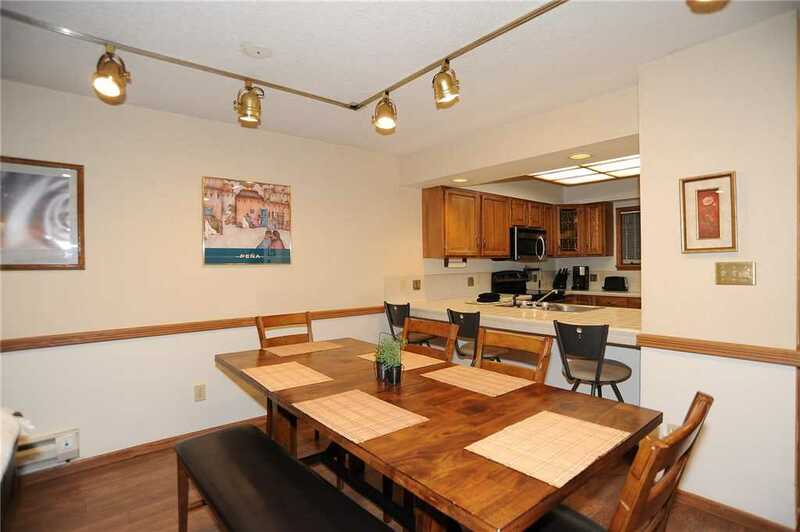 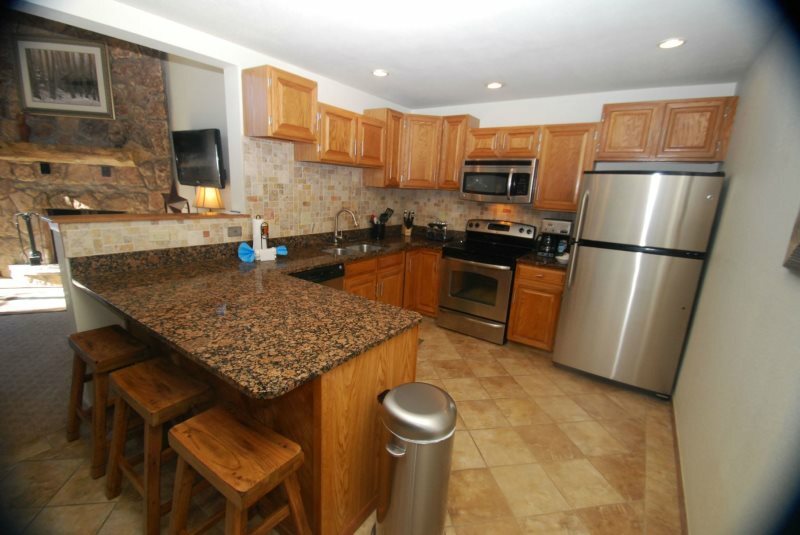 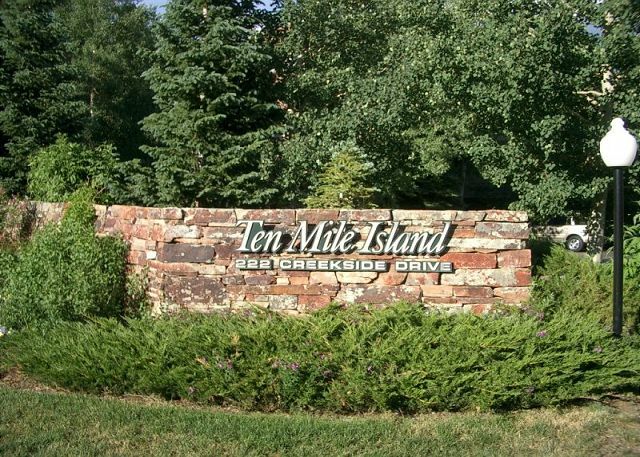 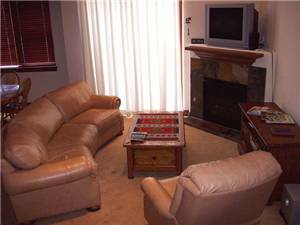 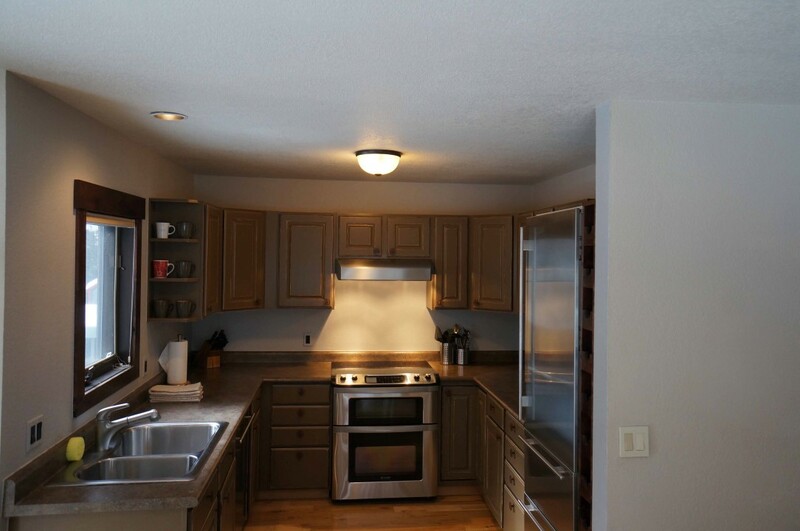 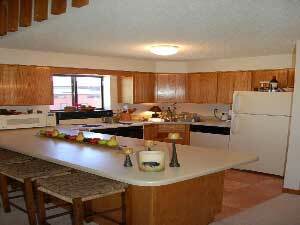 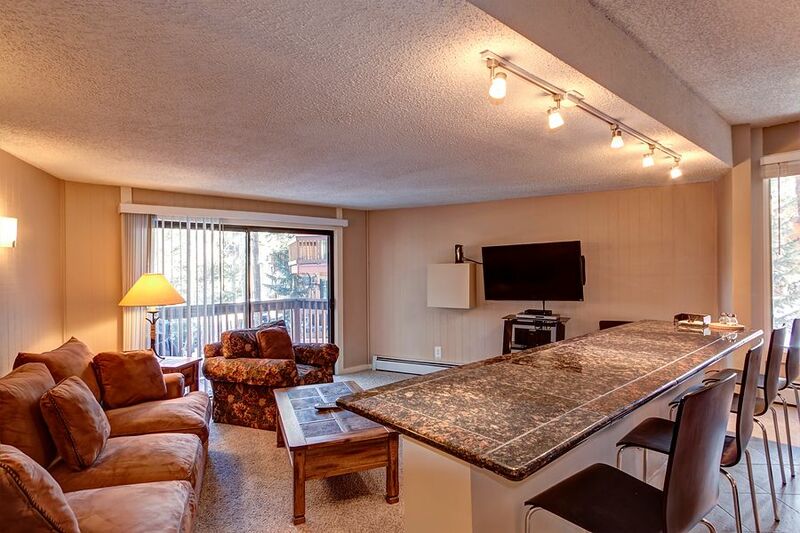 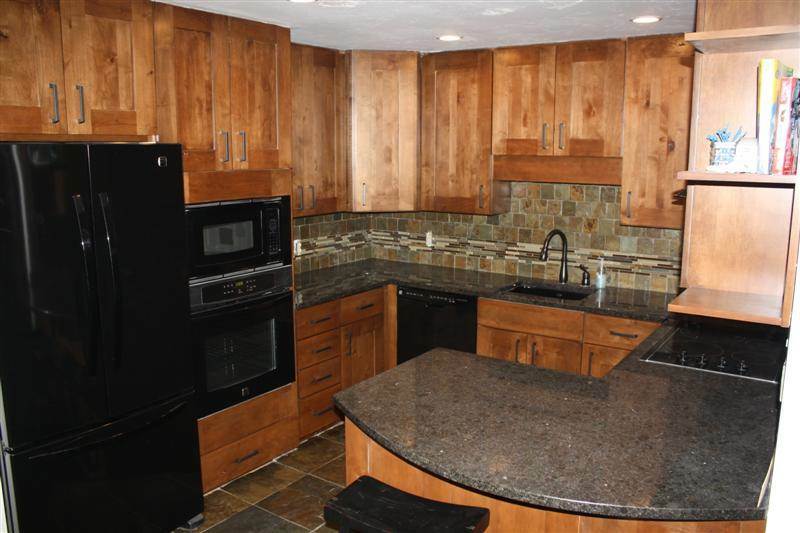 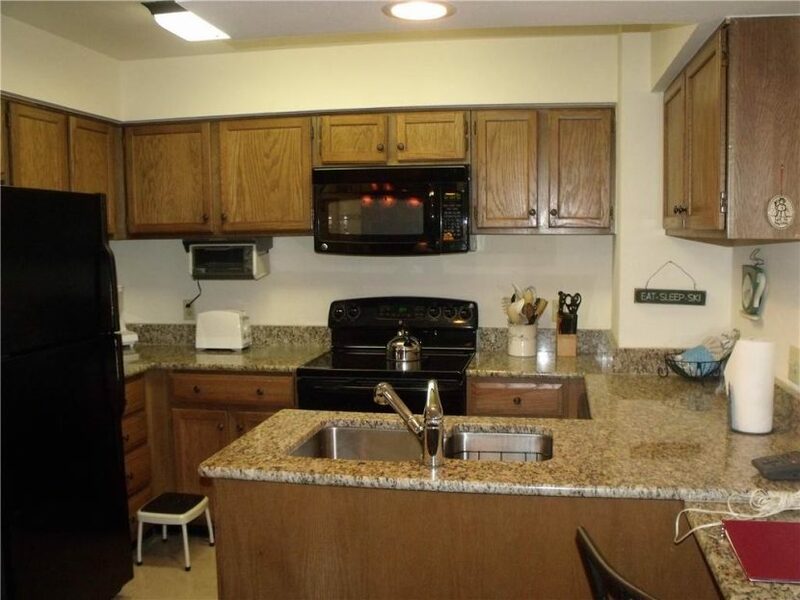 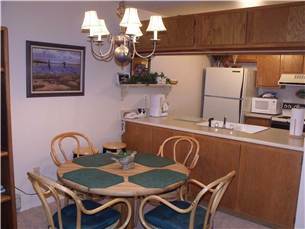 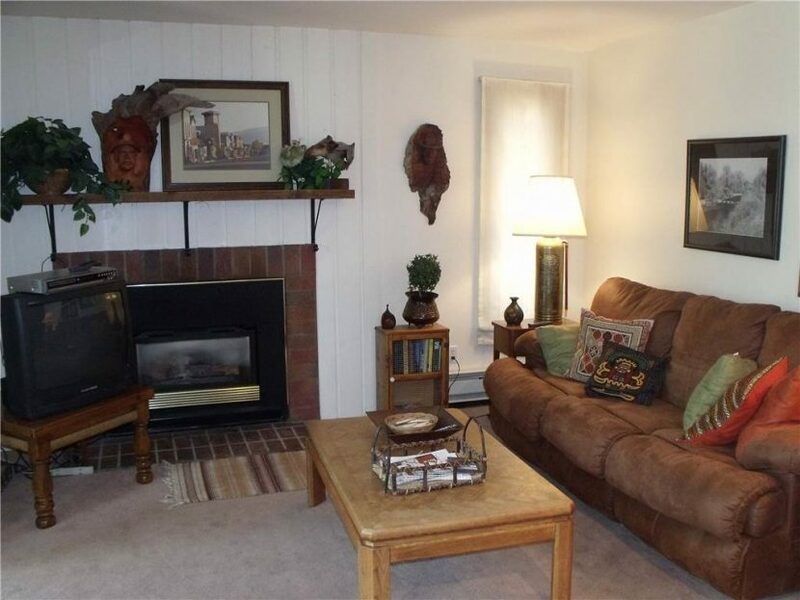 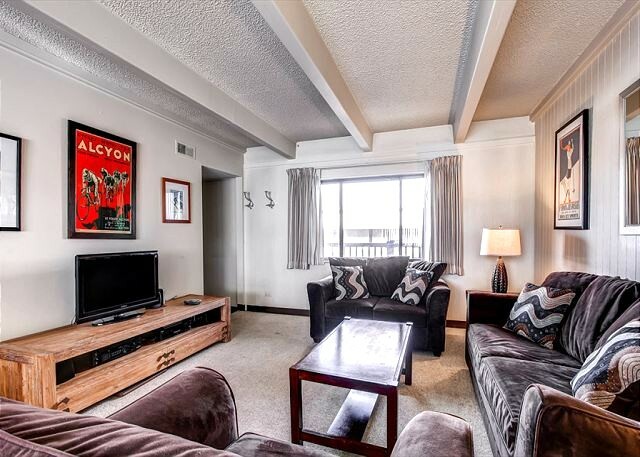 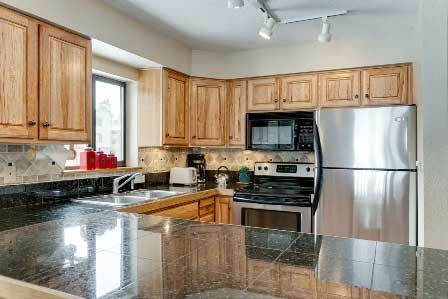 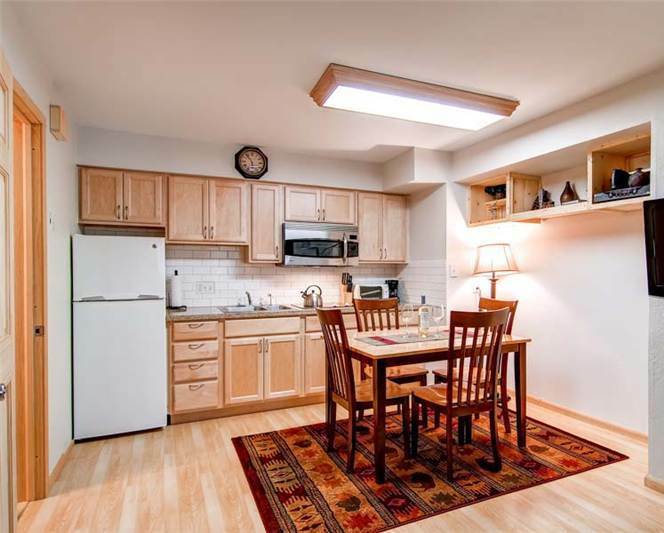 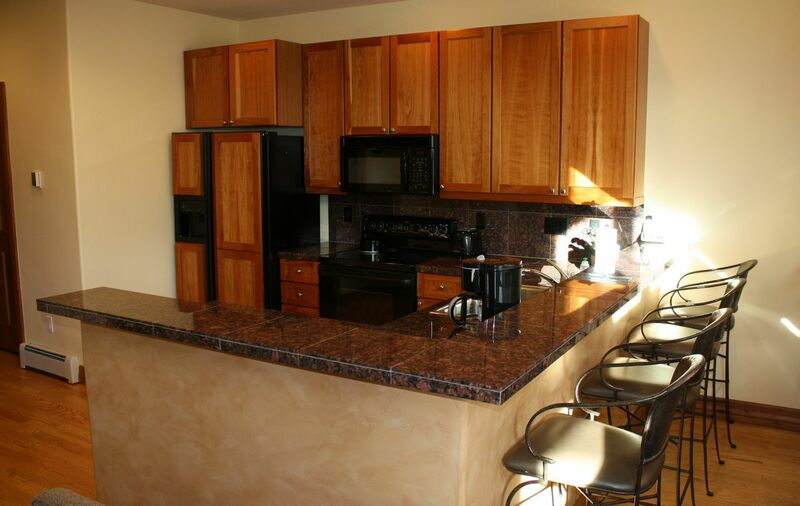 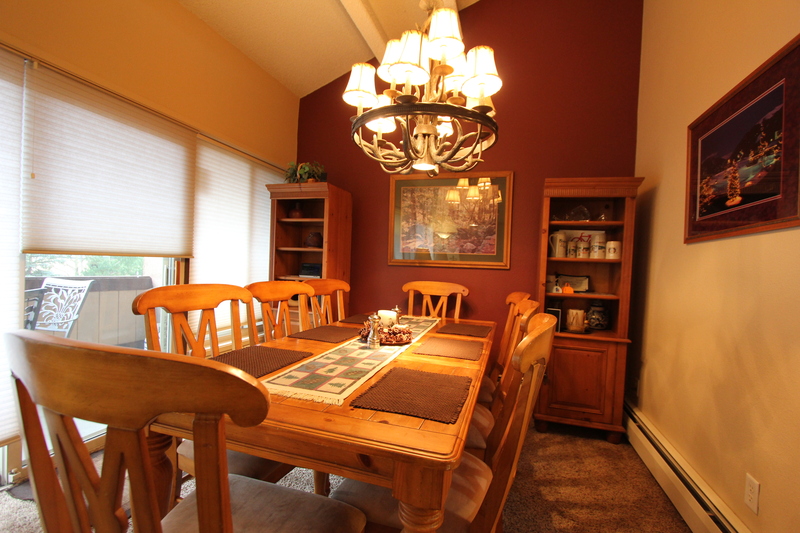 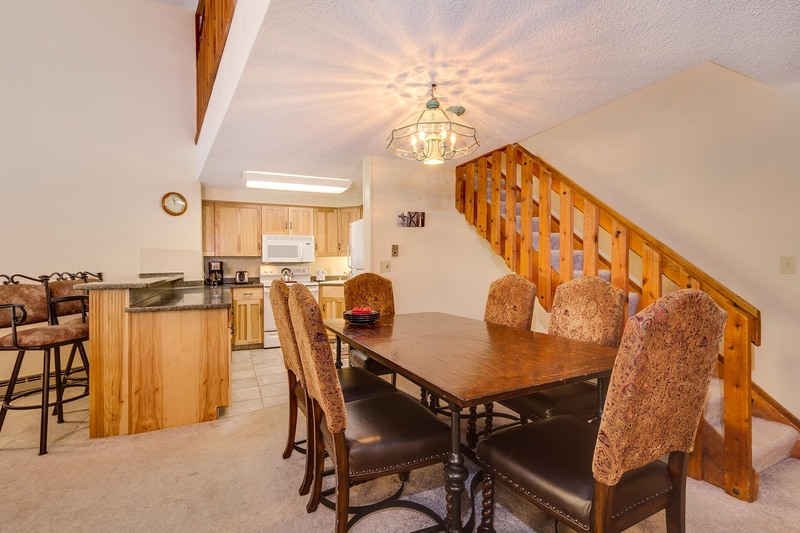 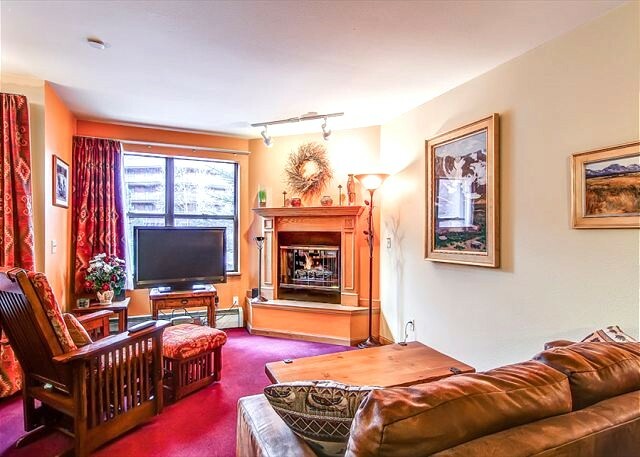 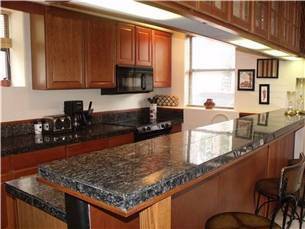 Call us or book this fantastic townhome online today! 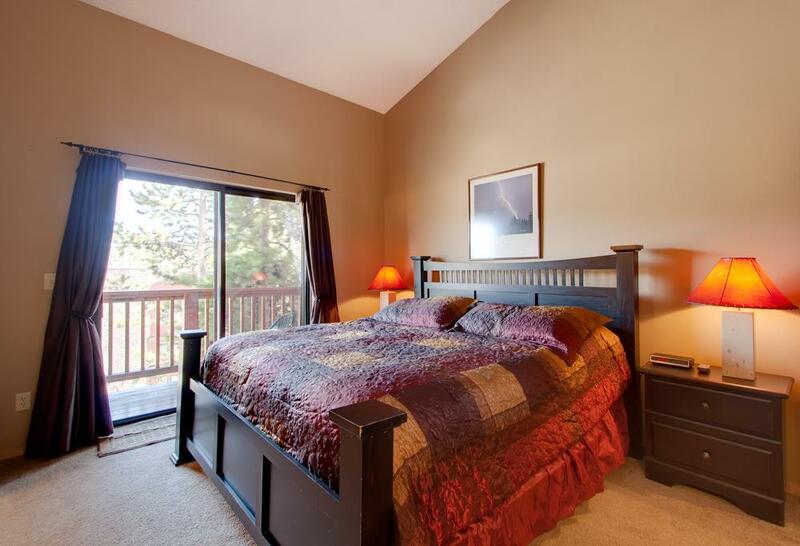 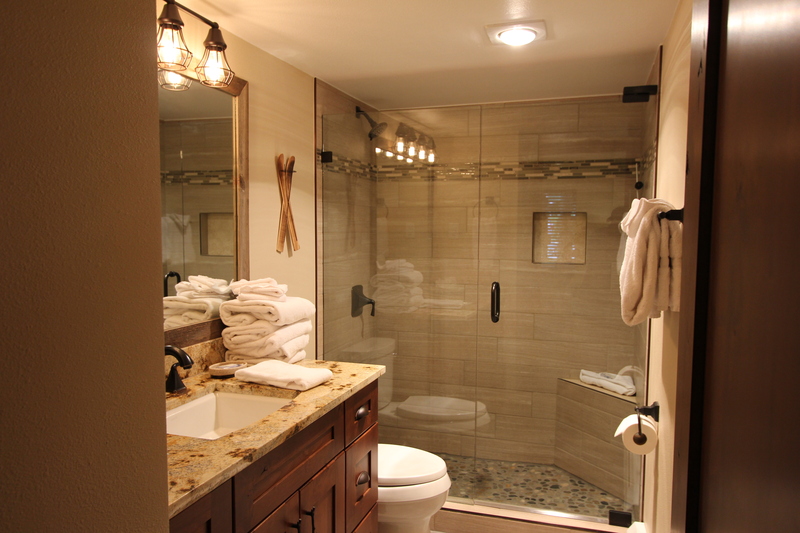 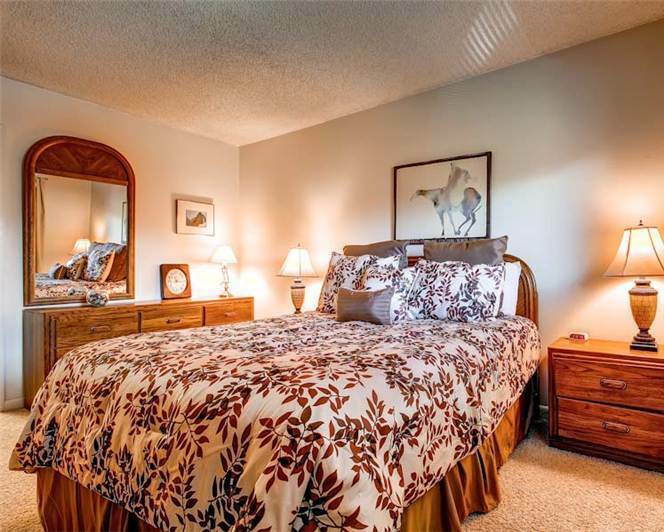 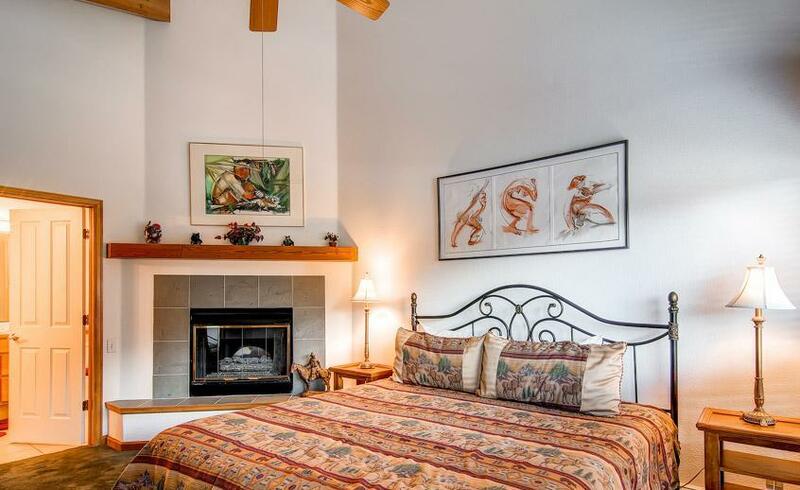 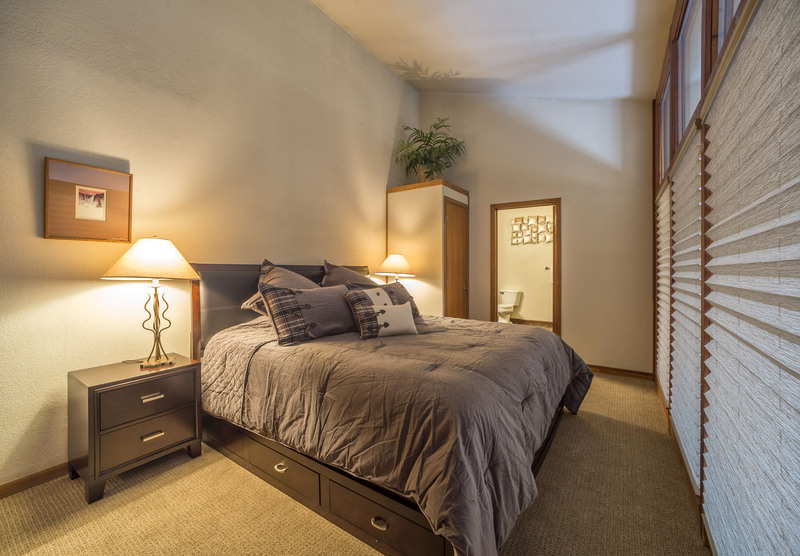 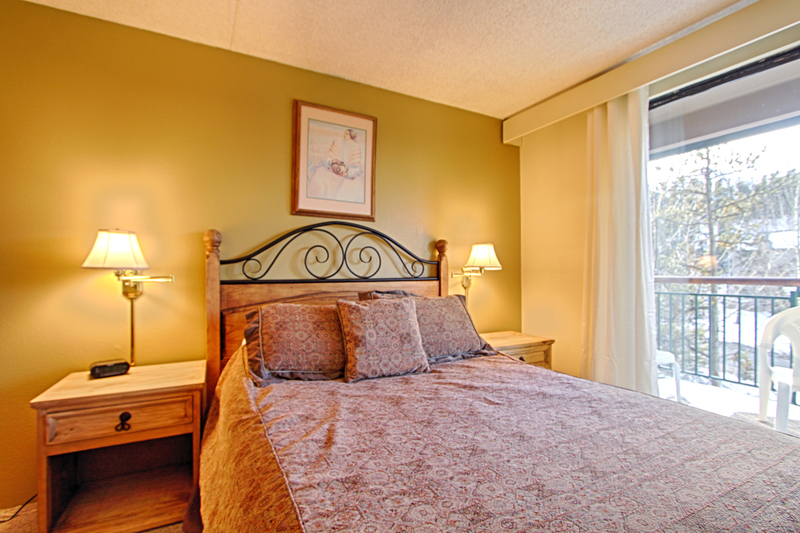 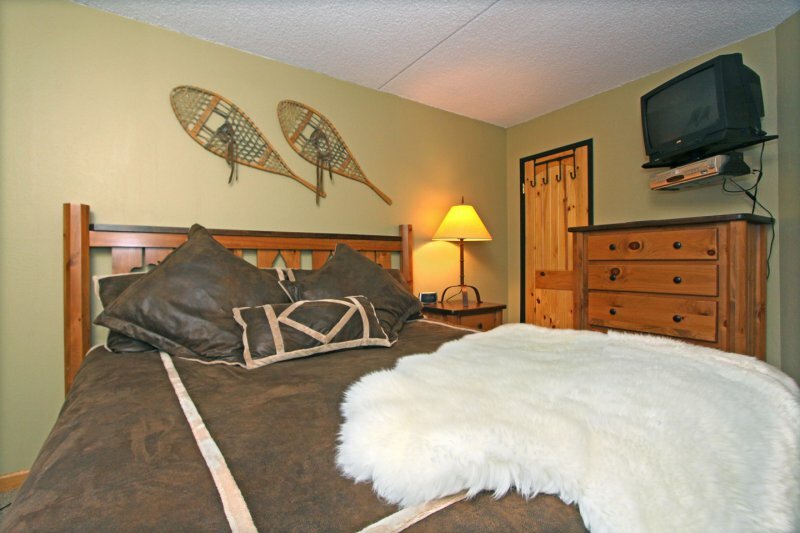 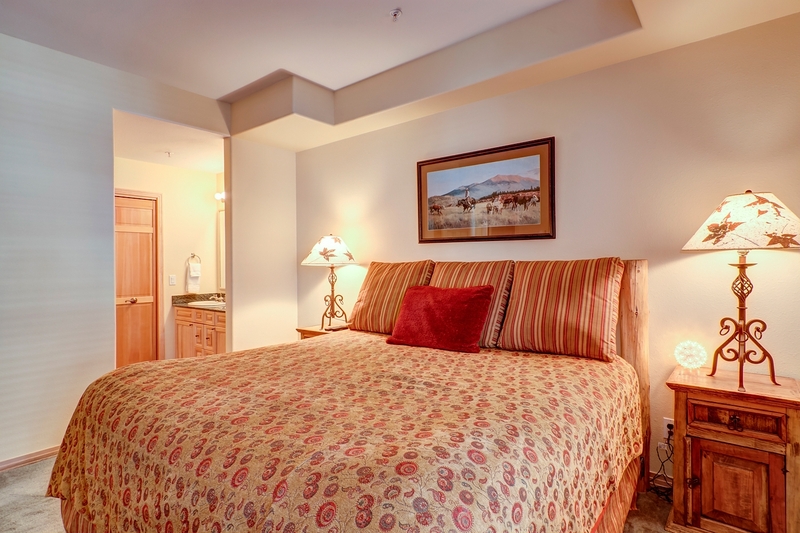 Master suite: king bed, private bathroom with jetted tub and separate walk-in shower, LCD-TV, DVD player. 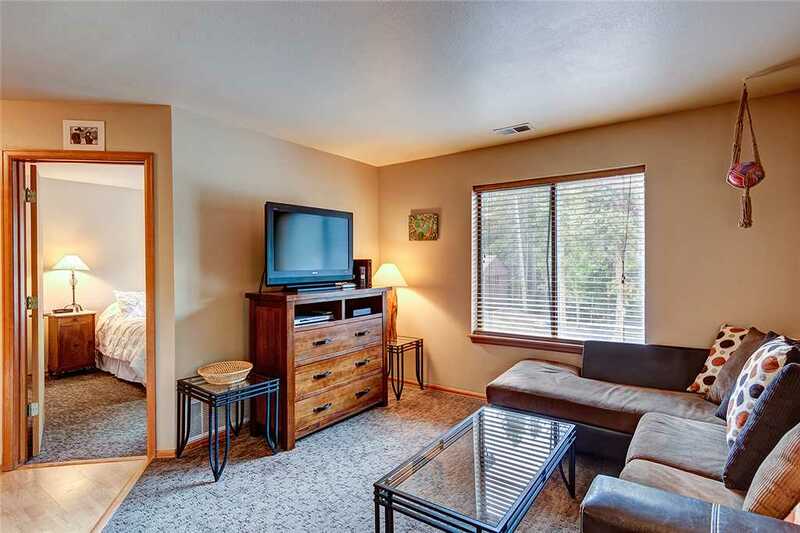 Bedroom 2: queen bed, LCD-TV, Blu-ray player. 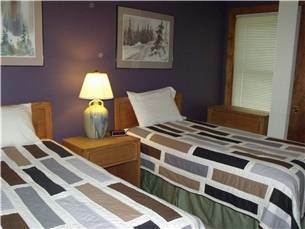 Bedroom 3: two twin beds, LCD-TV, Blu-ray player, Nintendo.